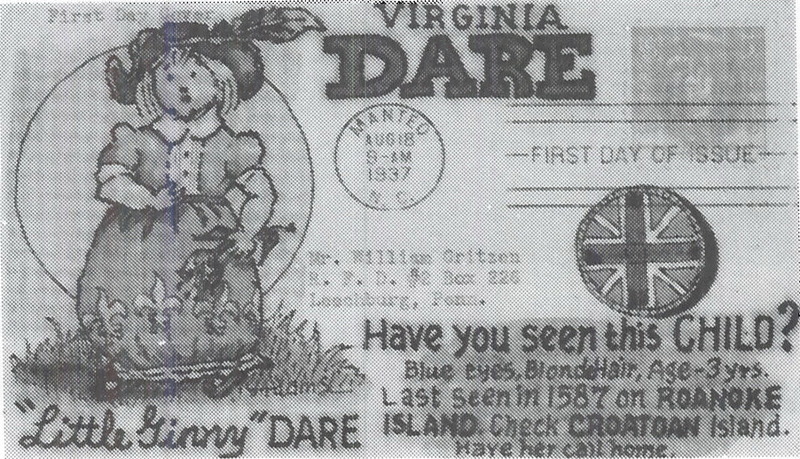 dark-blue red, DC 2nd Day; Rice? 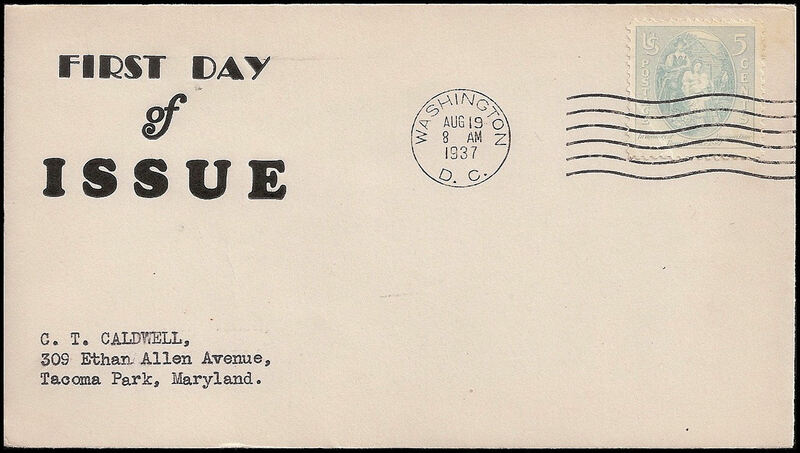 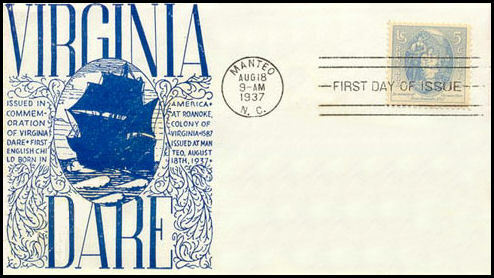 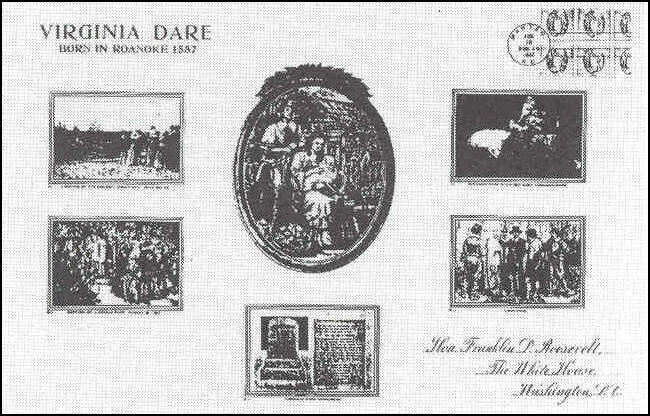 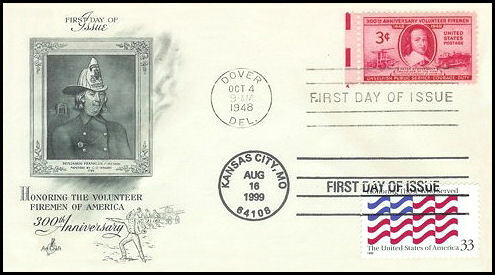 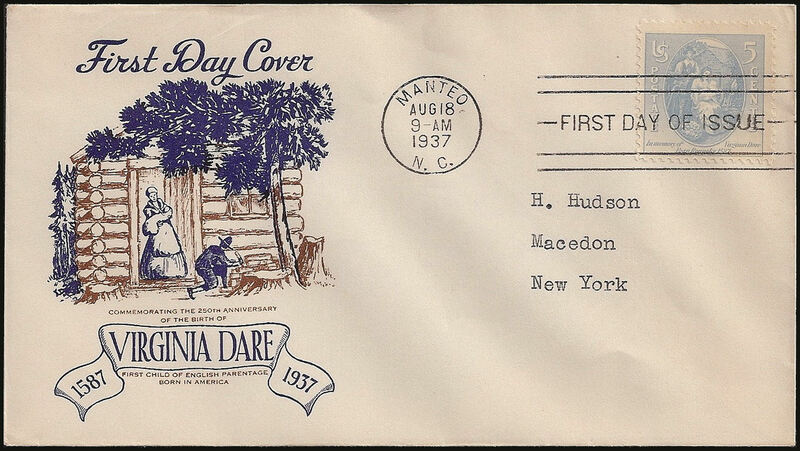 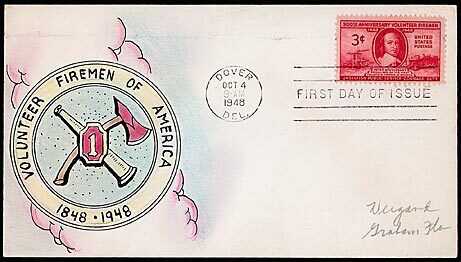 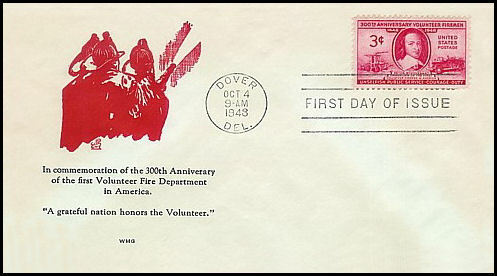 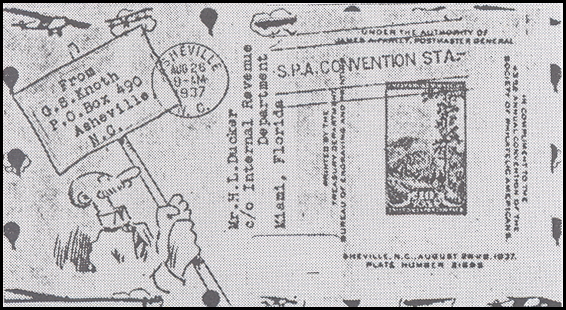 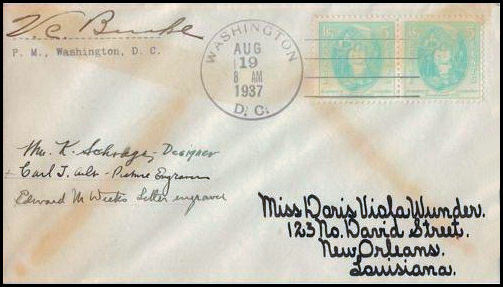 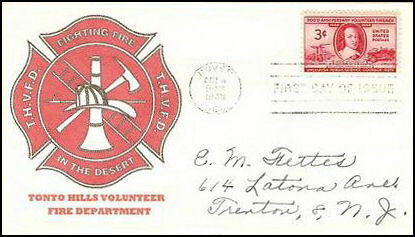 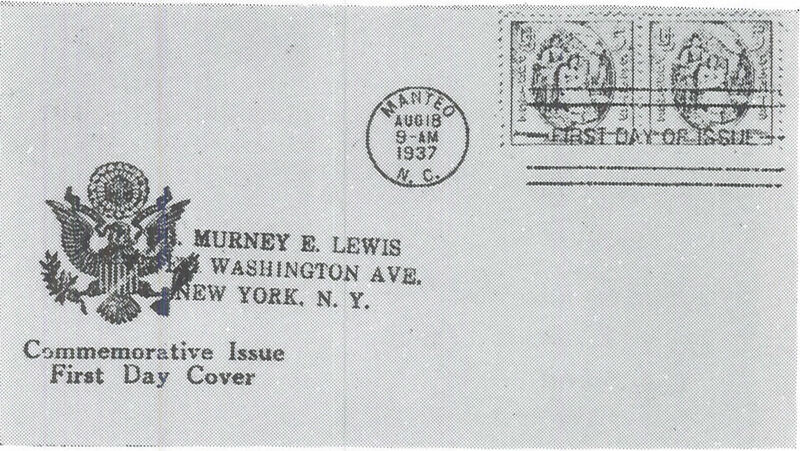 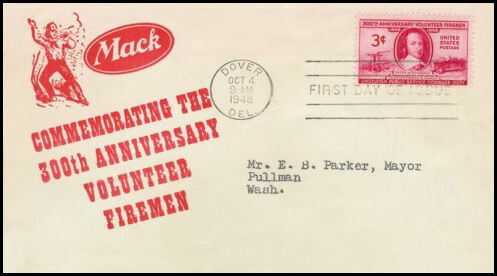 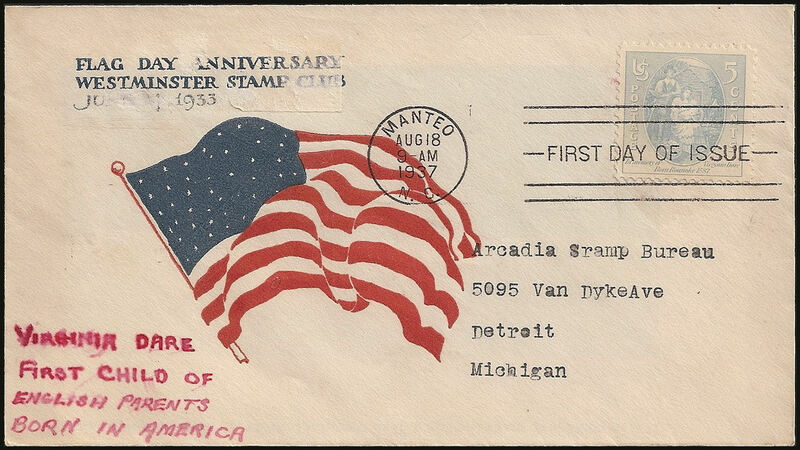 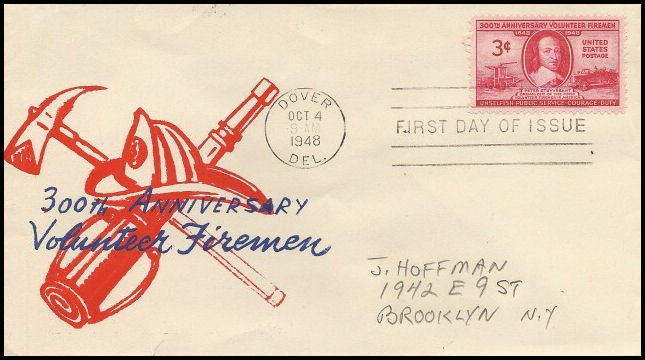 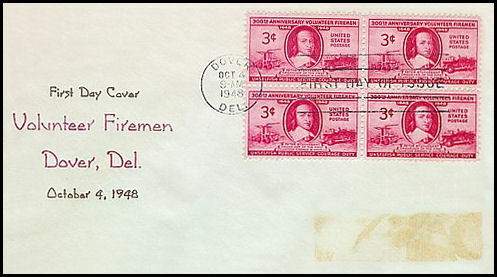 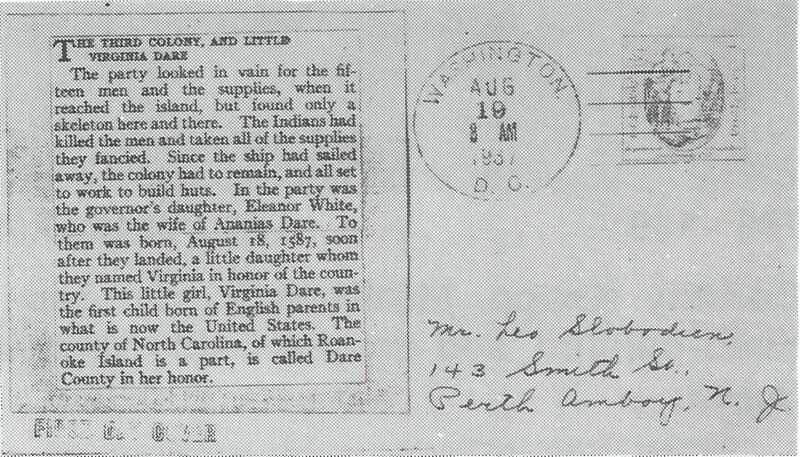 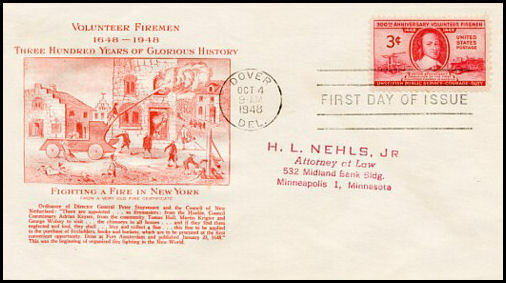 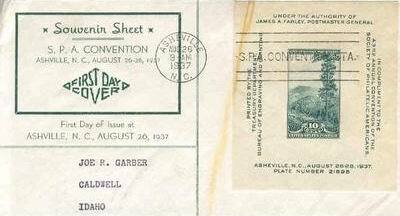 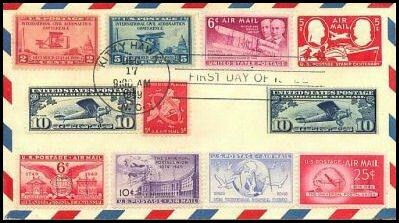 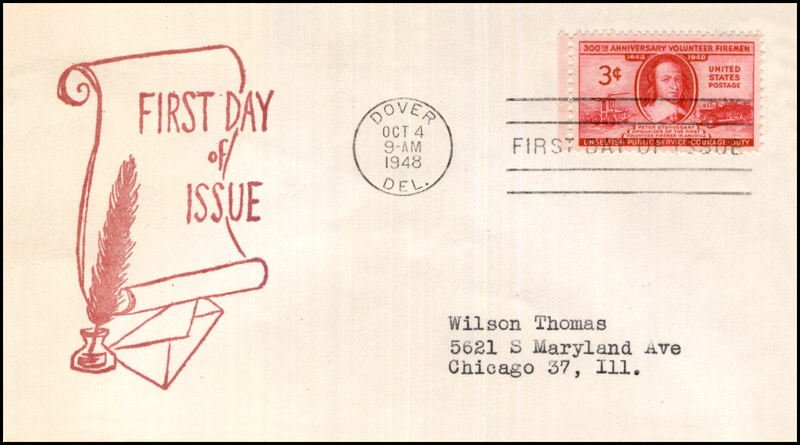 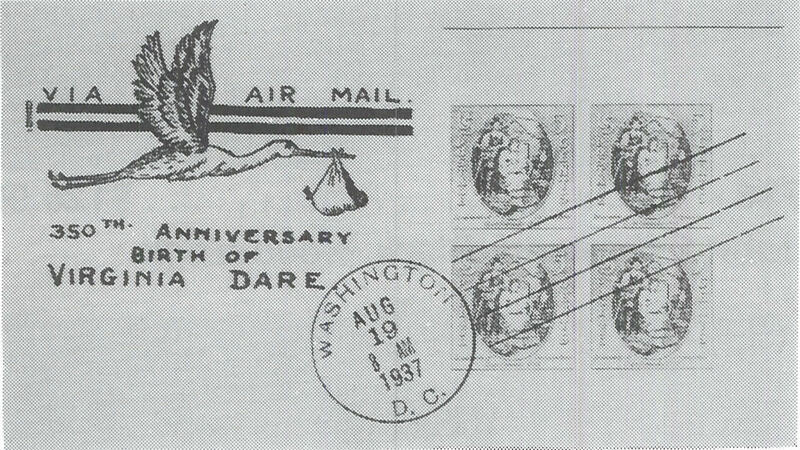 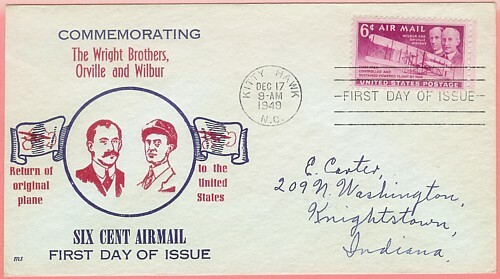 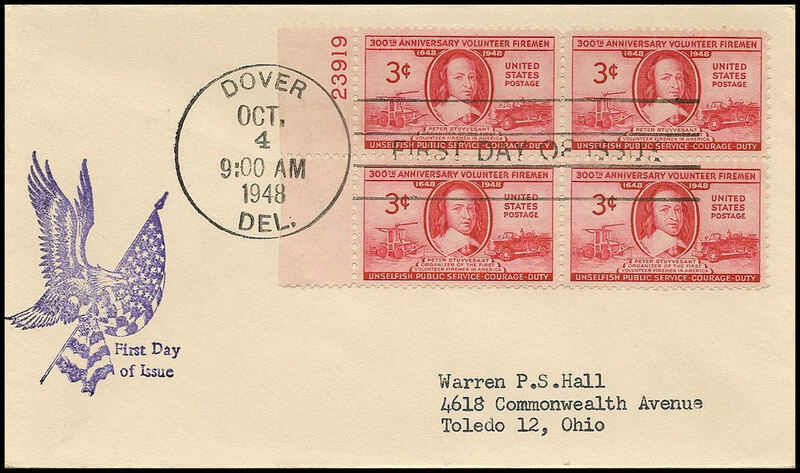 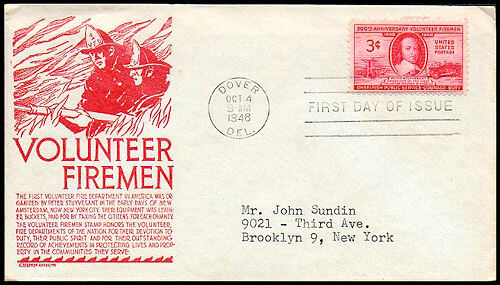 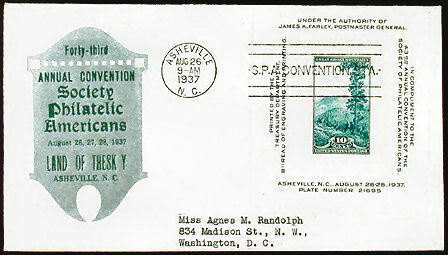 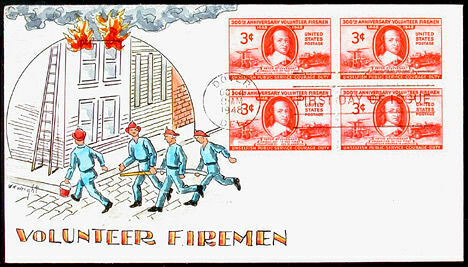 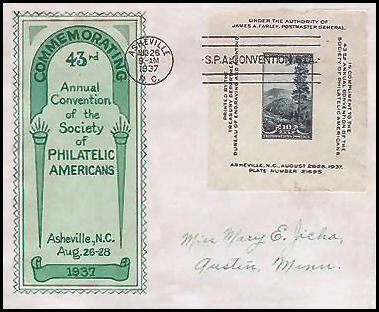 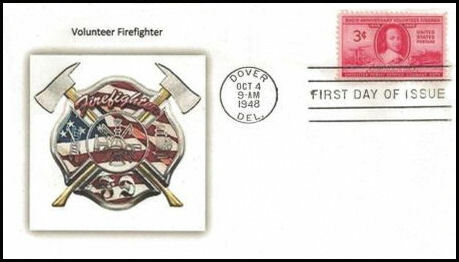 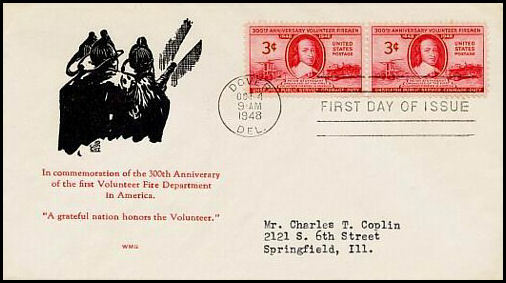 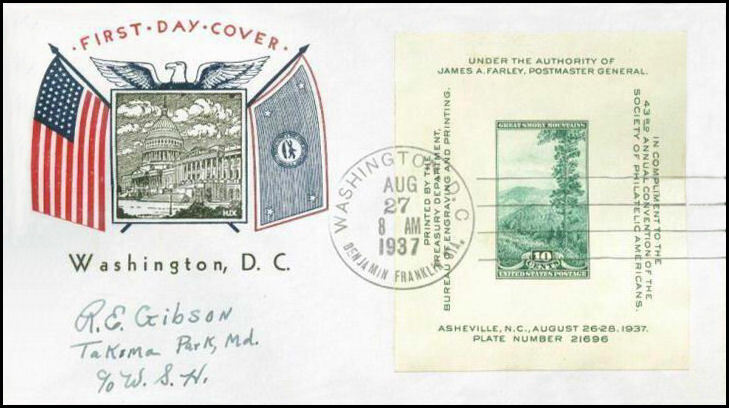 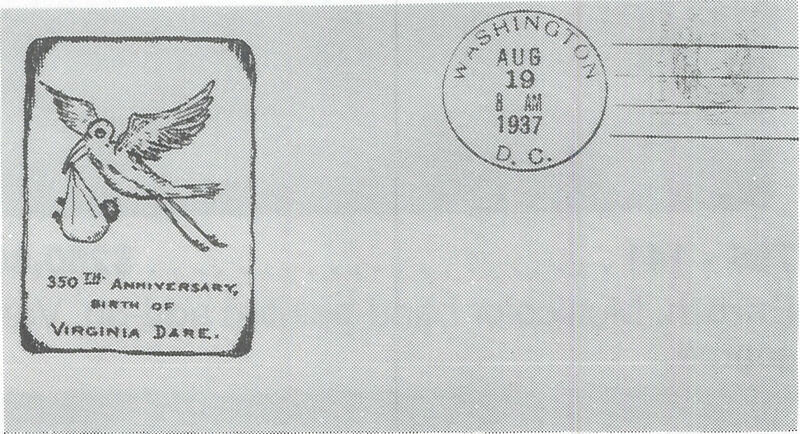 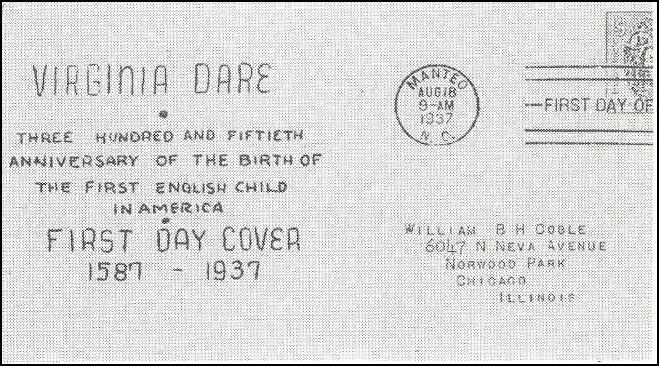 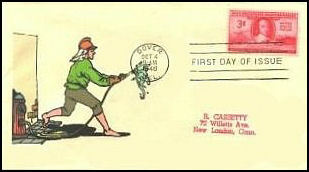 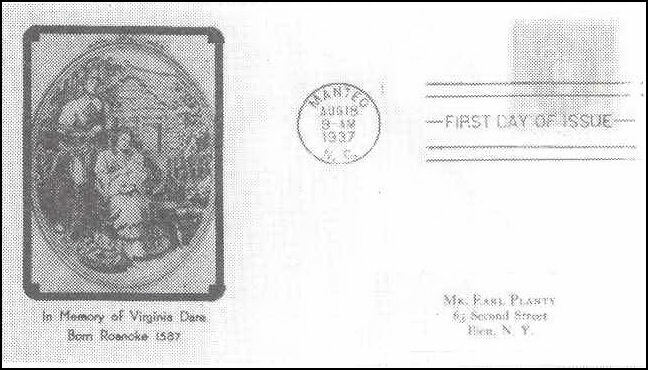 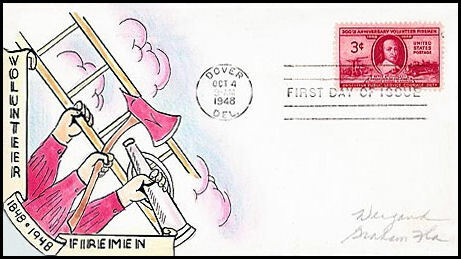 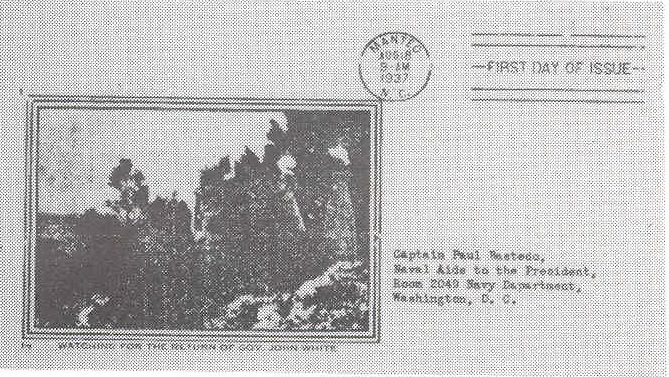 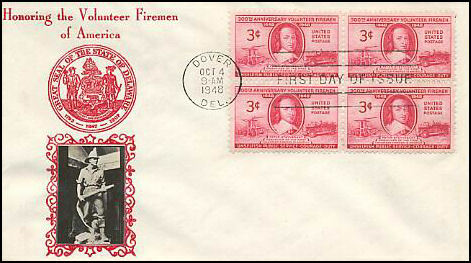 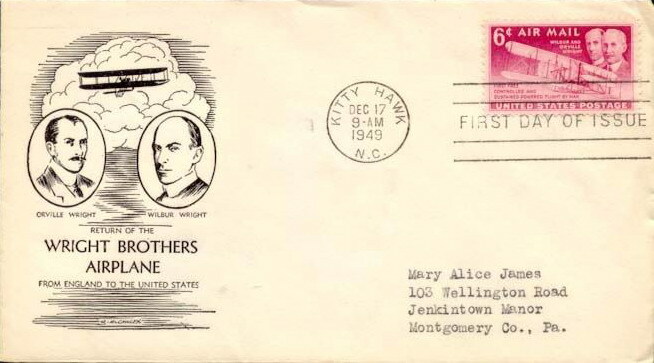 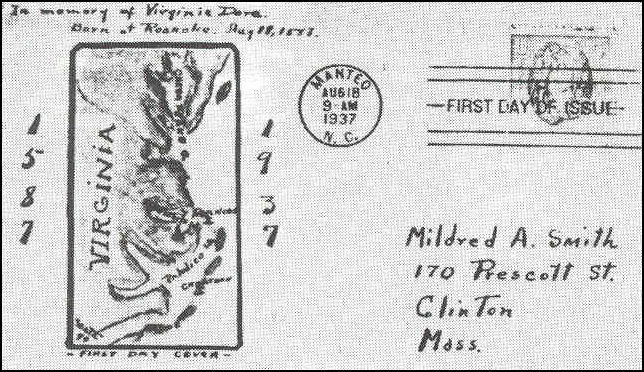 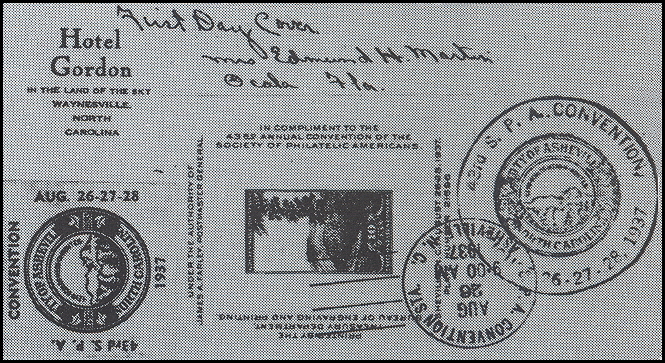 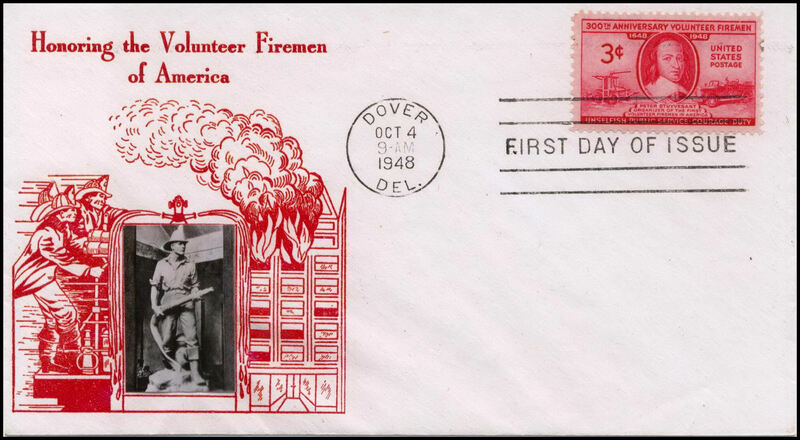 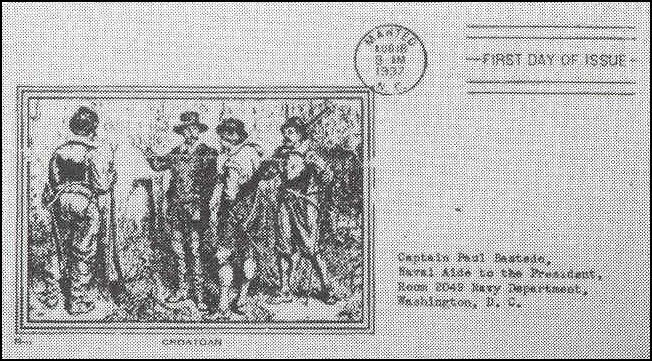 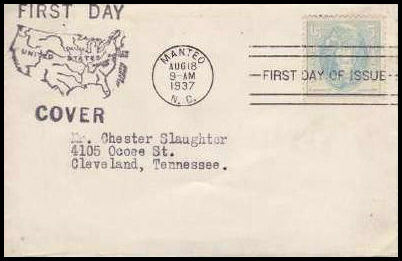 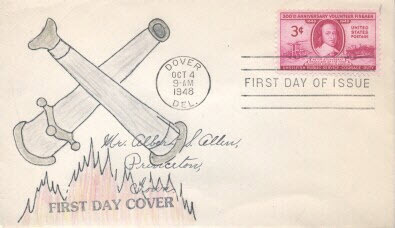 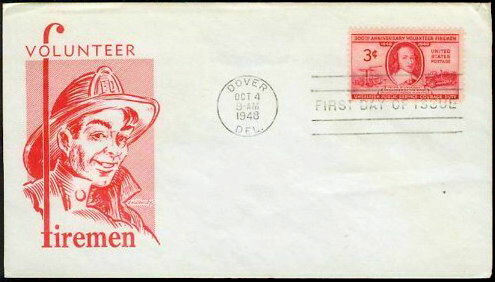 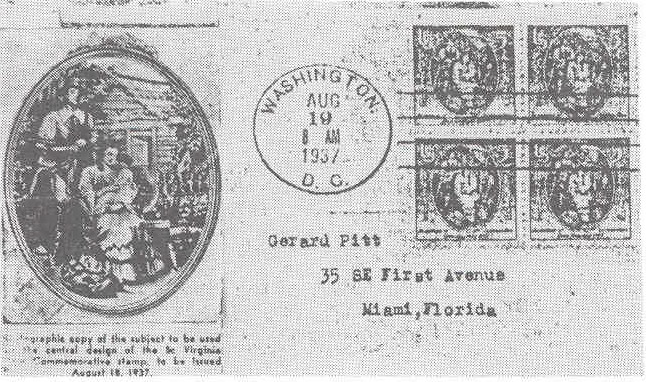 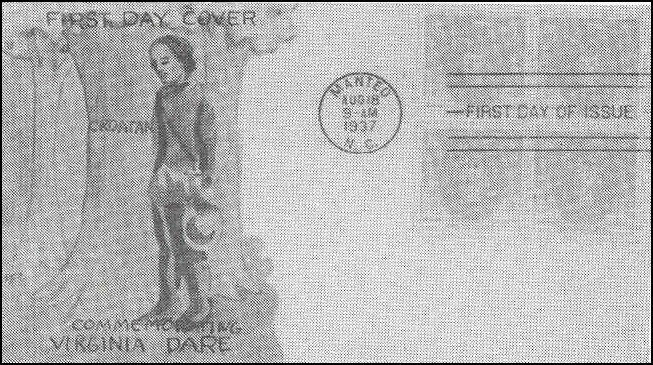 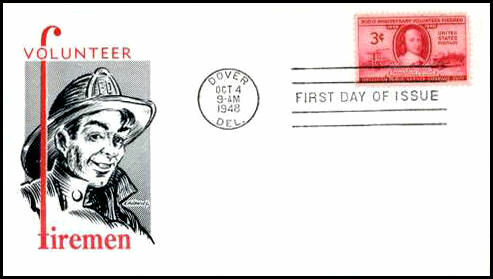 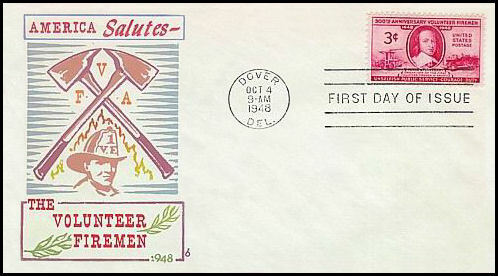 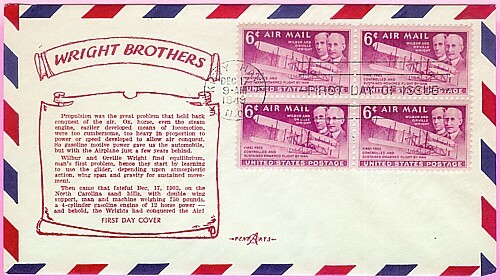 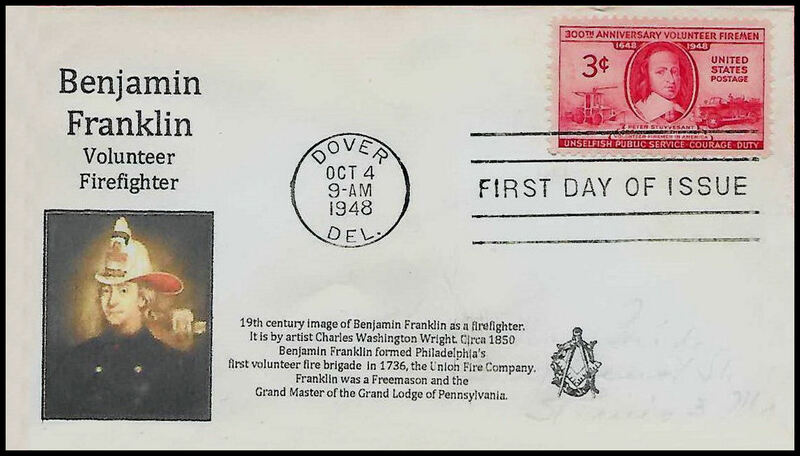 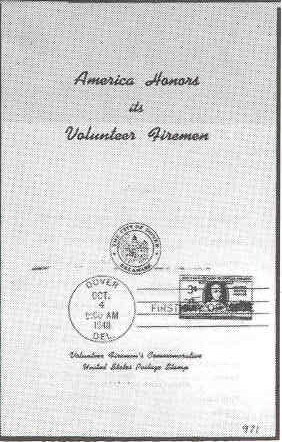 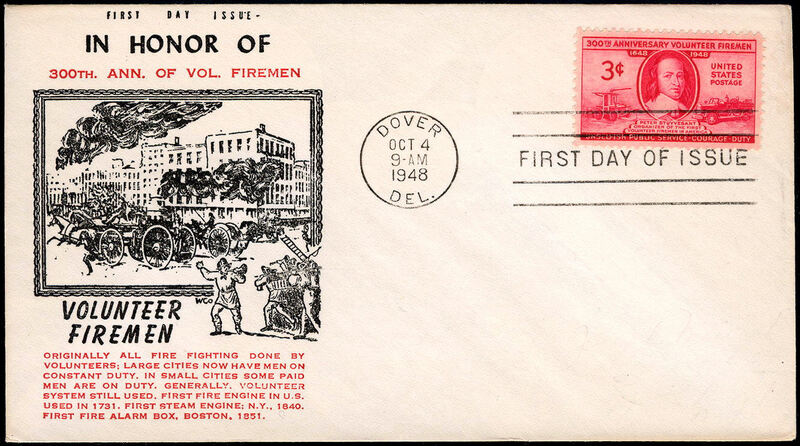 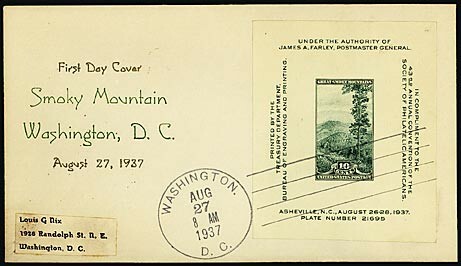 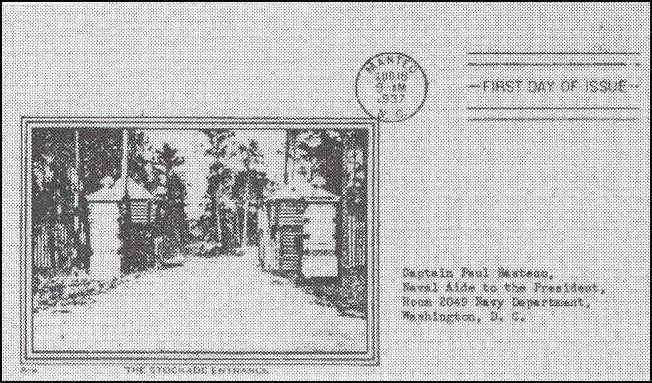 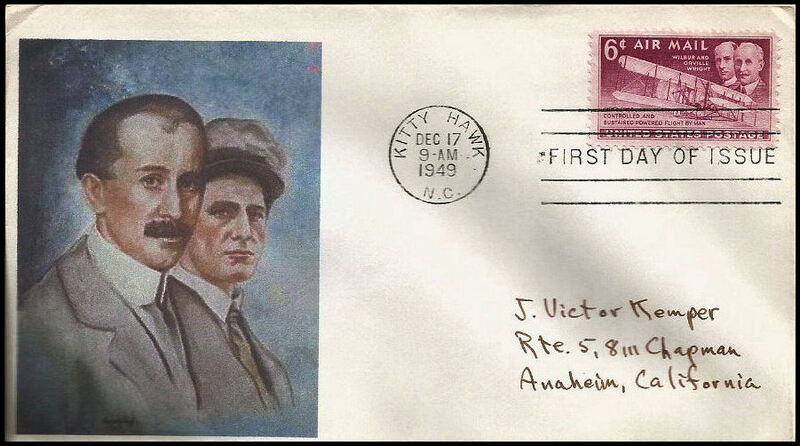 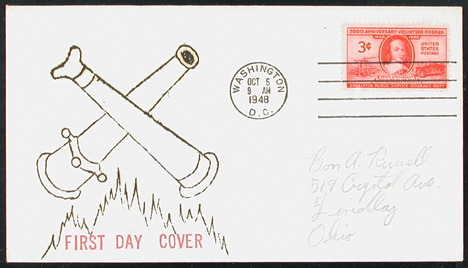 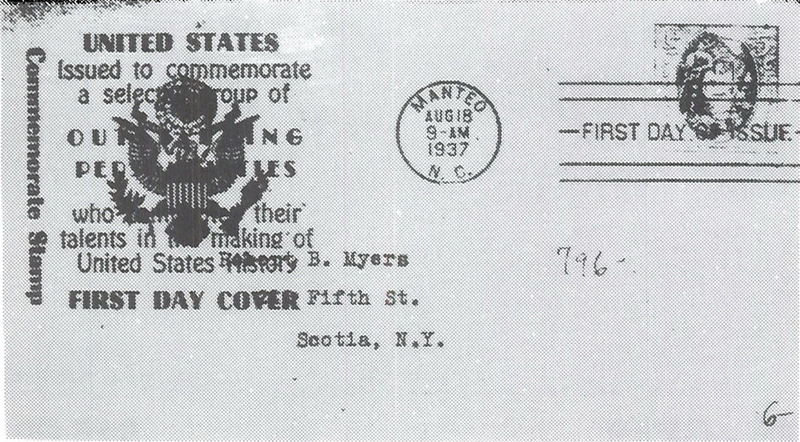 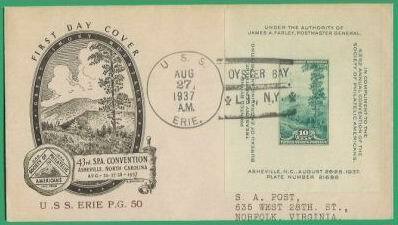 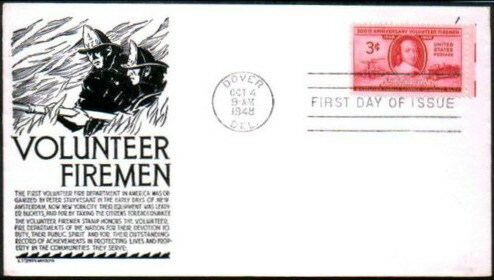 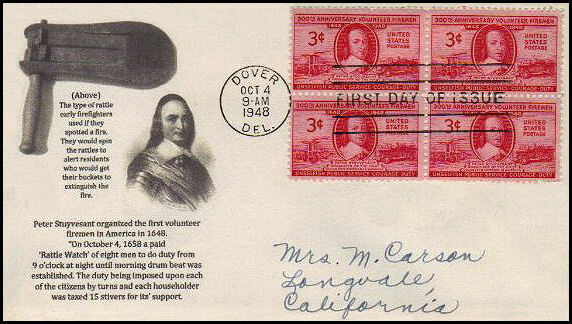 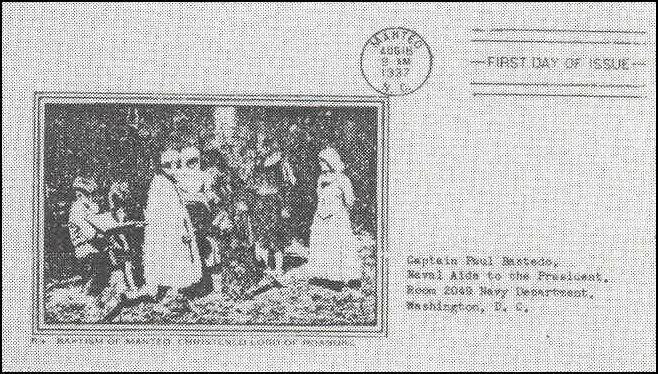 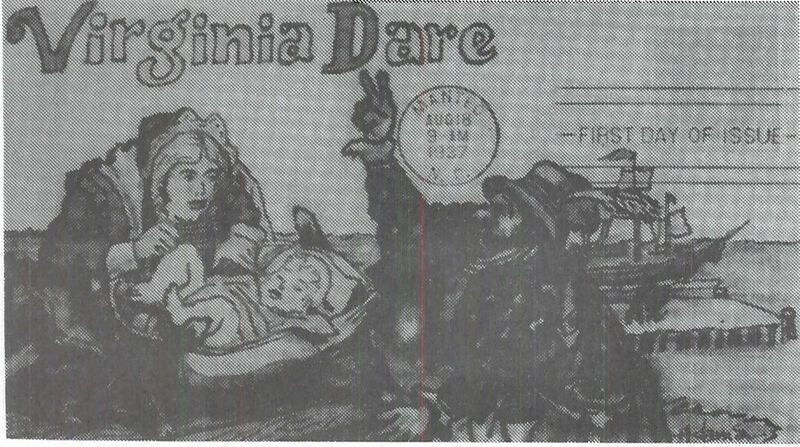 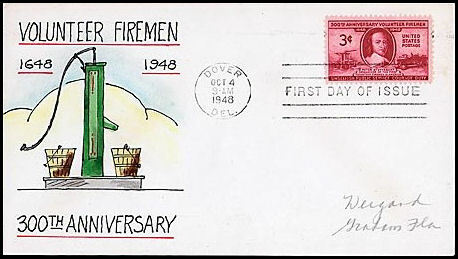 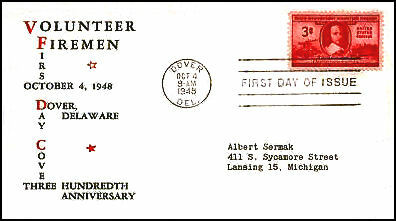 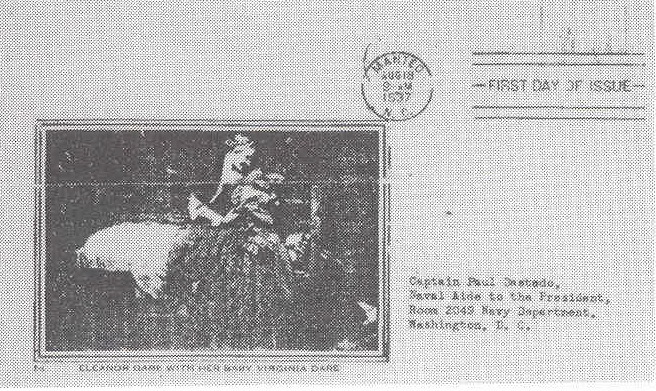 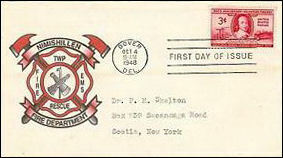 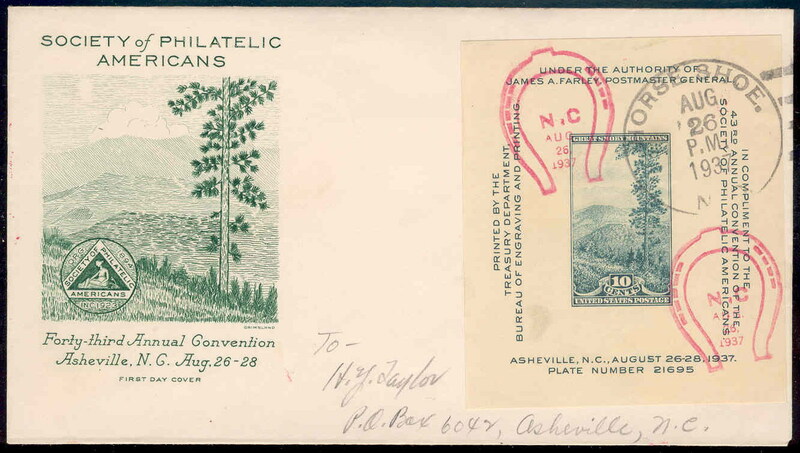 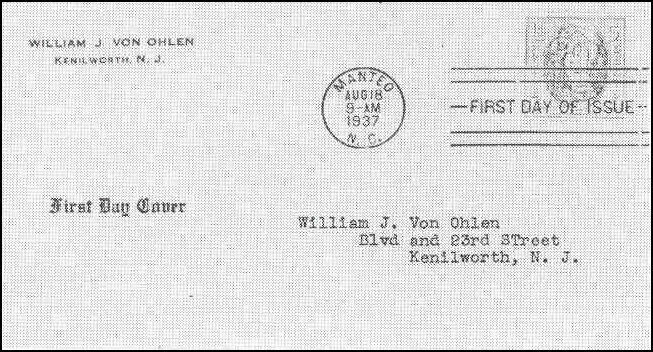 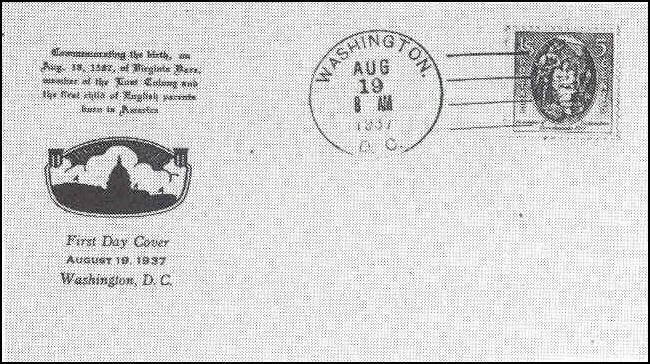 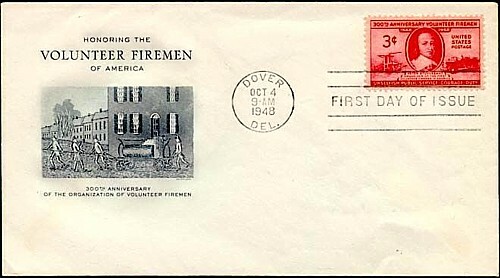 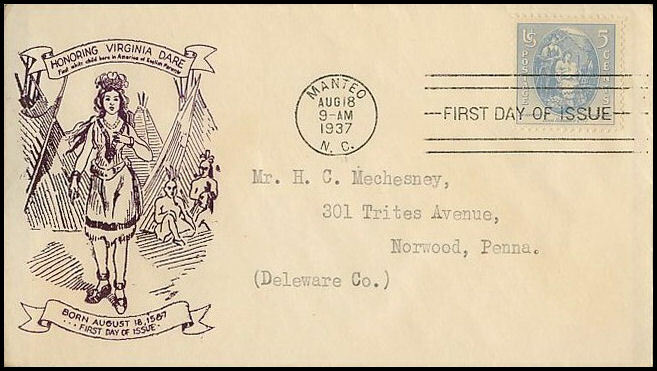 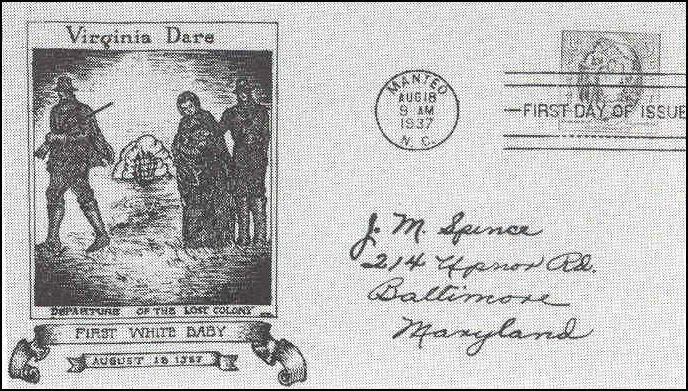 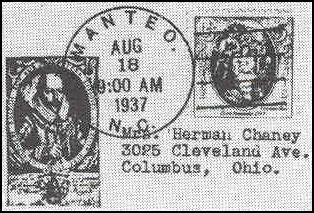 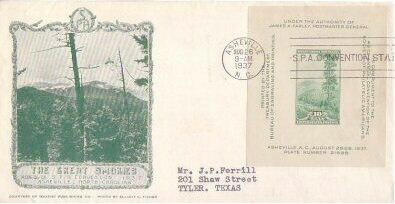 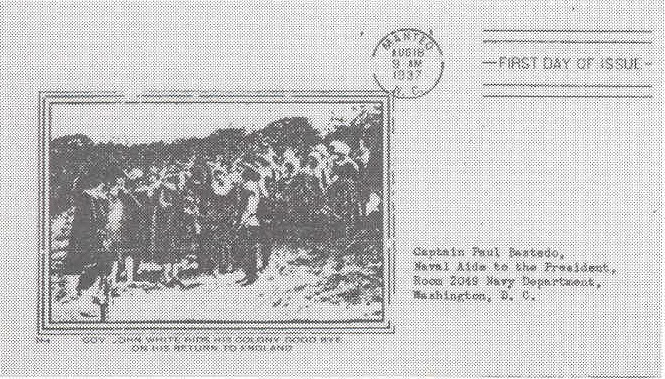 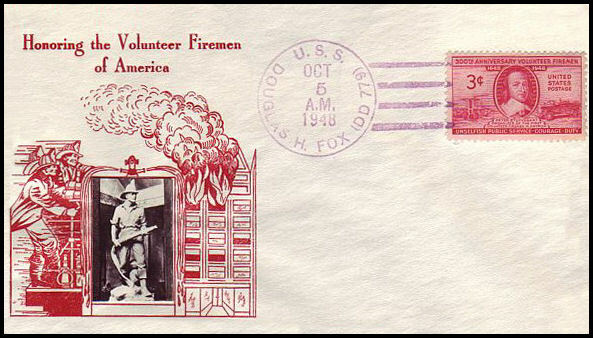 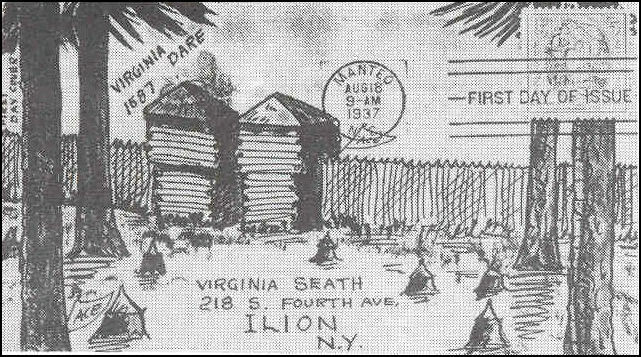 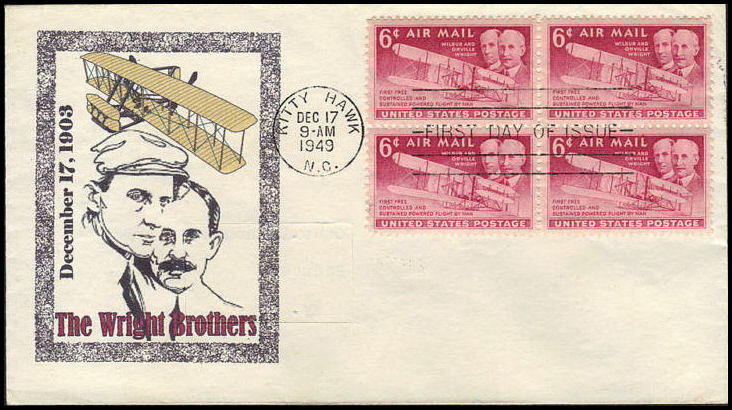 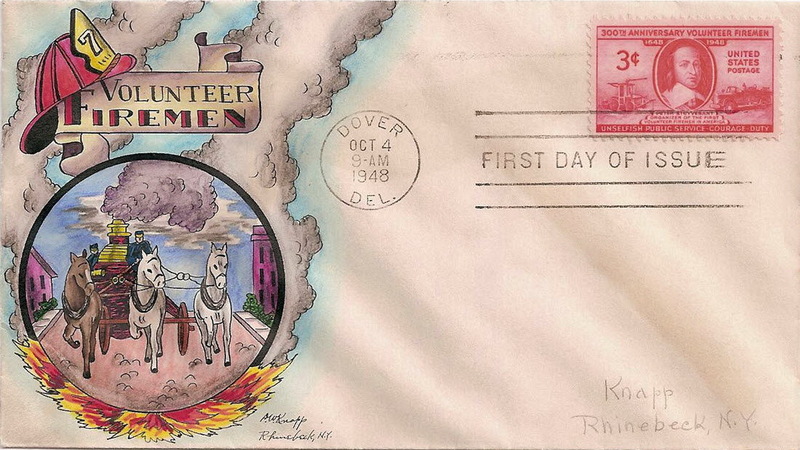 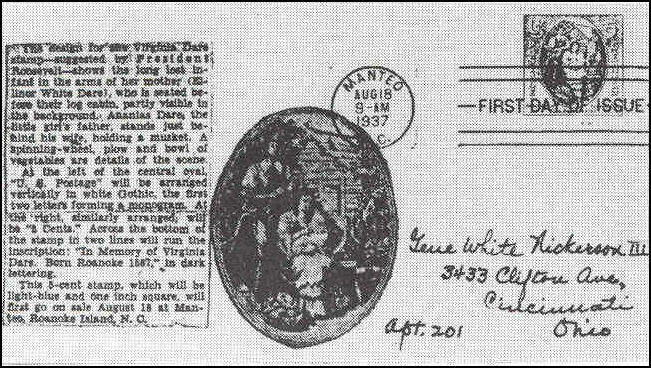 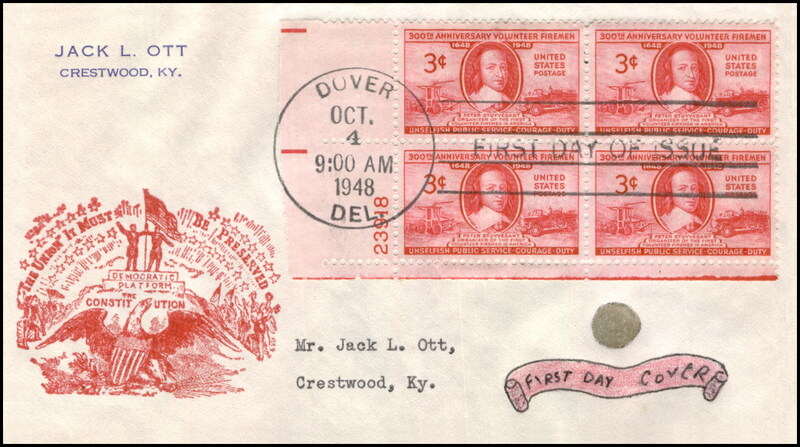 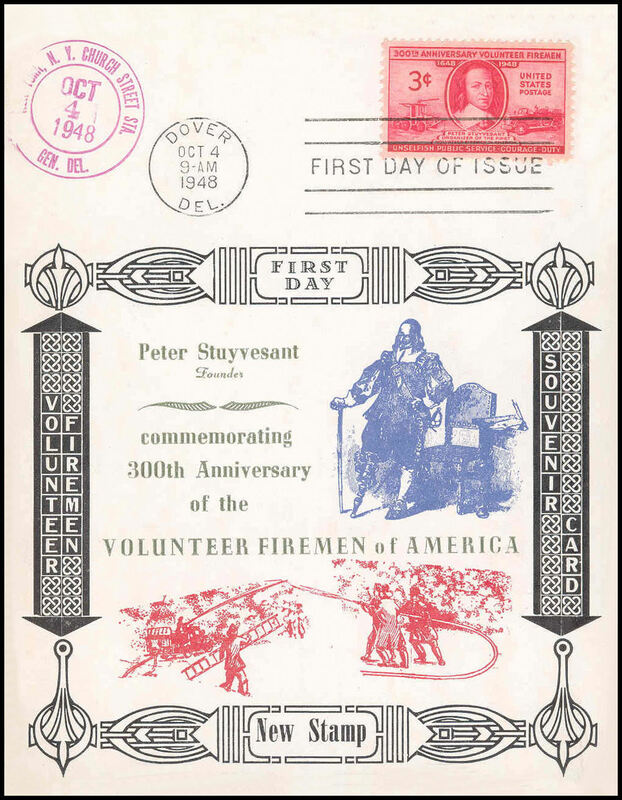 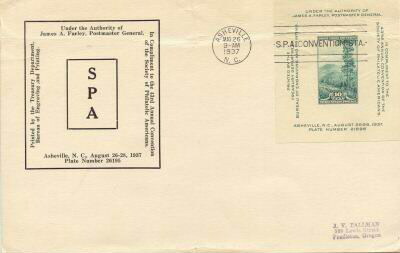 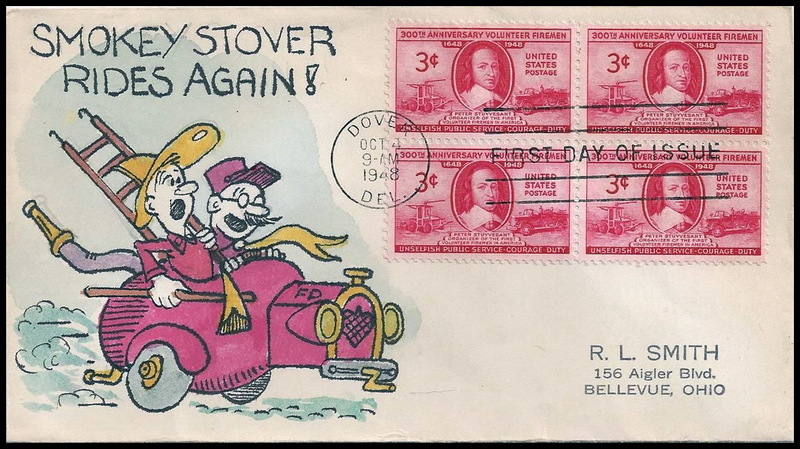 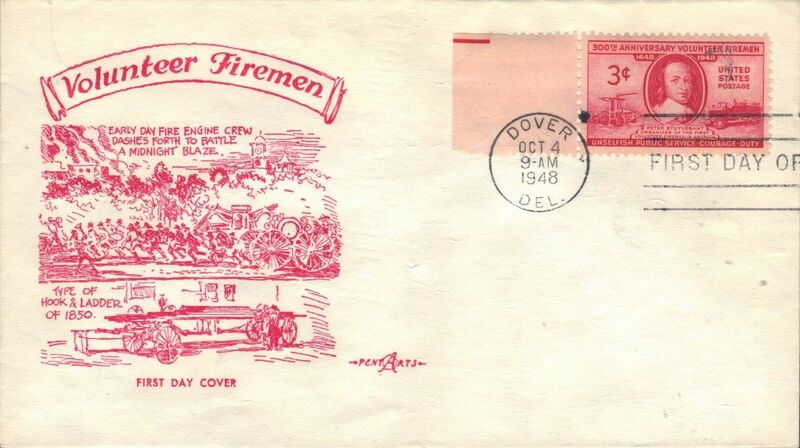 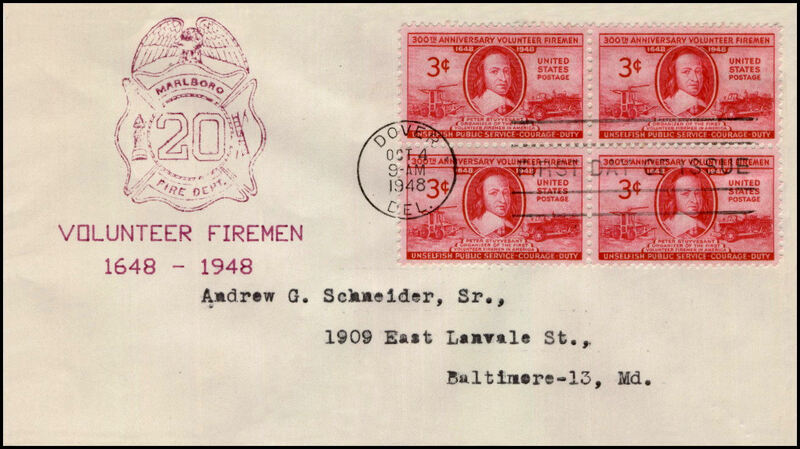 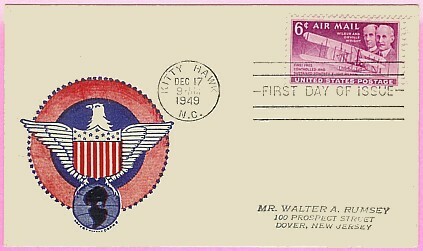 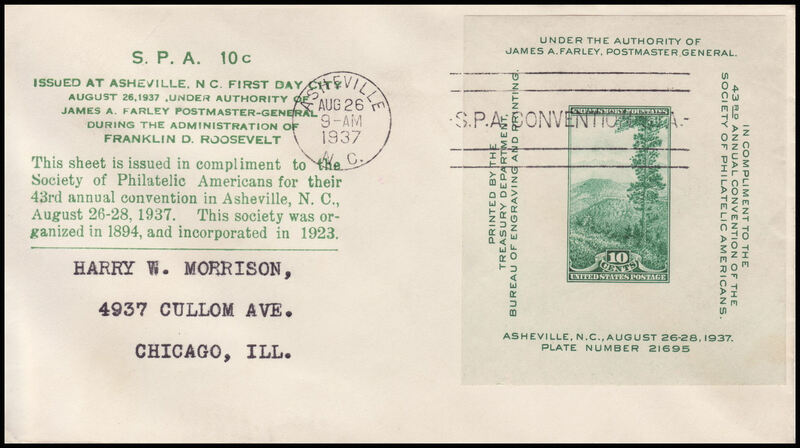 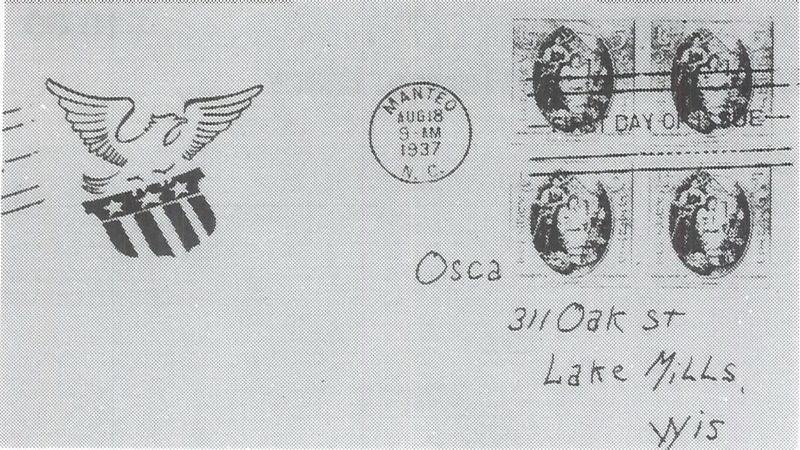 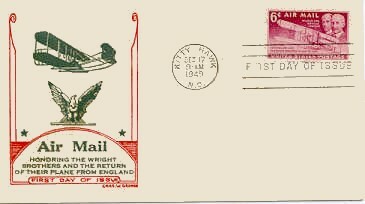 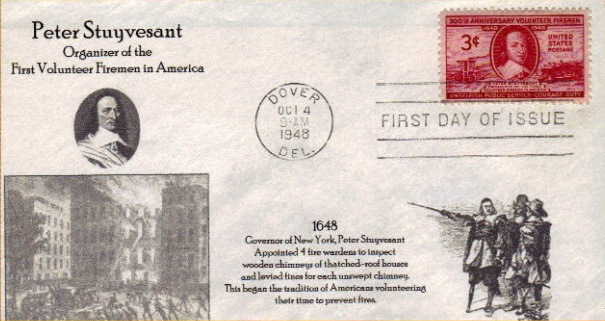 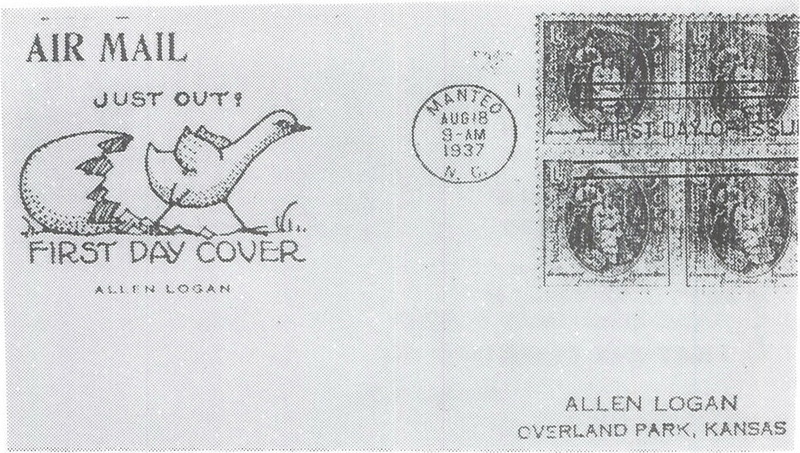 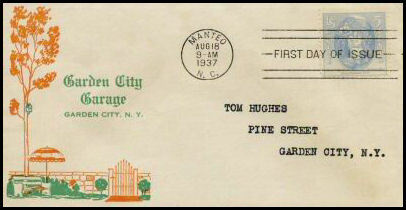 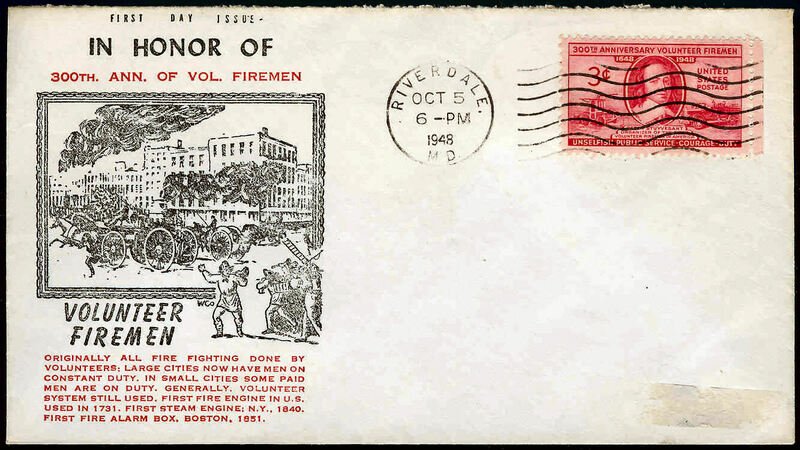 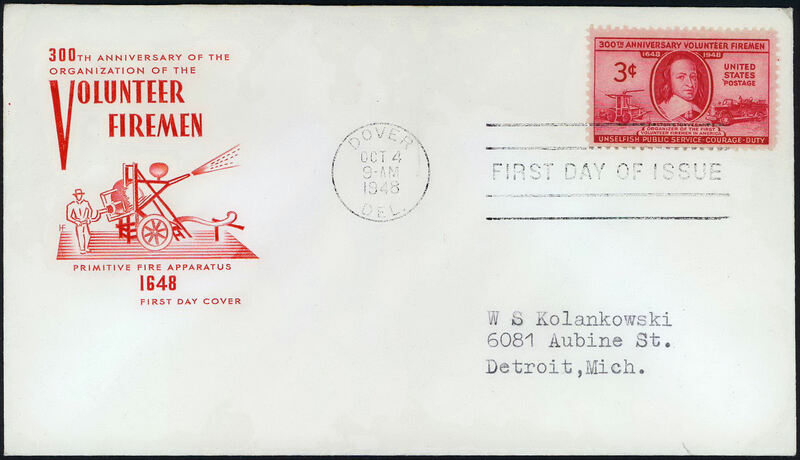 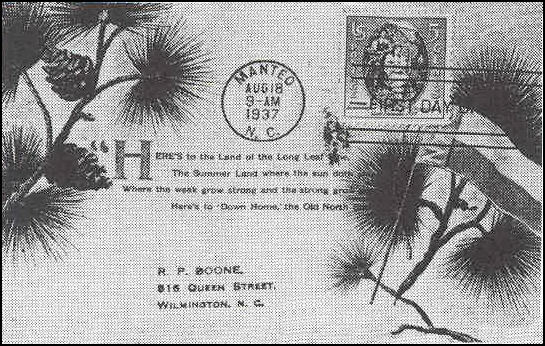 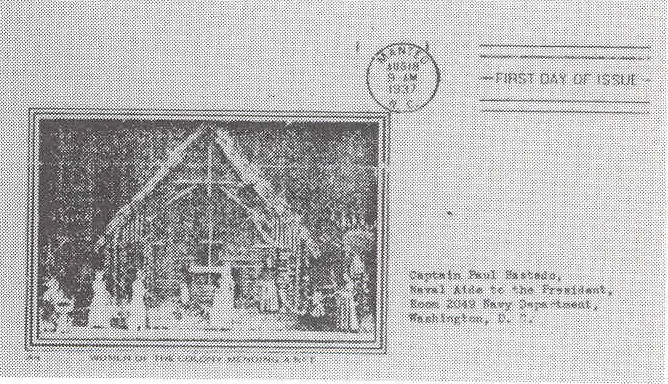 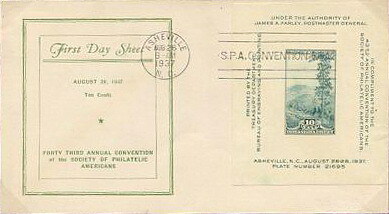 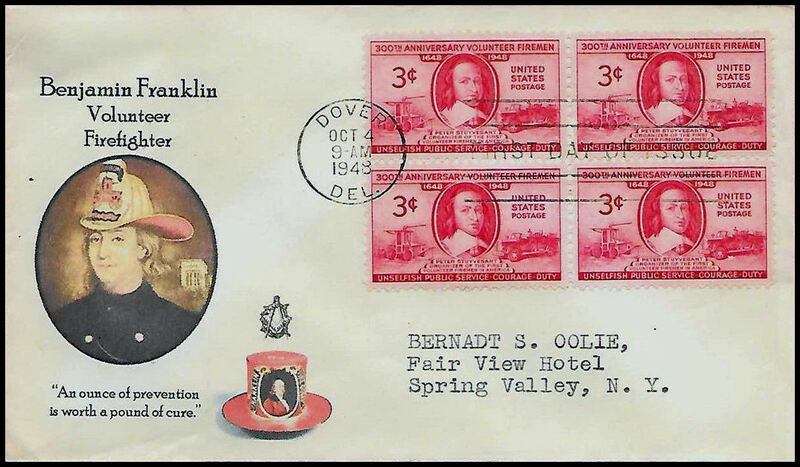 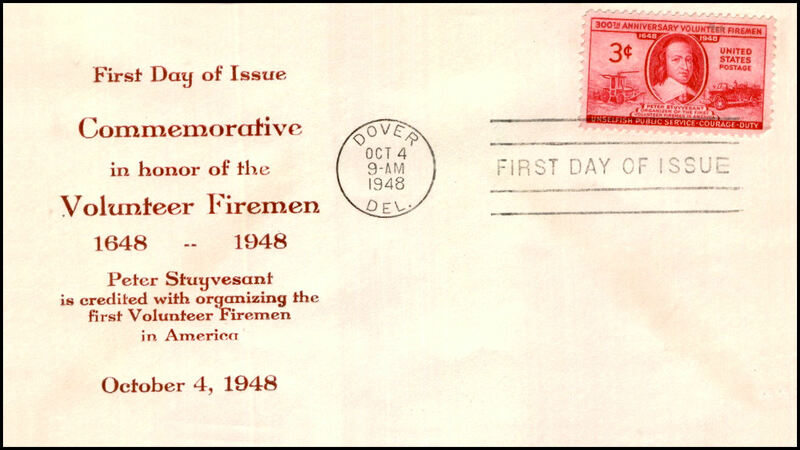 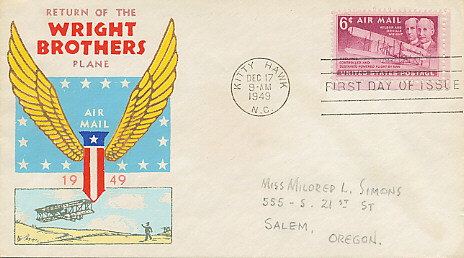 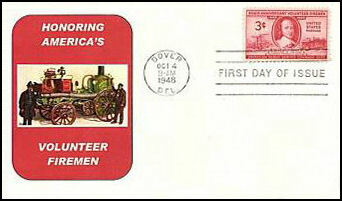 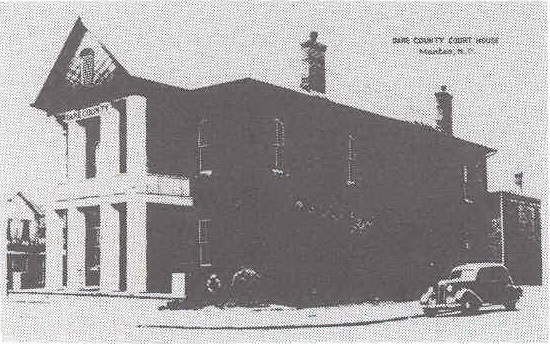 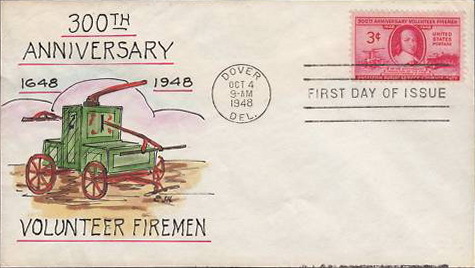 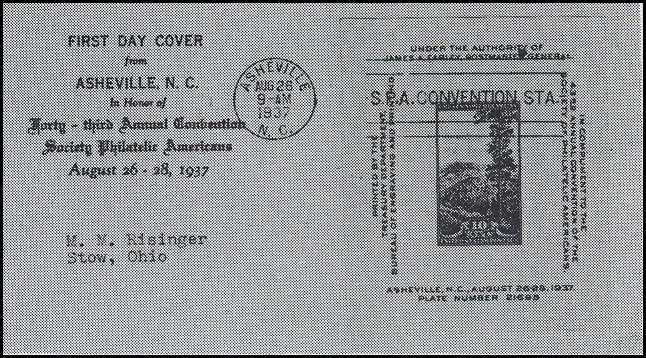 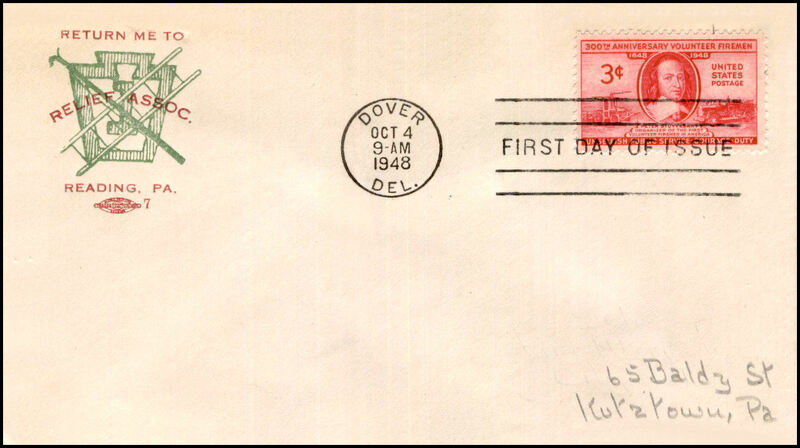 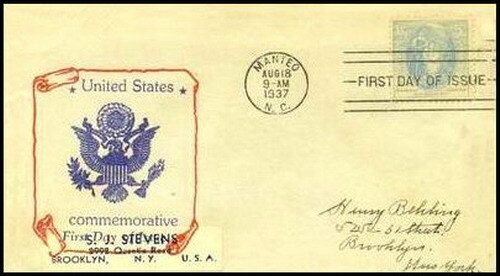 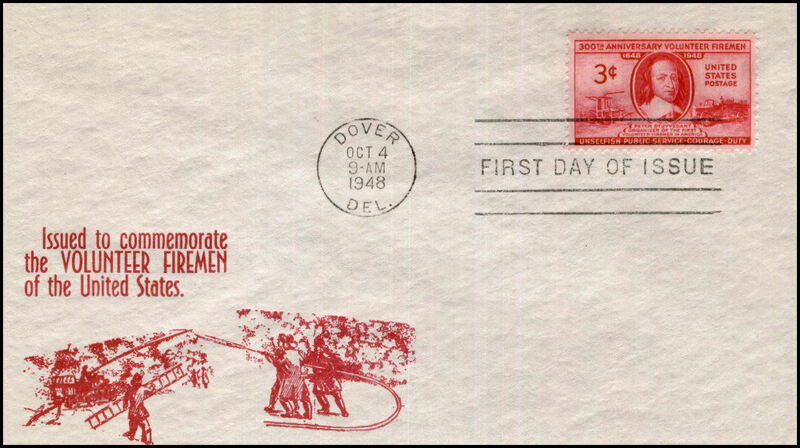 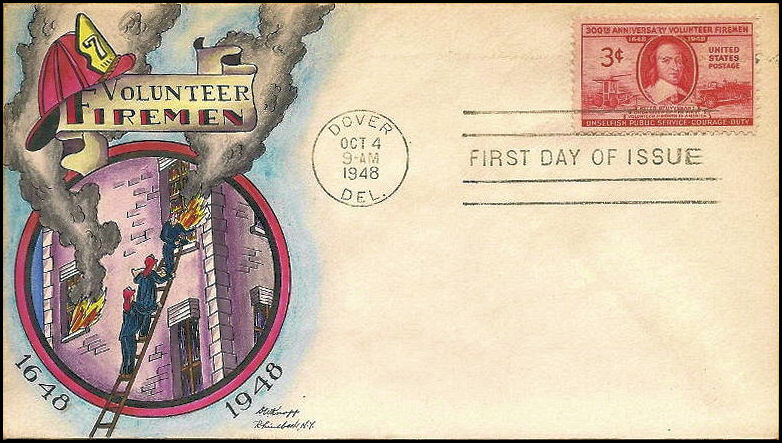 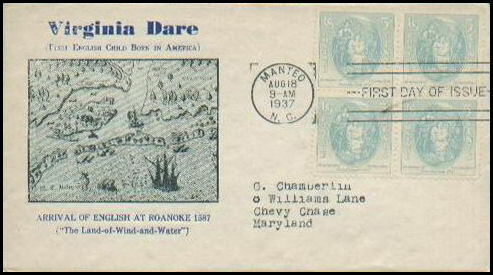 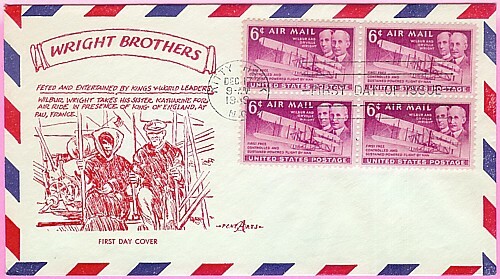 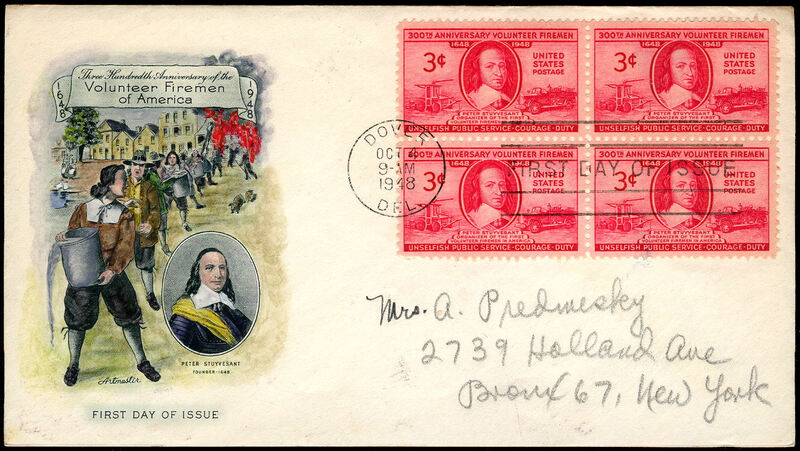 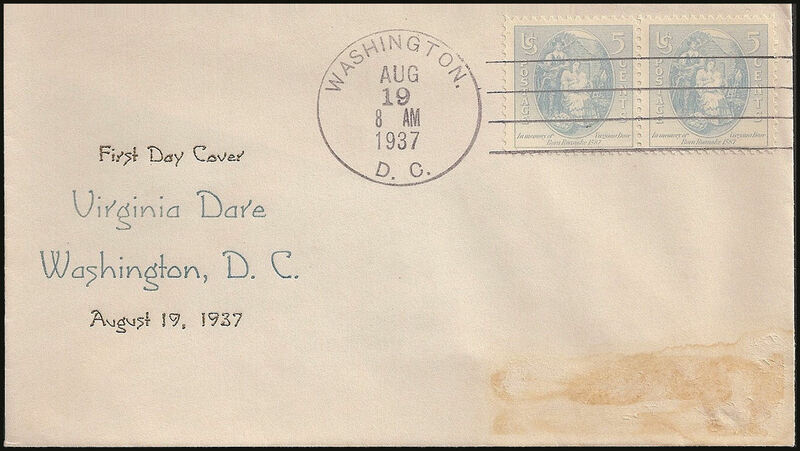 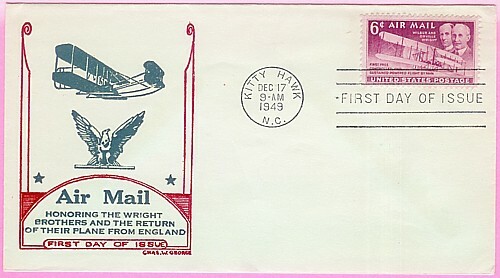 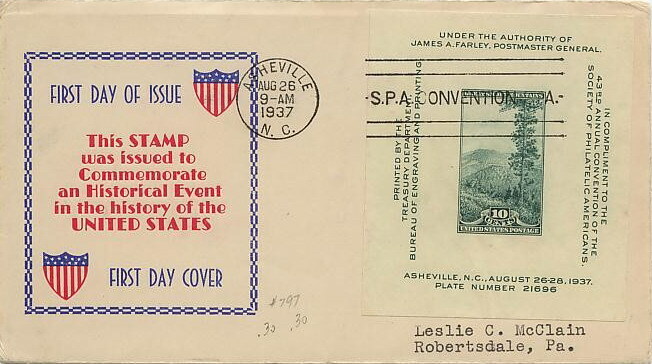 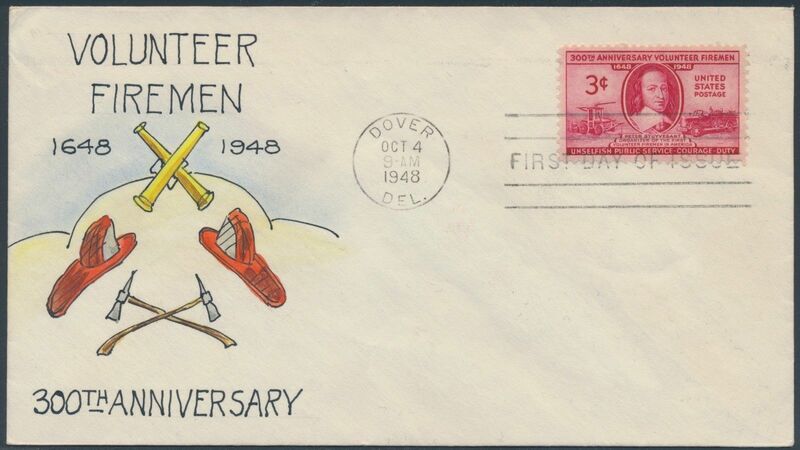 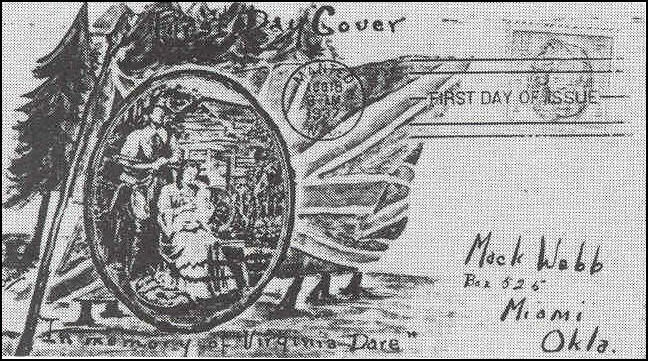 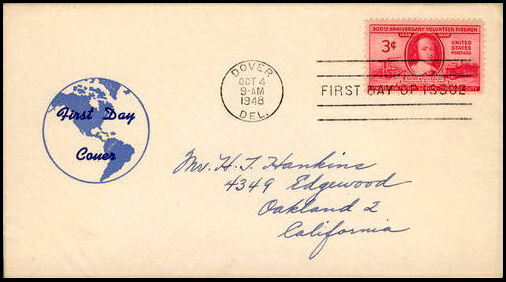 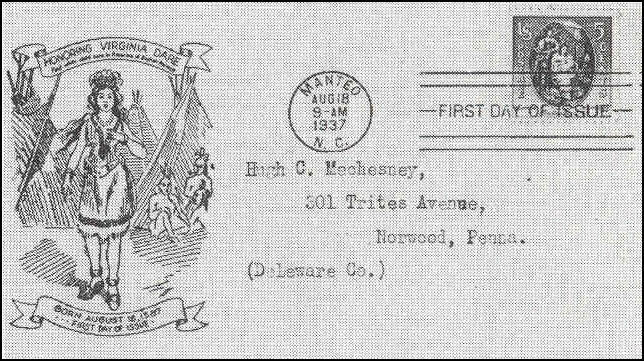 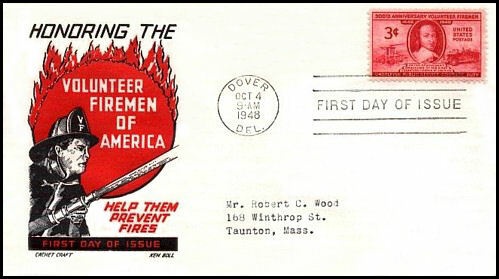 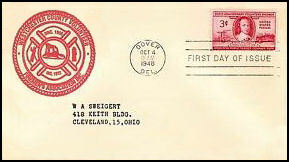 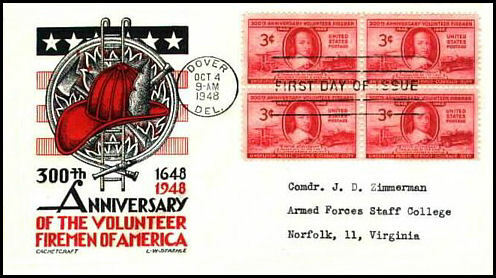 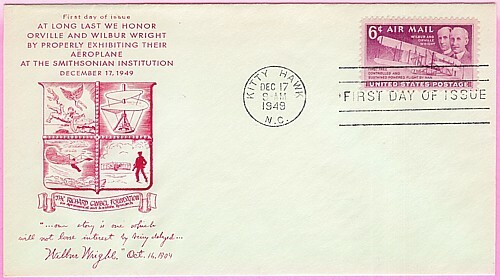 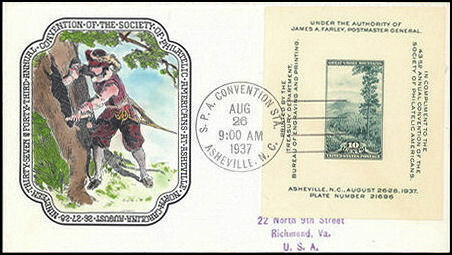 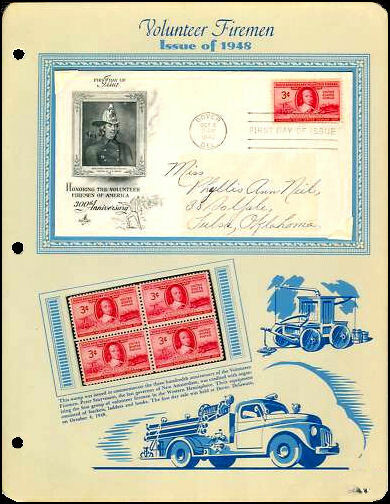 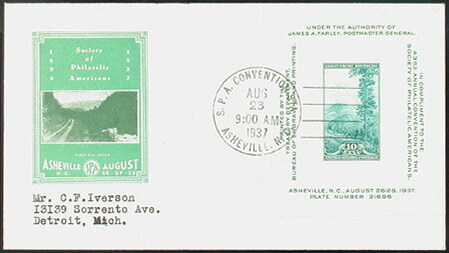 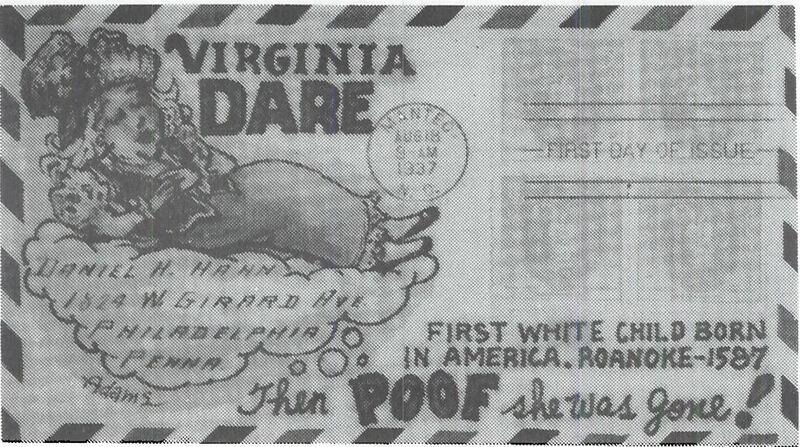 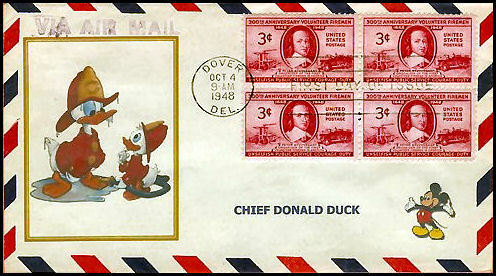 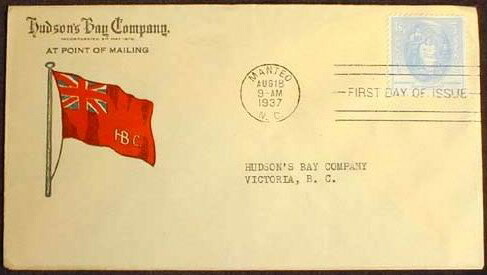 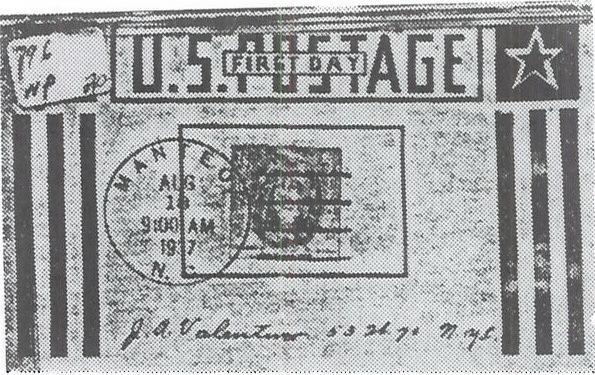 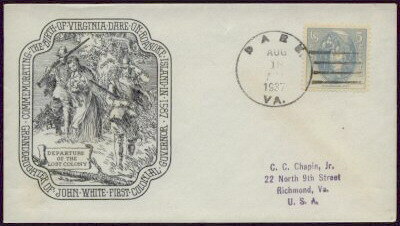 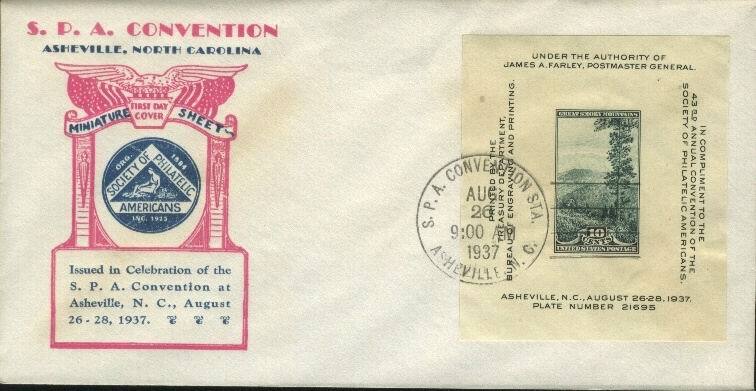 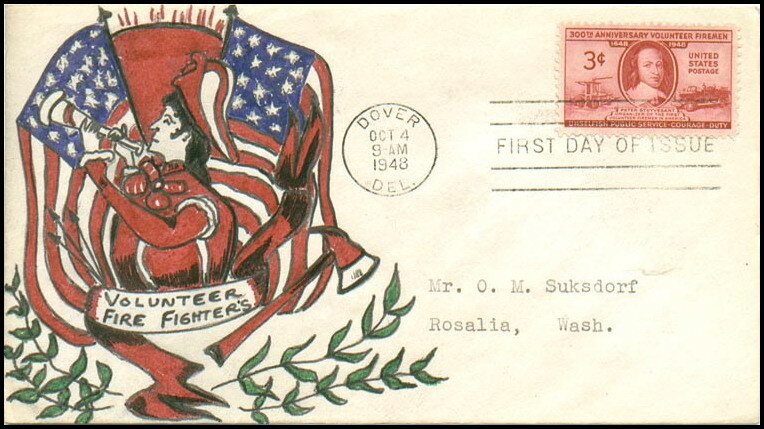 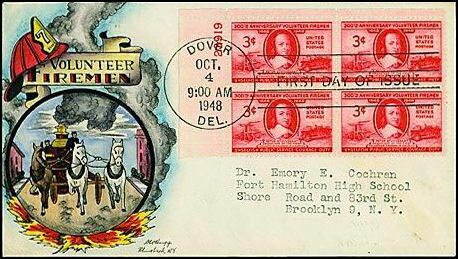 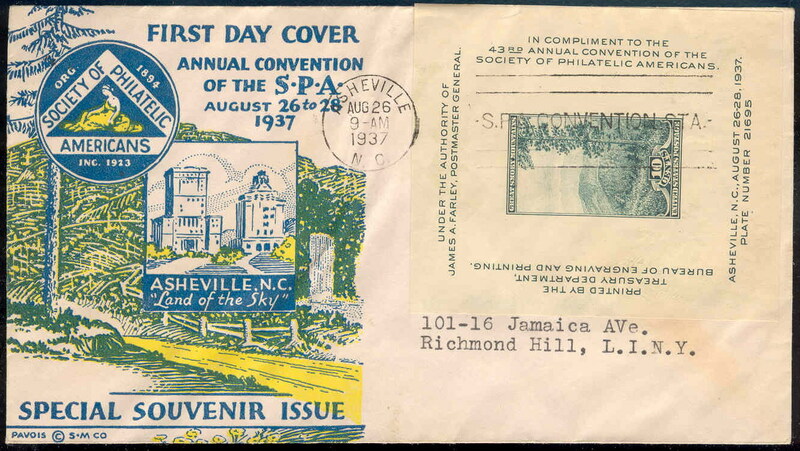 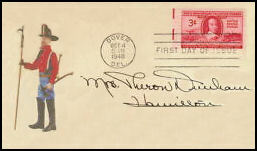 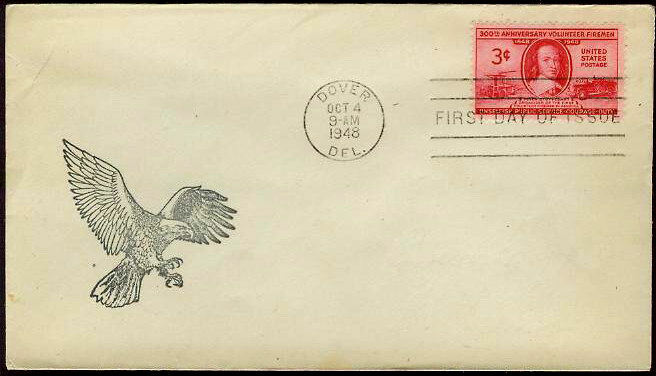 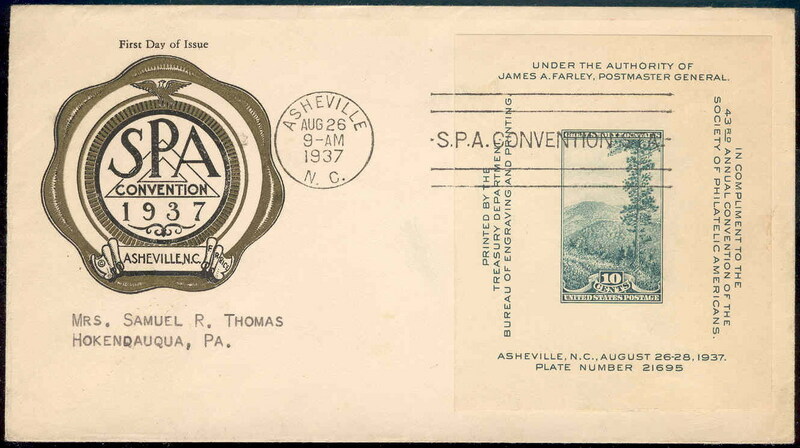 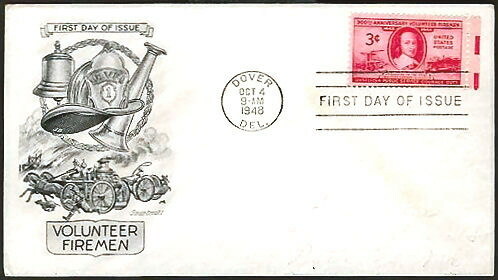 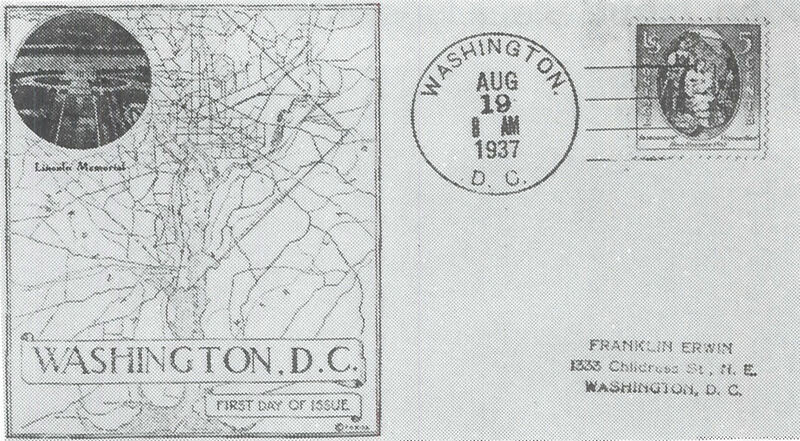 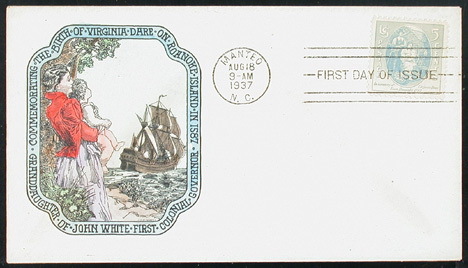 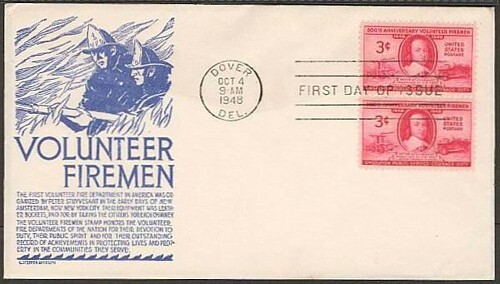 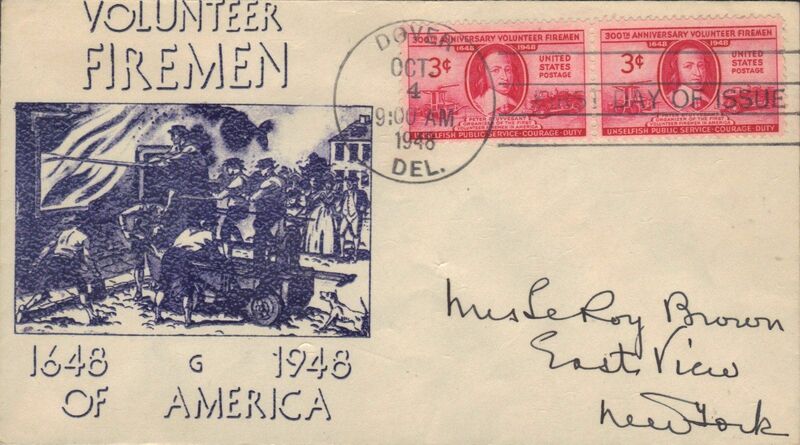 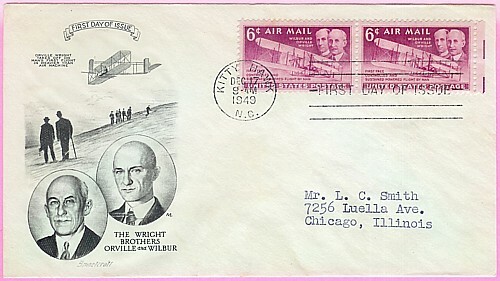 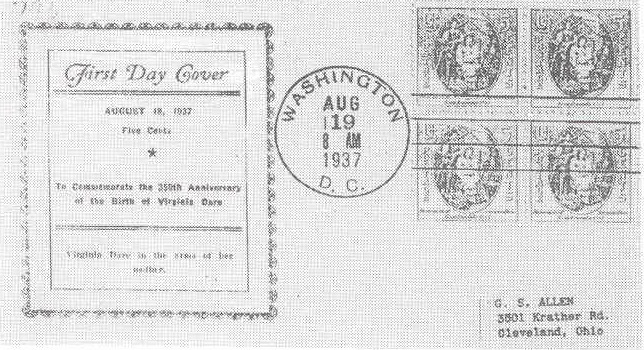 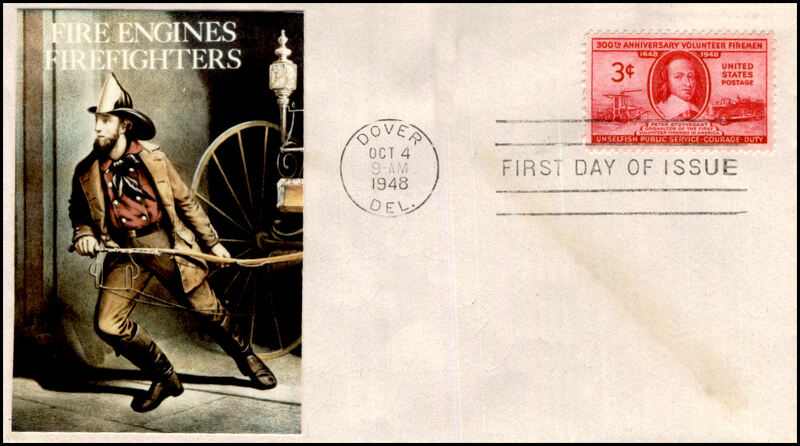 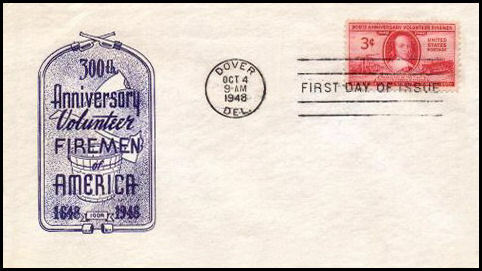 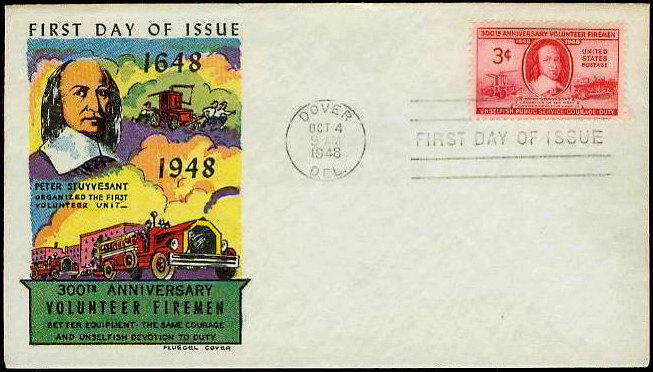 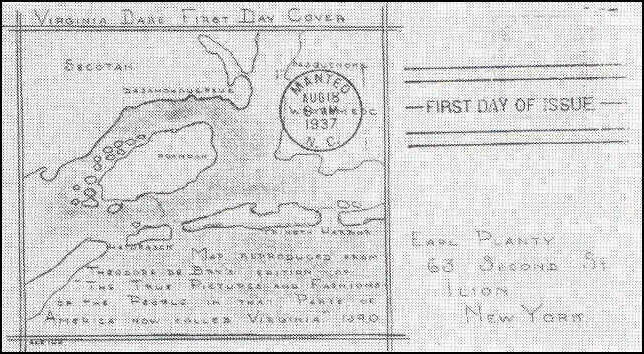 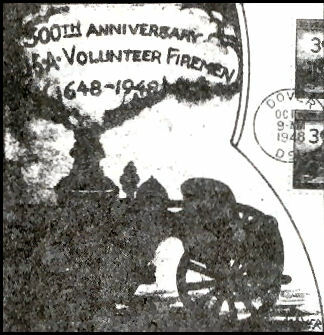 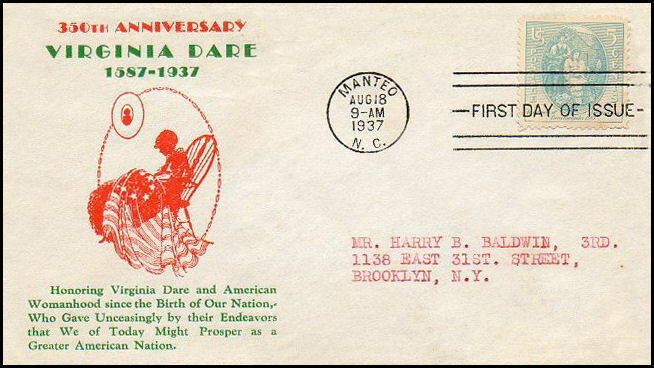 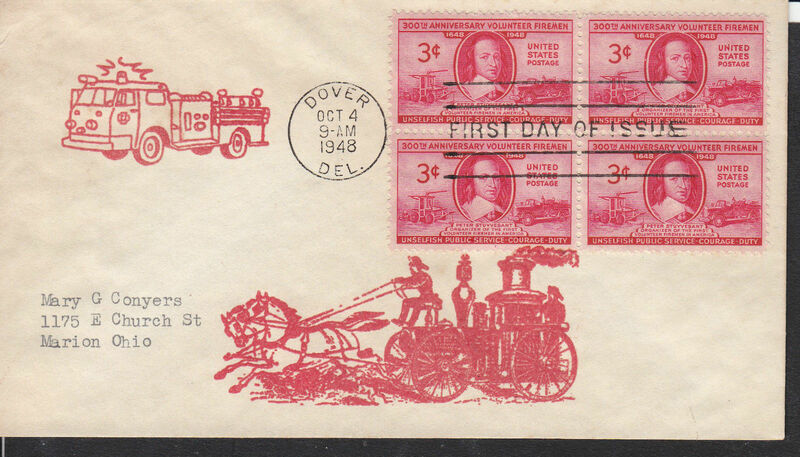 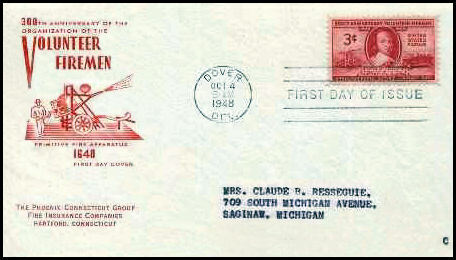 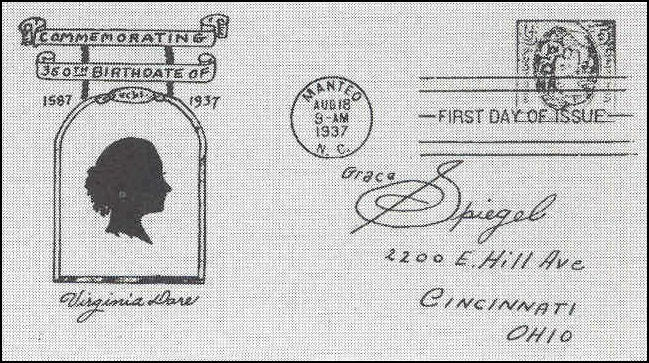 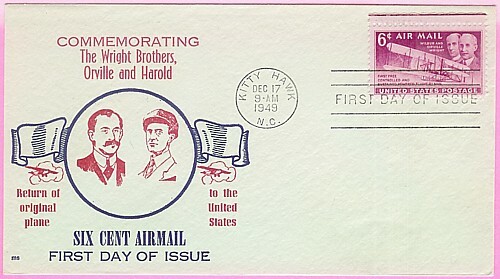 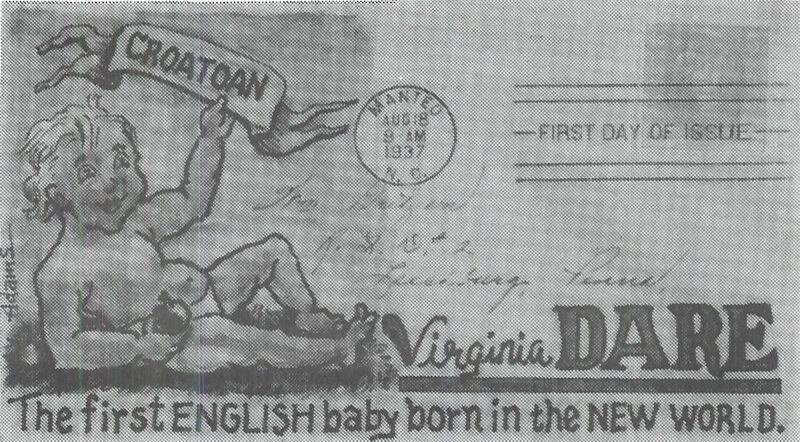 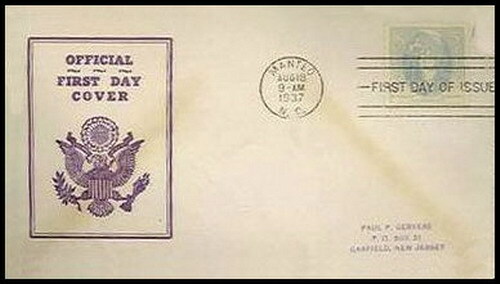 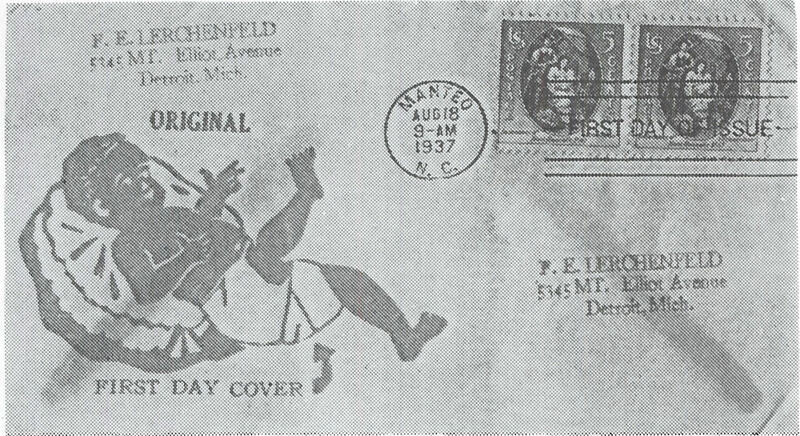 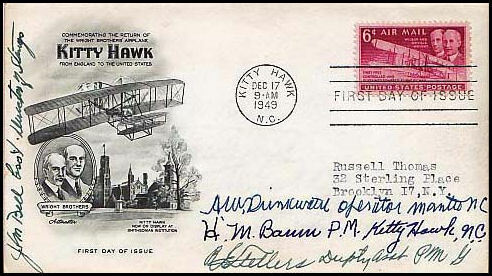 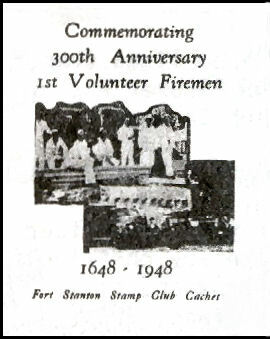 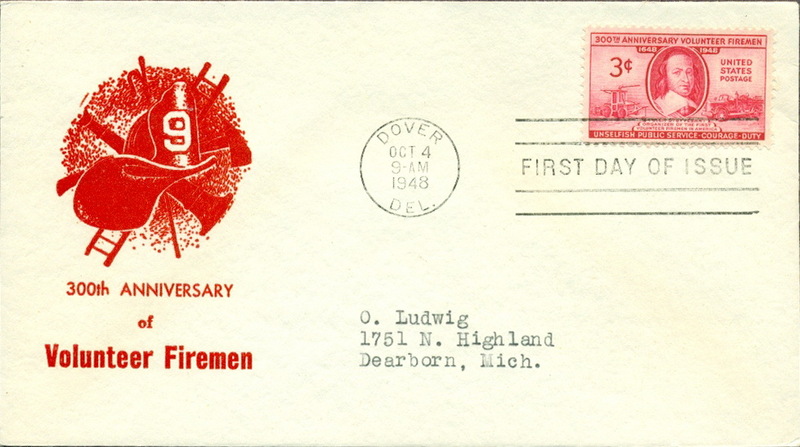 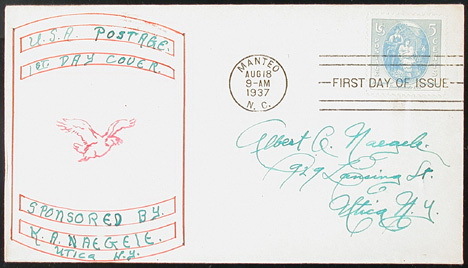 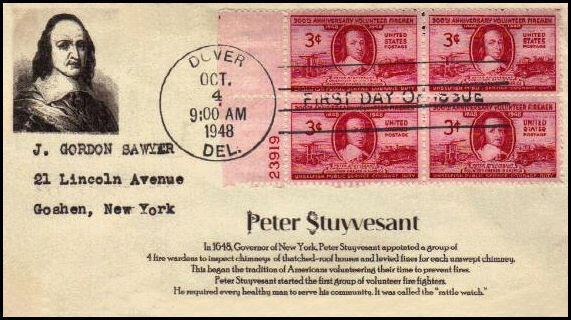 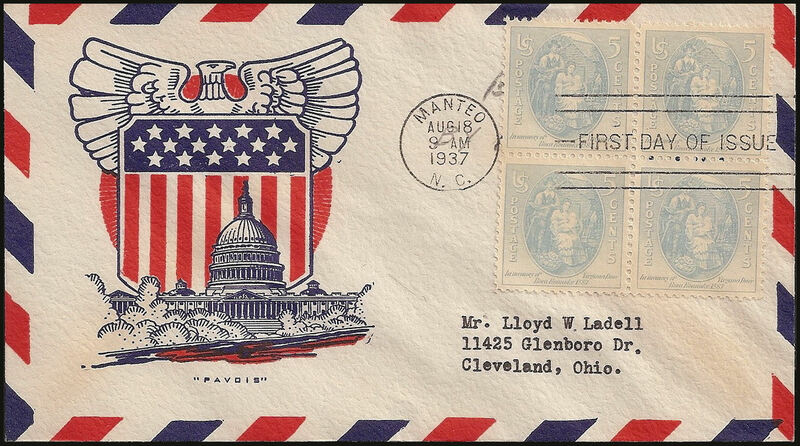 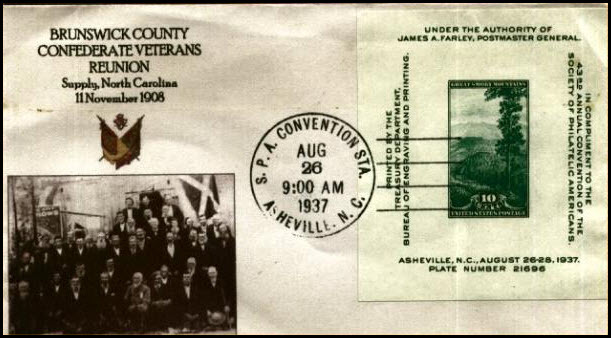 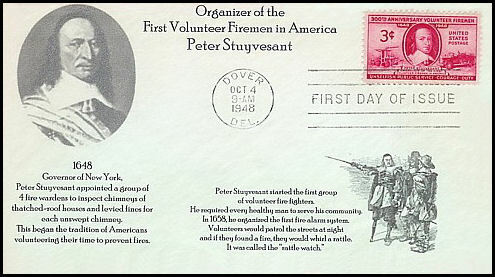 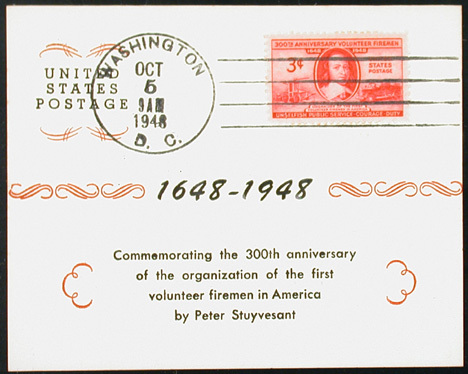 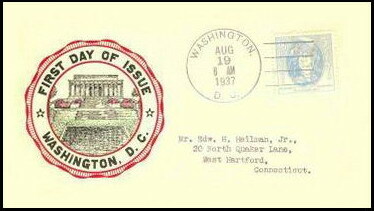 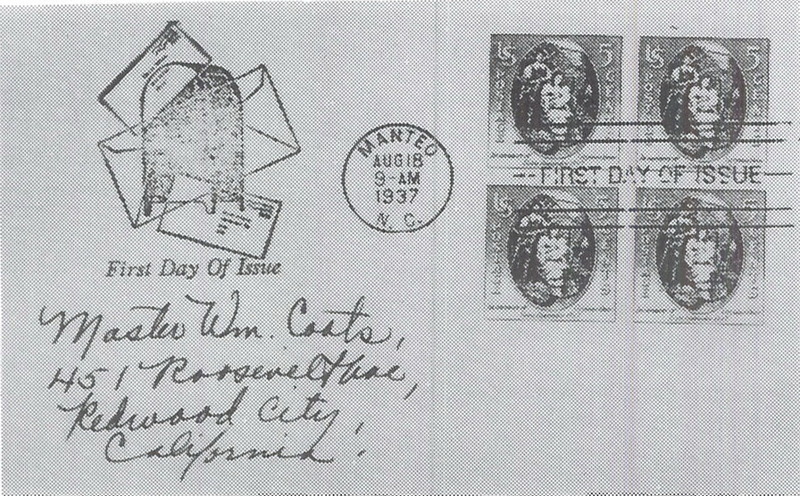 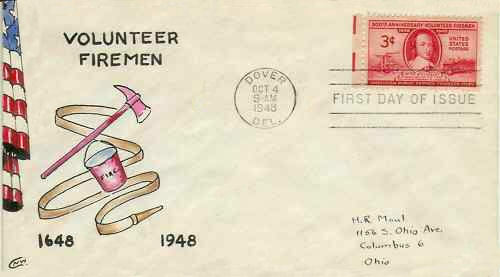 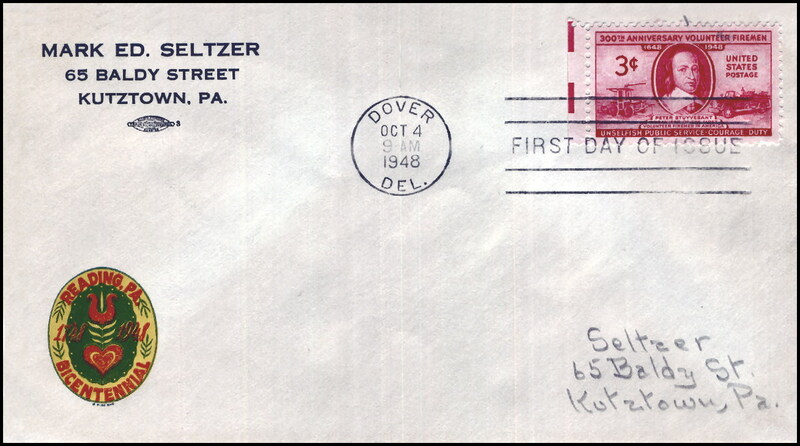 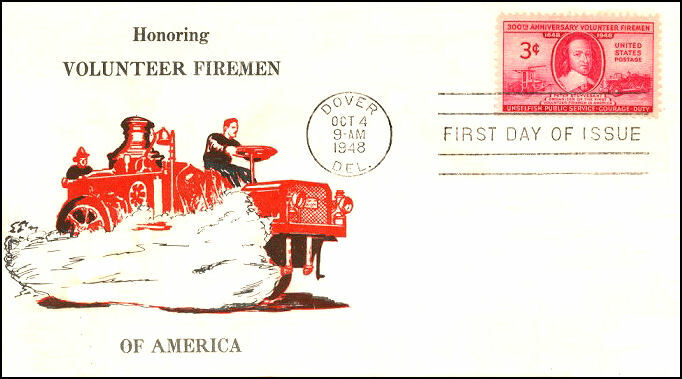 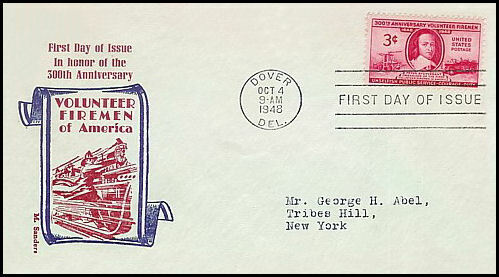 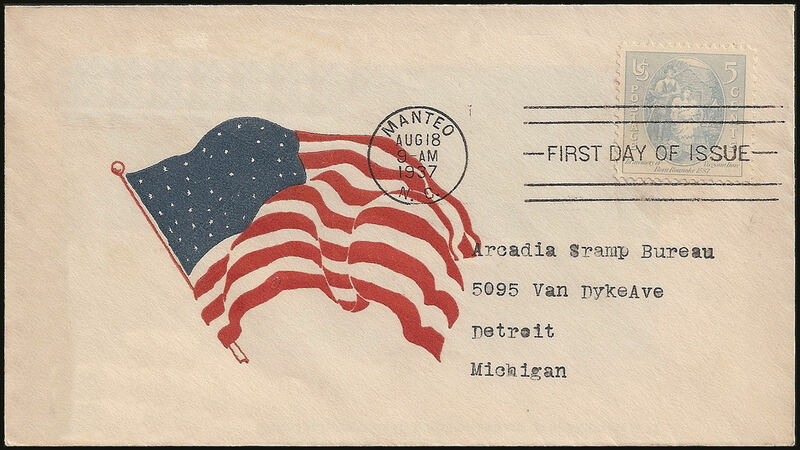 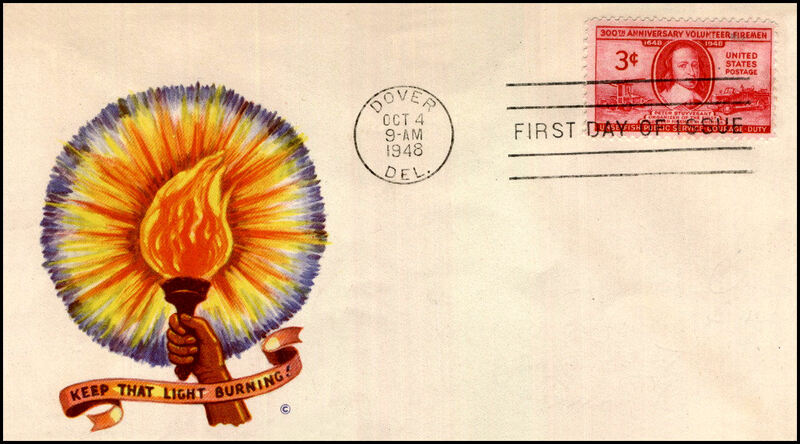 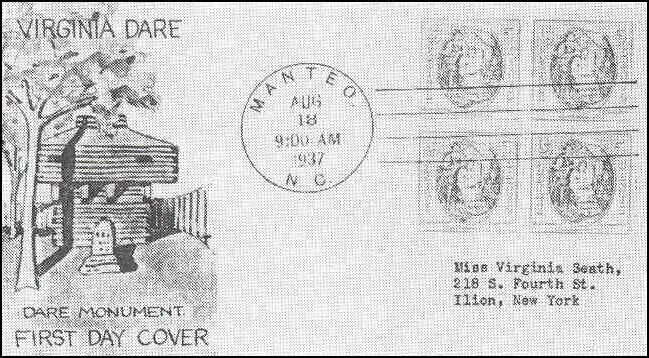 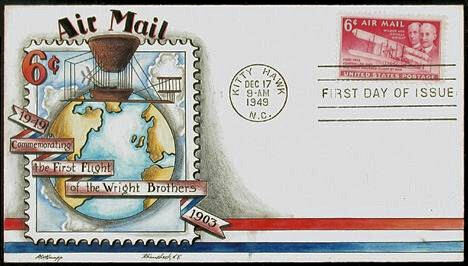 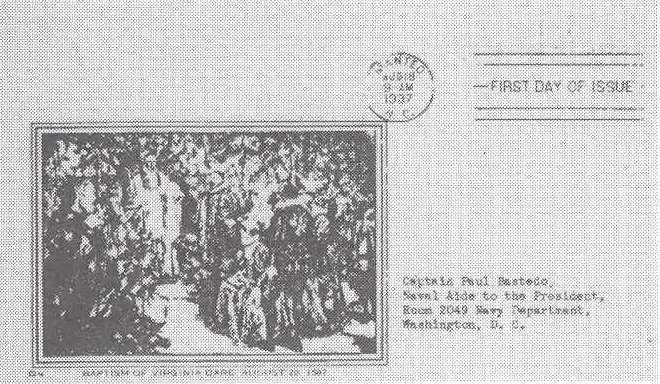 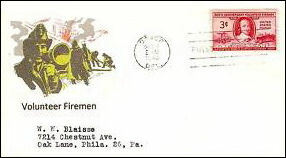 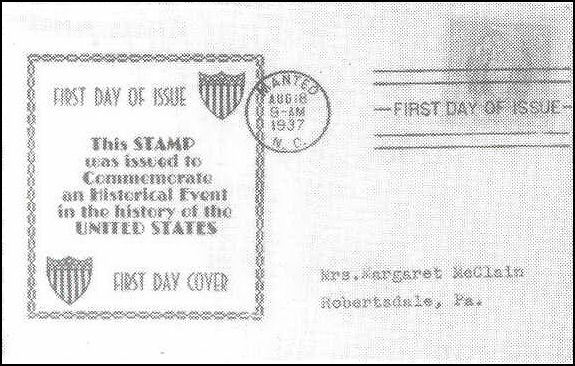 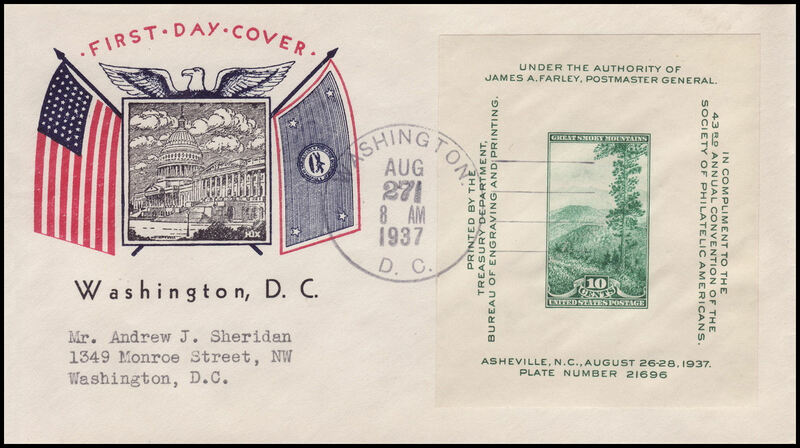 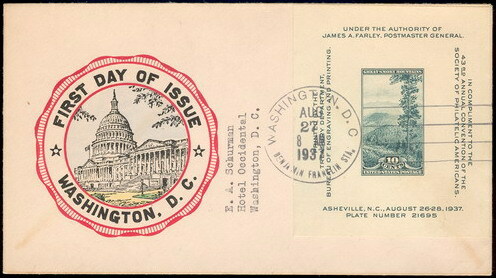 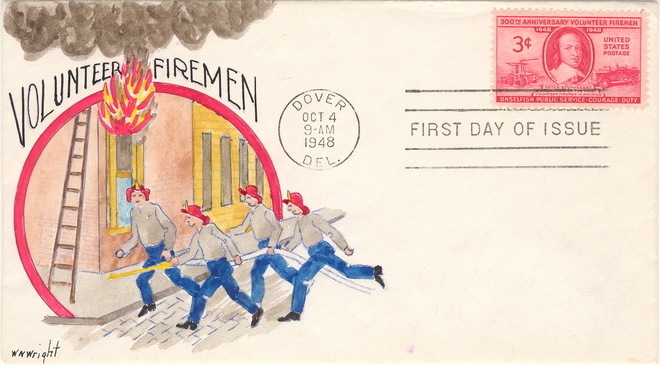 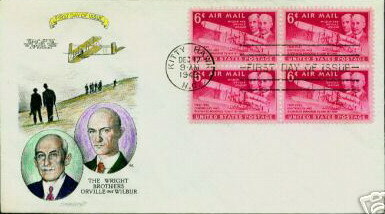 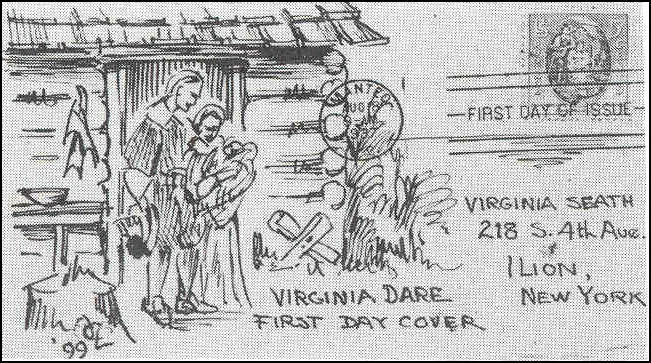 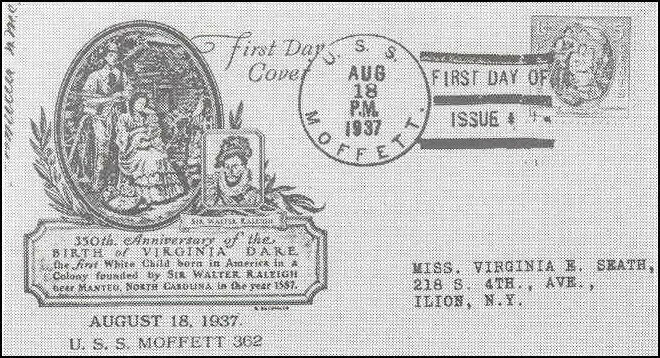 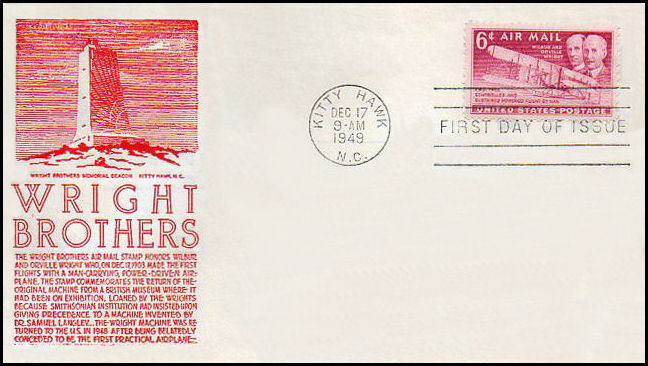 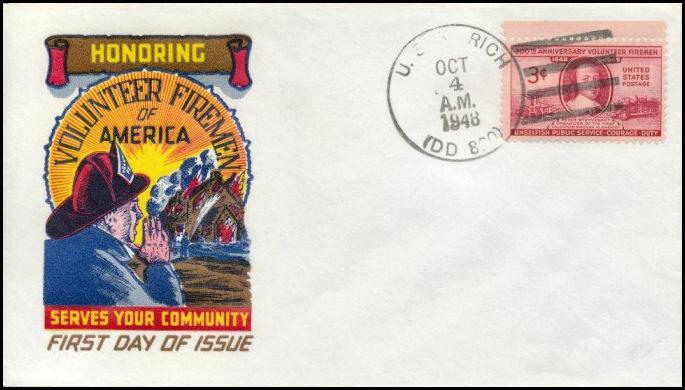 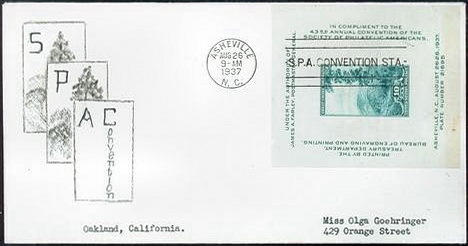 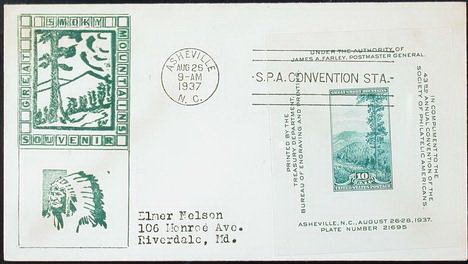 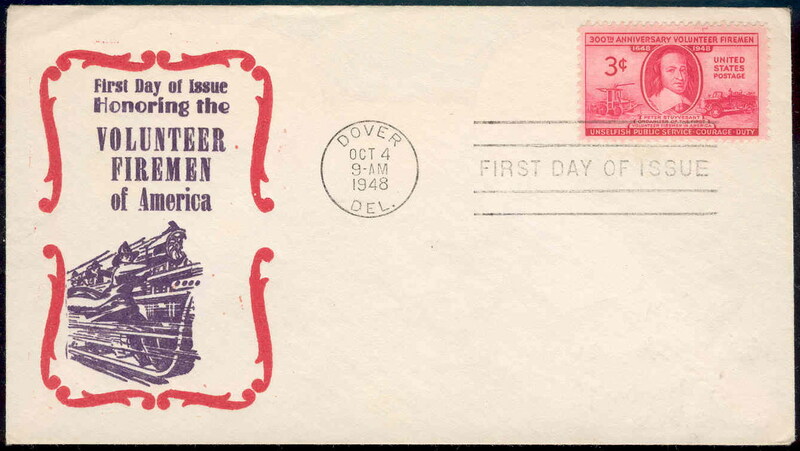 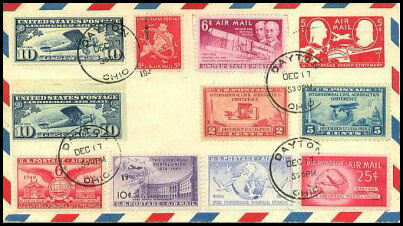 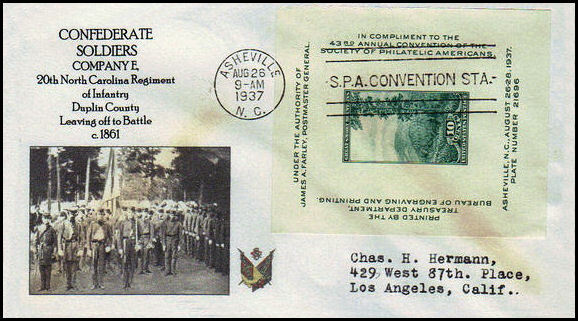 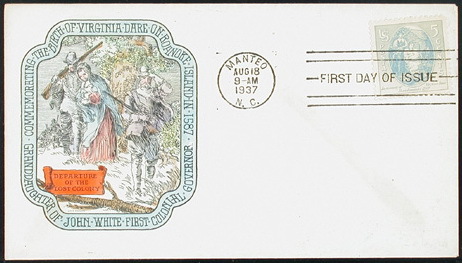 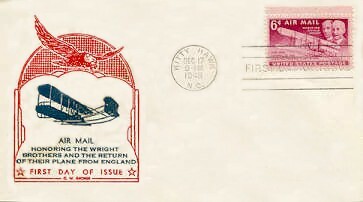 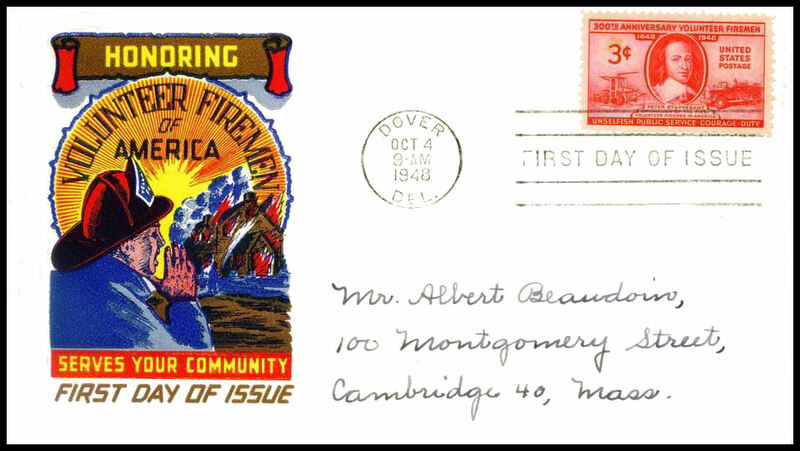 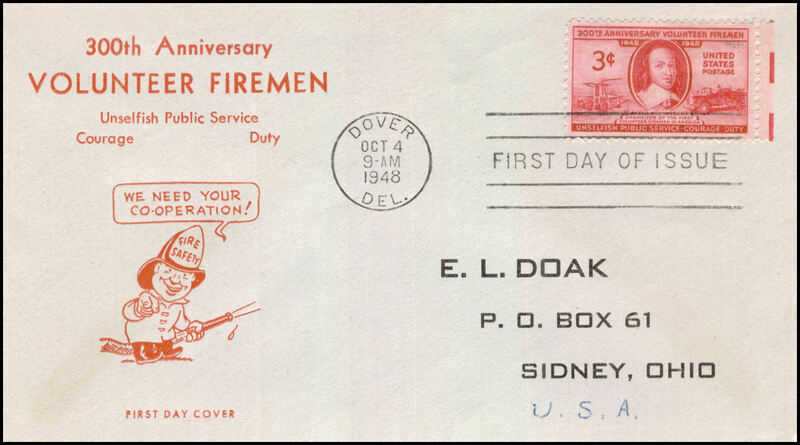 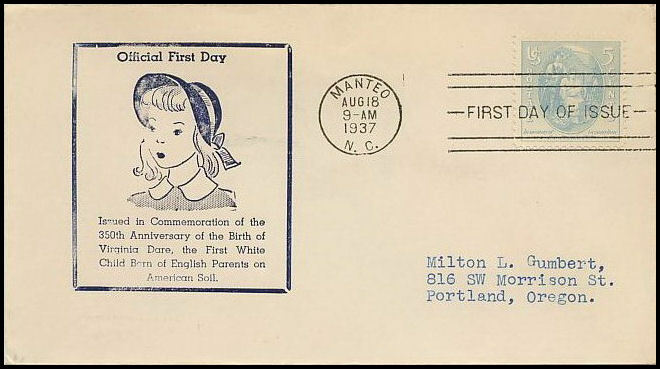 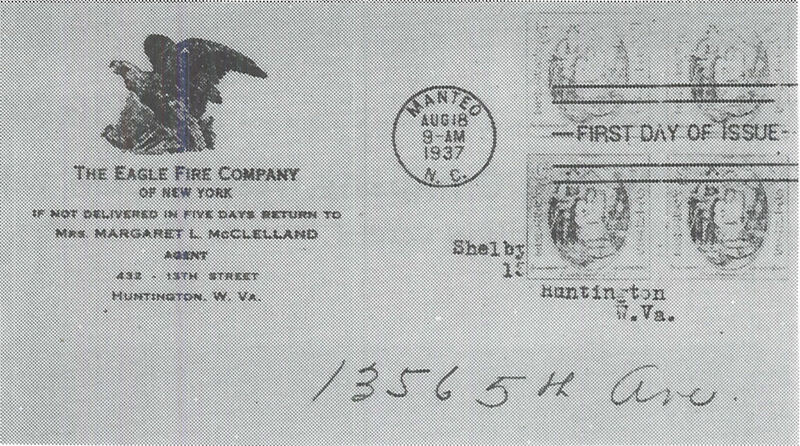 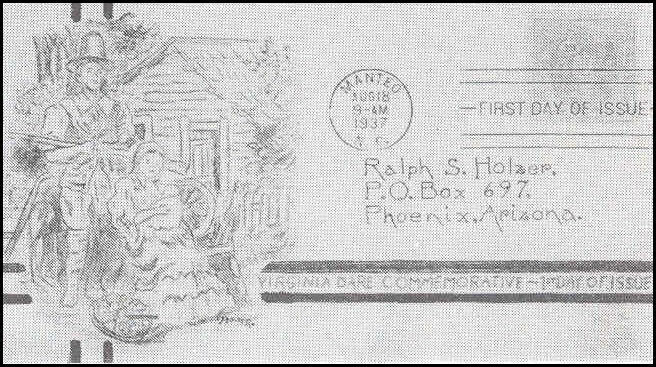 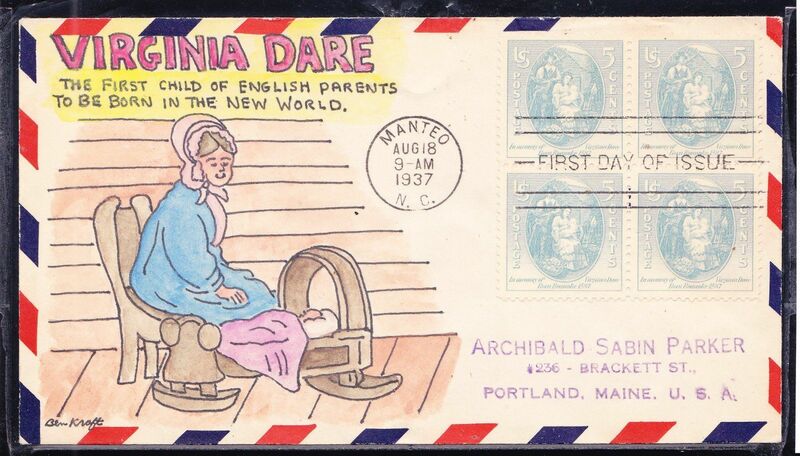 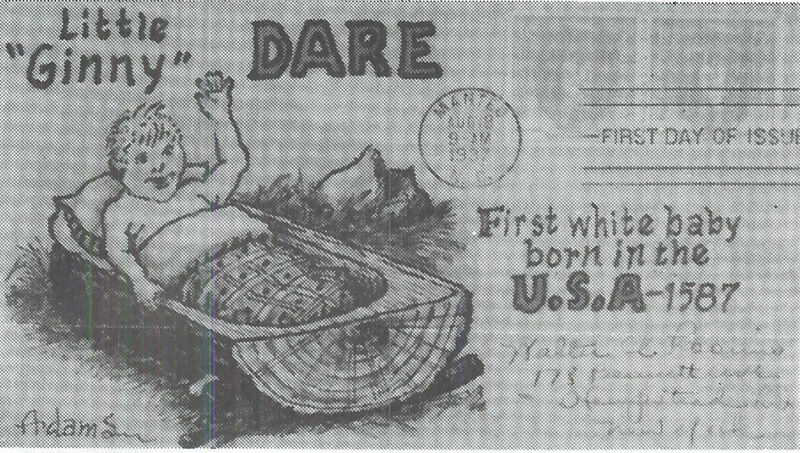 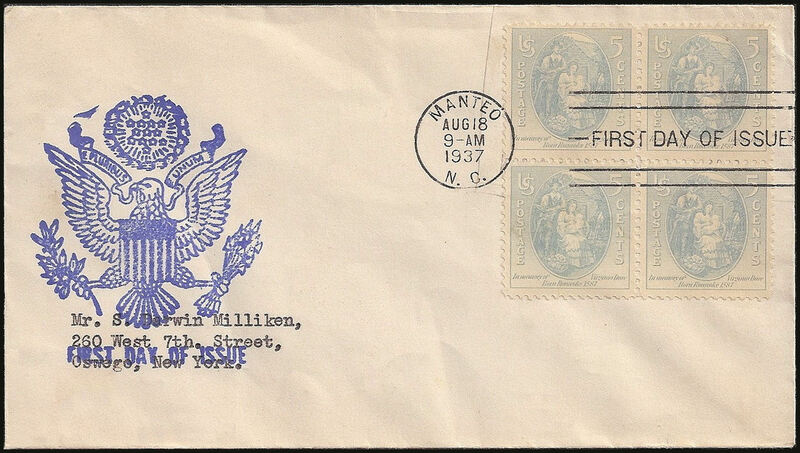 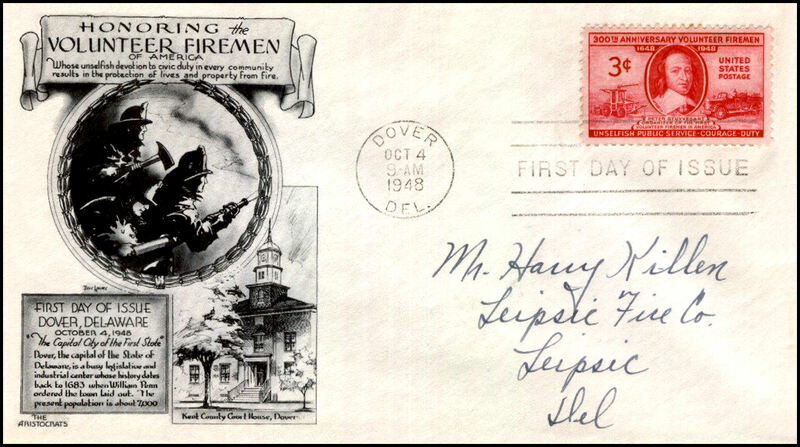 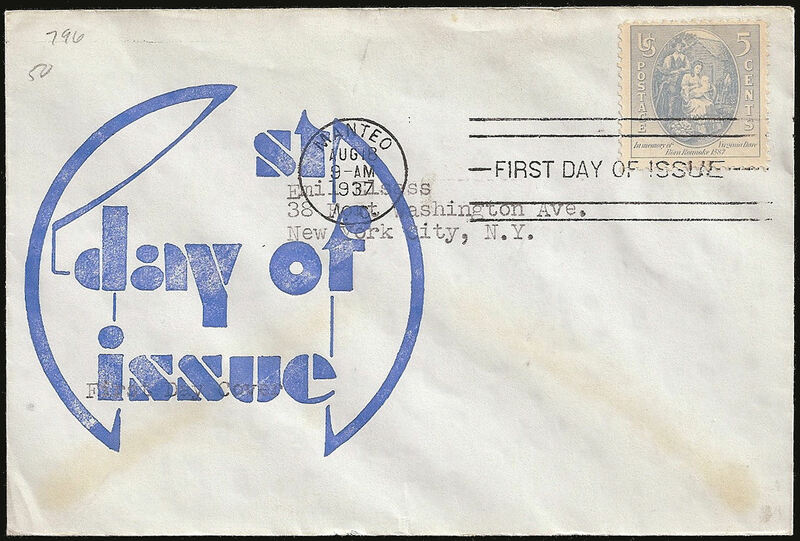 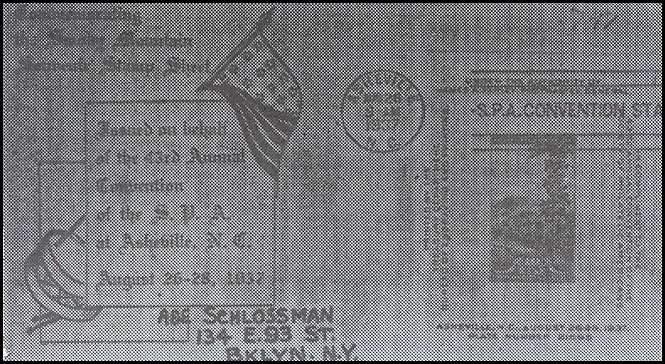 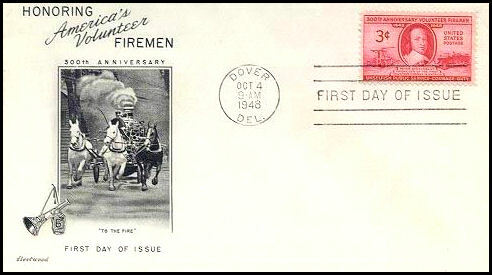 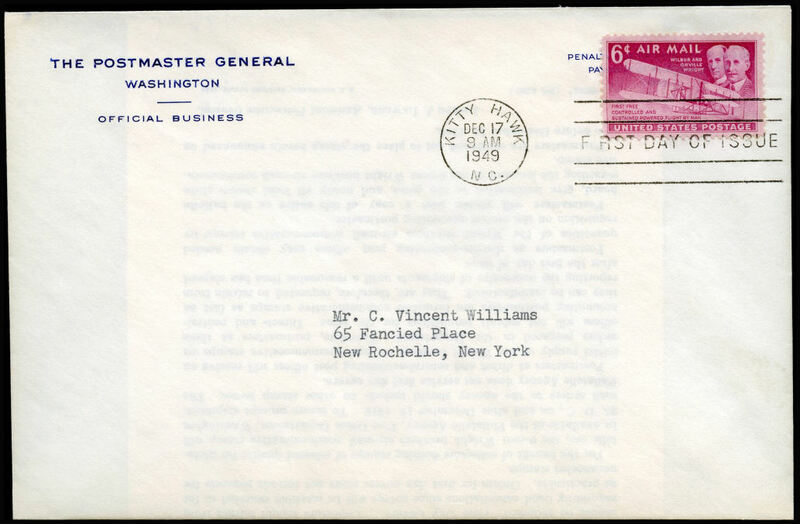 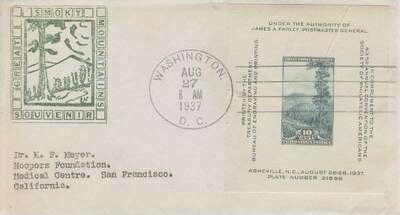 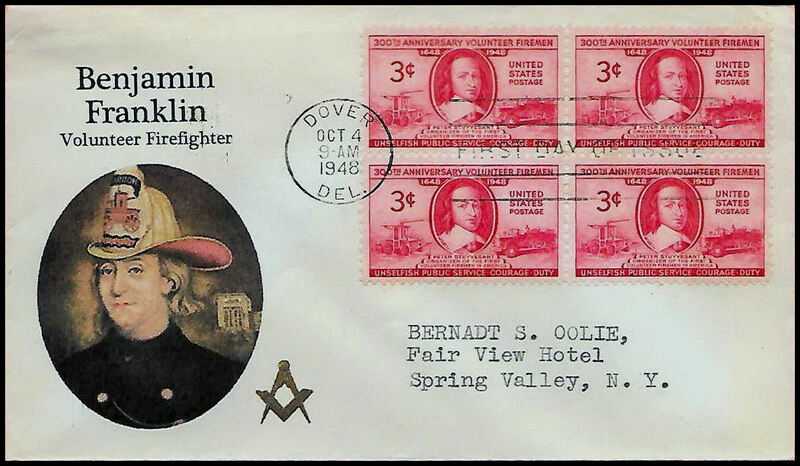 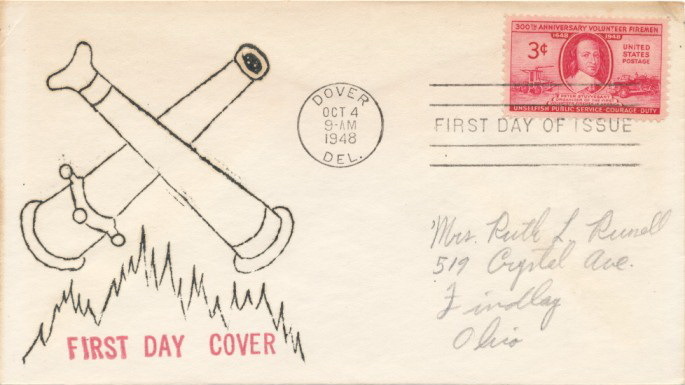 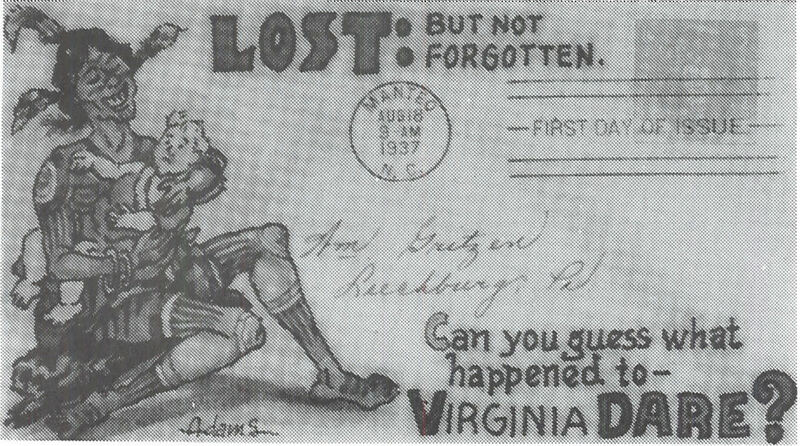 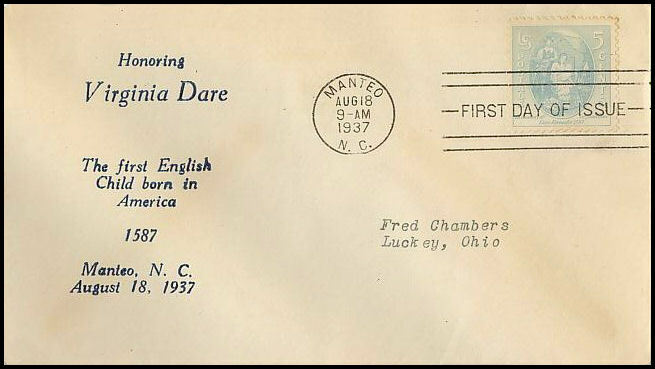 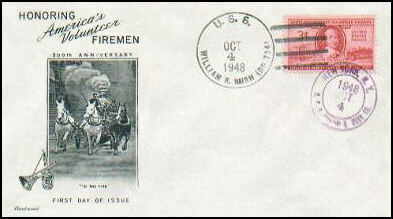 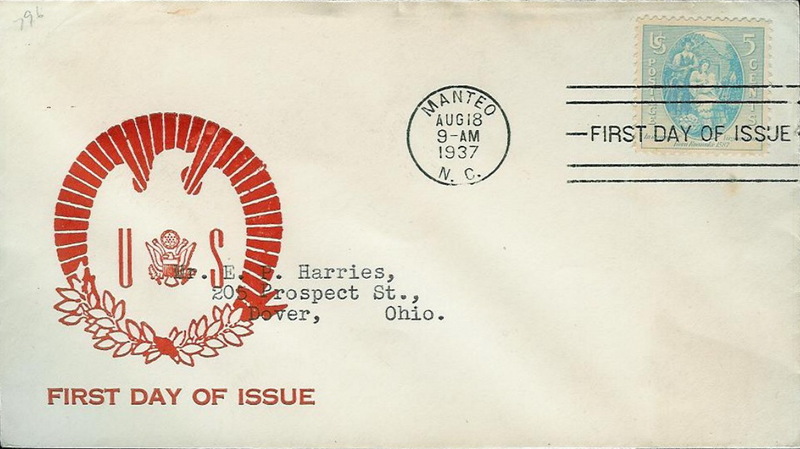 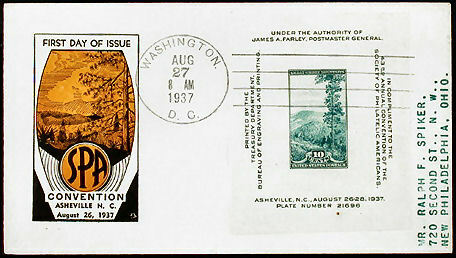 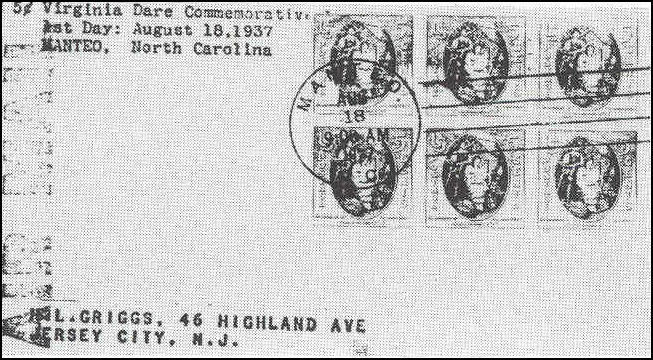 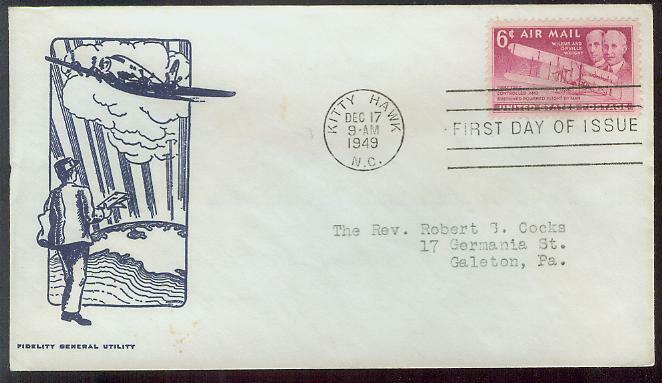 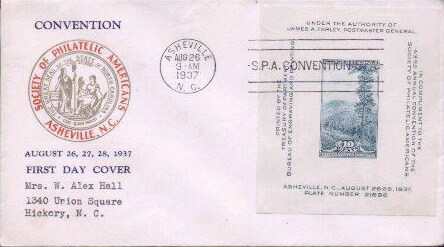 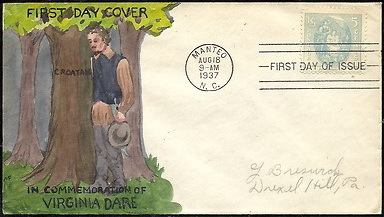 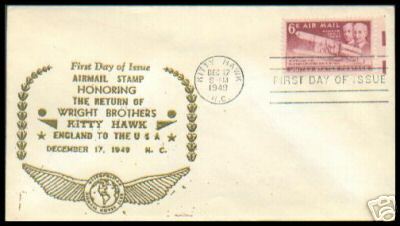 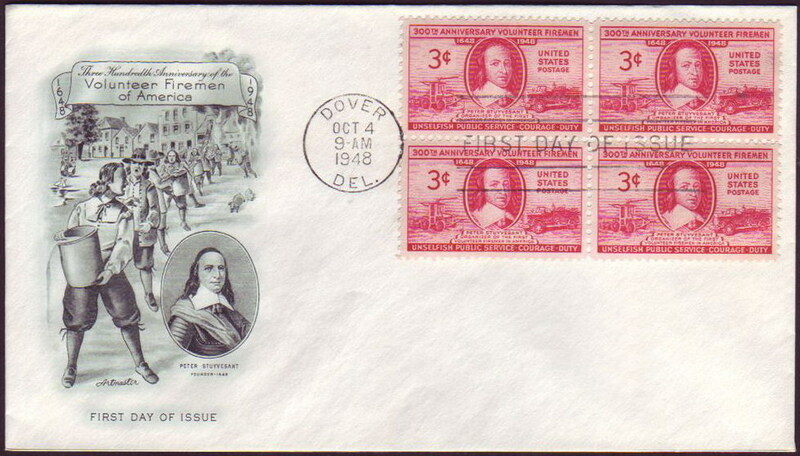 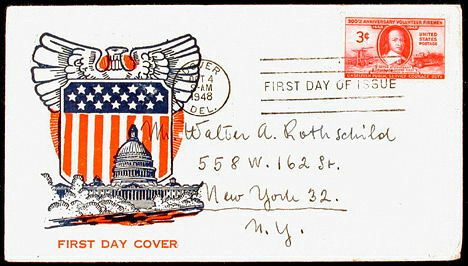 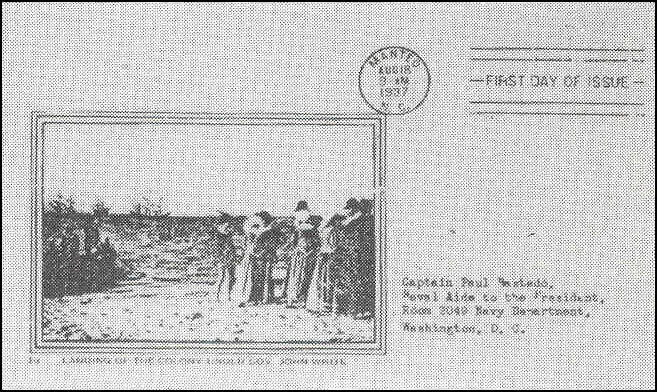 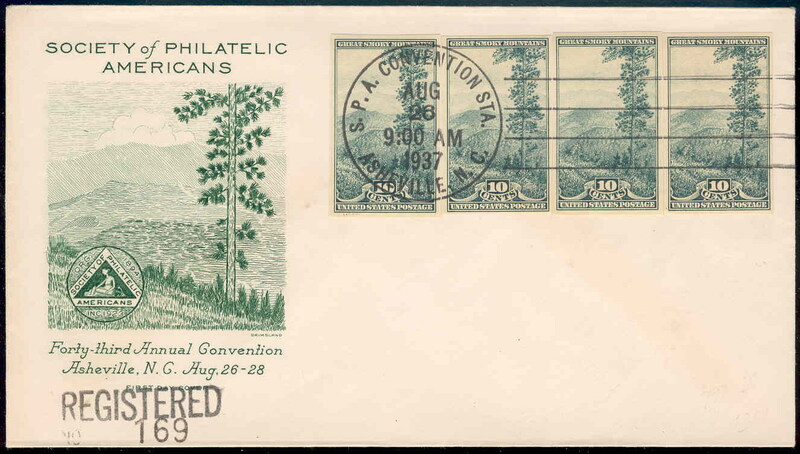 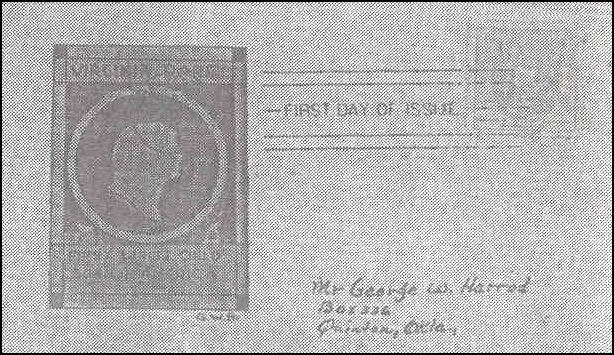 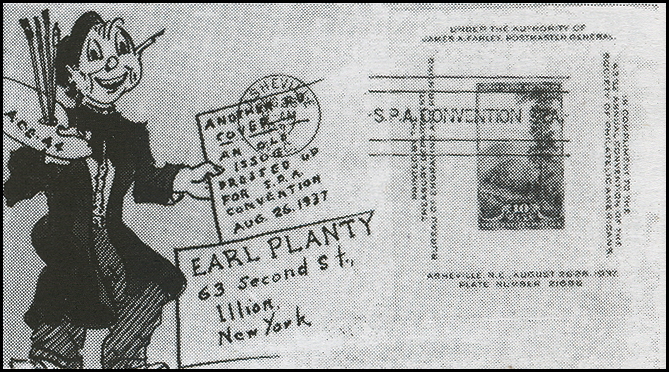 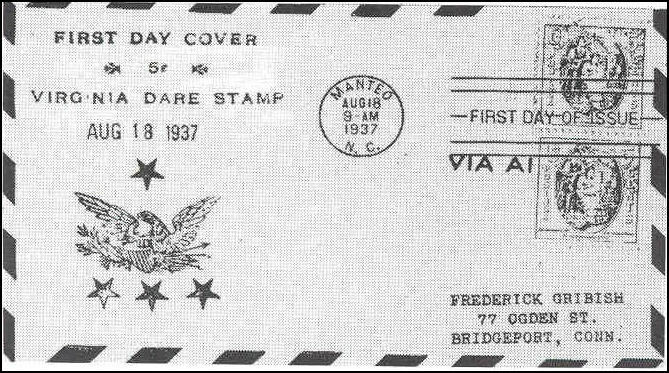 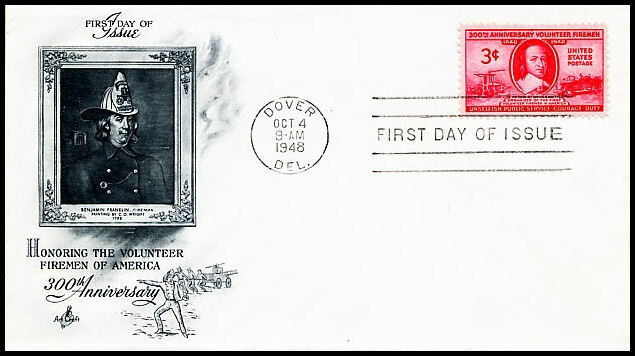 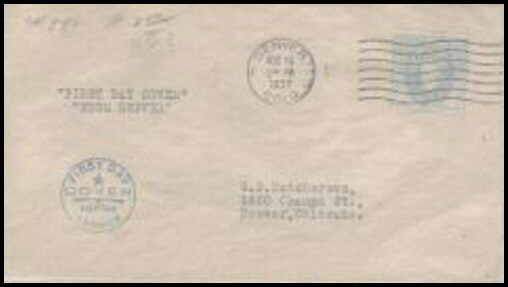 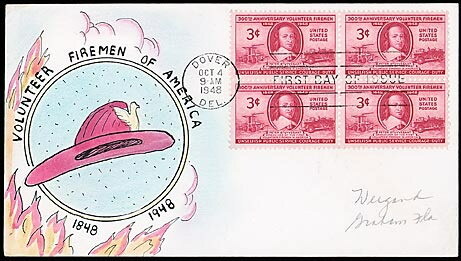 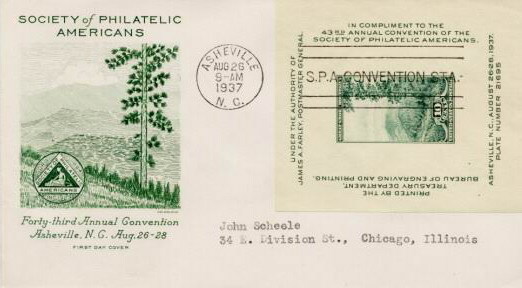 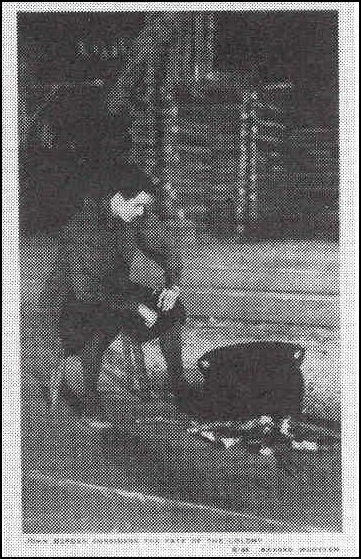 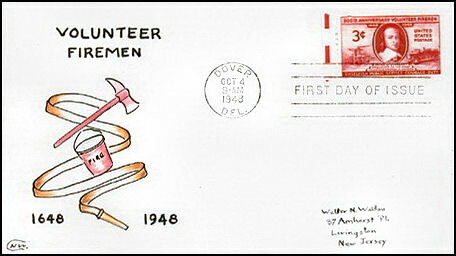 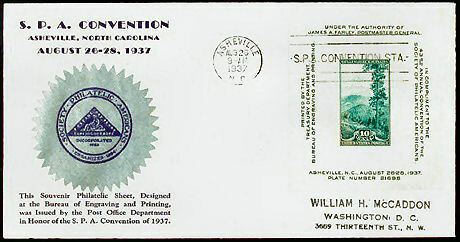 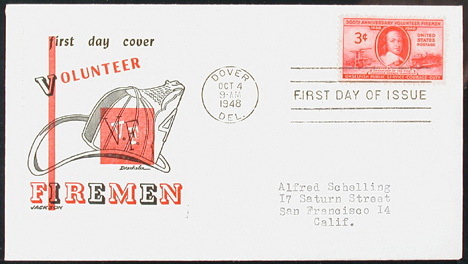 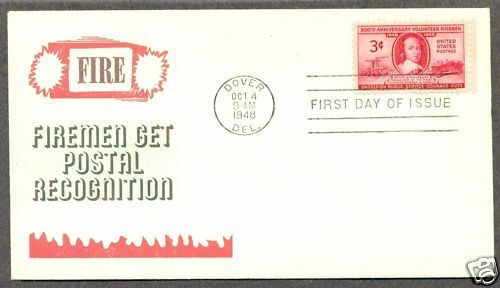 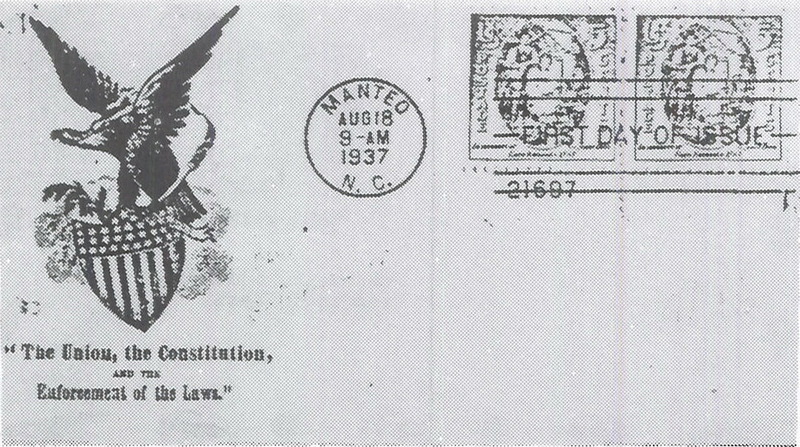 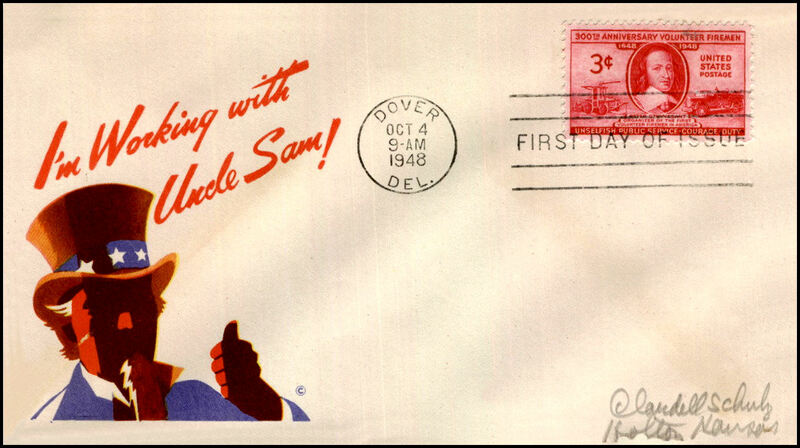 DSC: Von Ohlen, William J.
DSC: Rice, Frederick Rogers & Wilma C.
blue red; white label peeled off leaving remnants with hand-lettering lower left; Appears to be an event cover by WSC for Flag Day June 14, 1933. 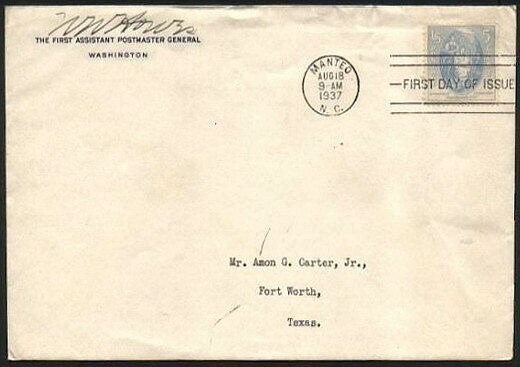 May or may not have been serviced by WSC. 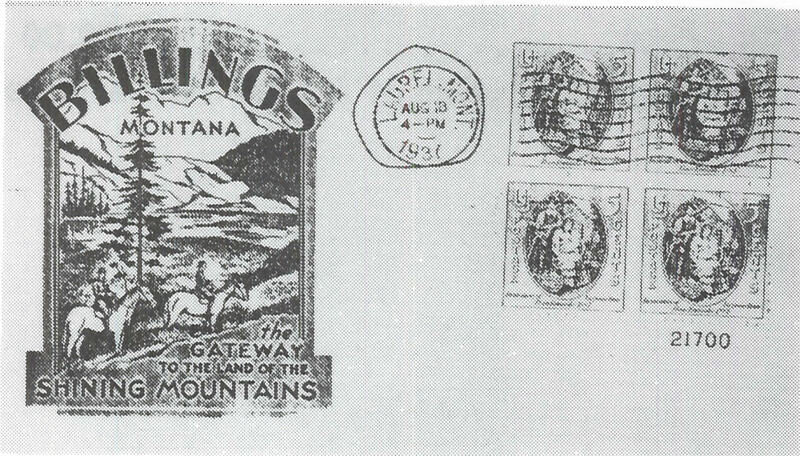 Billings, Montana, Shining Mountains; Completely Unrelated! 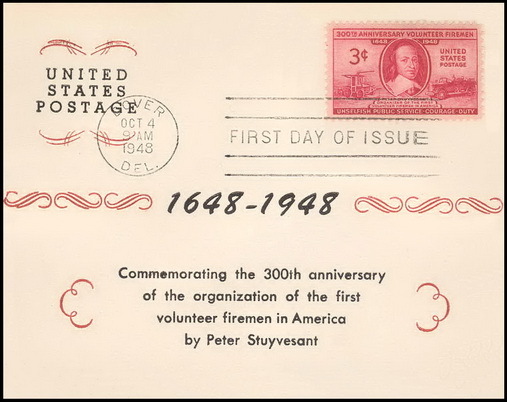 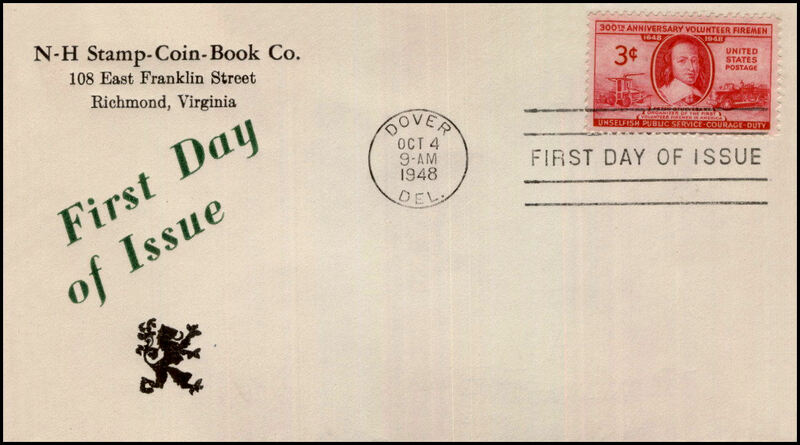 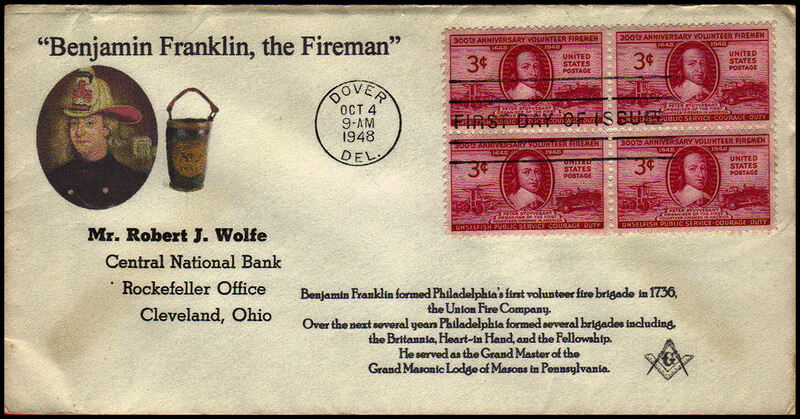 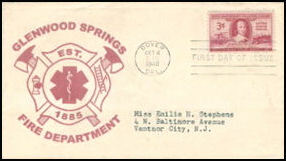 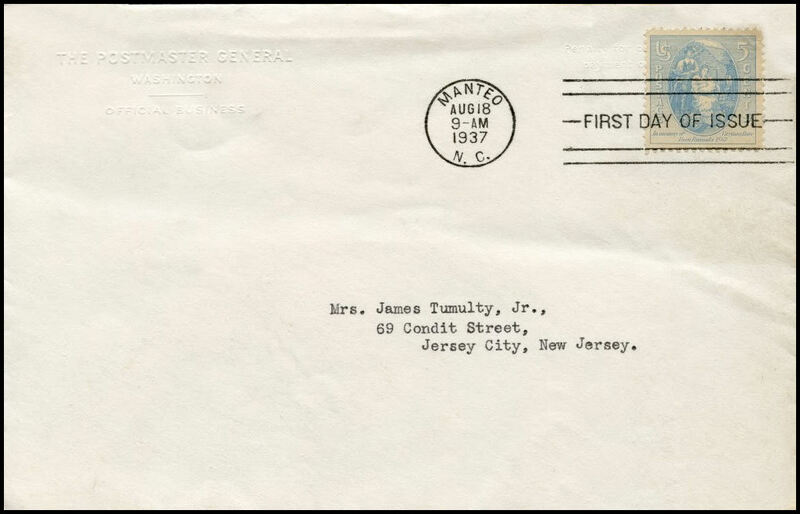 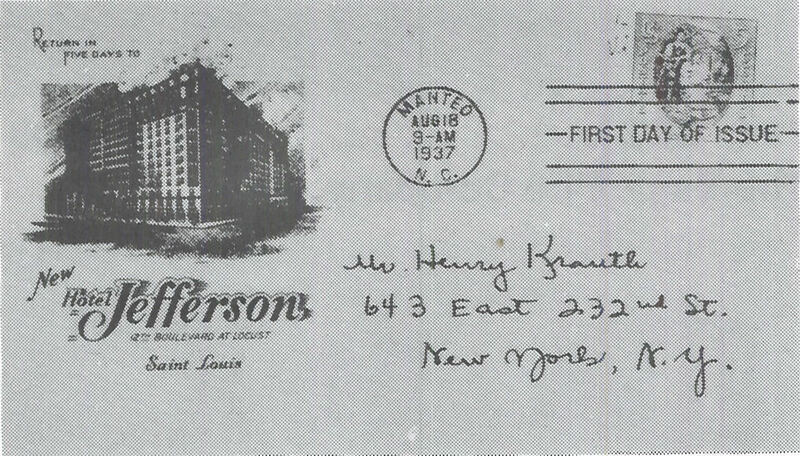 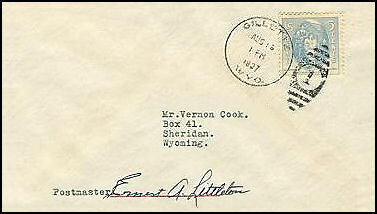 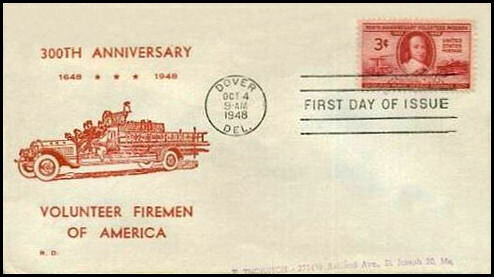 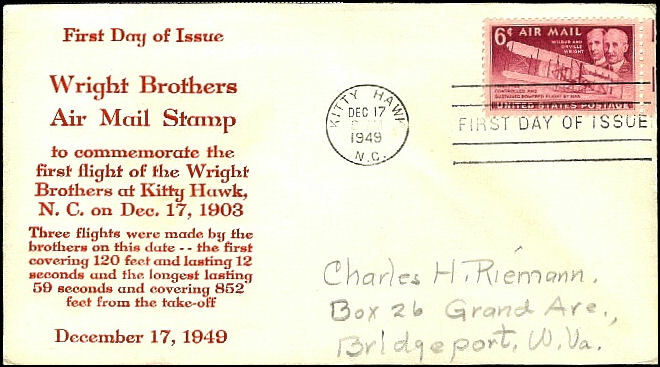 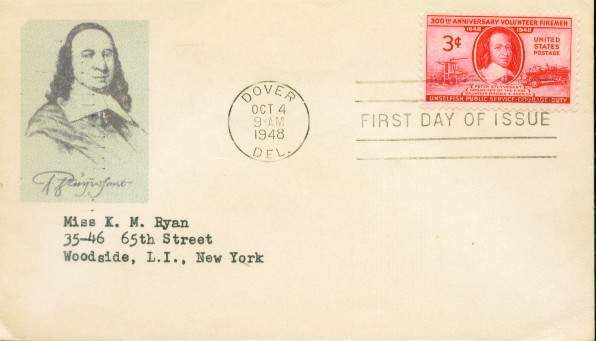 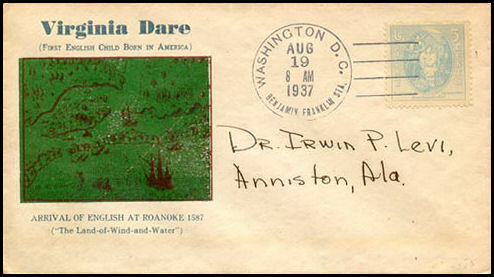 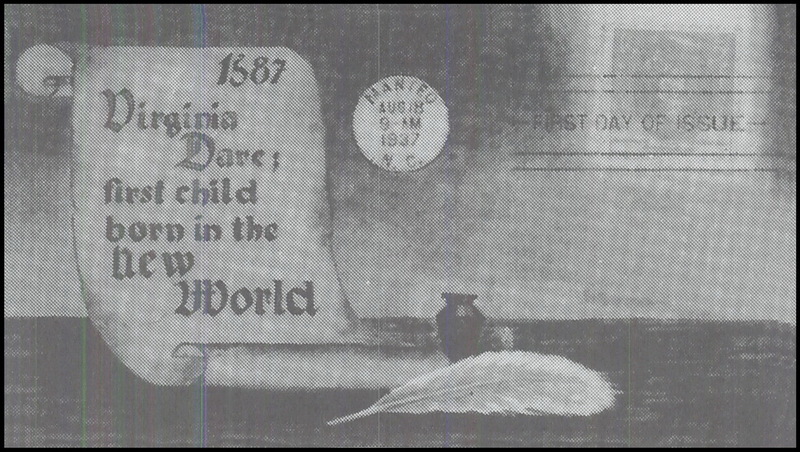 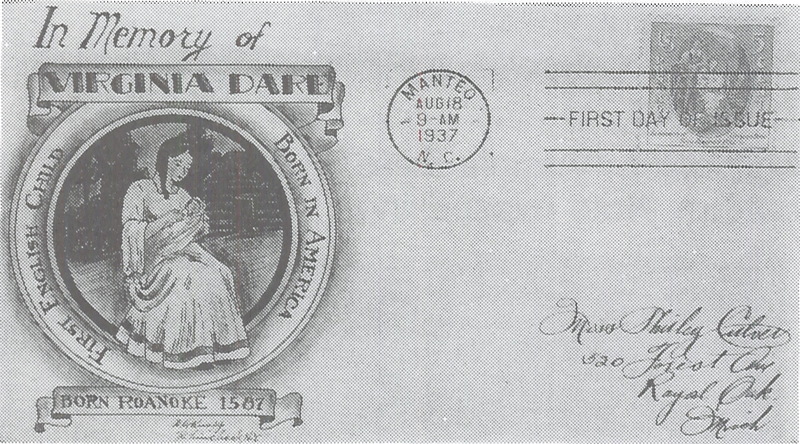 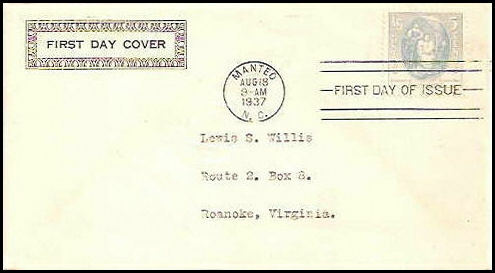 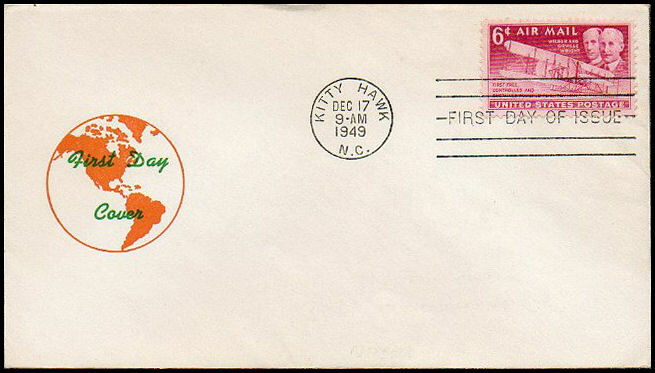 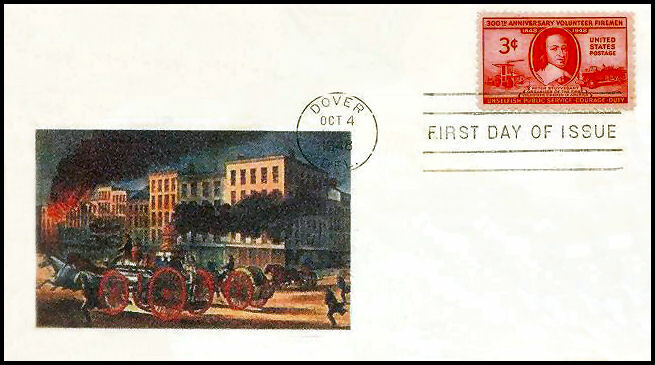 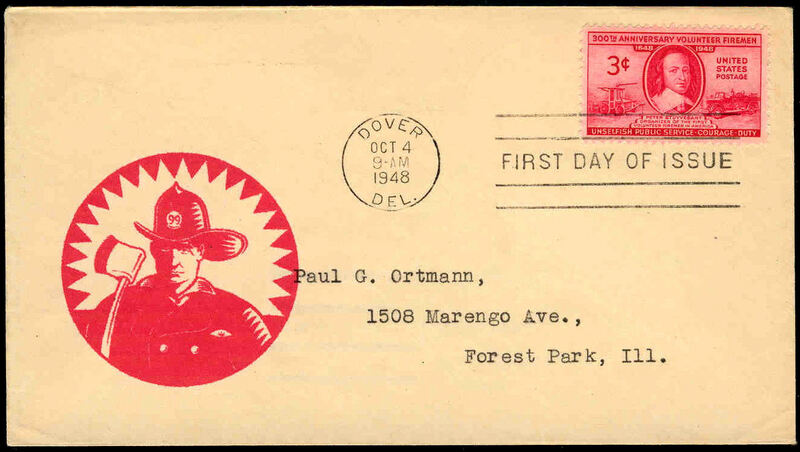 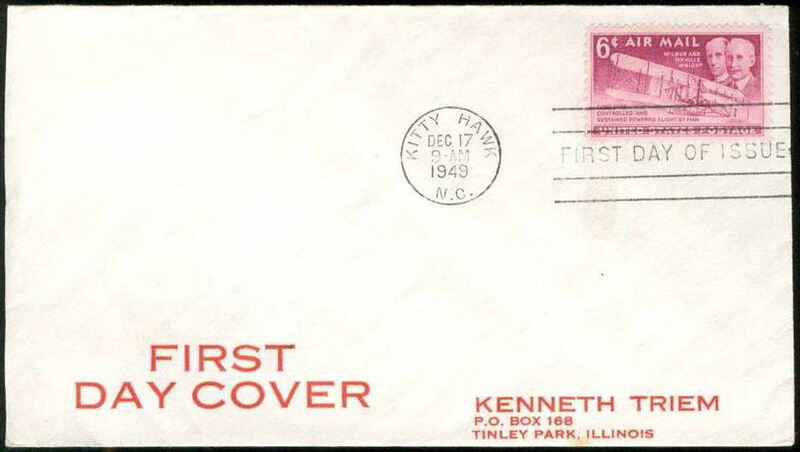 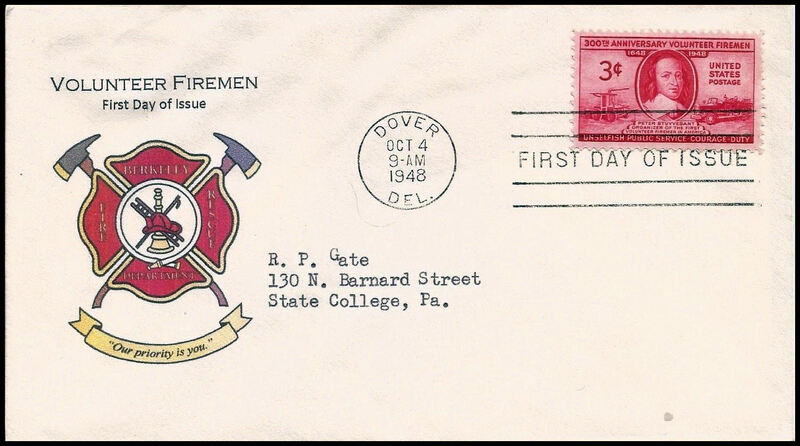 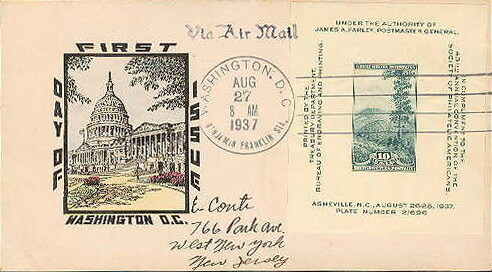 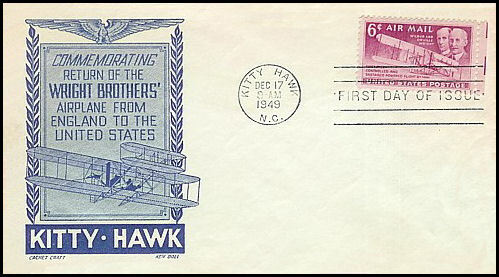 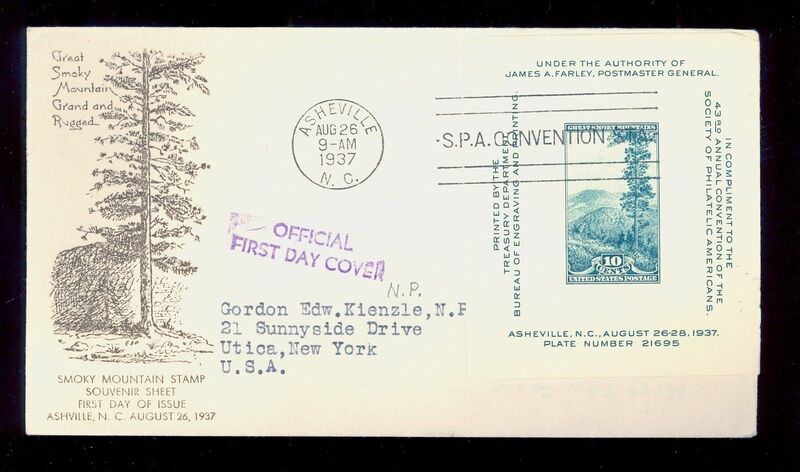 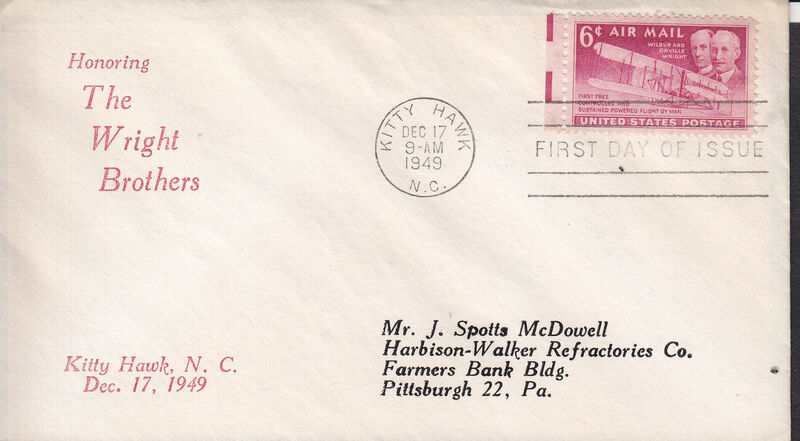 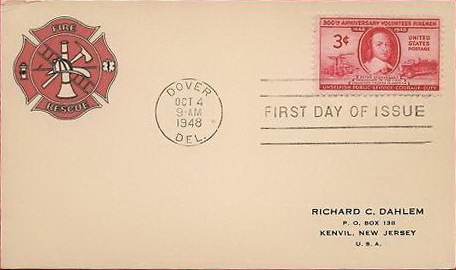 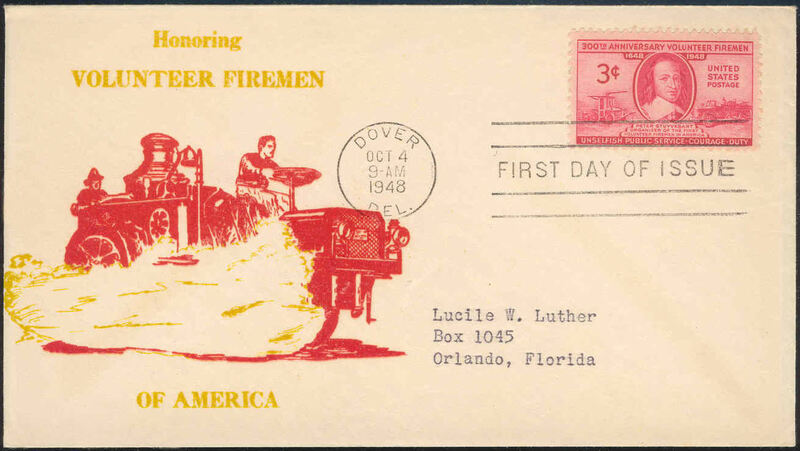 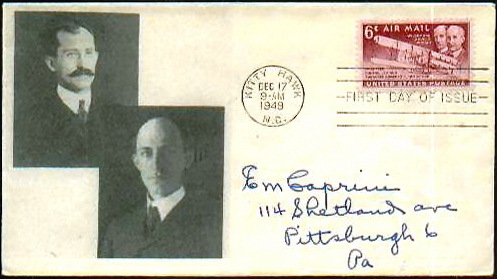 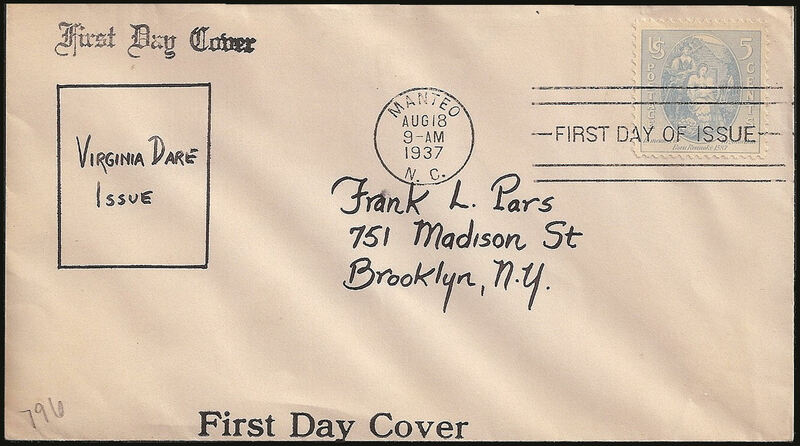 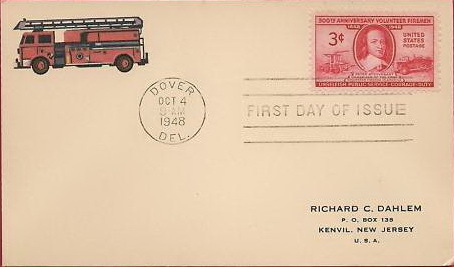 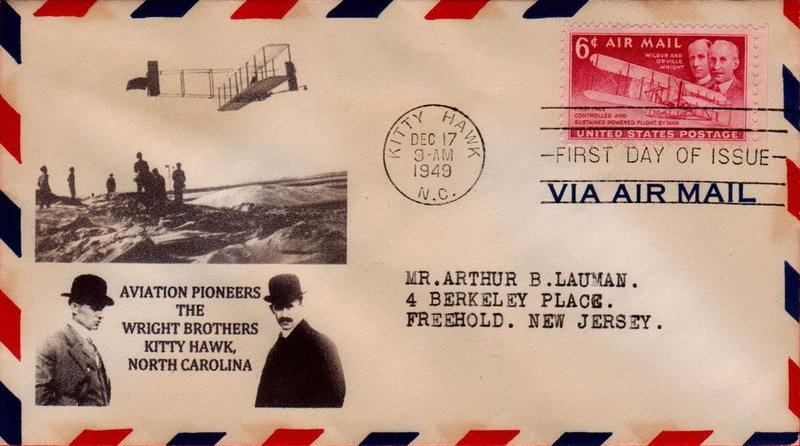 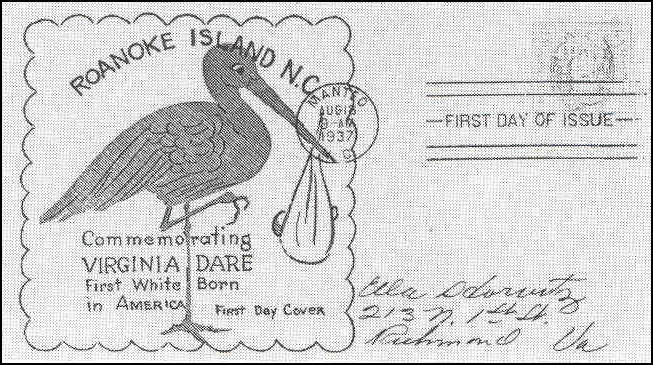 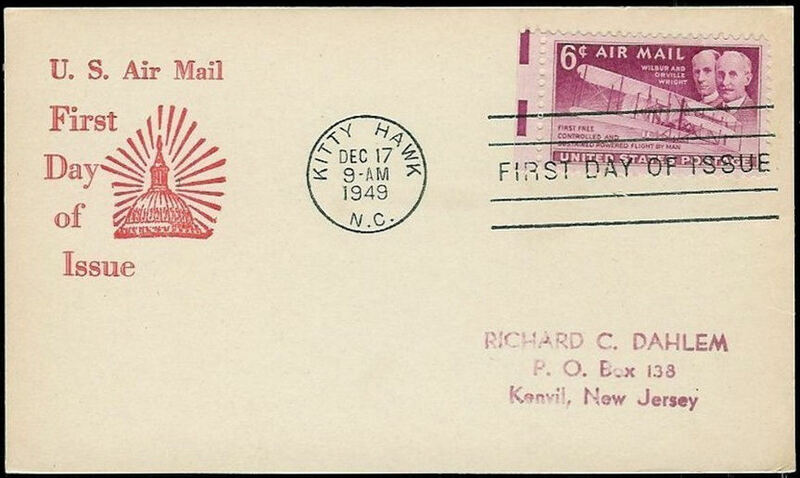 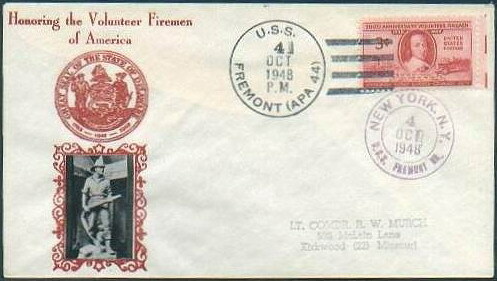 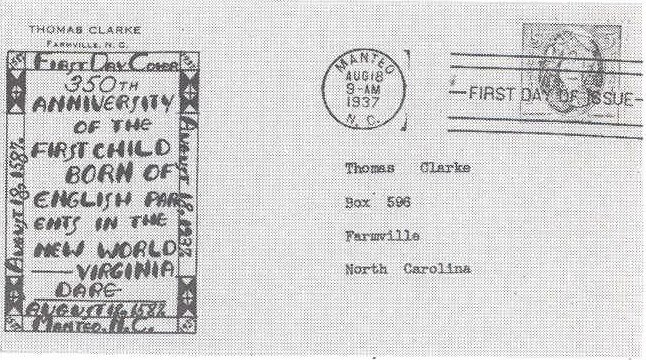 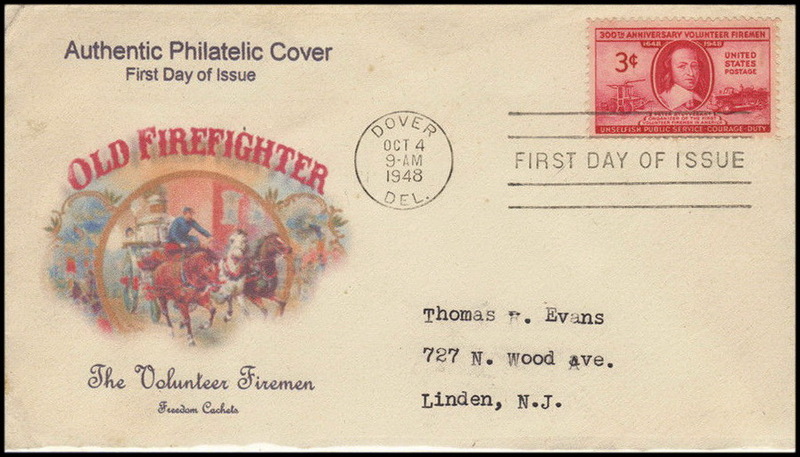 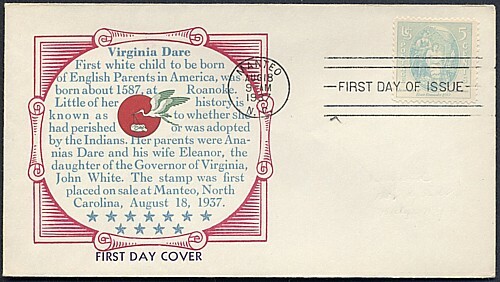 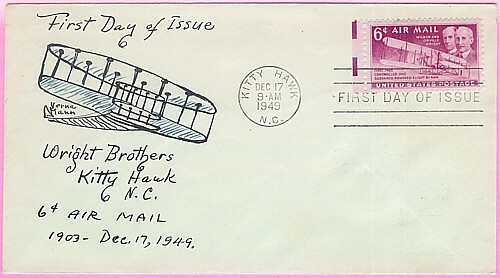 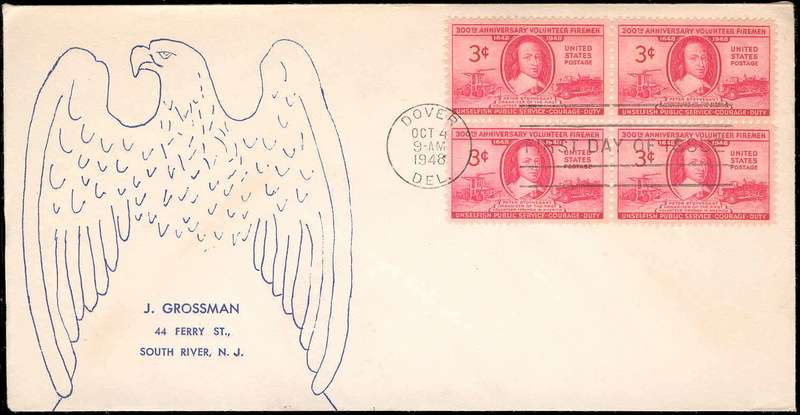 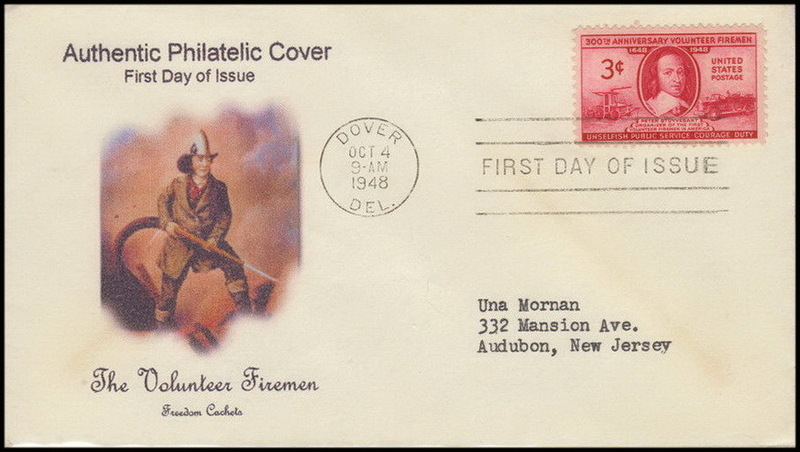 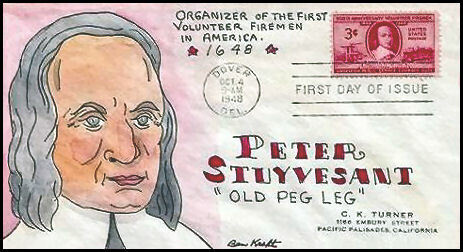 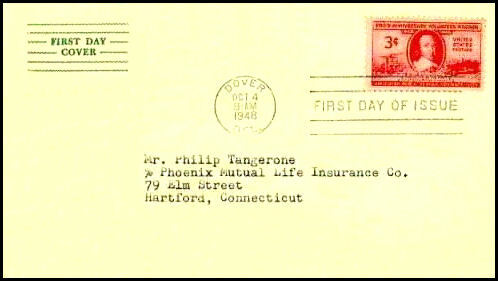 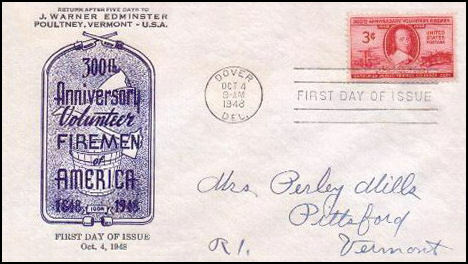 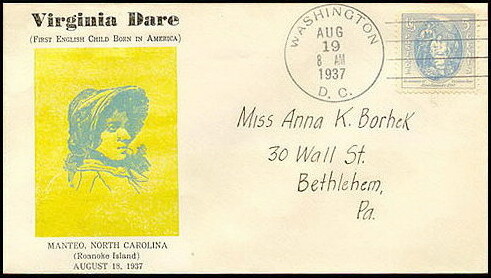 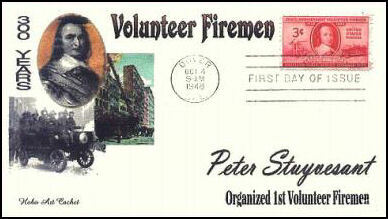 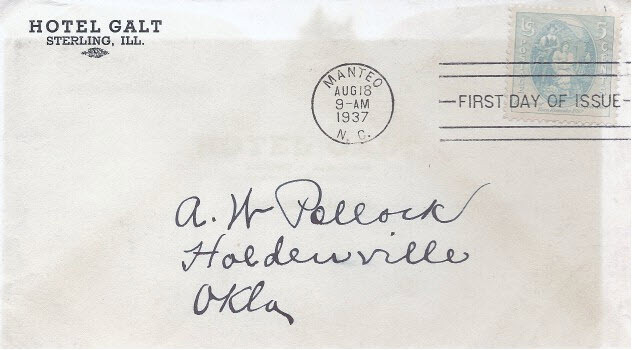 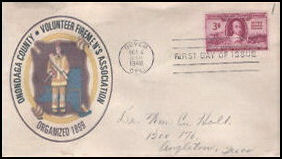 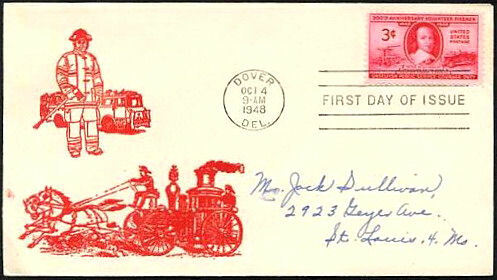 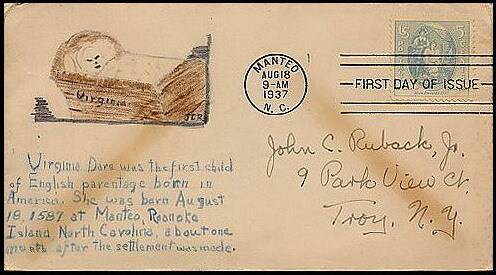 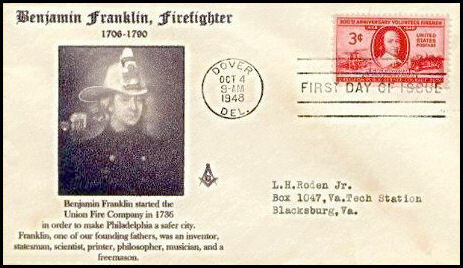 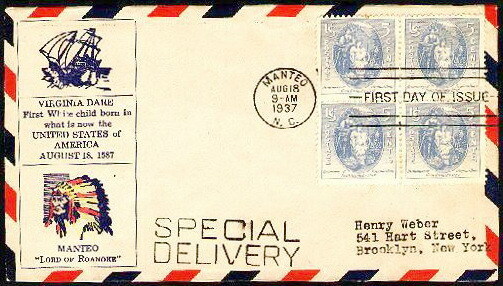 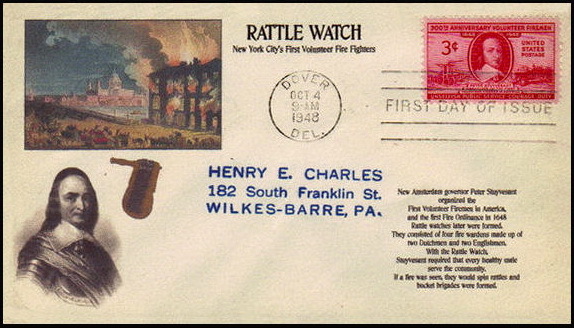 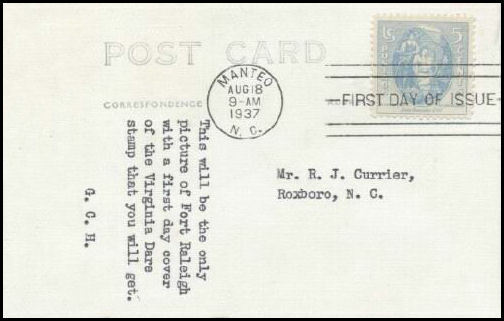 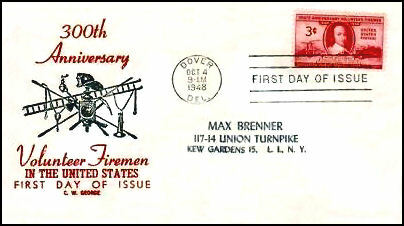 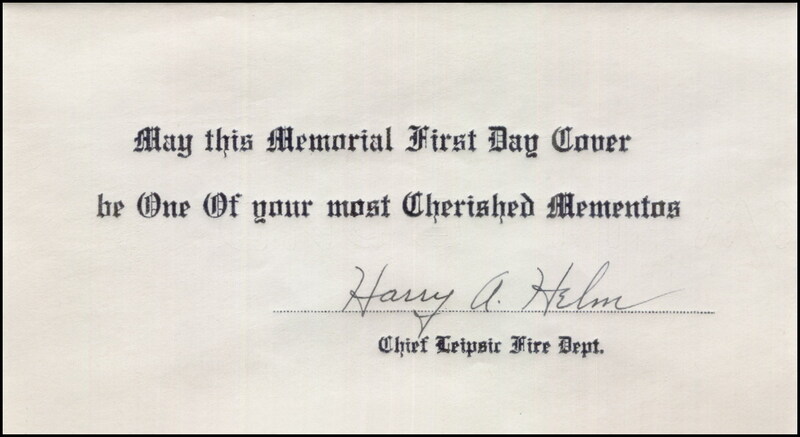 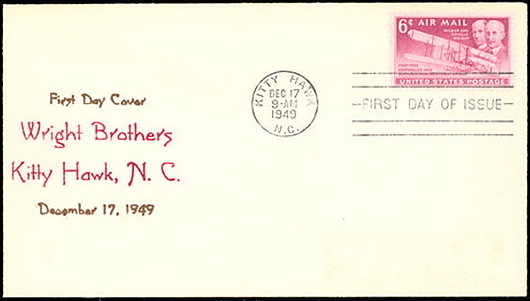 UNK14; Simple line box with text and two rubberstampd 'First Day Cover' marks; Addressed to Frank L. Pars of Brooklyn, NY; May or may not be the producer. 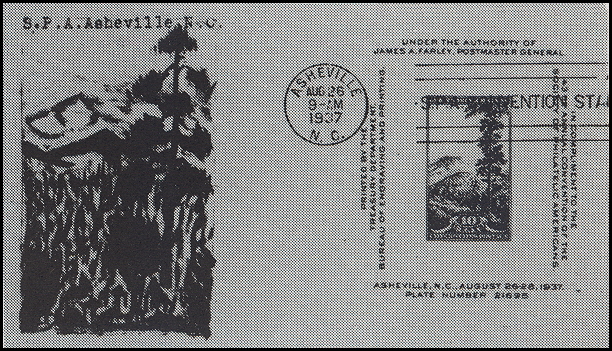 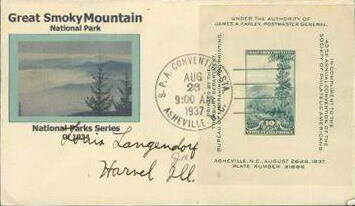 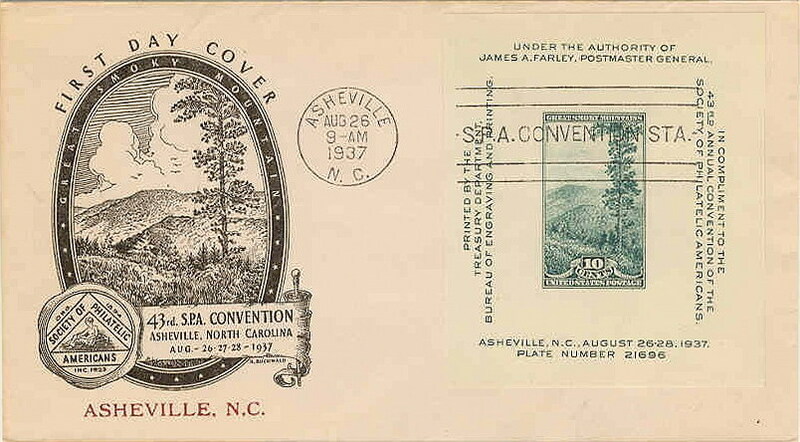 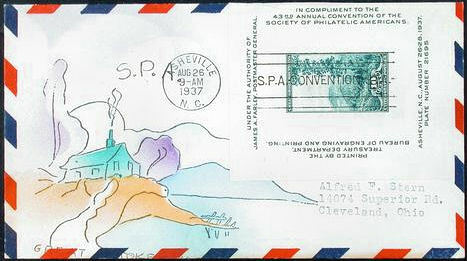 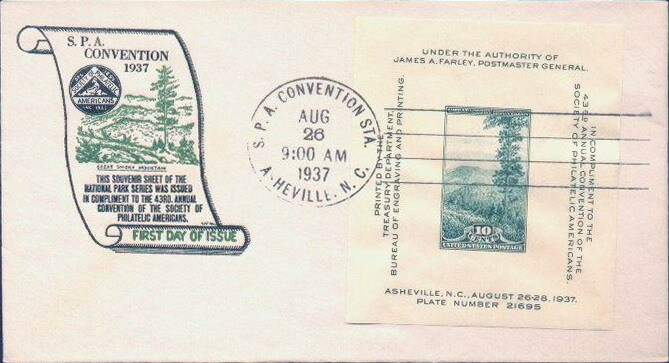 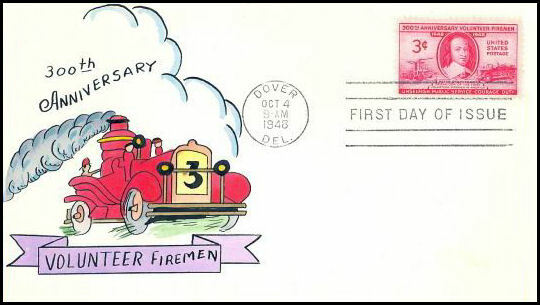 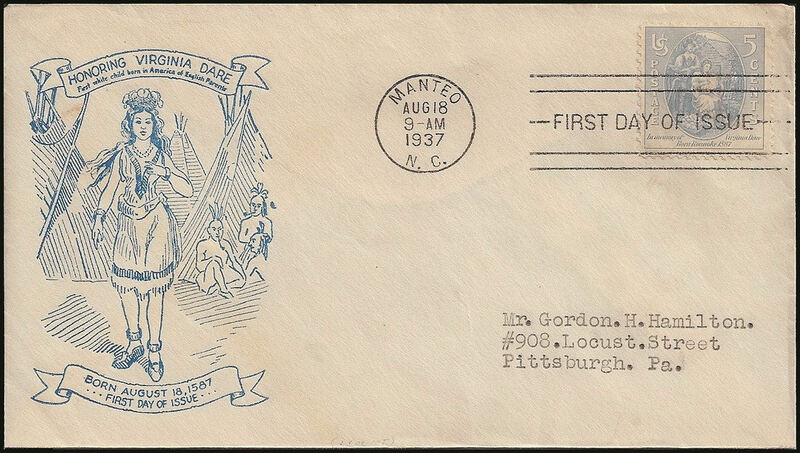 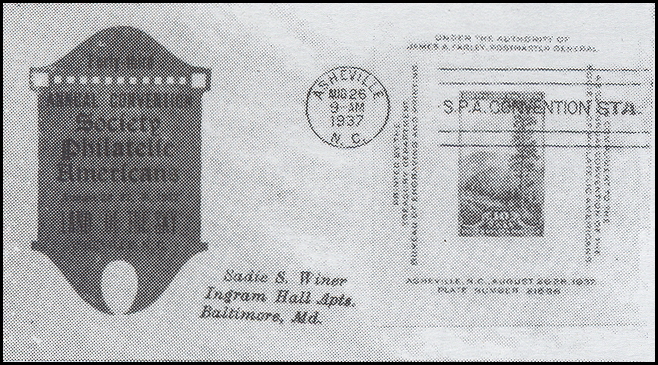 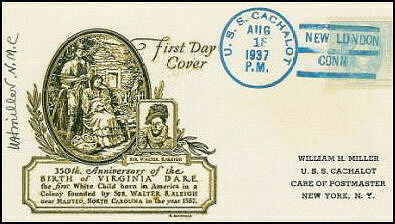 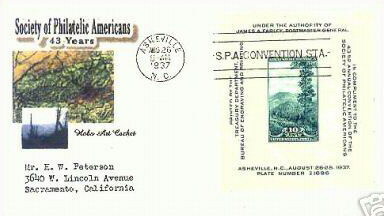 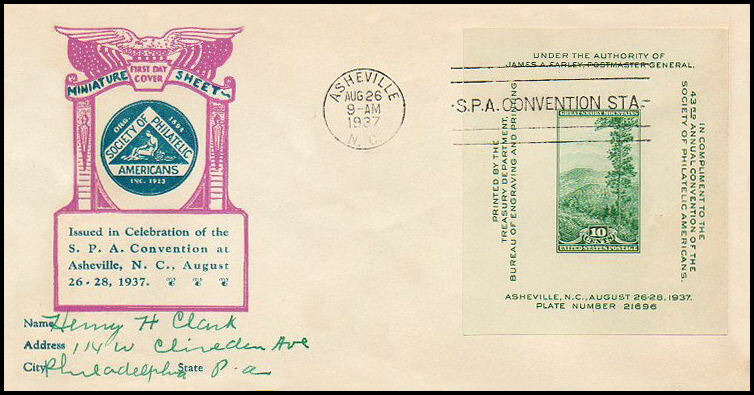 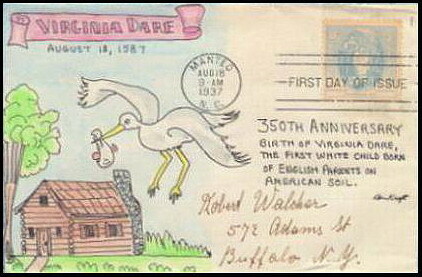 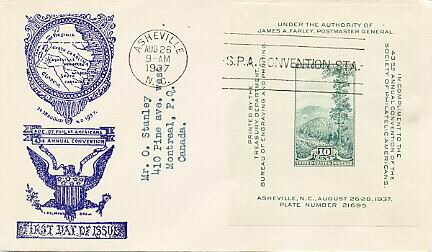 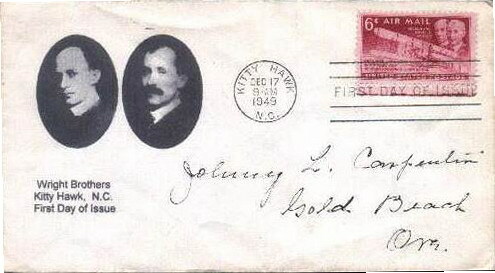 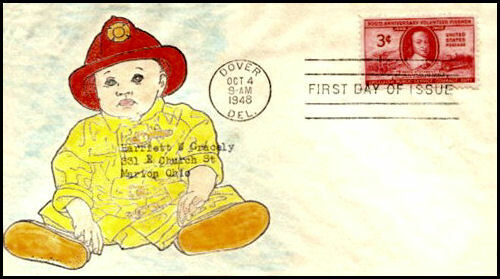 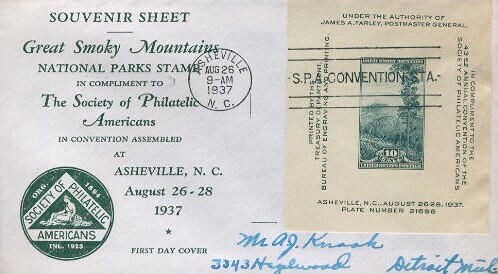 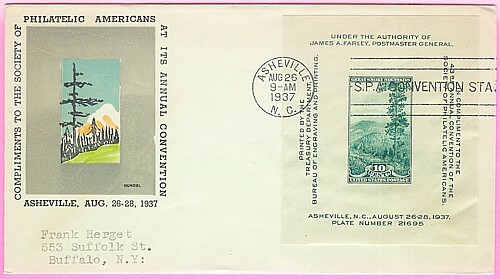 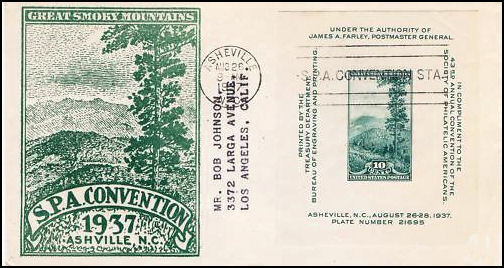 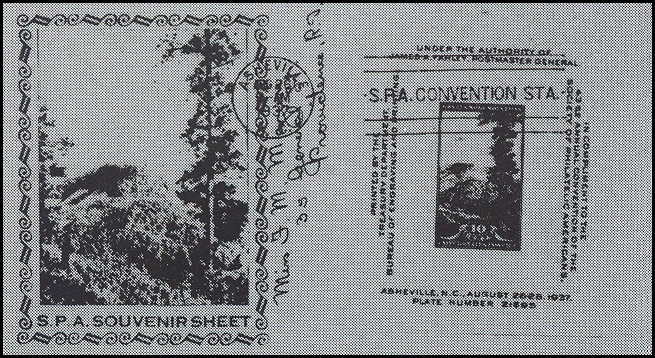 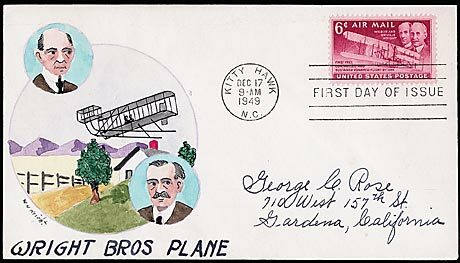 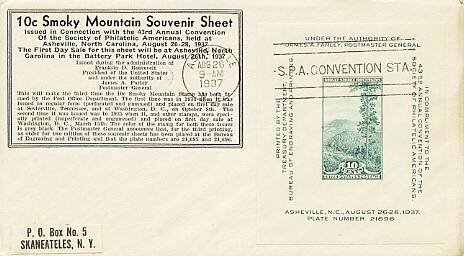 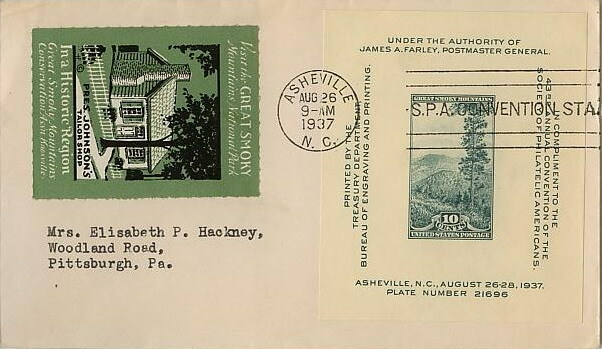 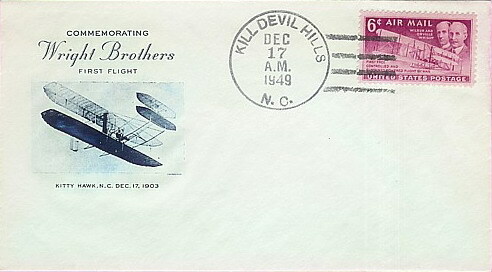 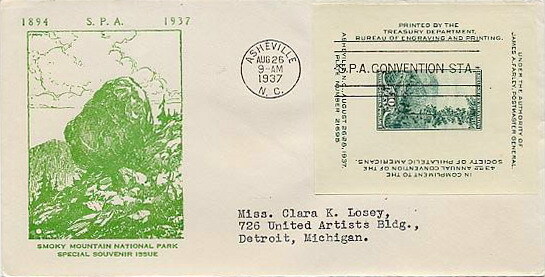 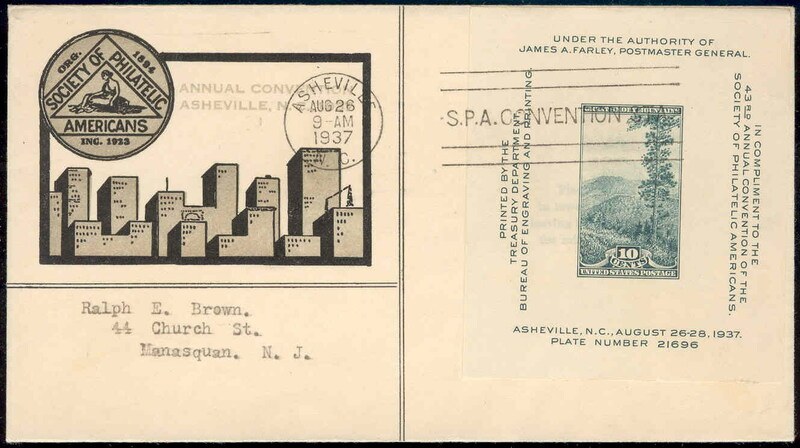 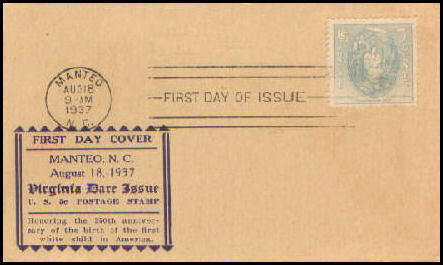 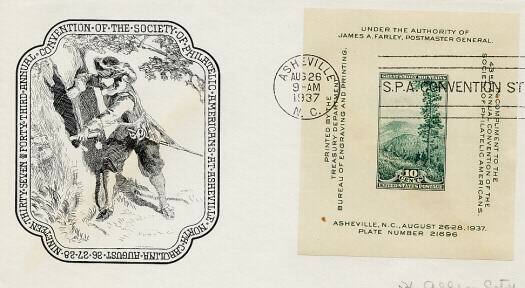 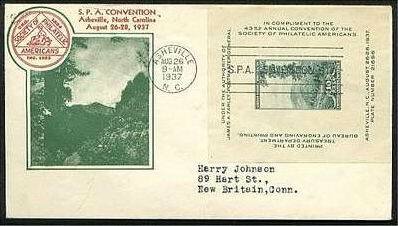 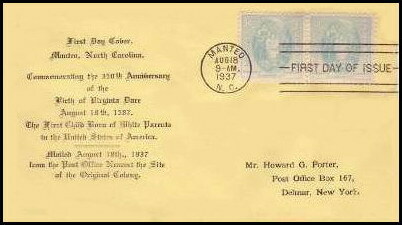 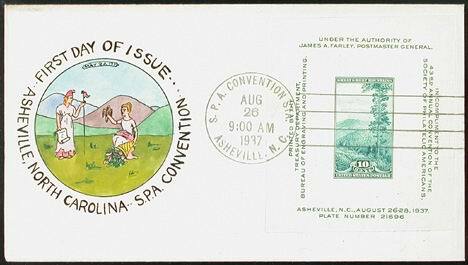 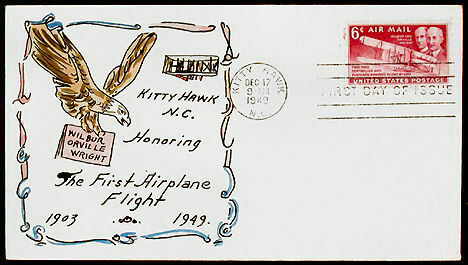 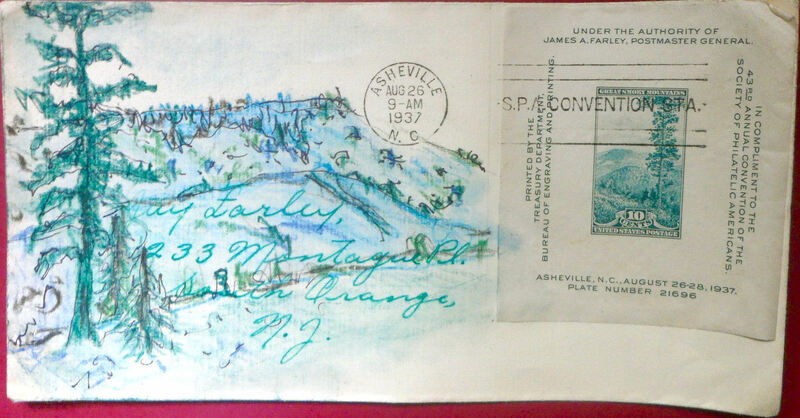 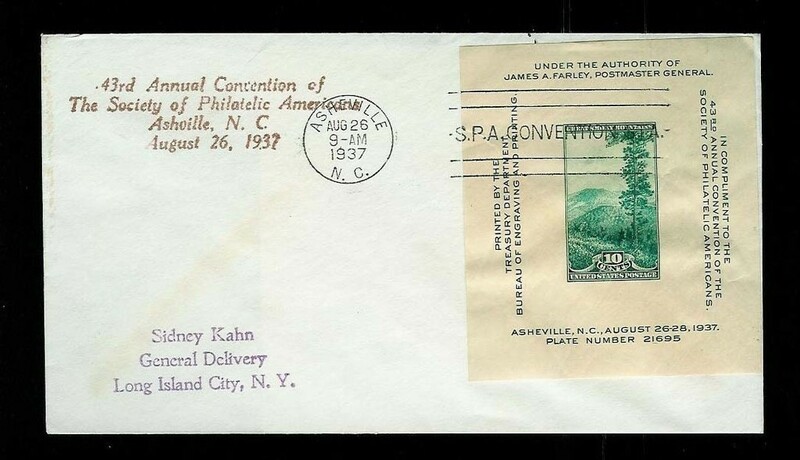 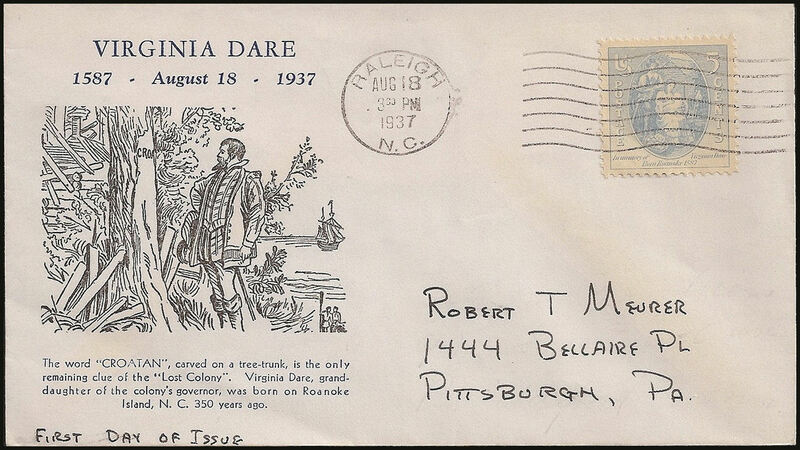 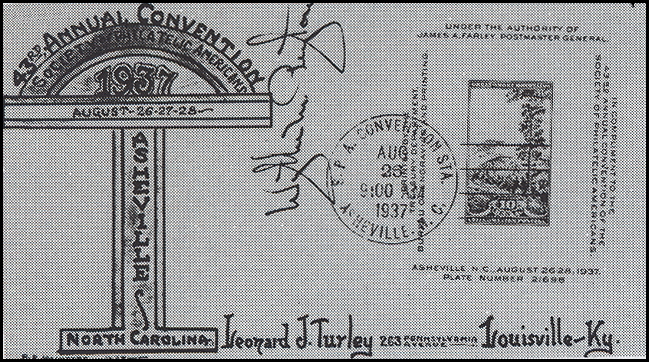 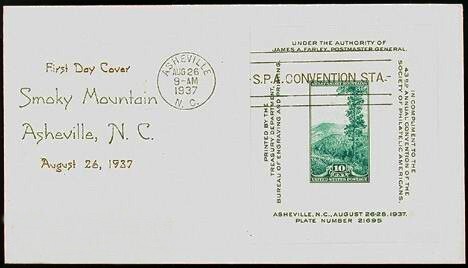 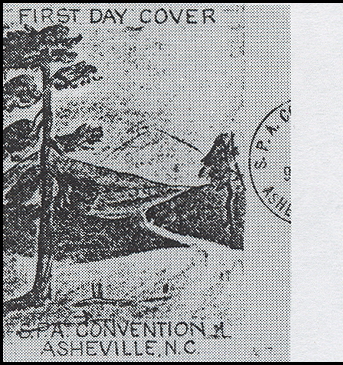 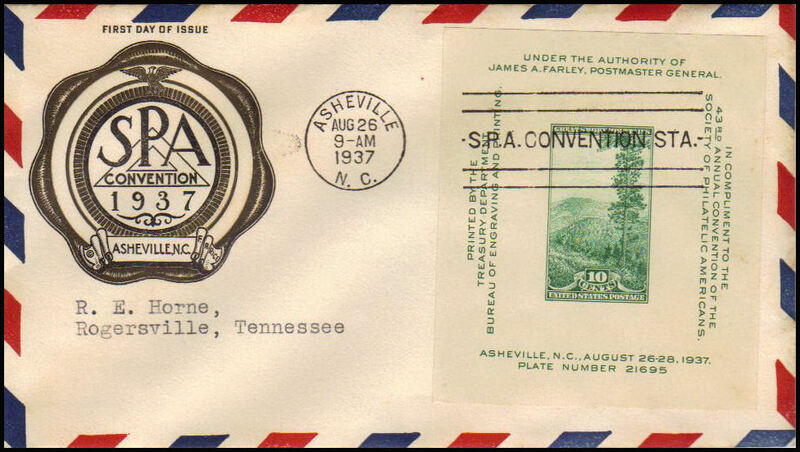 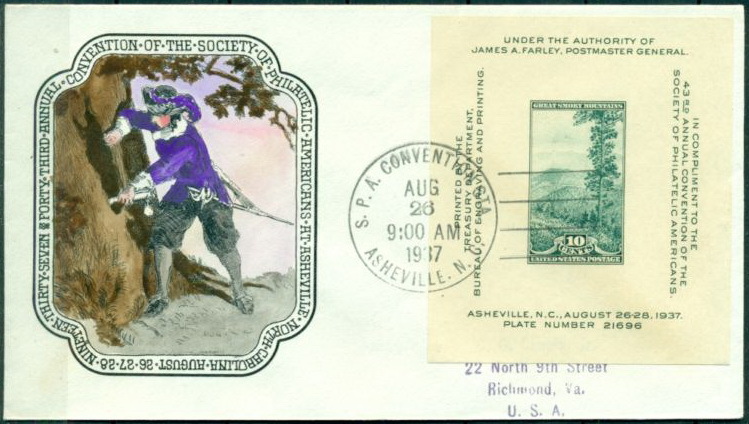 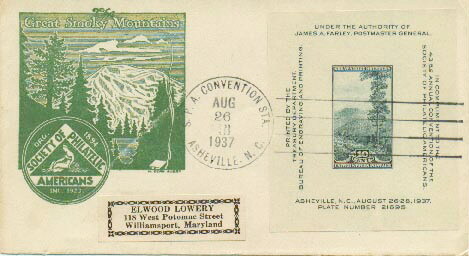 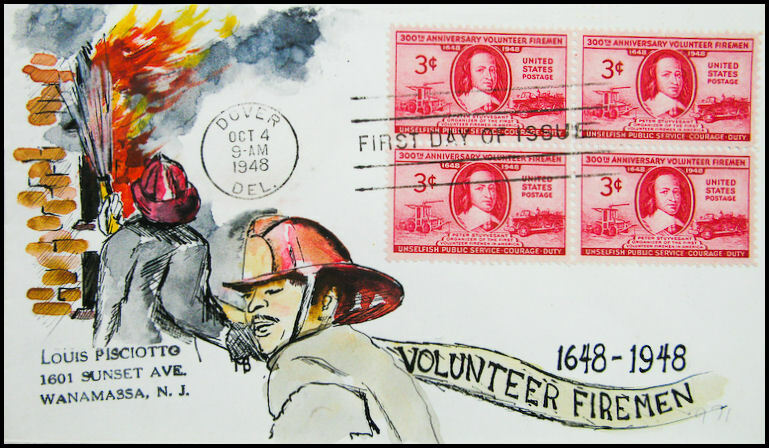 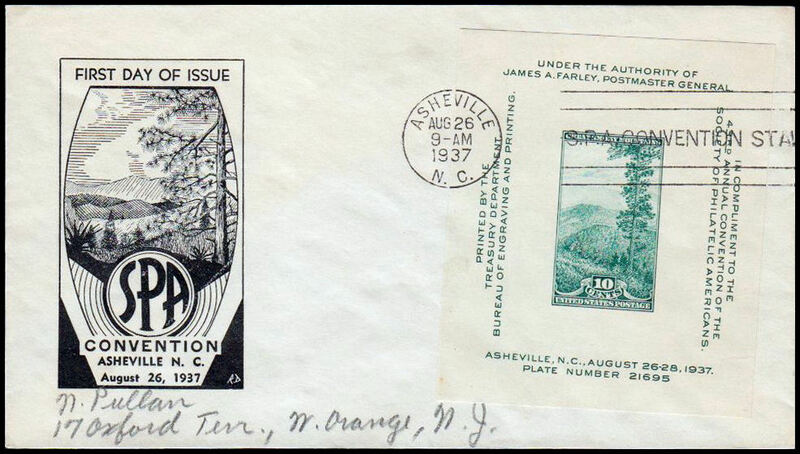 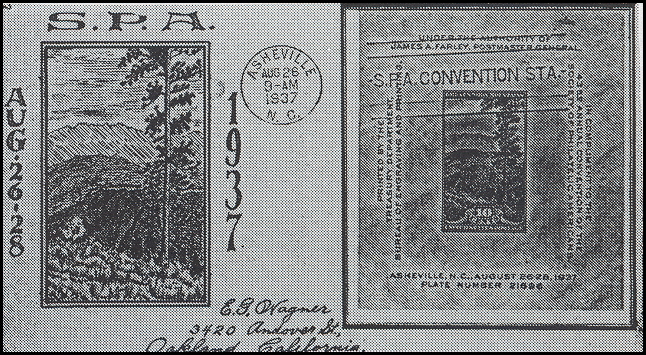 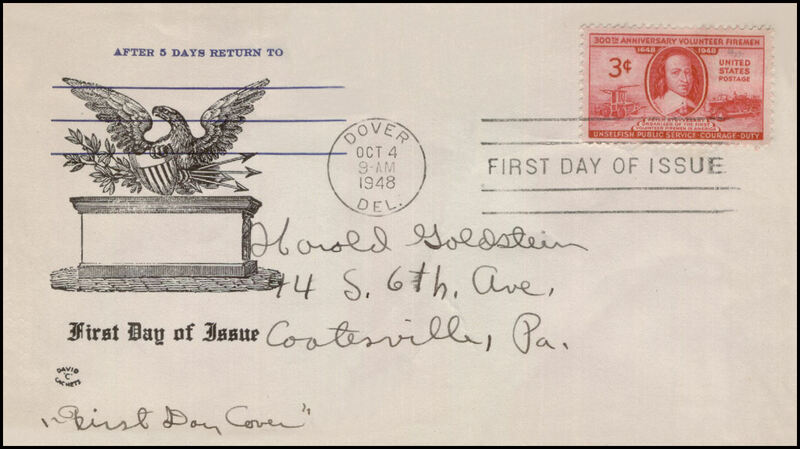 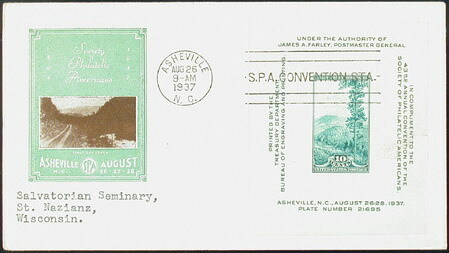 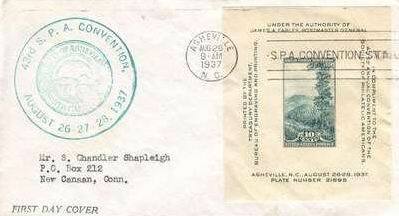 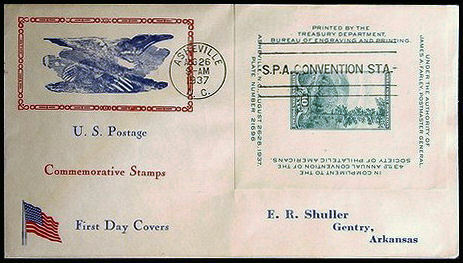 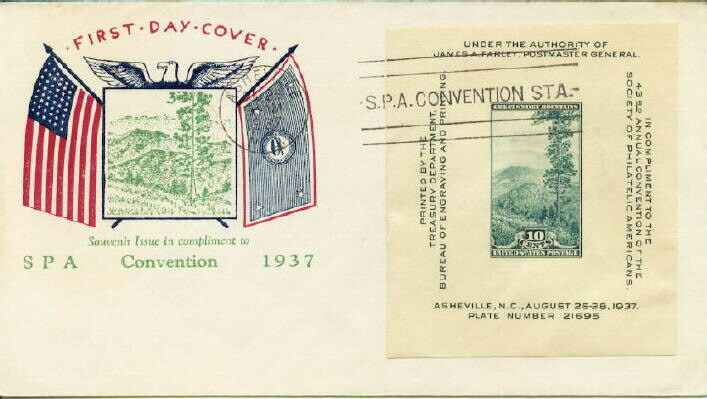 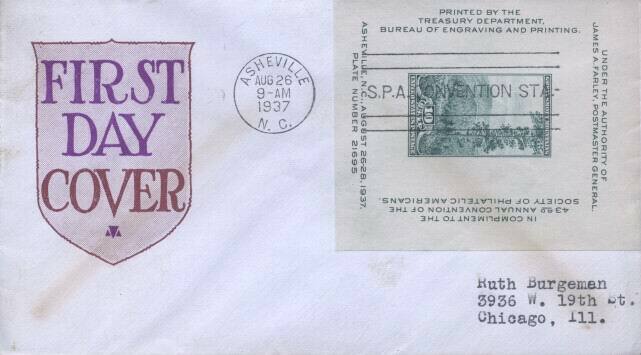 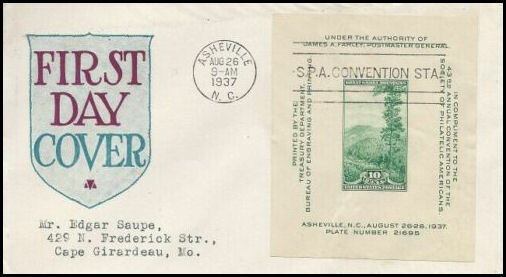 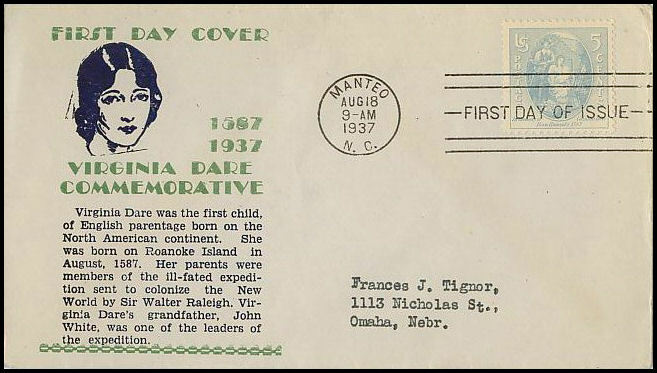 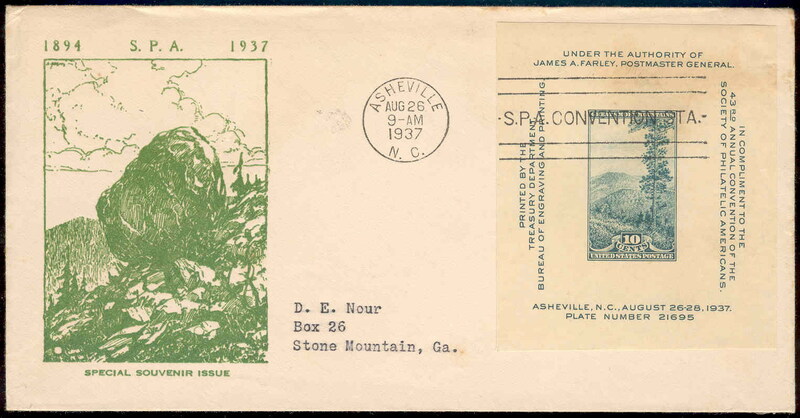 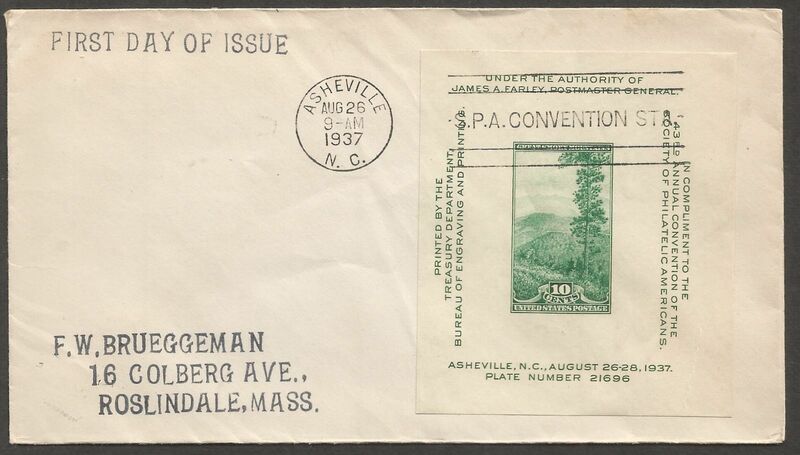 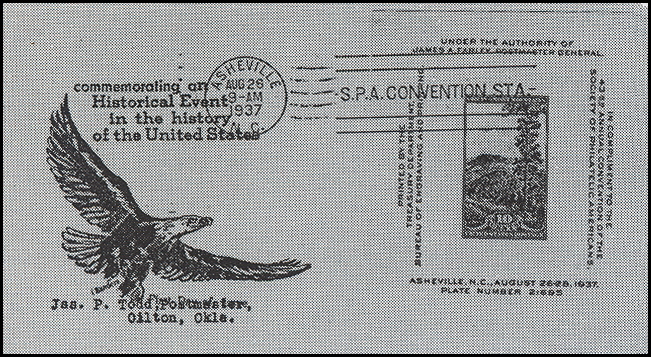 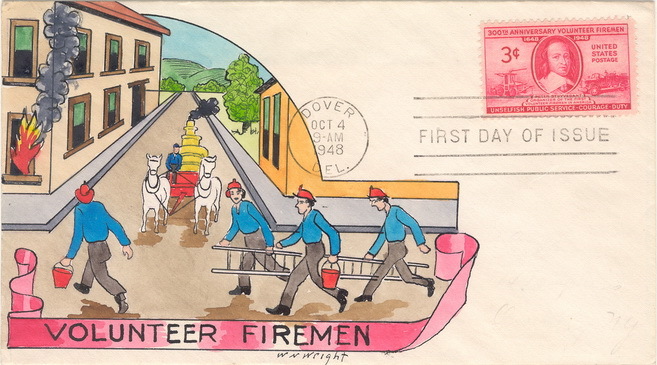 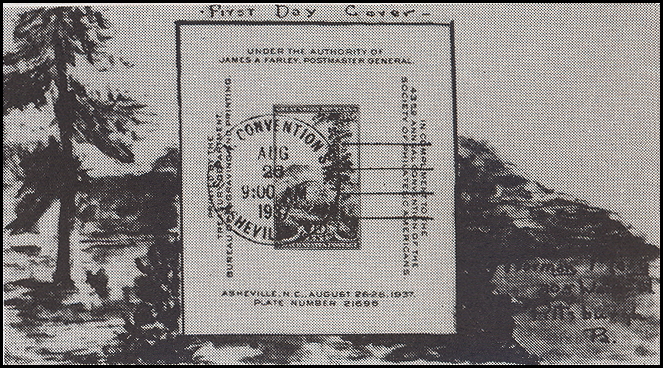 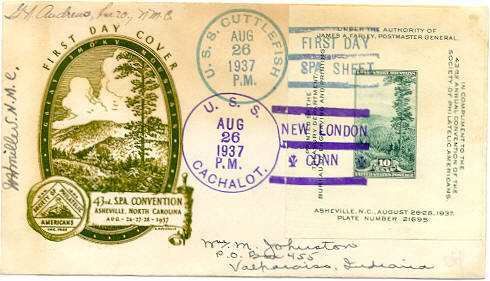 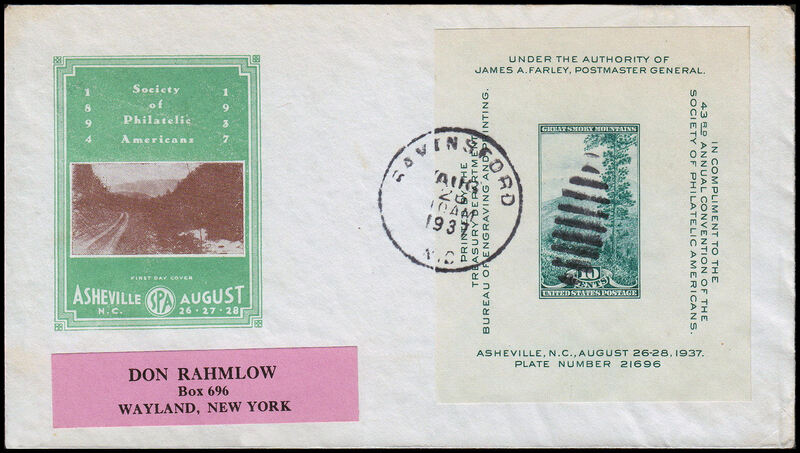 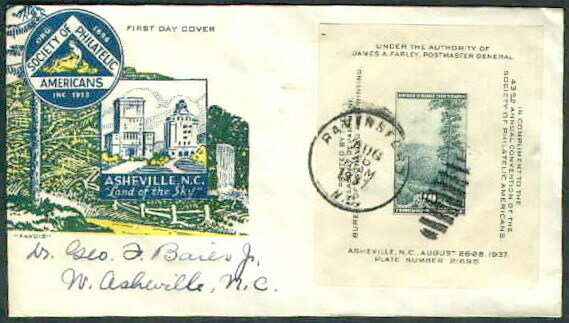 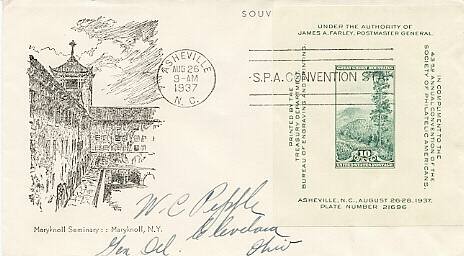 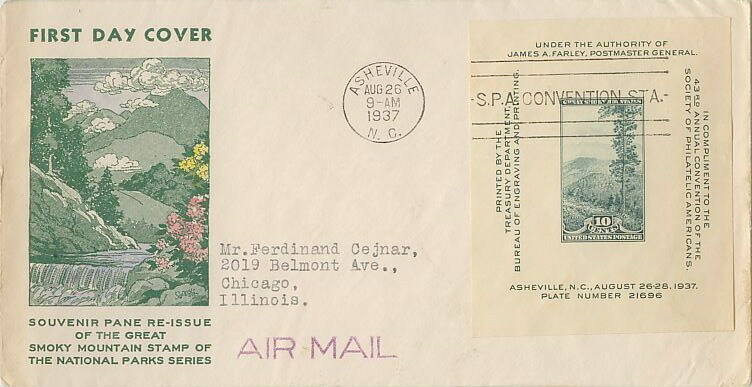 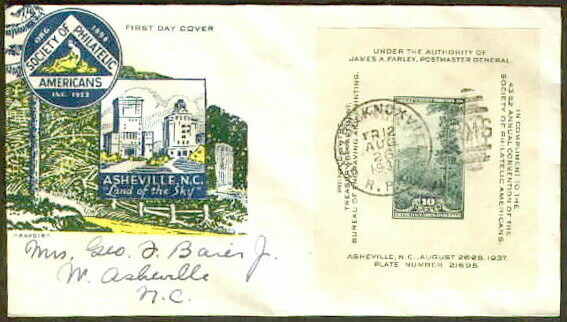 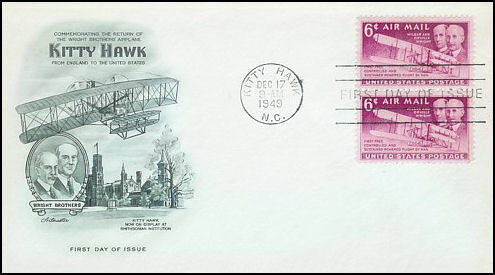 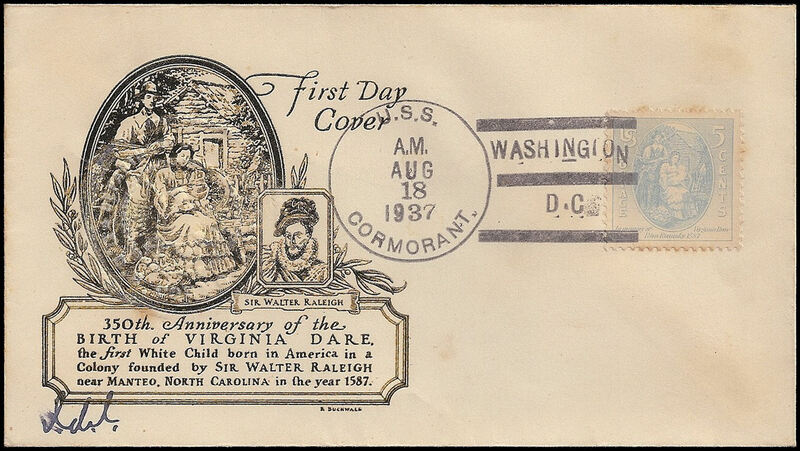 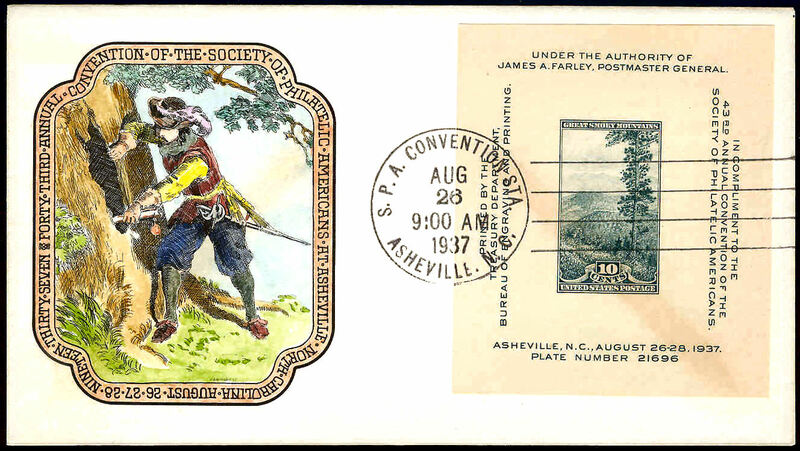 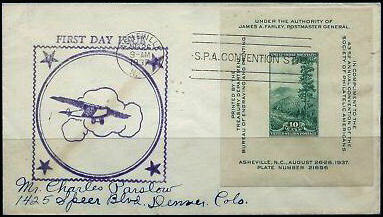 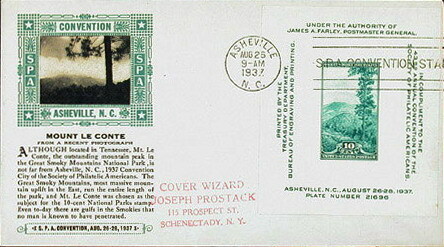 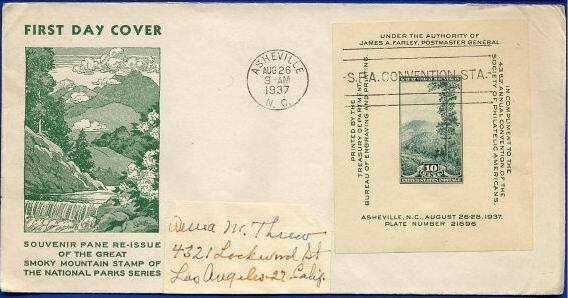 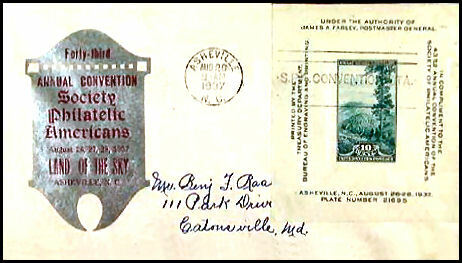 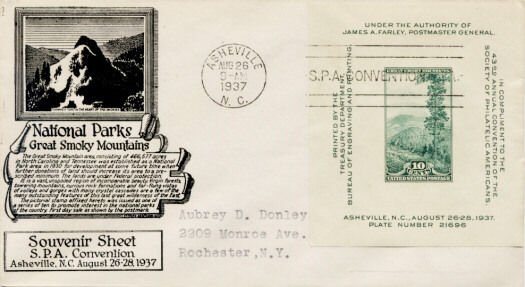 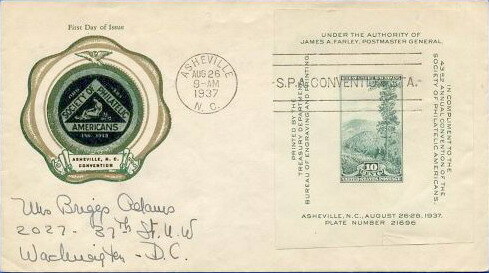 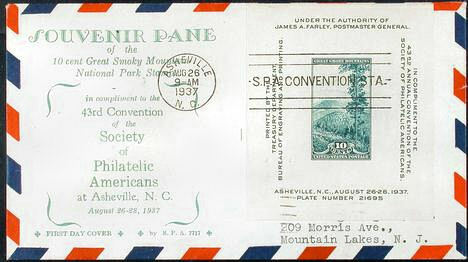 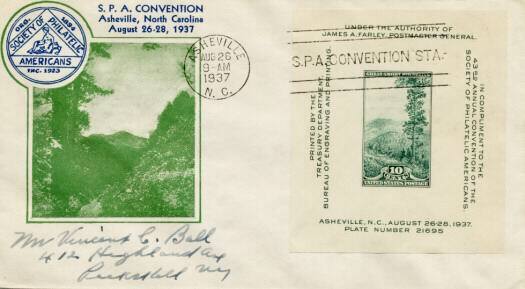 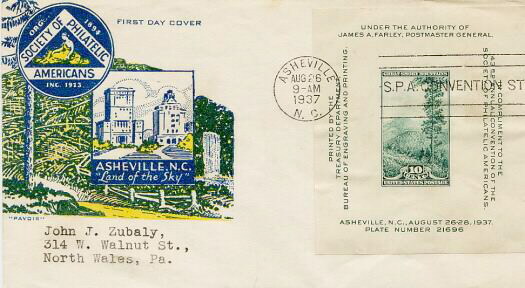 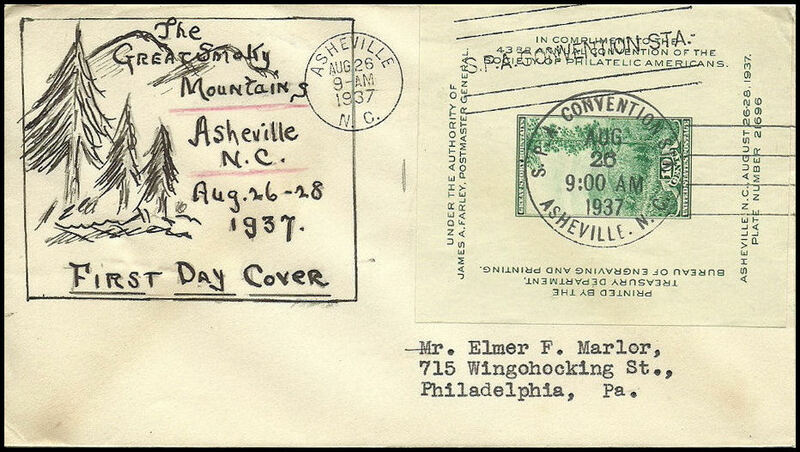 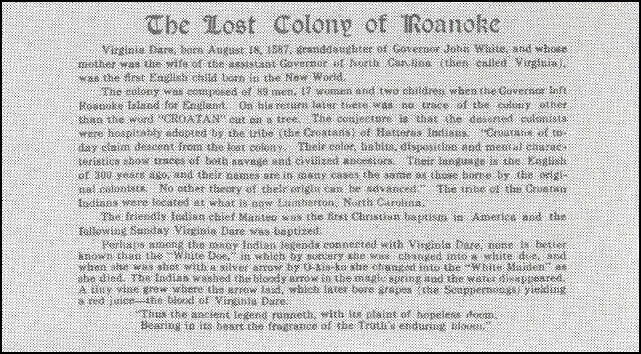 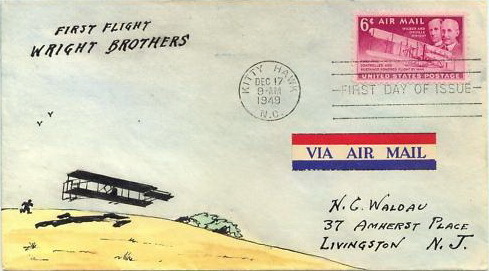 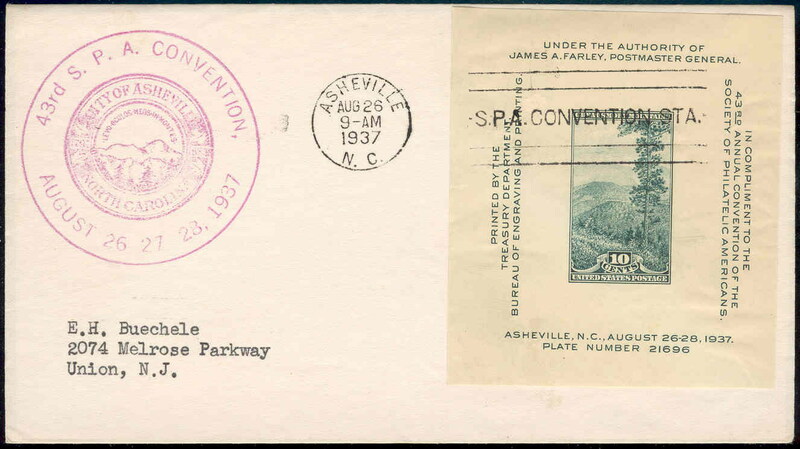 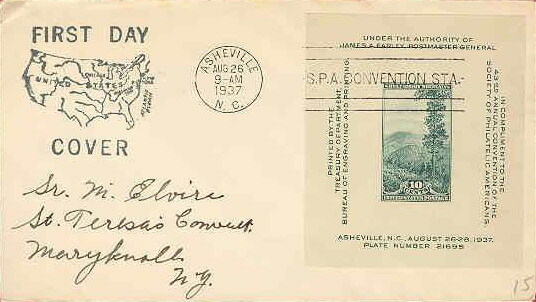 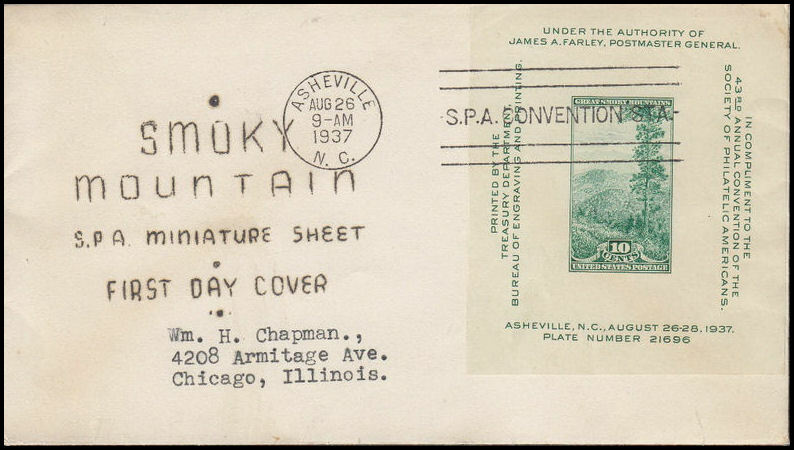 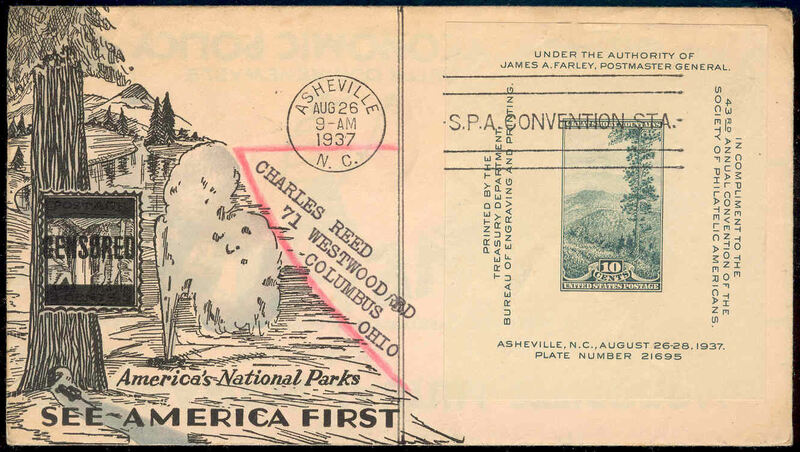 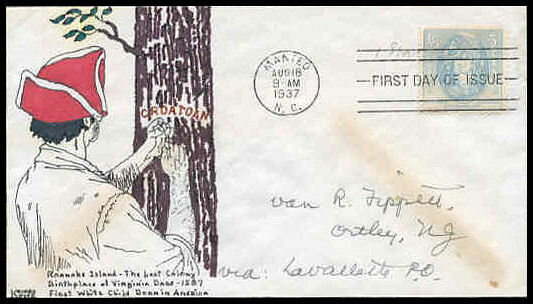 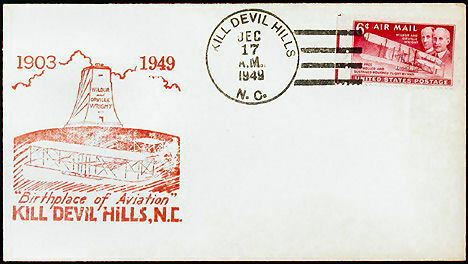 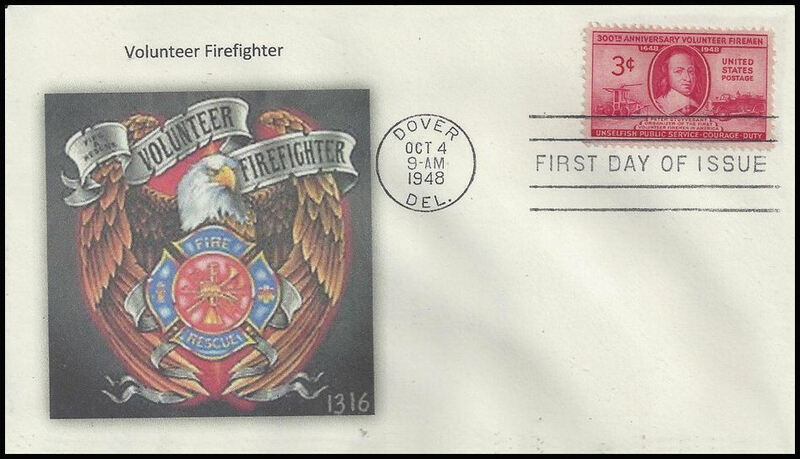 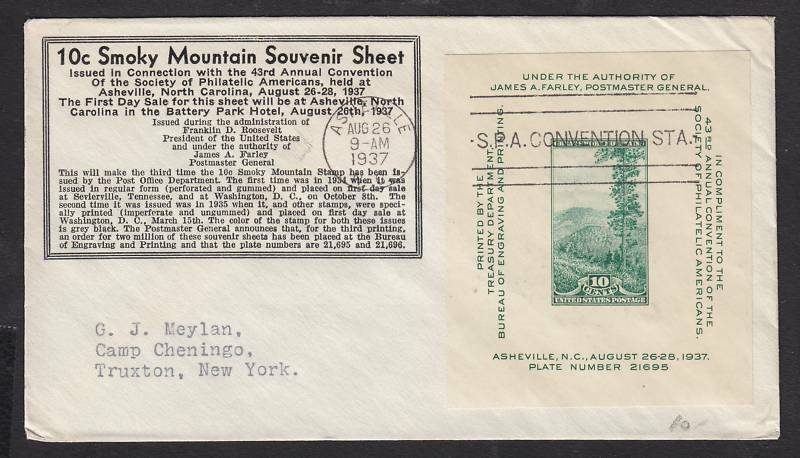 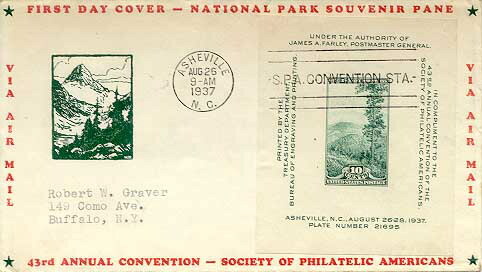 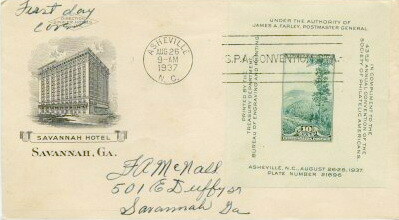 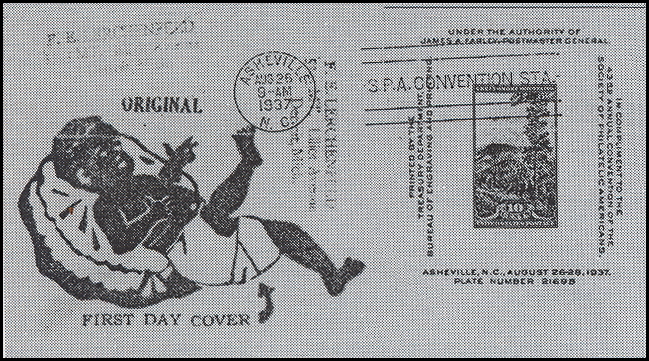 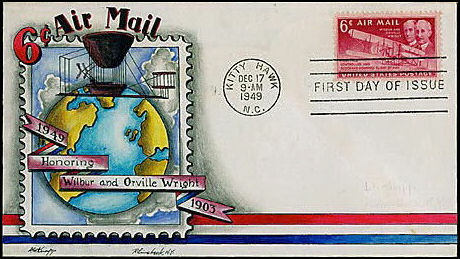 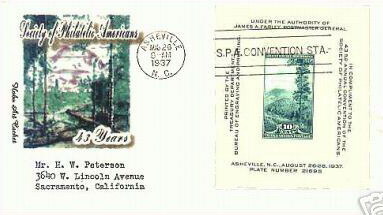 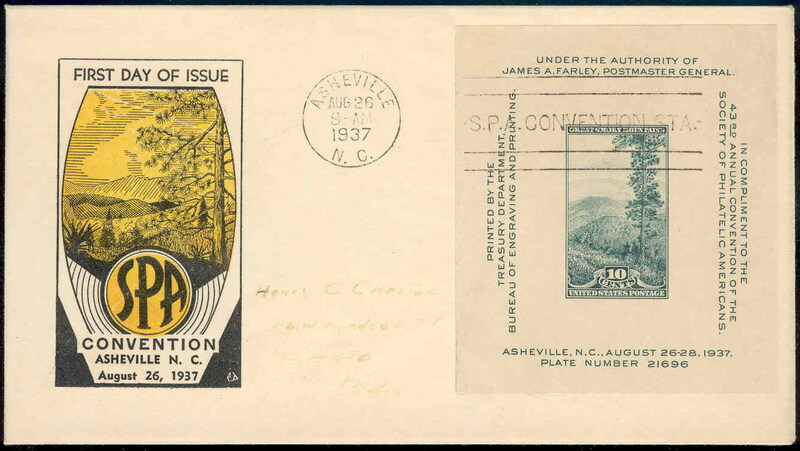 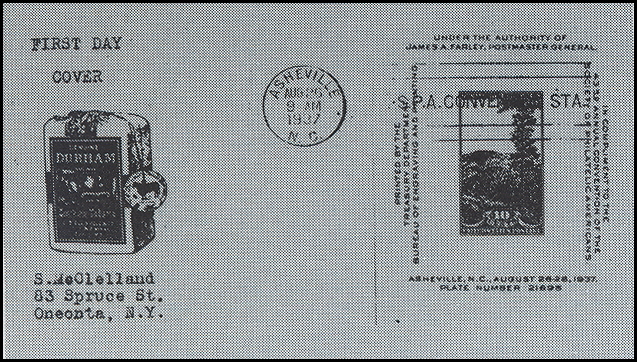 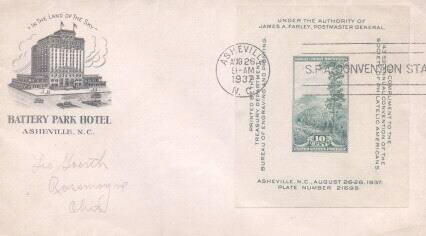 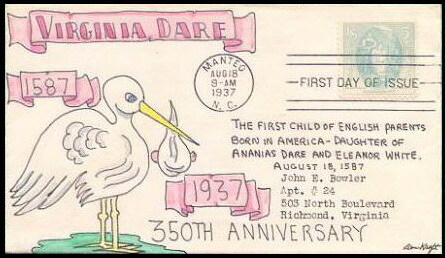 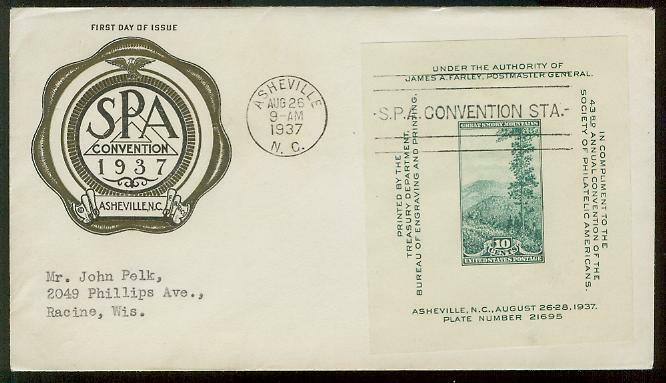 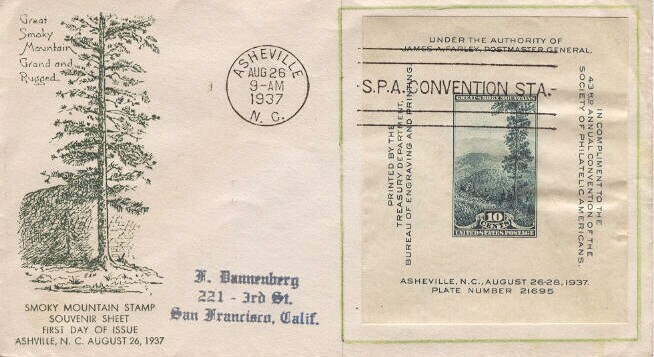 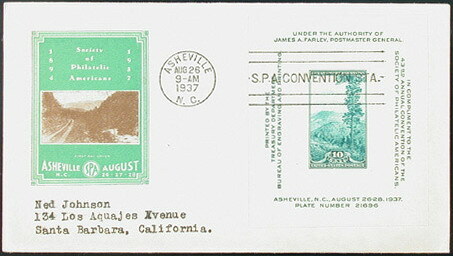 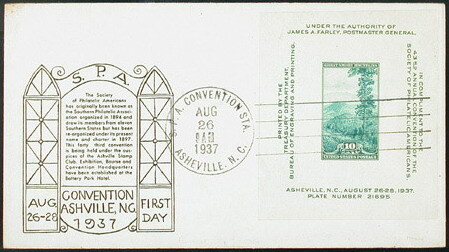 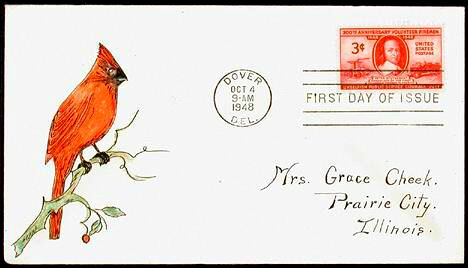 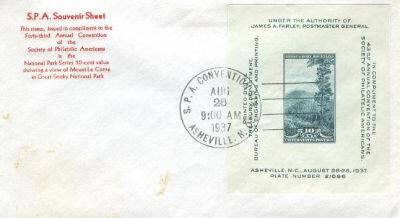 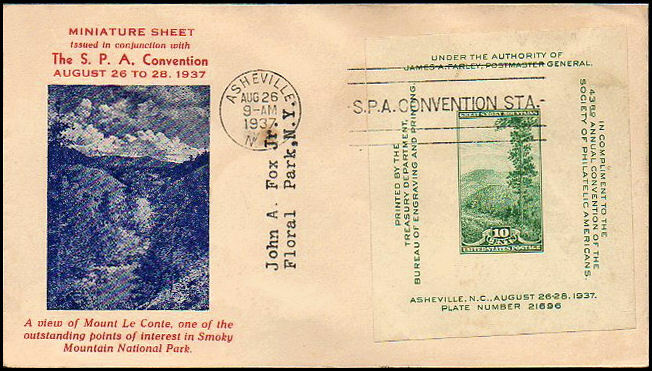 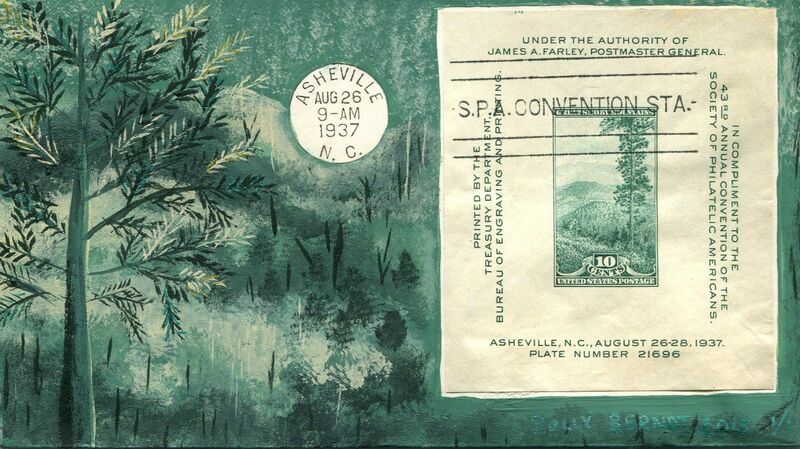 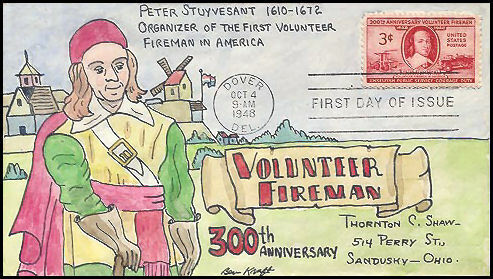 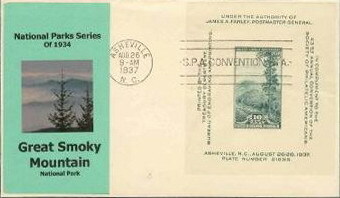 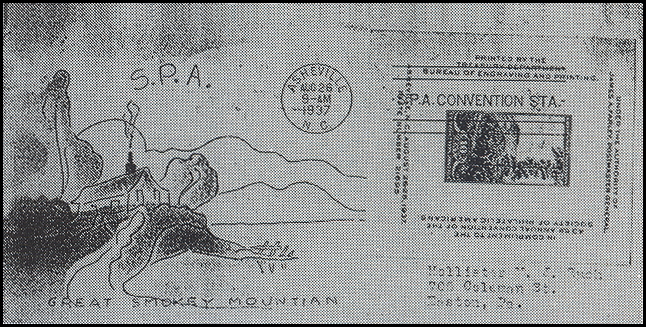 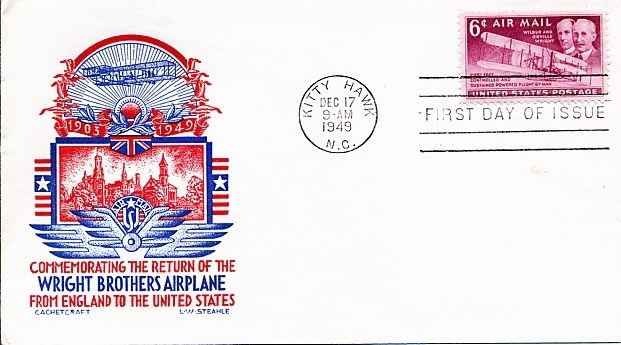 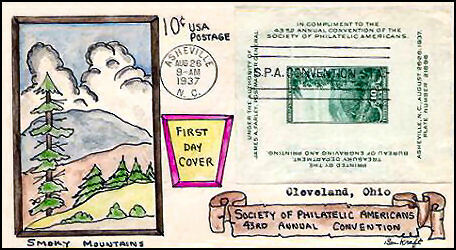 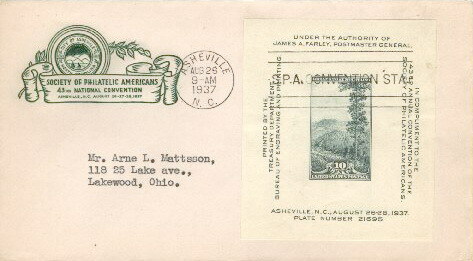 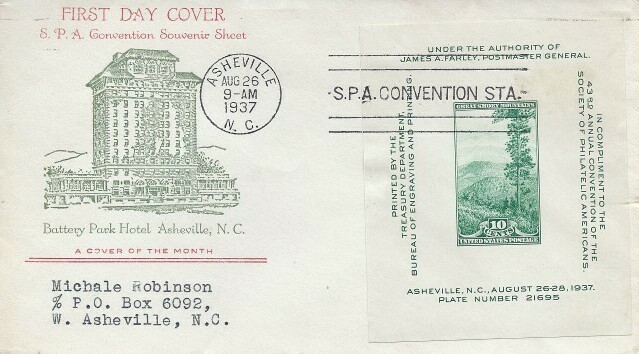 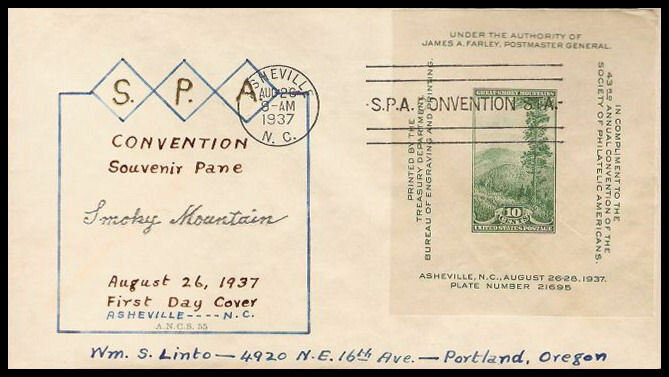 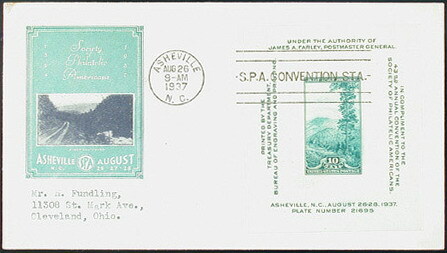 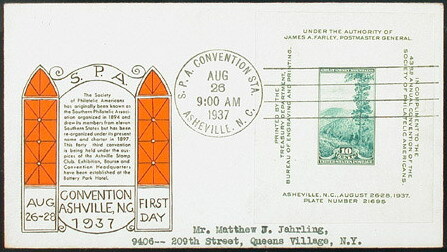 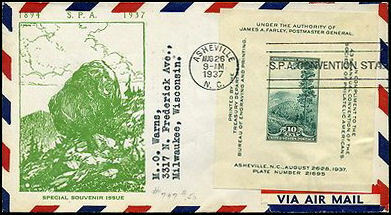 blue silver, "Land of the Sky Asheville, NC"
DSC: Laird, Eugene Clarence & Merwin H. H.
DSC: Compton, William H. Jr.
UNK09; 03/2011 McCusker stated "...hand drawn, hand painted cachet by Olga Goehringer on monarch cover, of the period and one of a kind. 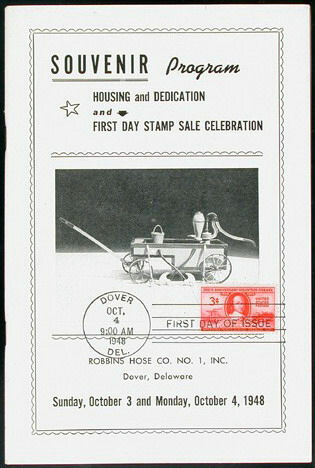 ", at an auction price of $125. 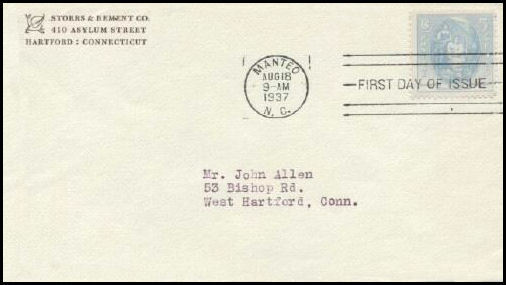 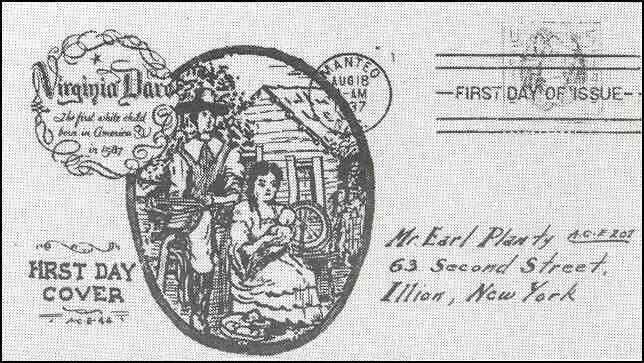 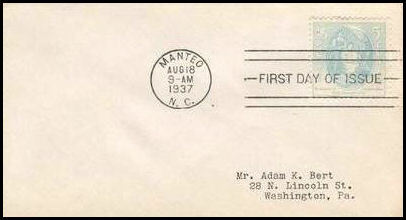 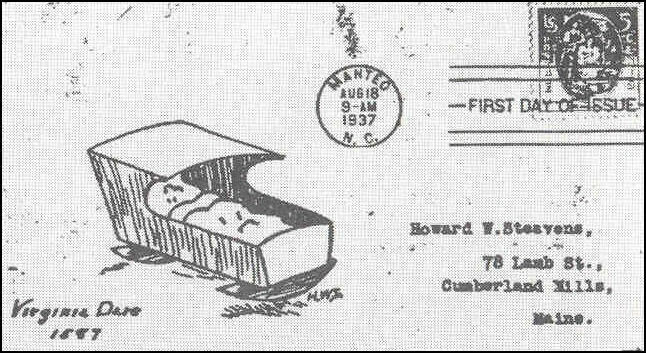 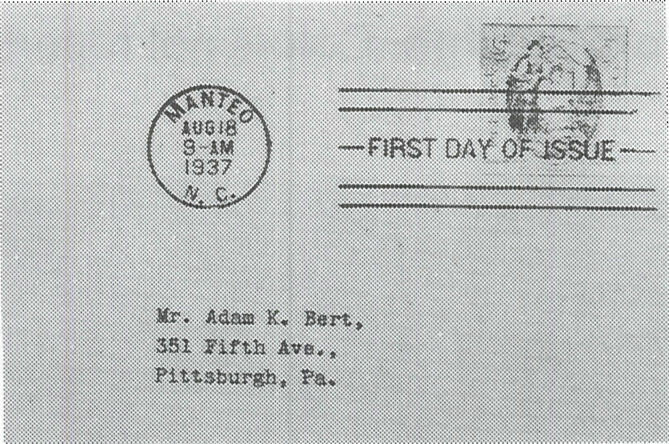 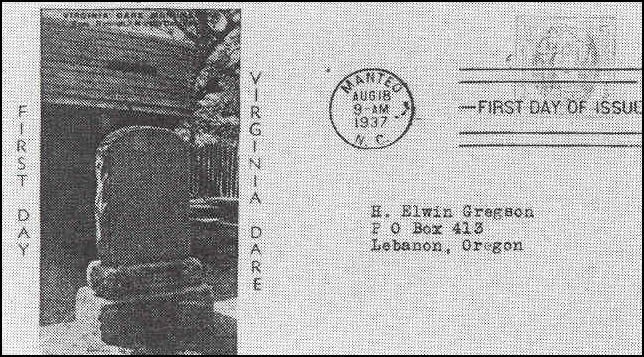 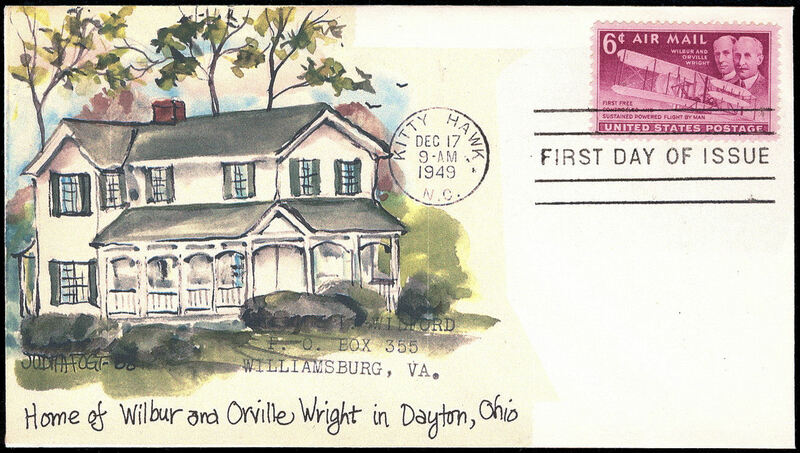 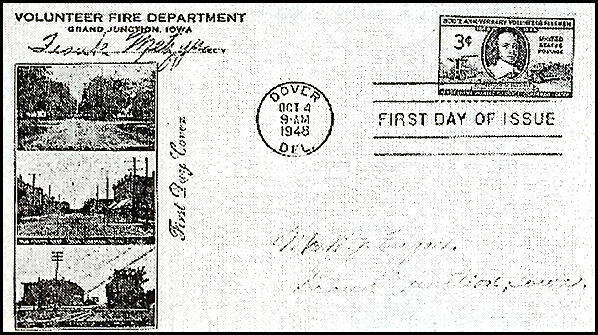 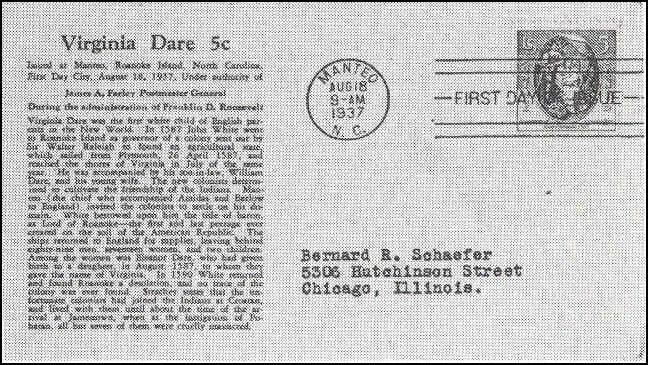 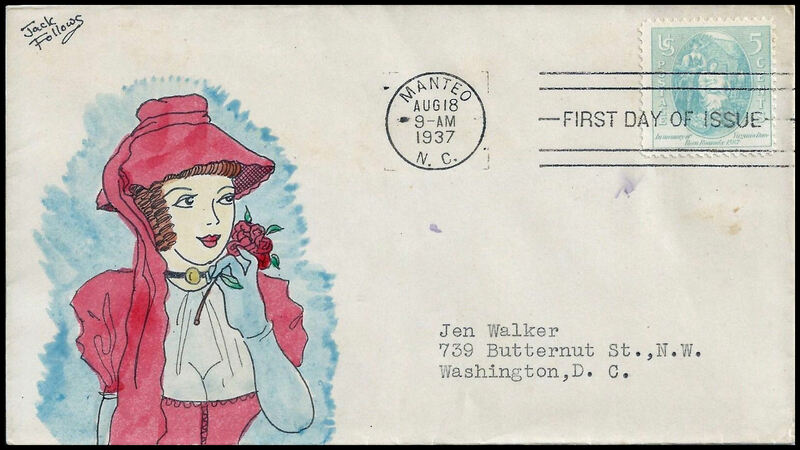 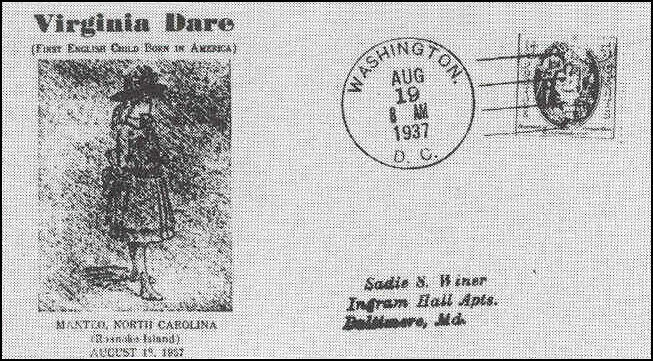 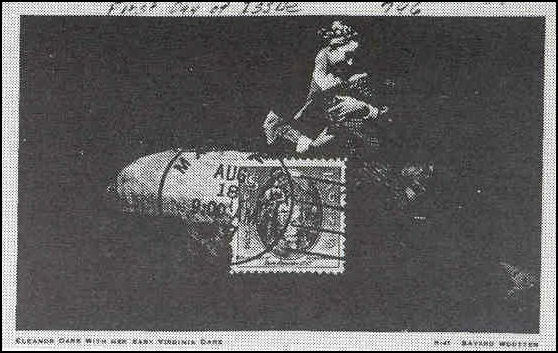 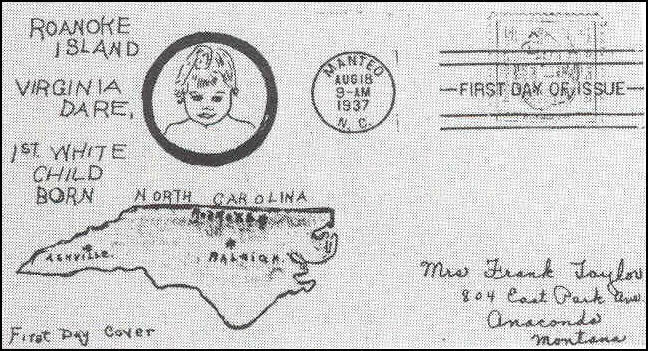 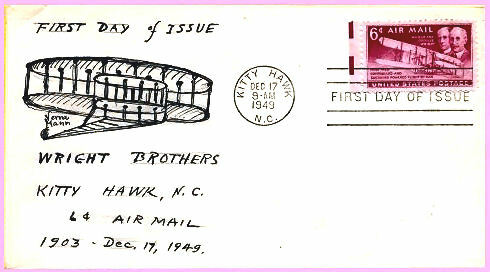 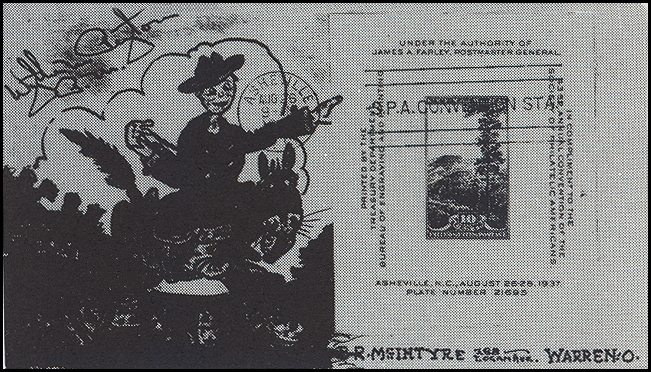 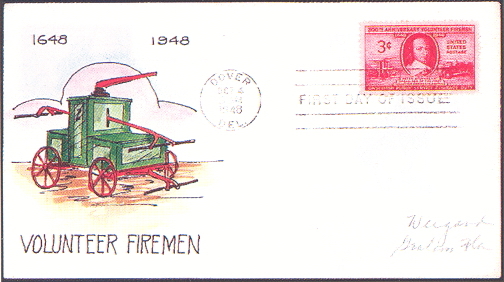 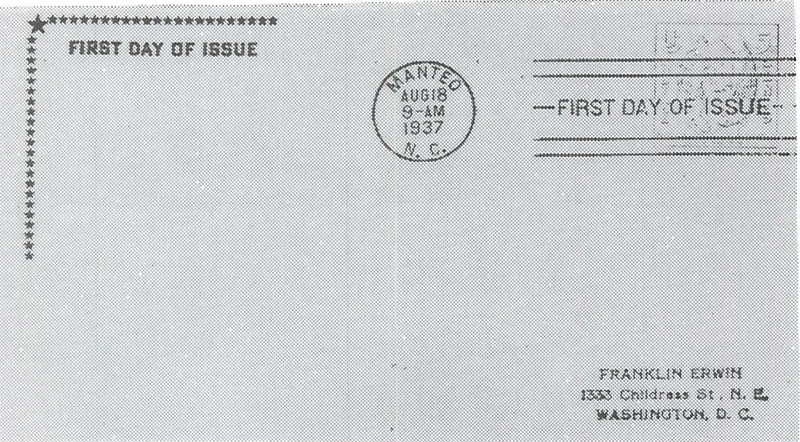 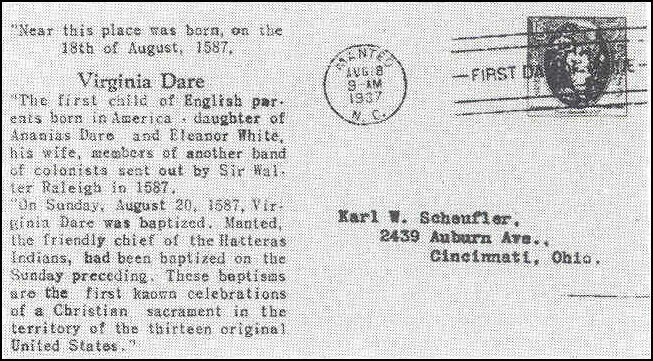 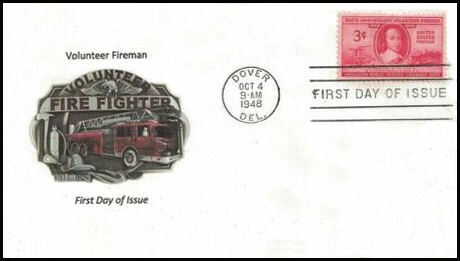 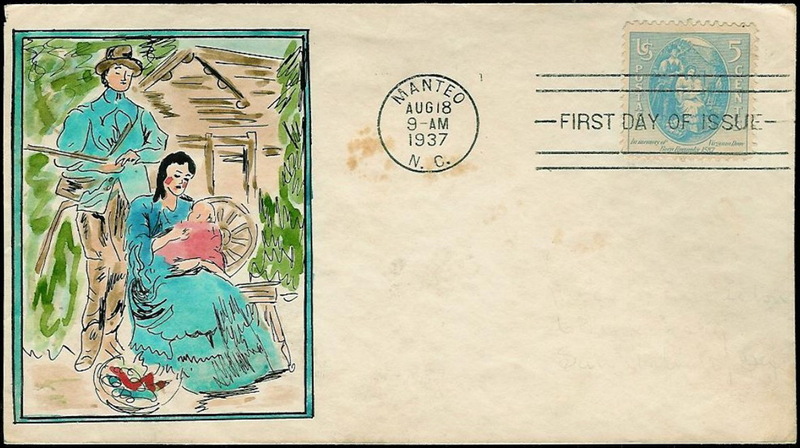 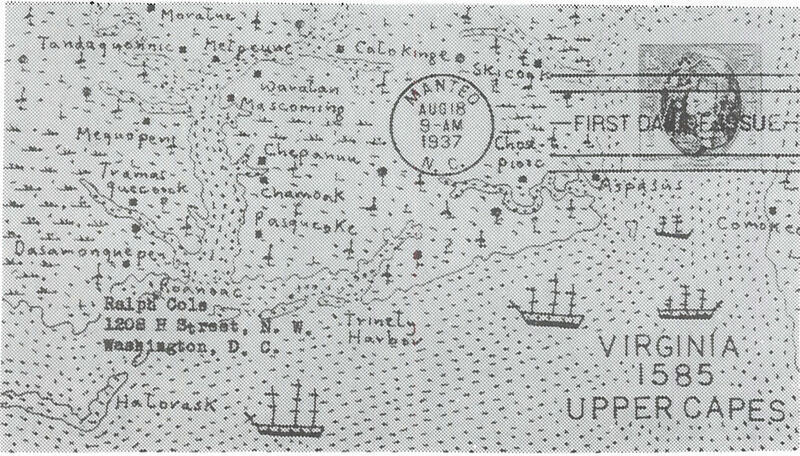 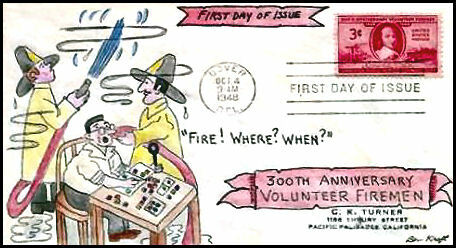 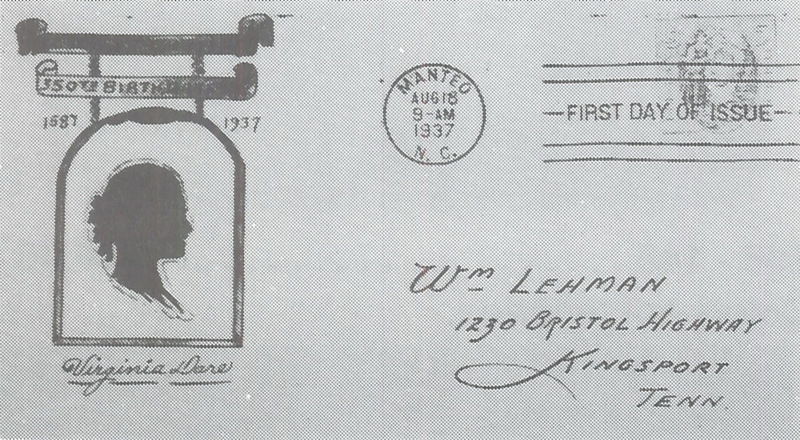 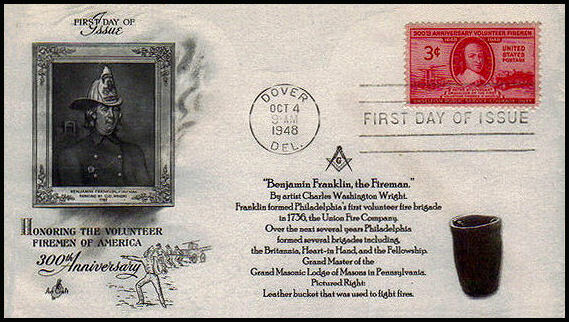 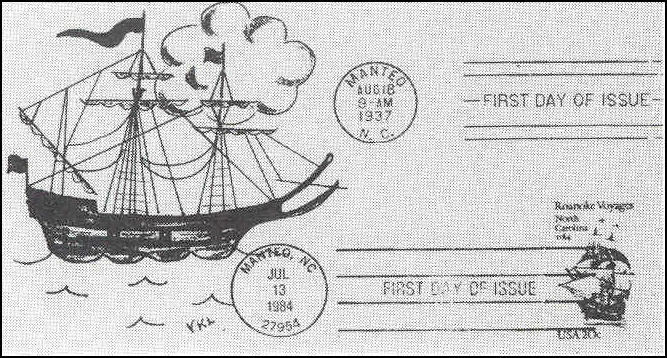 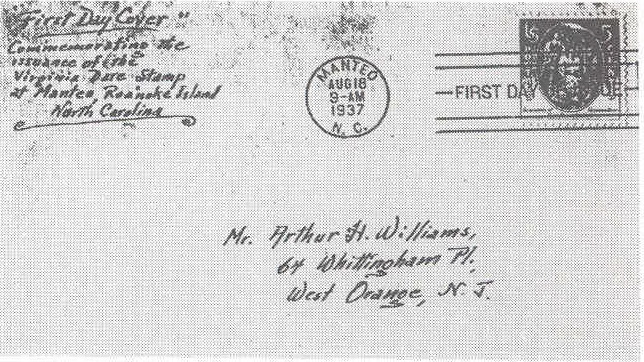 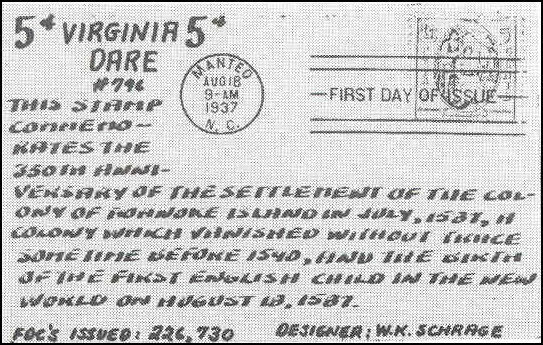 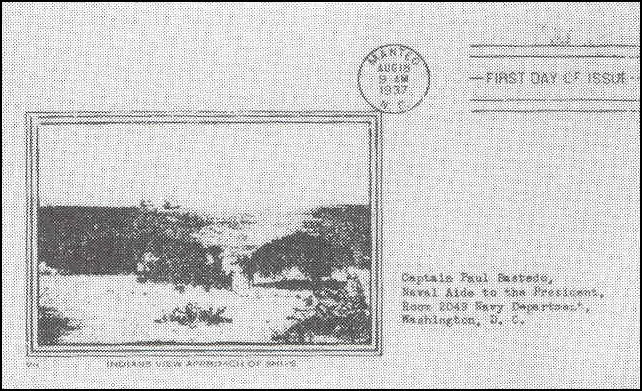 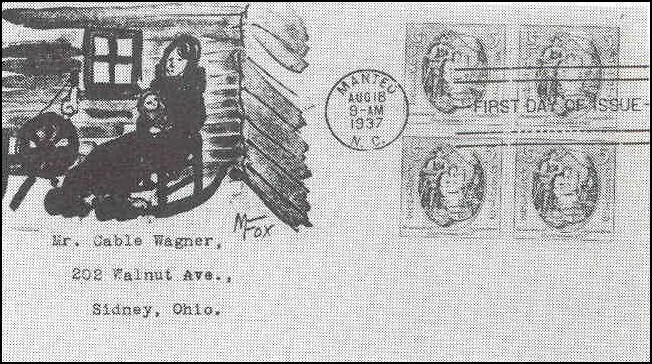 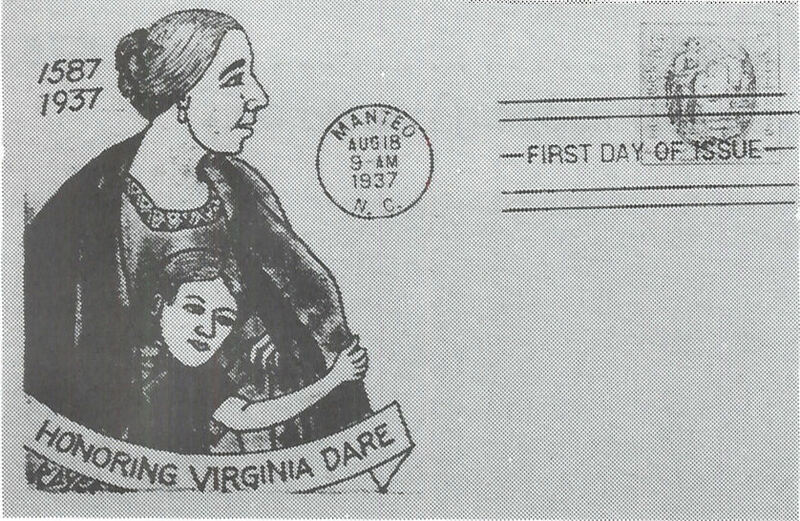 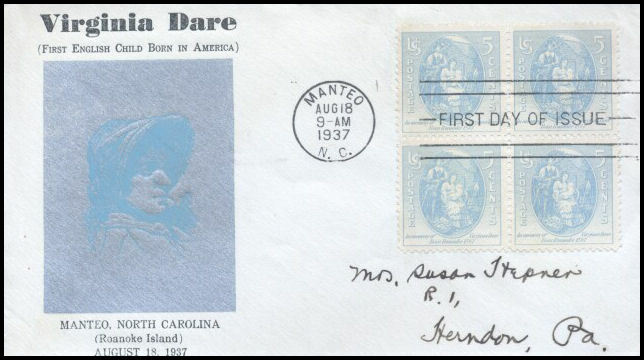 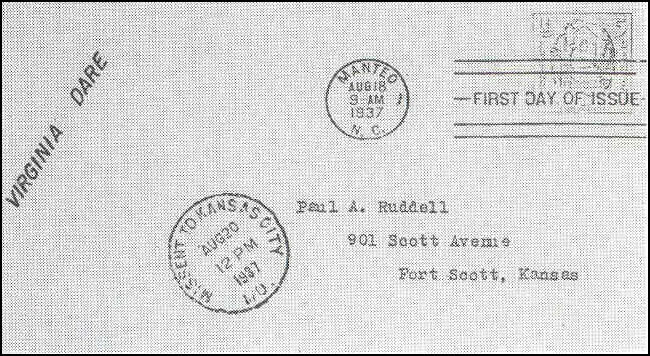 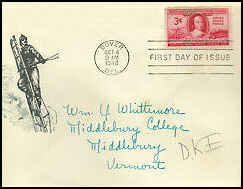 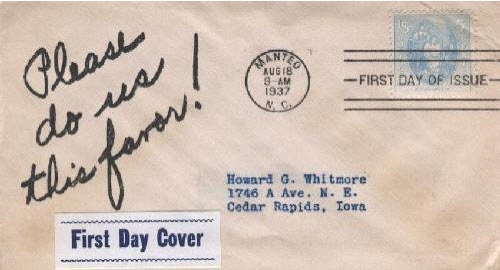 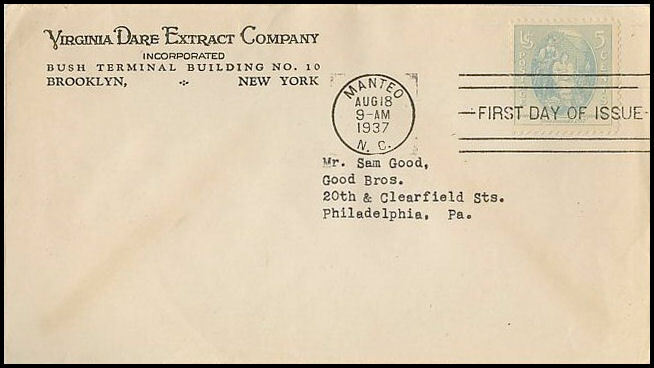 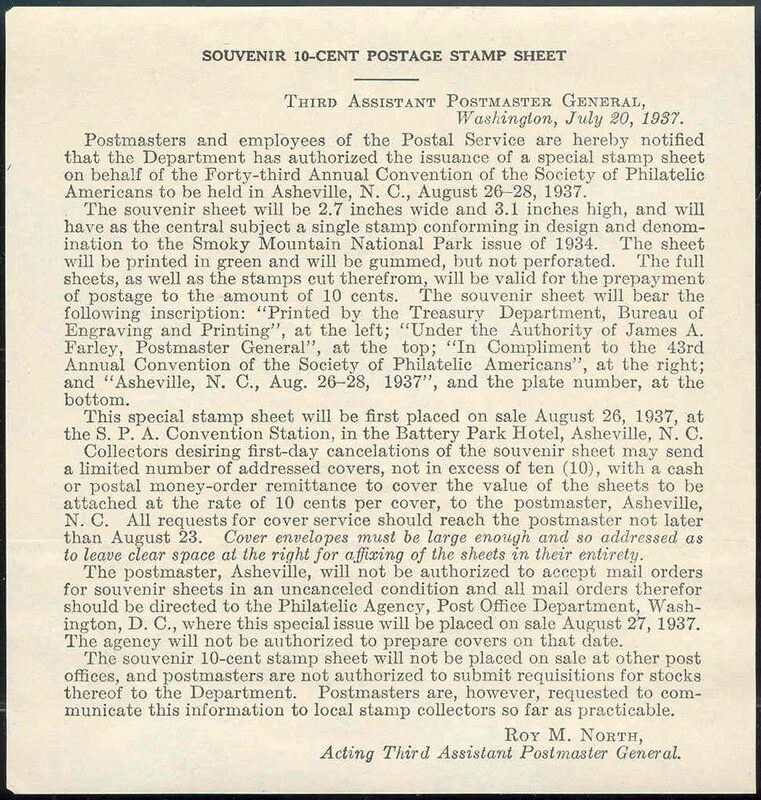 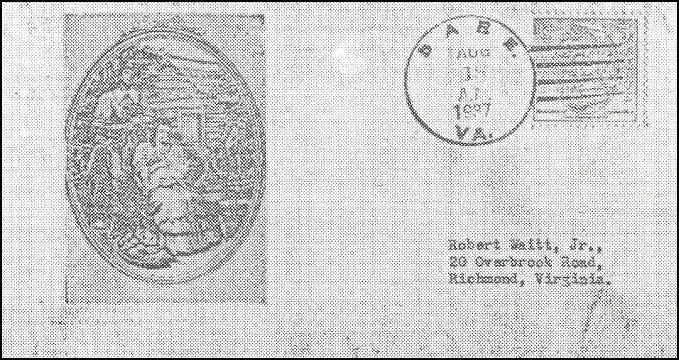 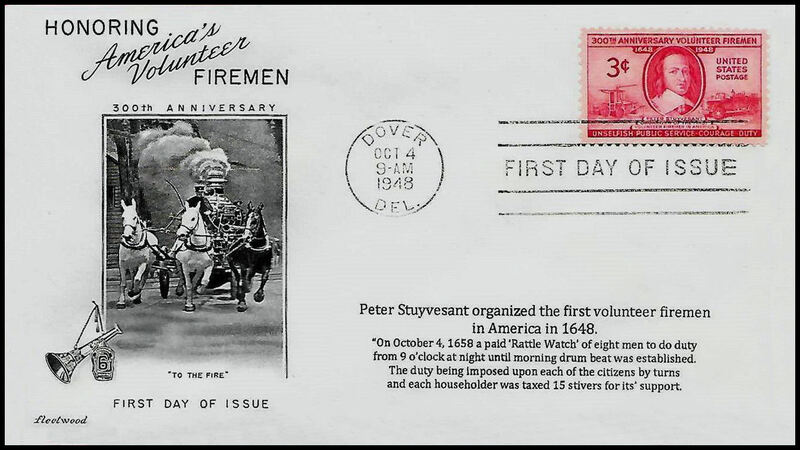 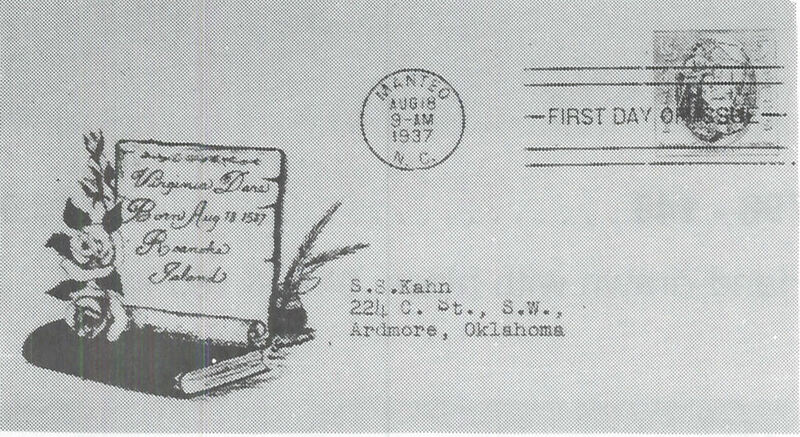 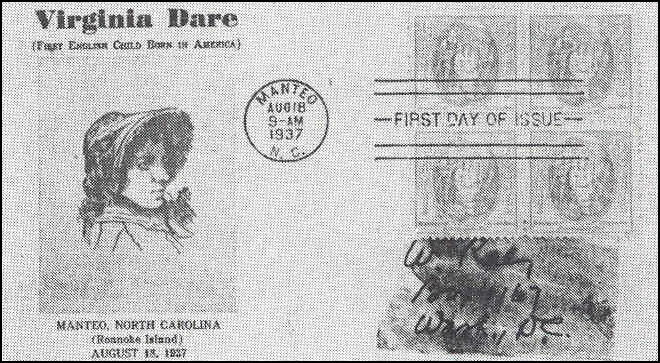 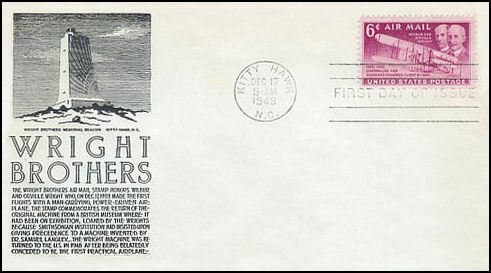 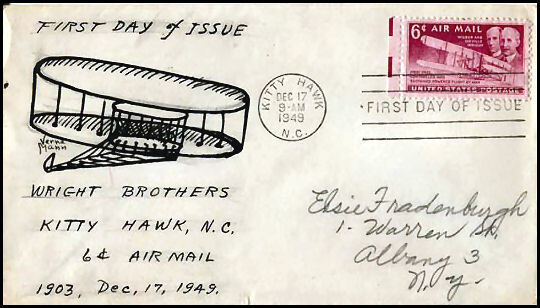 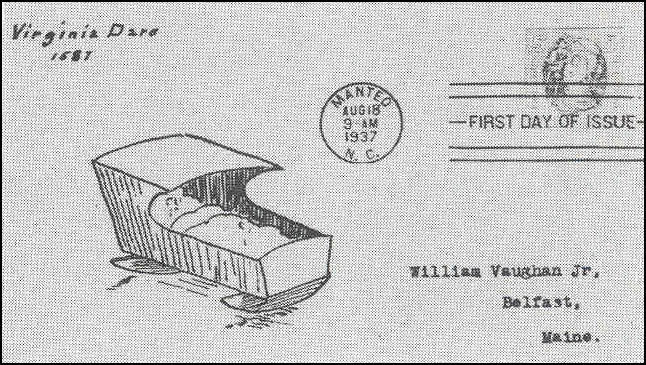 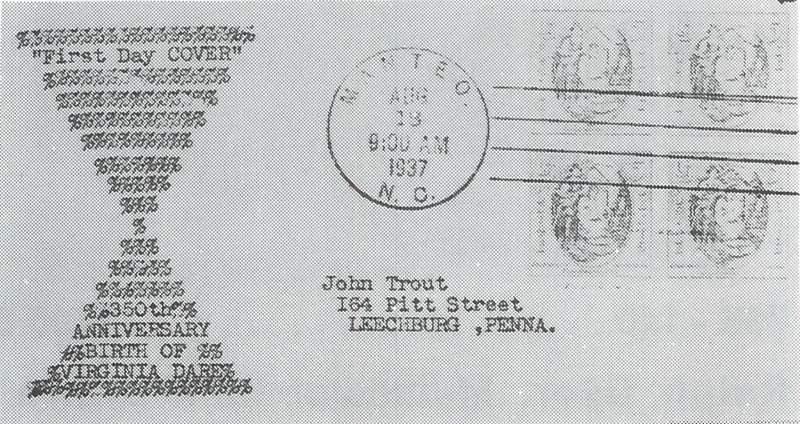 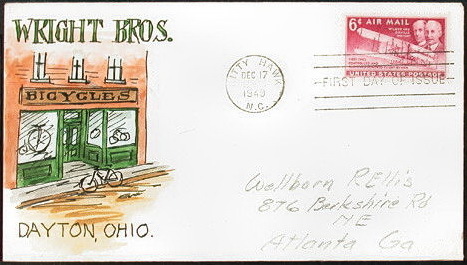 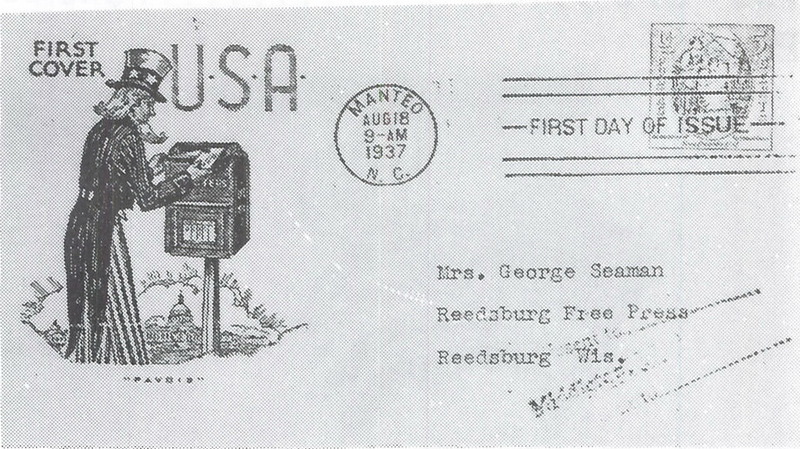 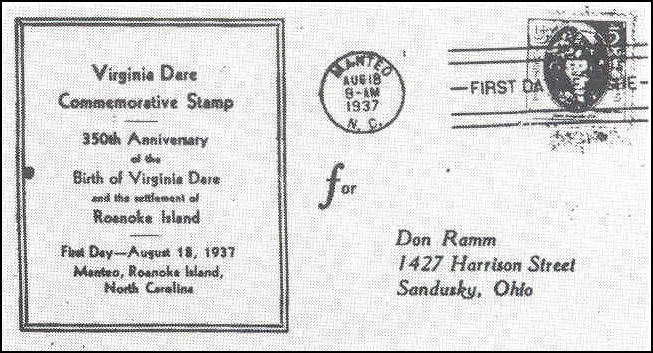 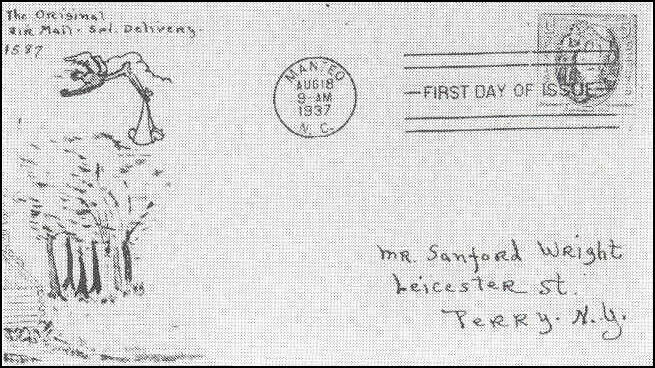 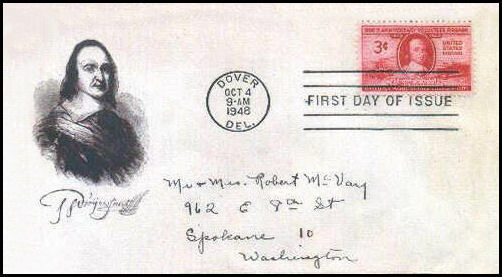 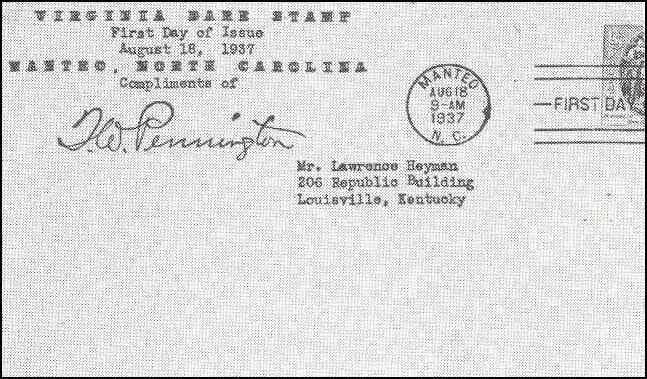 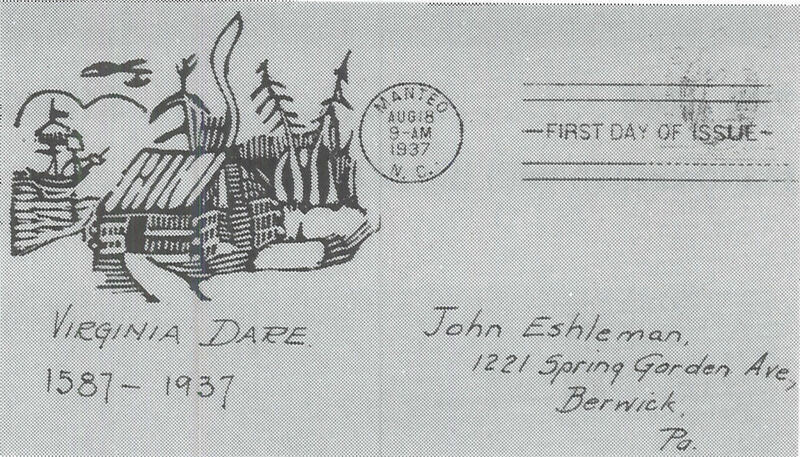 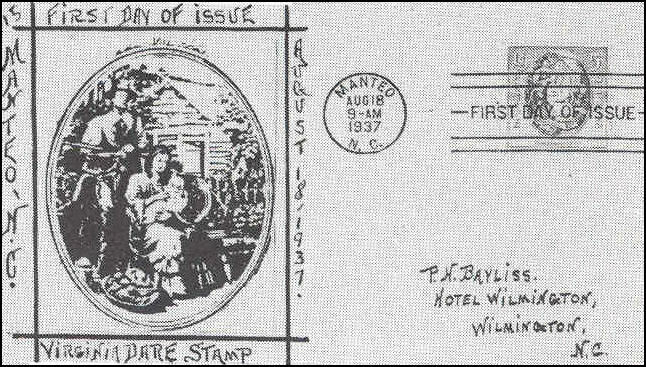 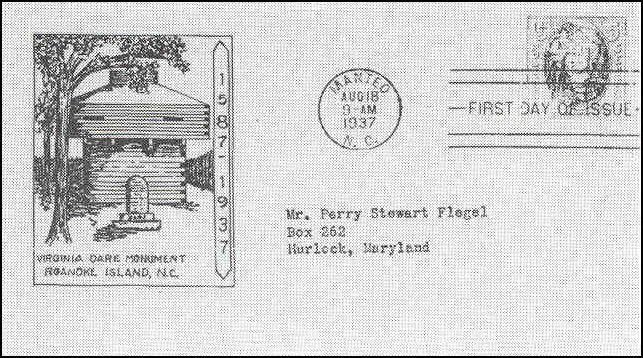 UNK14; "FIRST DAY OF ISSUE"
mimeograph & rubberstamp; 08/2011 Mike Friedman had one for sale with the printing over a hand-written address - I doubt anyone would write a full address IN a cachet! 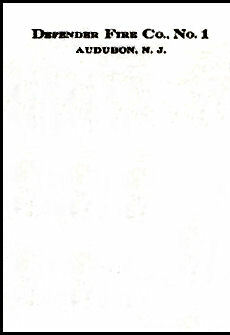 So, apparently Add-Ons exist or ALL are add-ons? 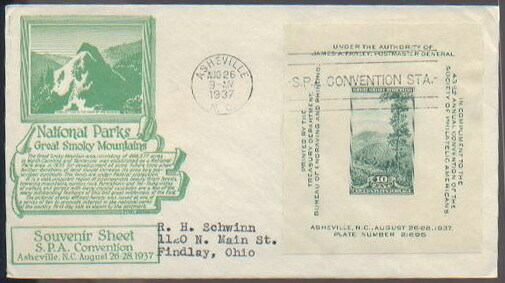 UNK11; 03/2009, found on sale at Artisans.Com for $85.00. 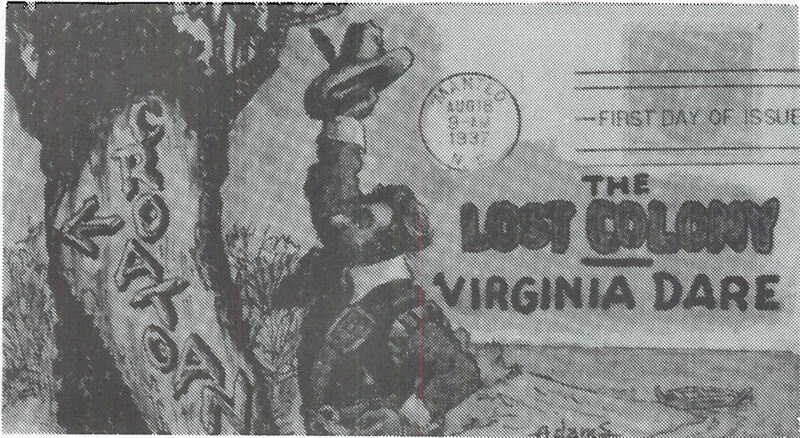 Seller has no information when done or by whom. 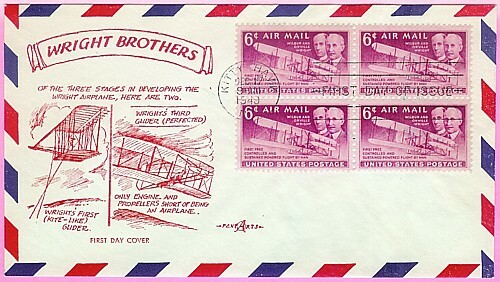 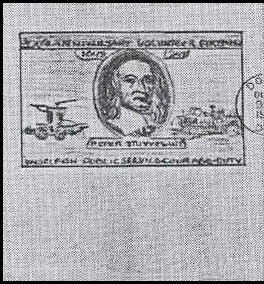 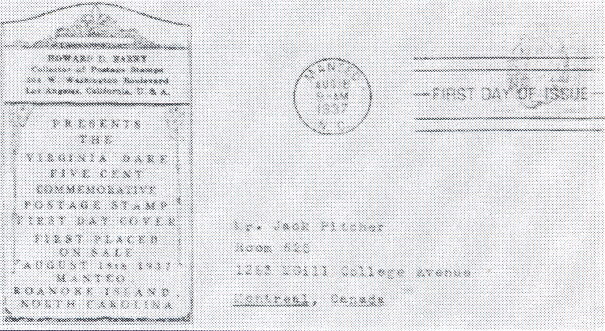 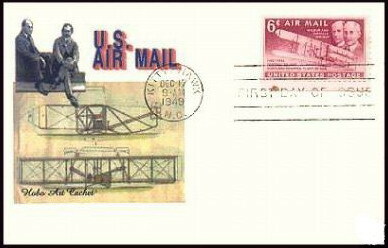 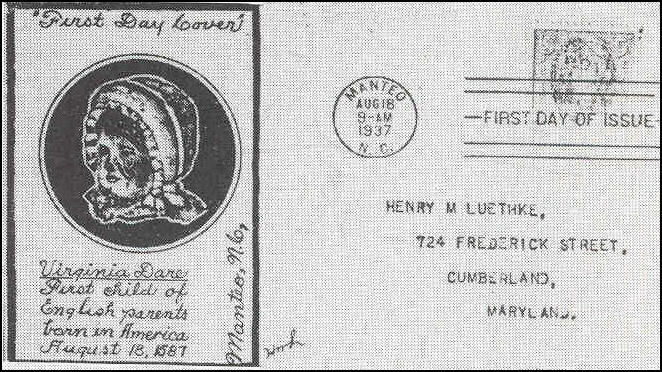 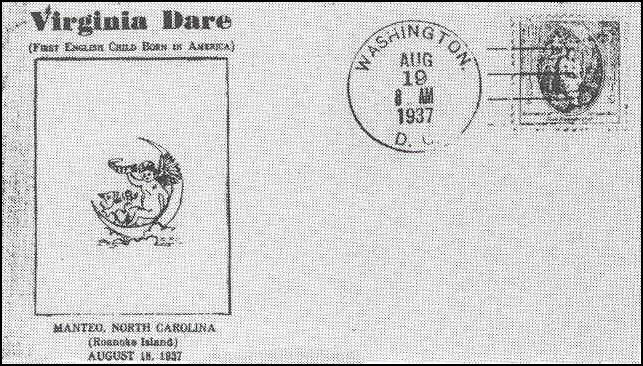 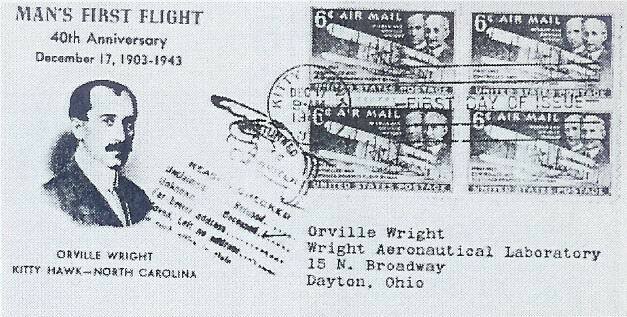 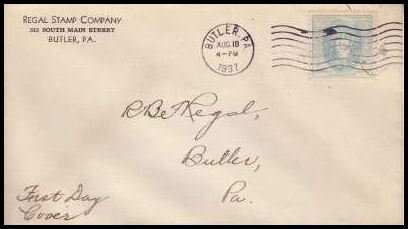 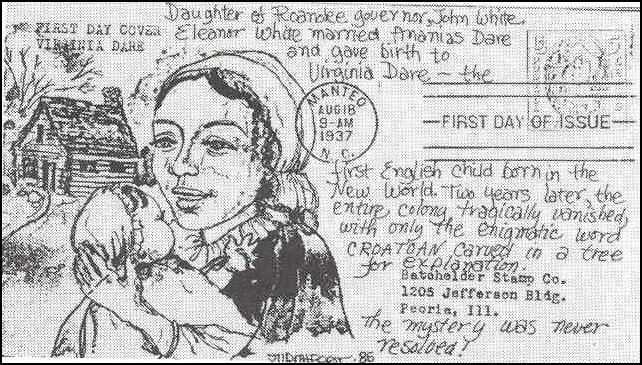 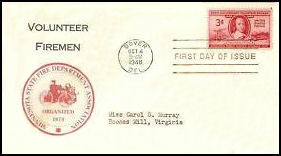 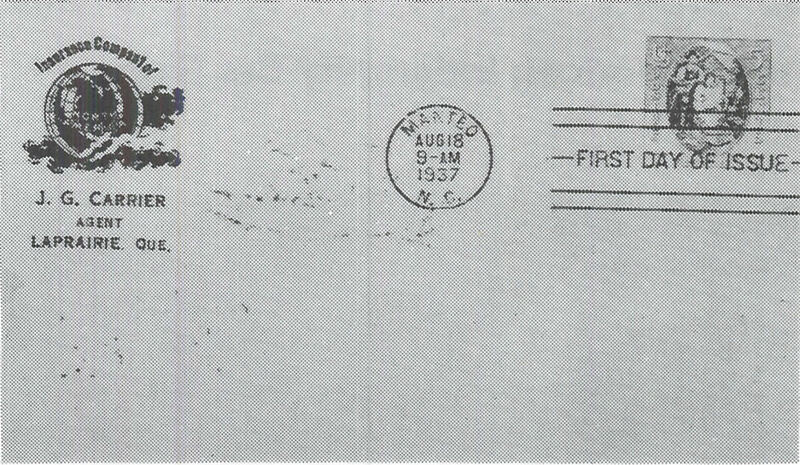 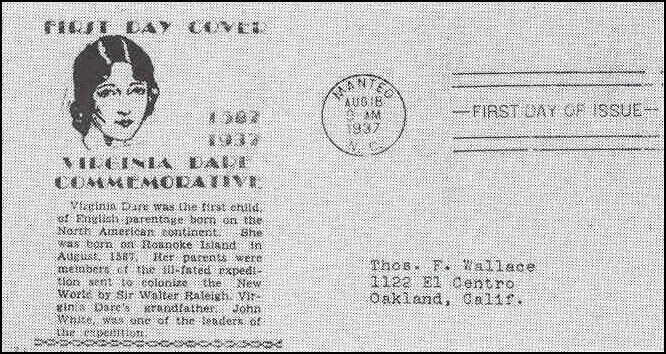 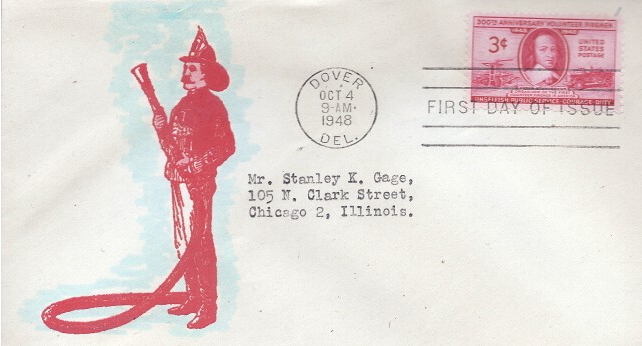 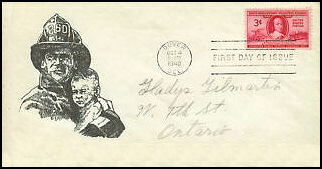 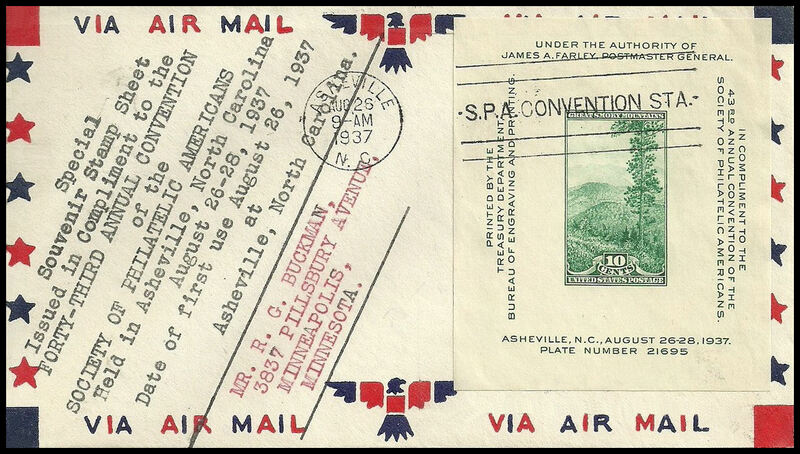 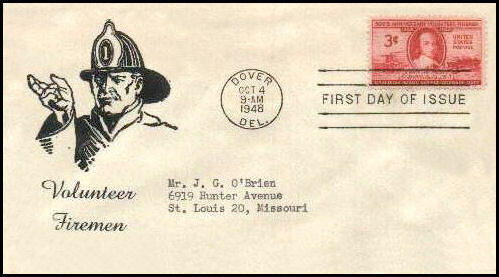 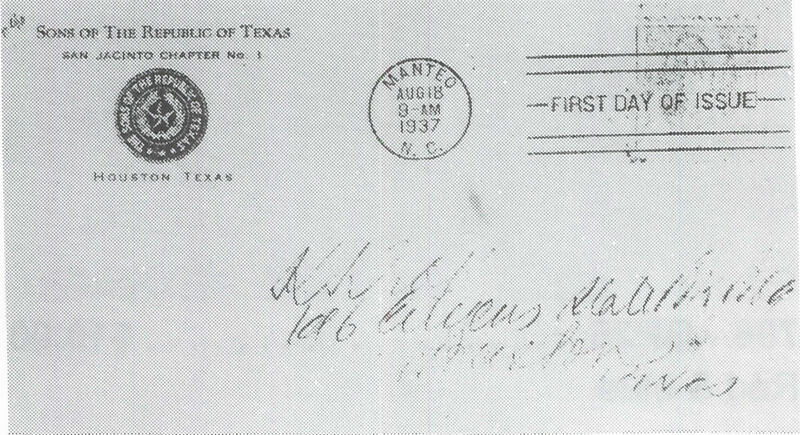 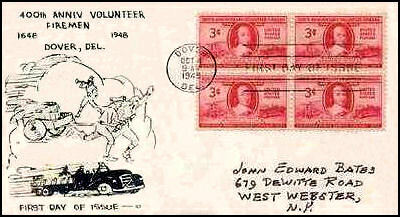 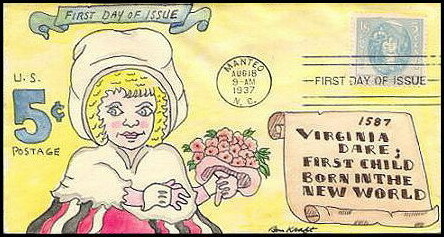 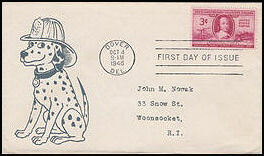 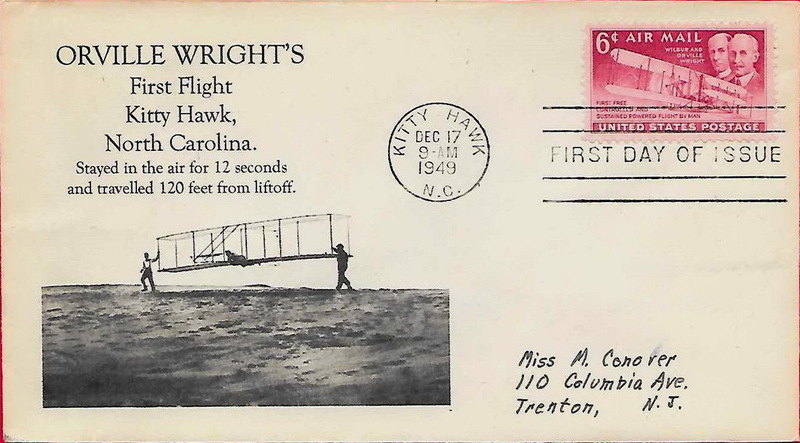 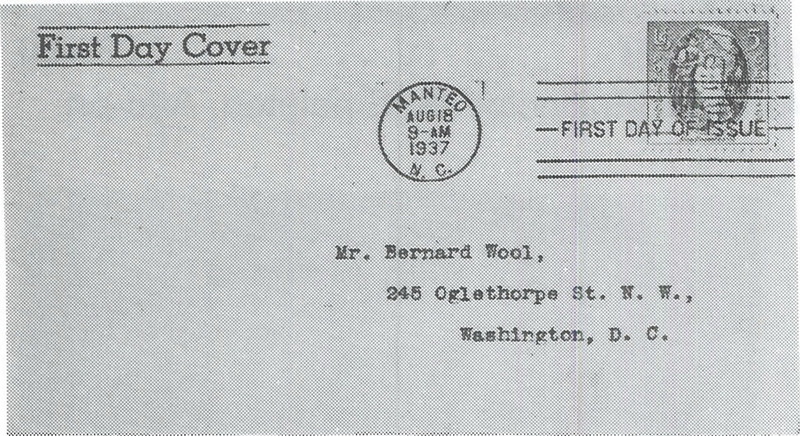 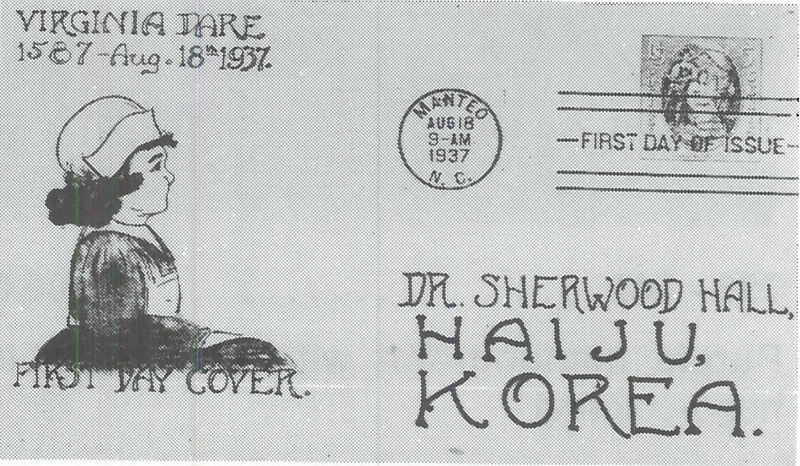 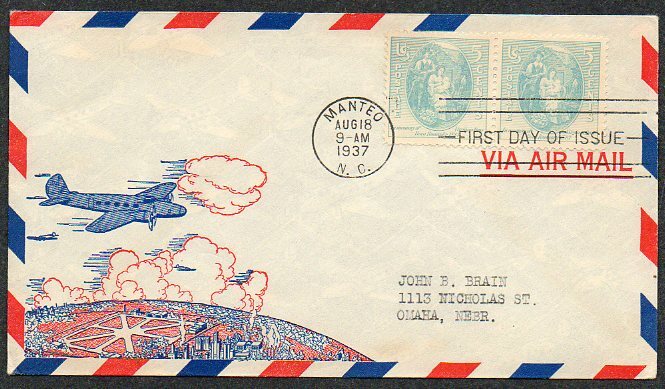 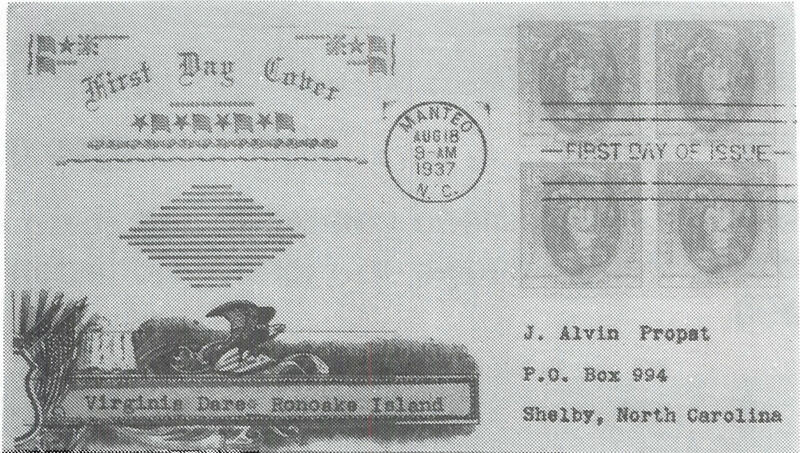 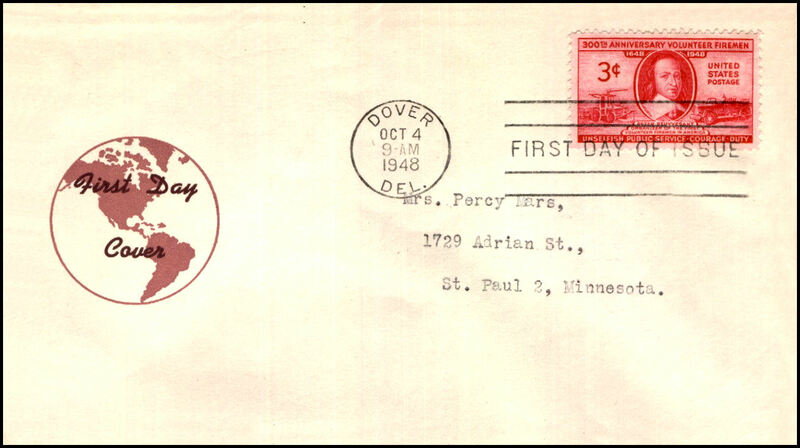 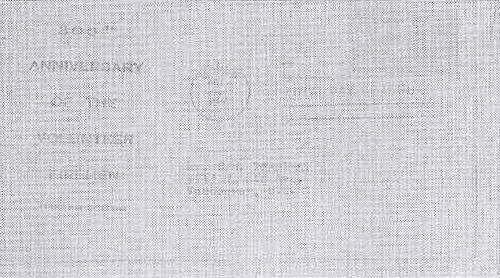 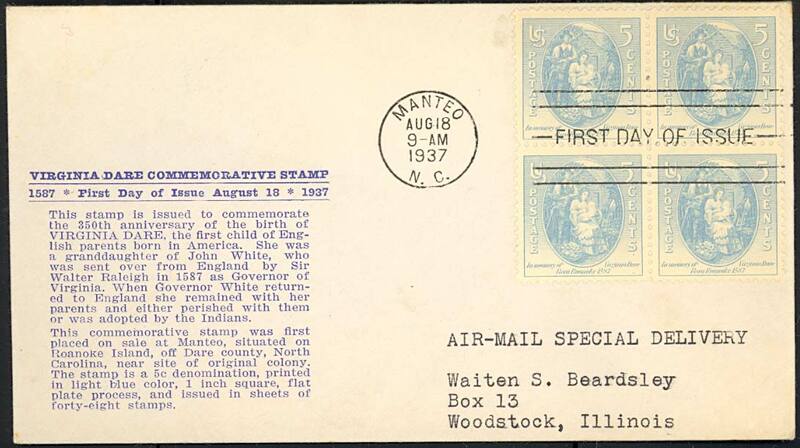 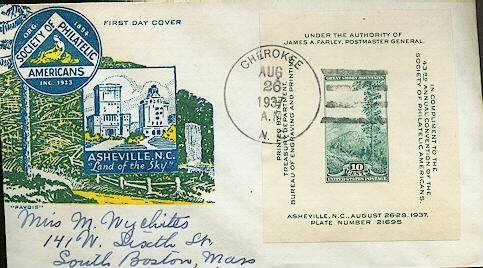 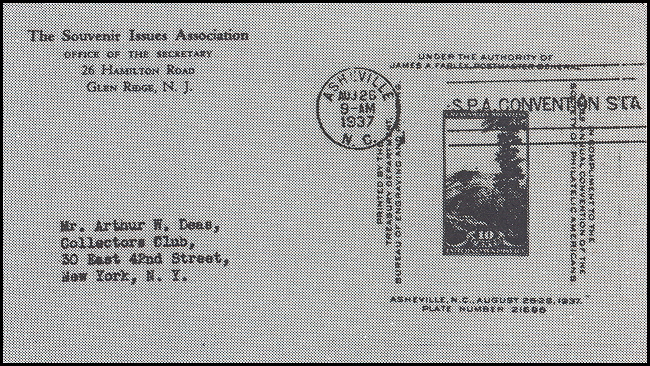 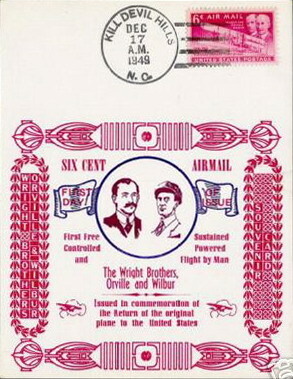 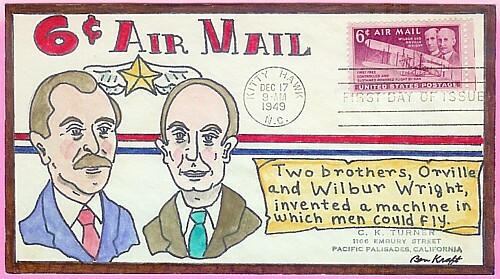 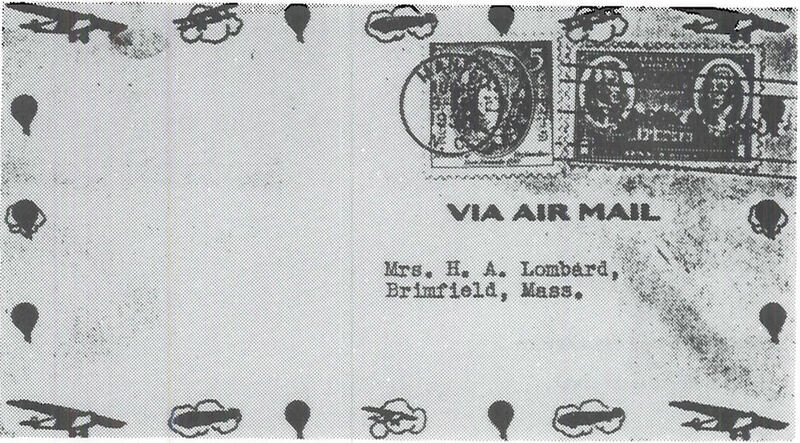 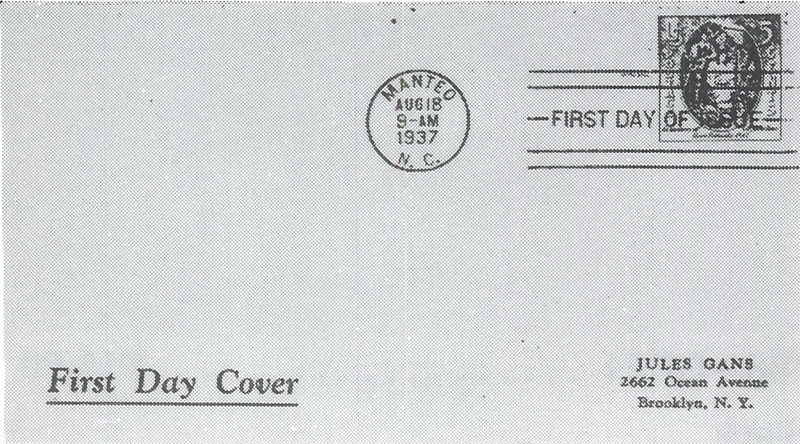 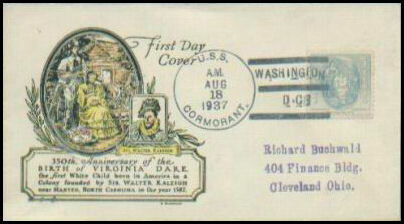 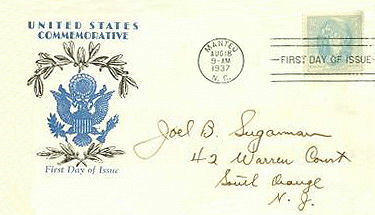 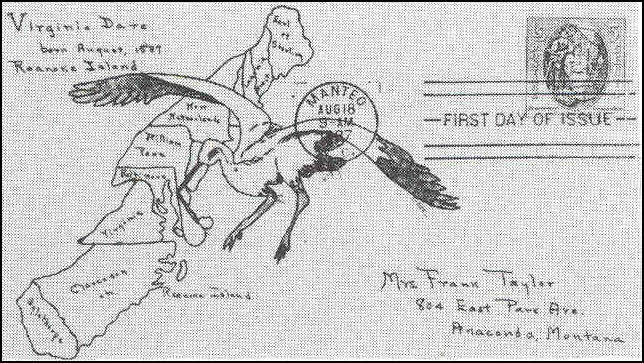 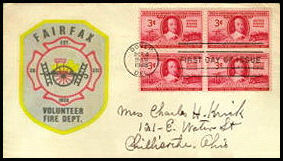 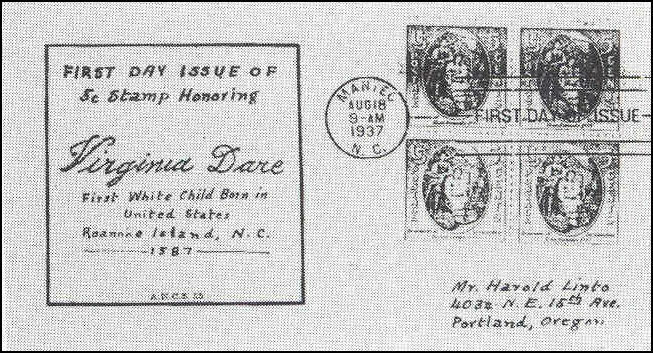 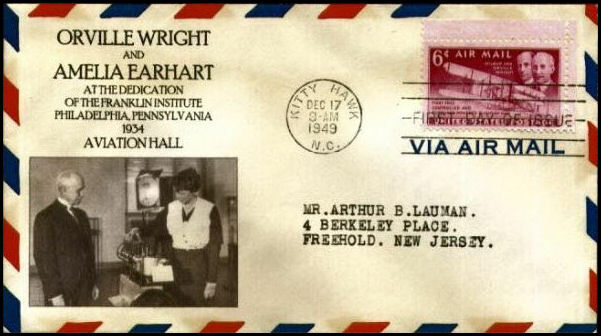 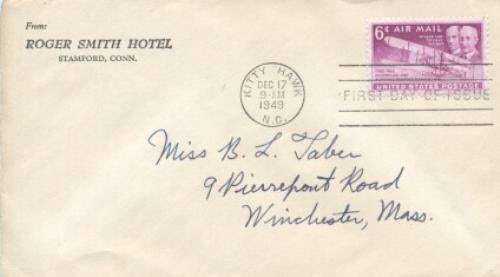 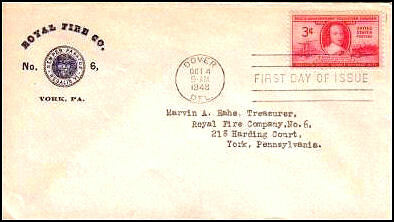 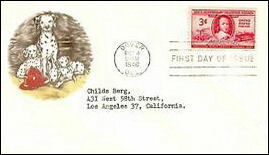 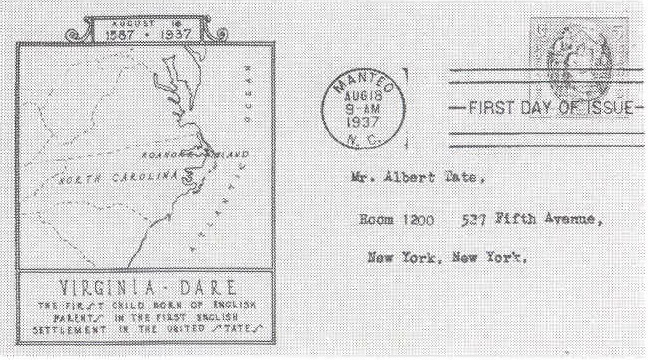 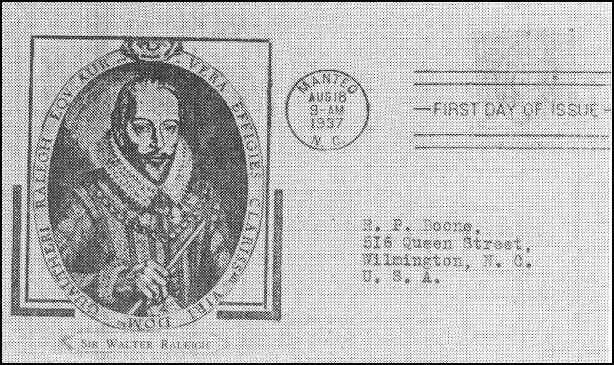 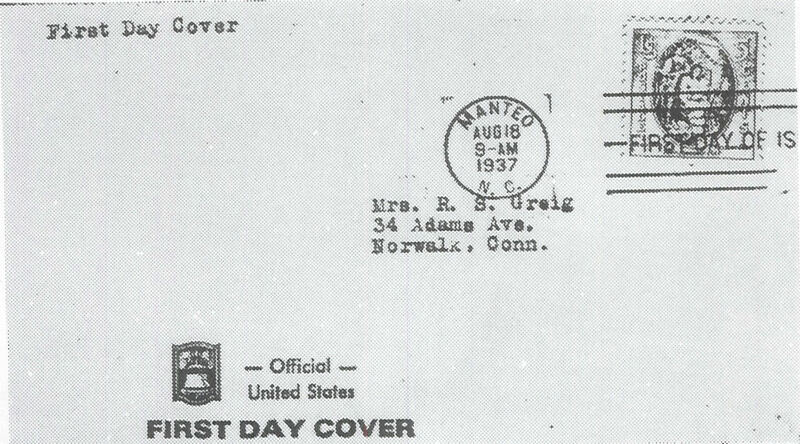 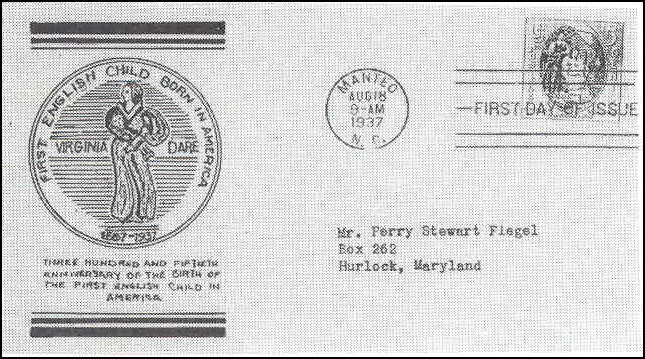 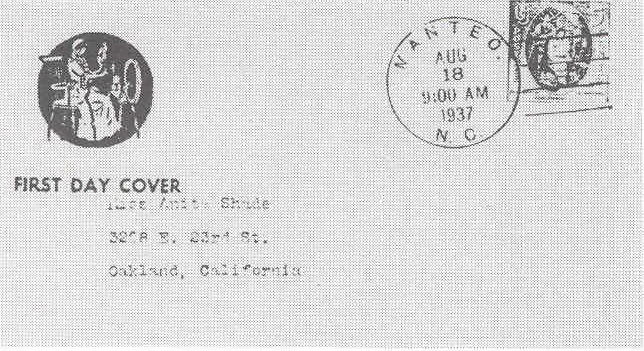 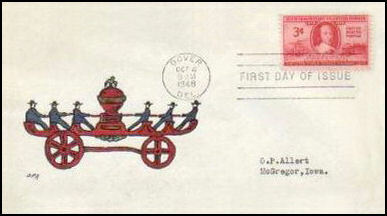 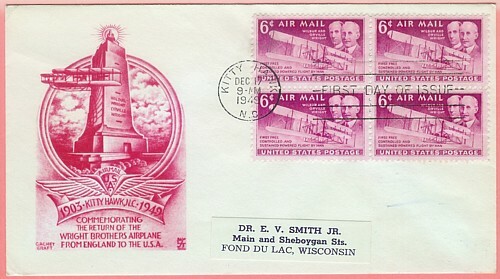 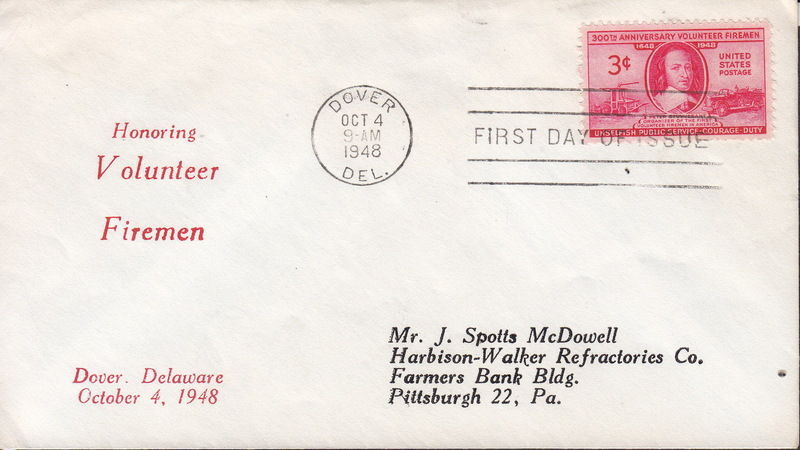 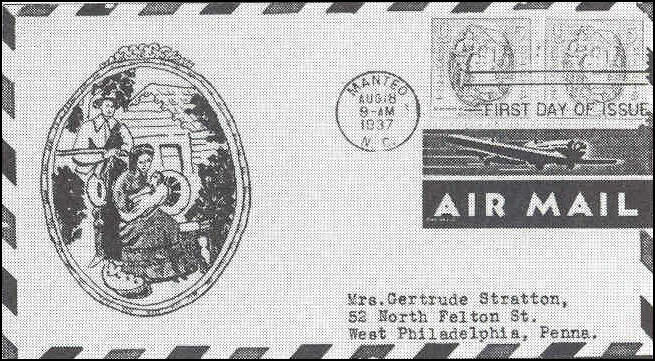 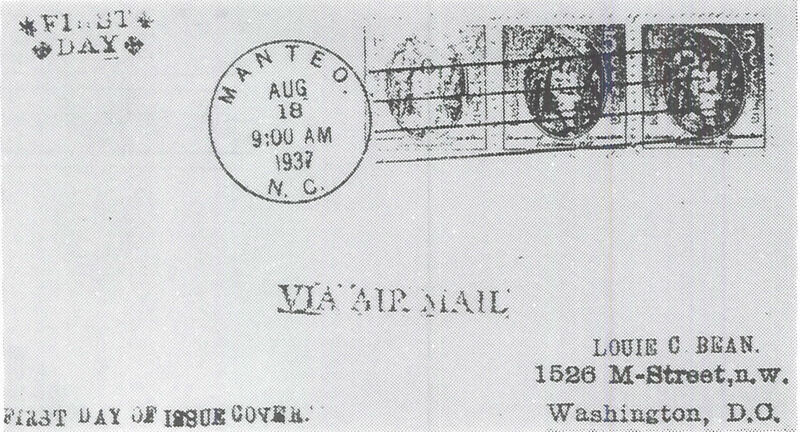 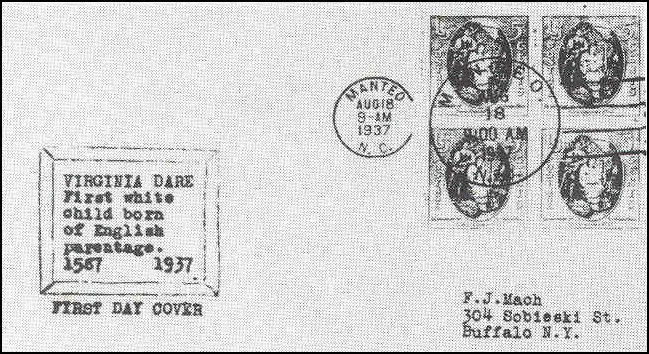 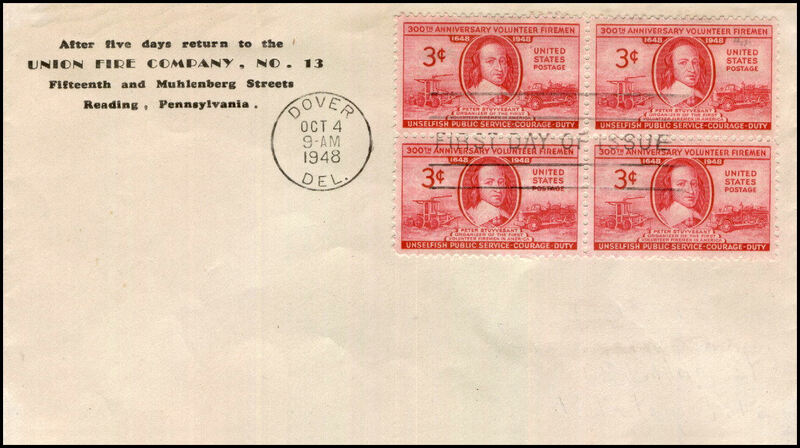 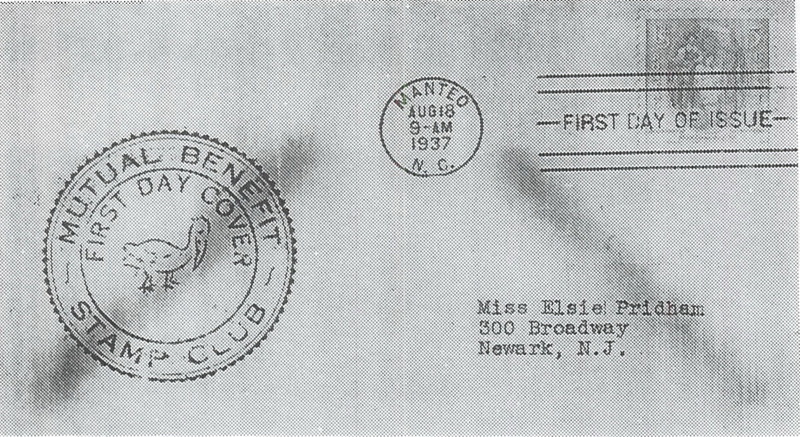 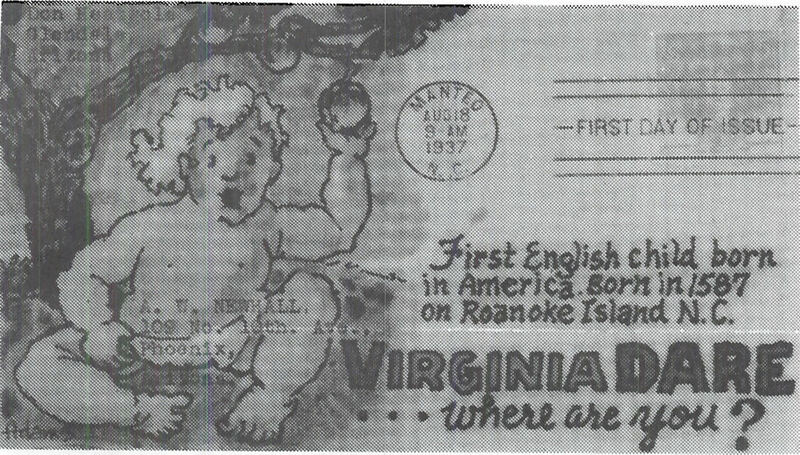 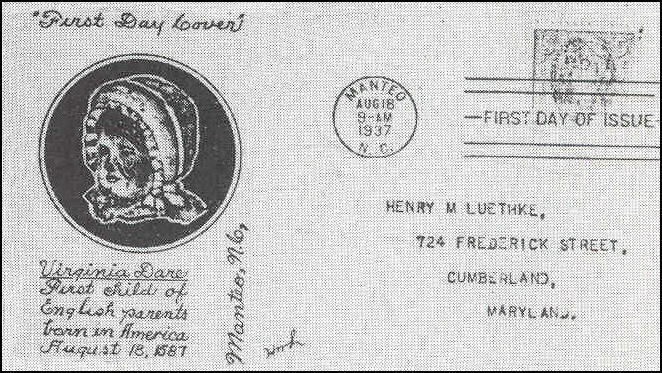 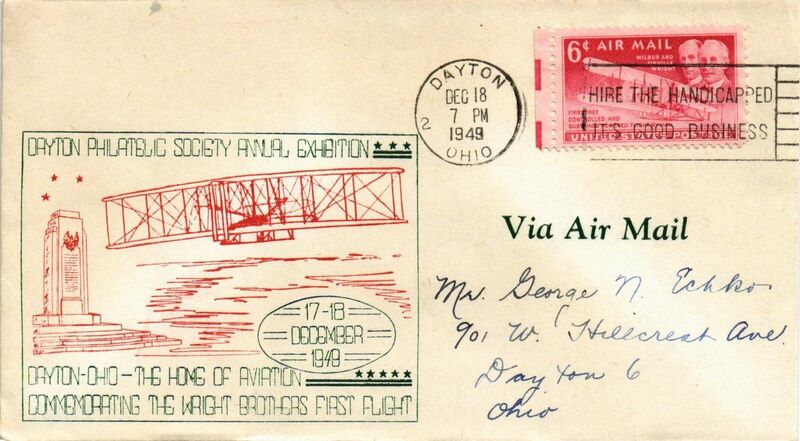 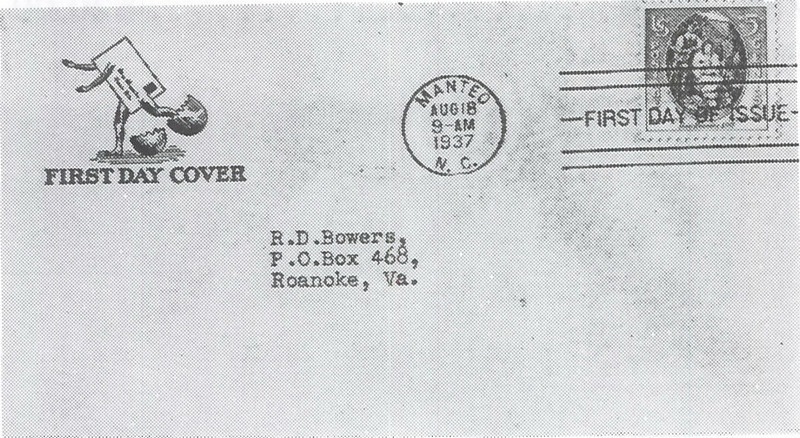 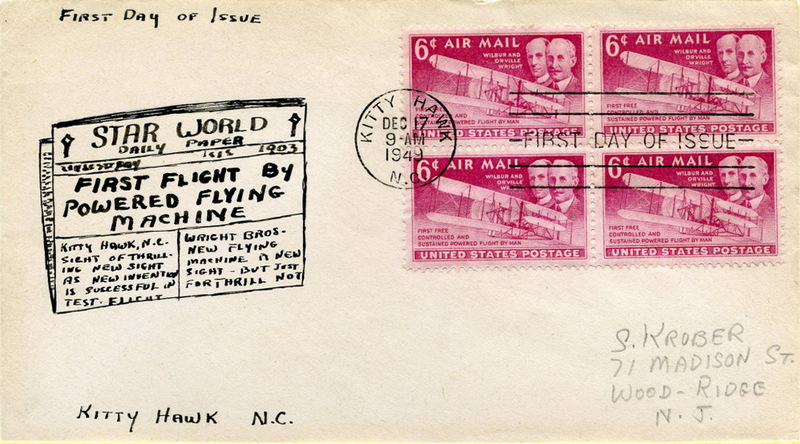 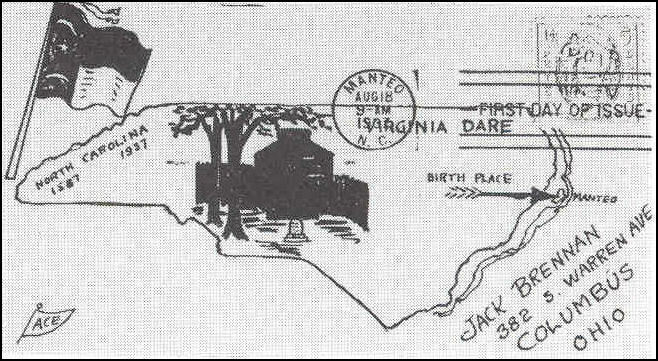 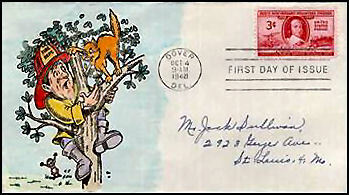 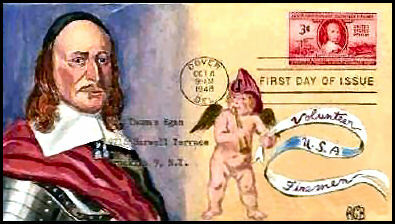 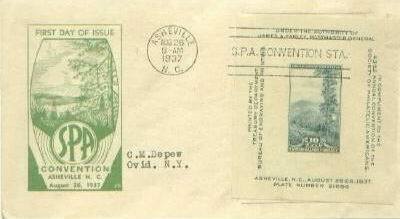 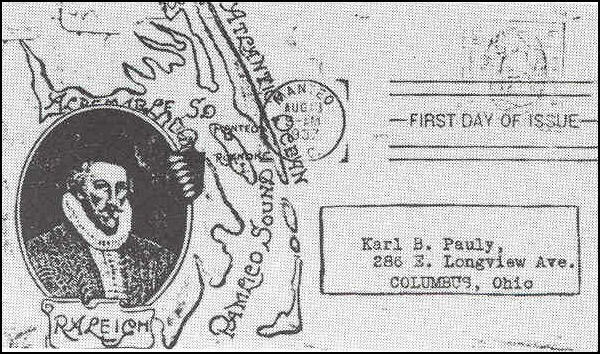 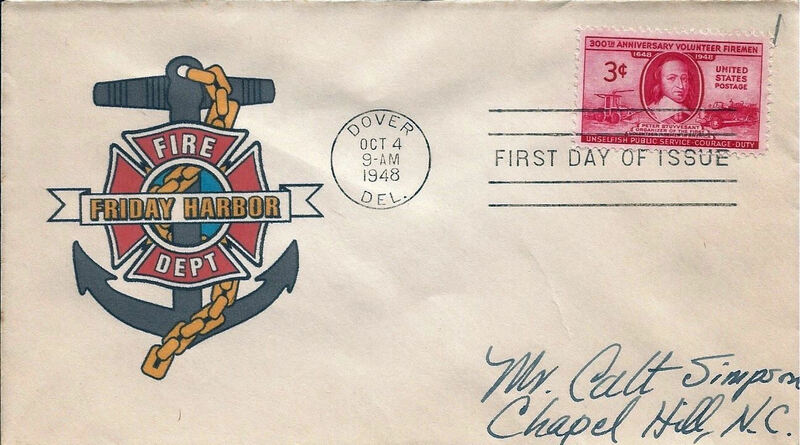 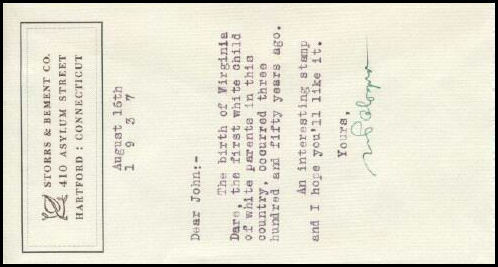 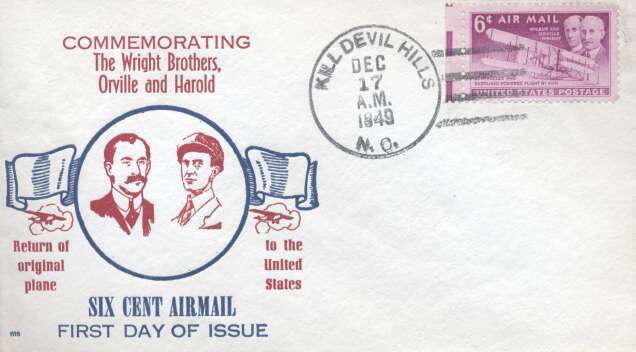 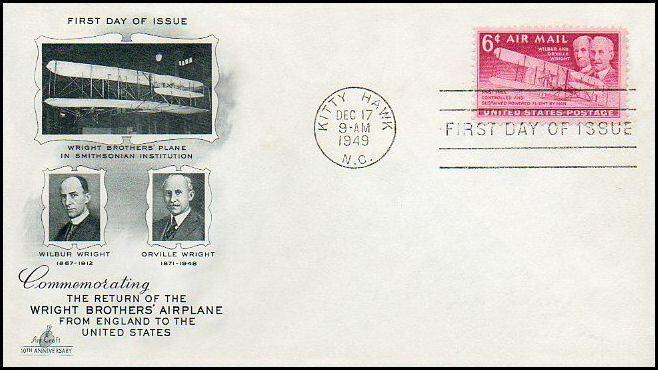 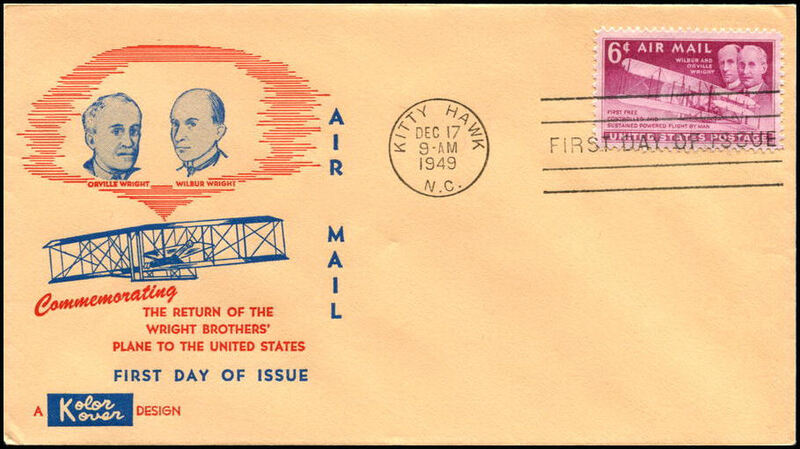 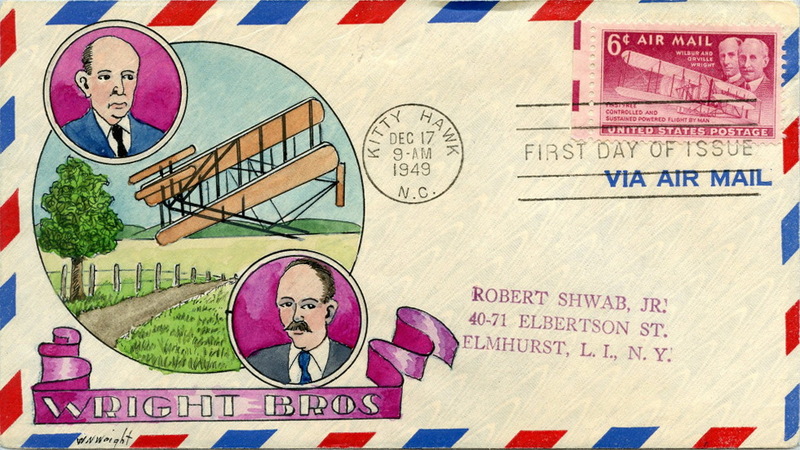 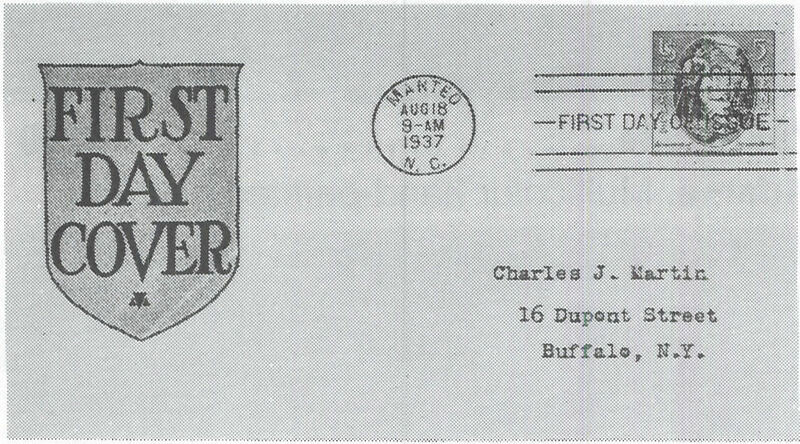 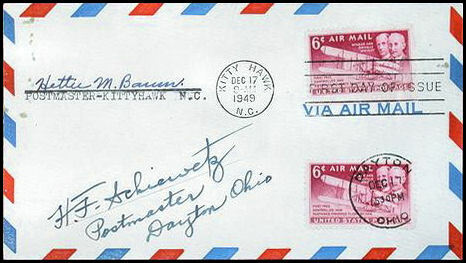 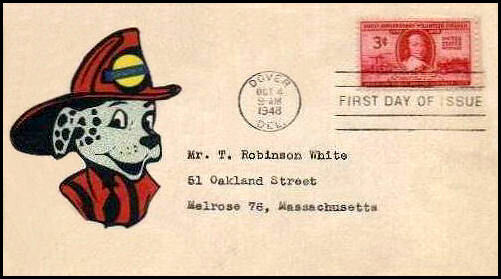 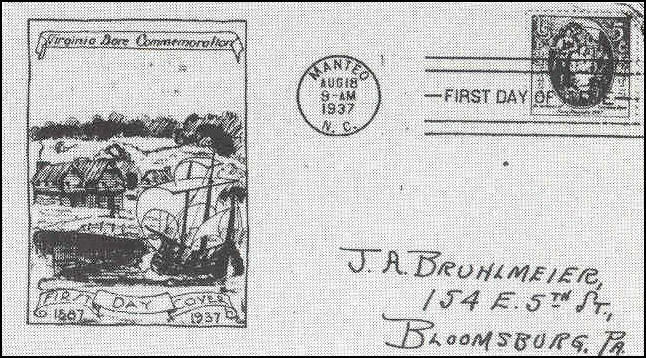 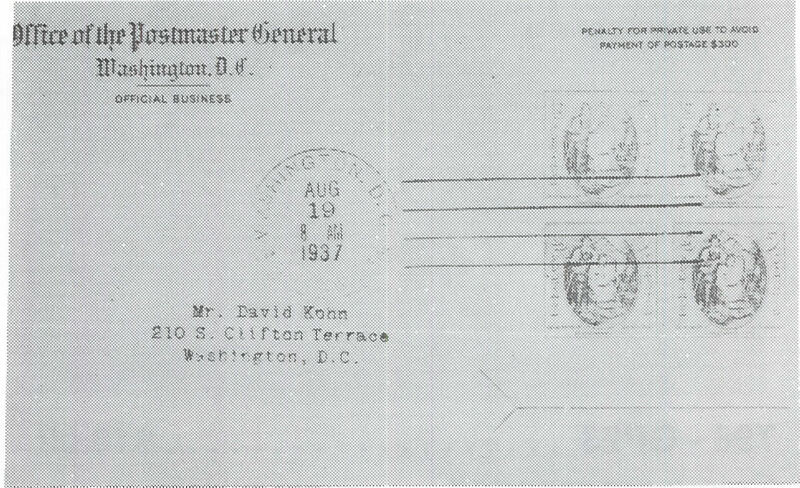 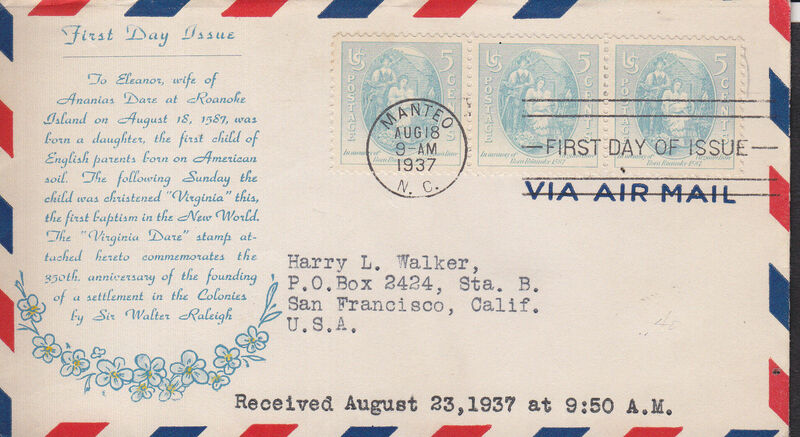 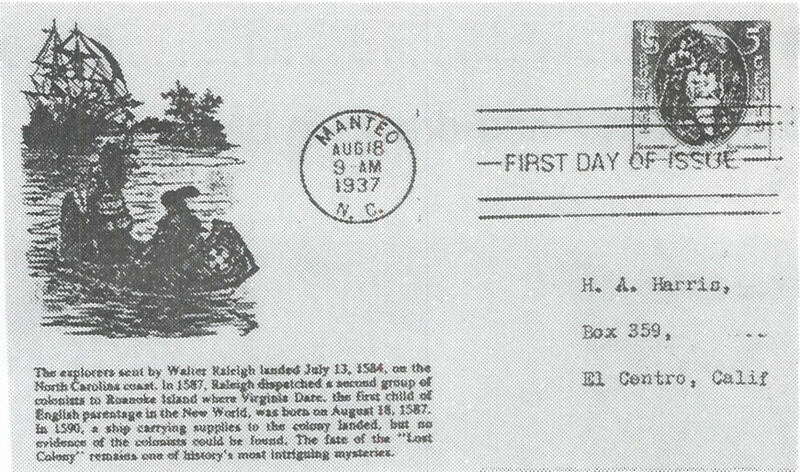 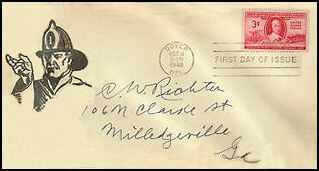 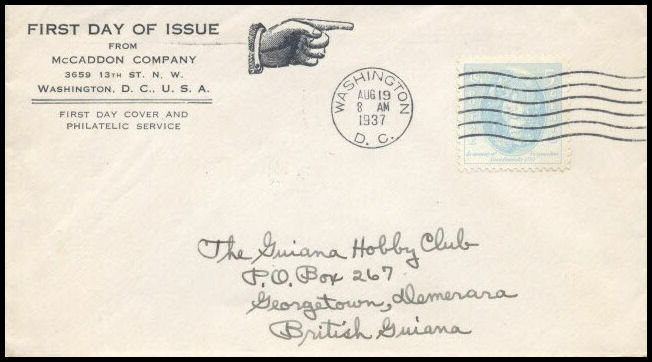 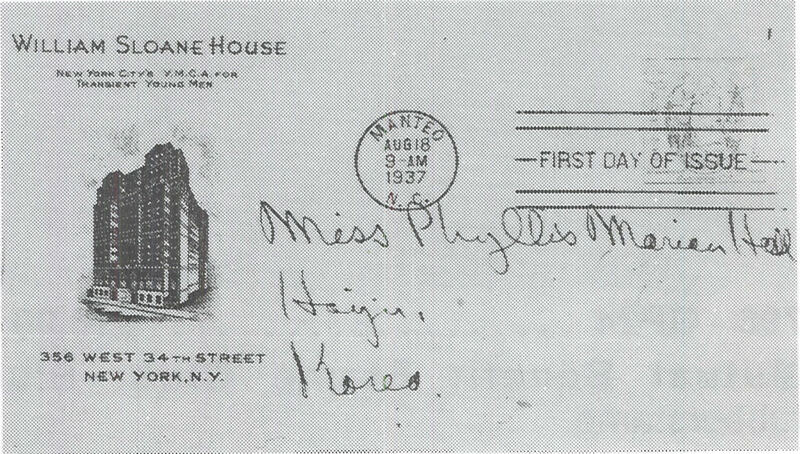 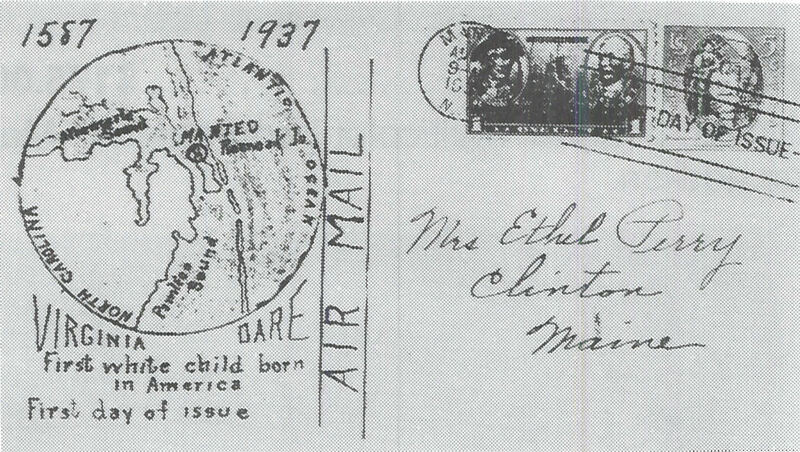 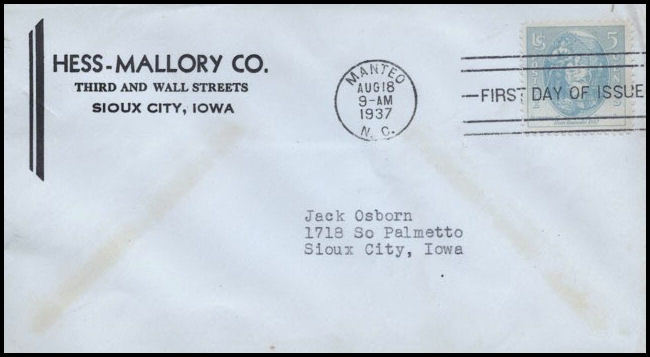 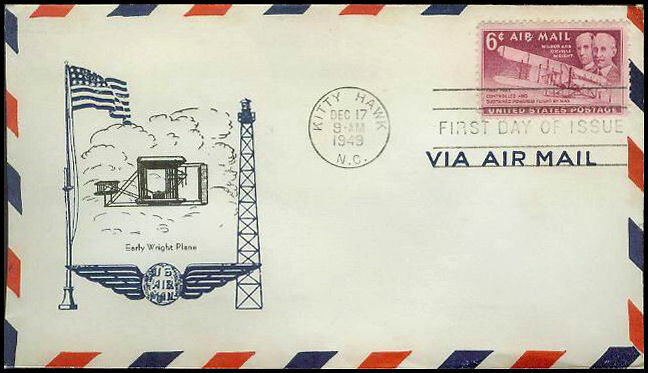 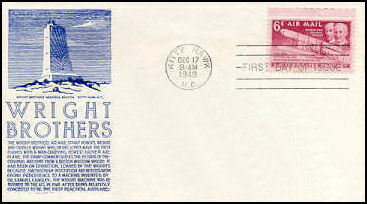 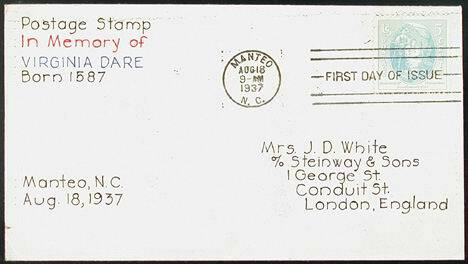 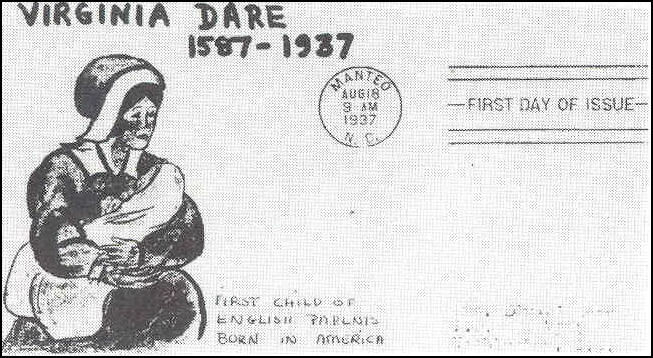 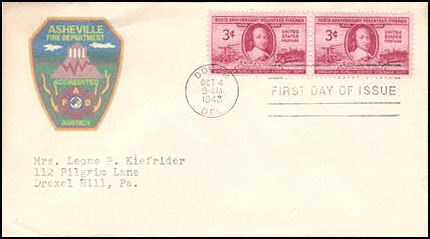 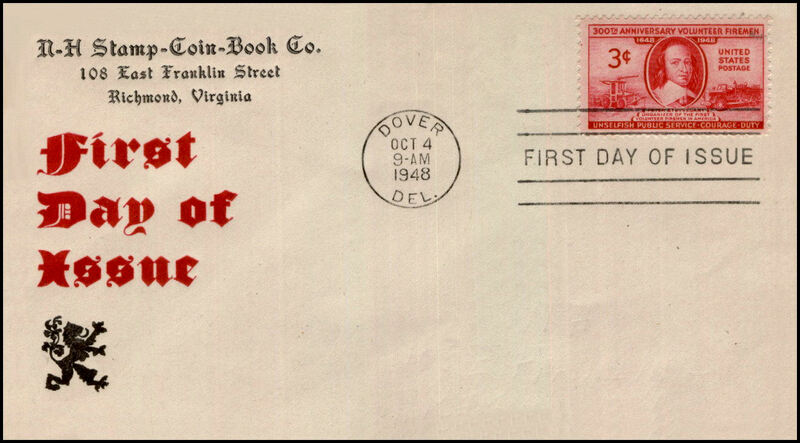 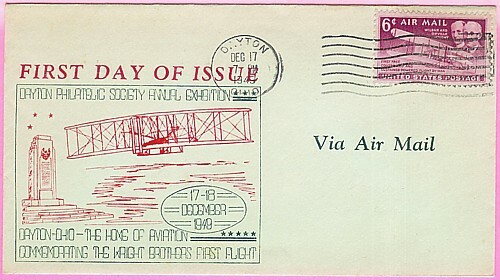 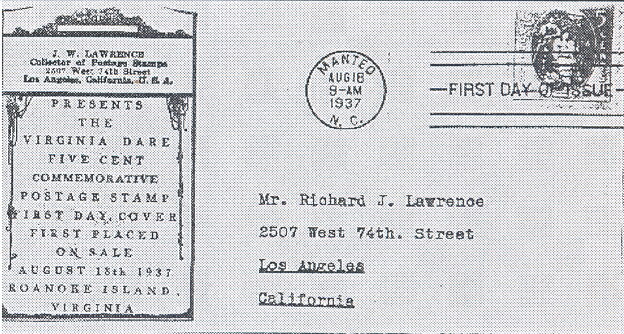 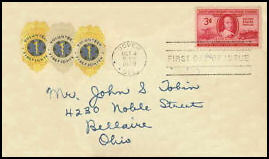 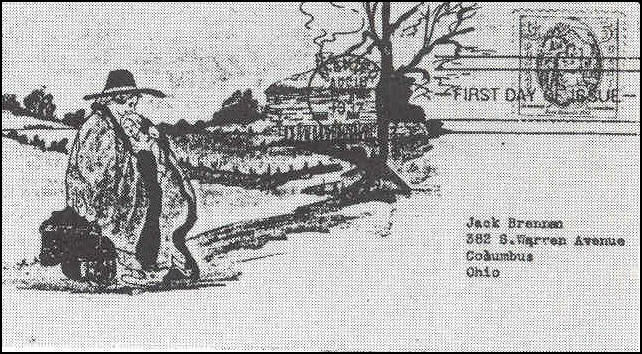 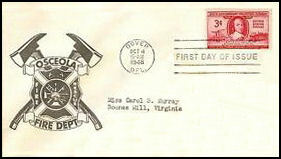 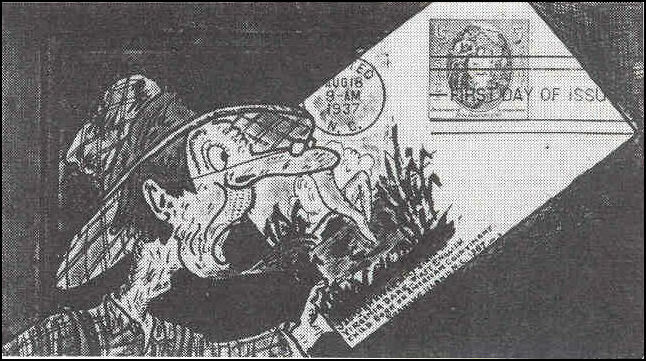 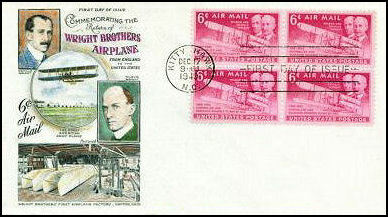 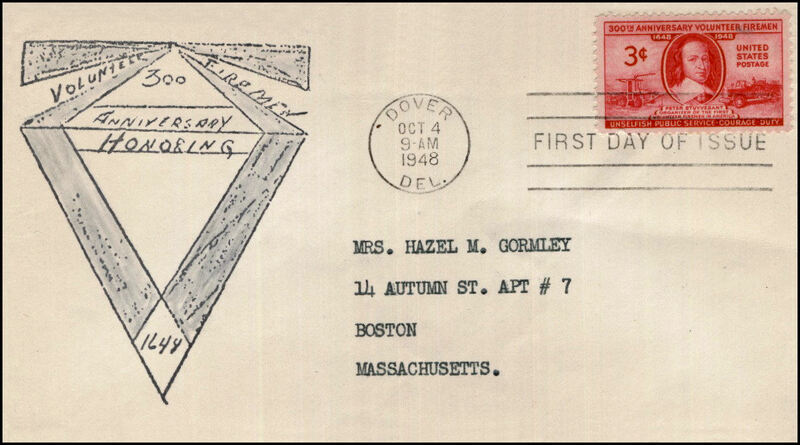 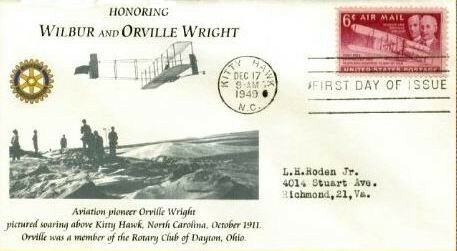 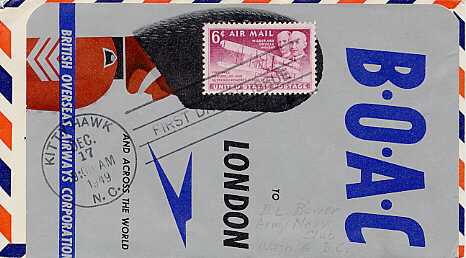 DSC: Horan, Dr. Joseph C.
UNK15-01; Luggage label for BOAC pasted on with FDOI cancel tieing it to the envelope. 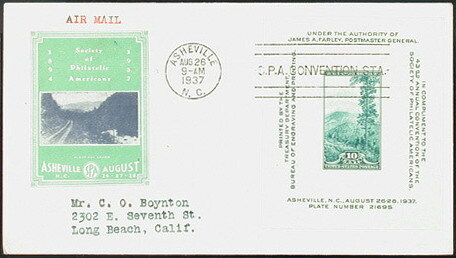 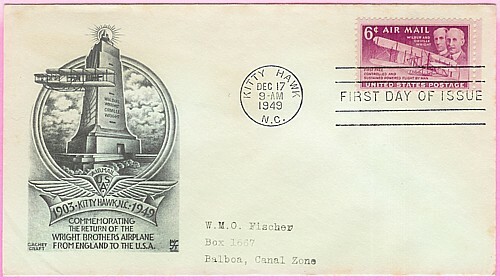 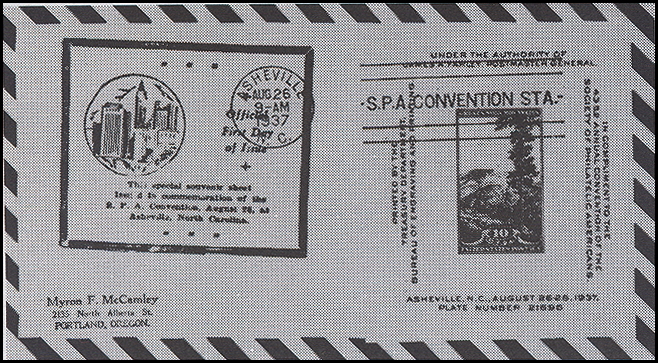 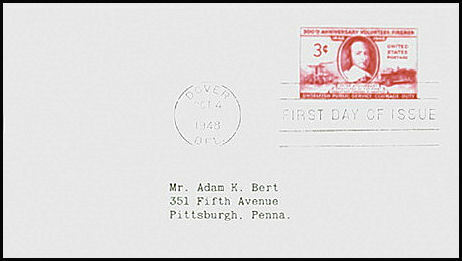 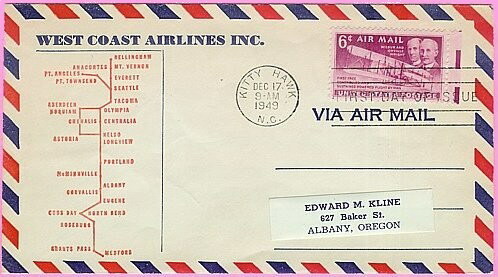 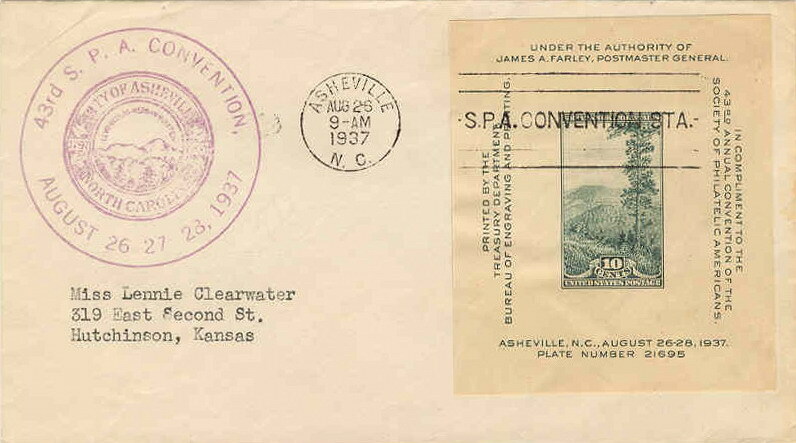 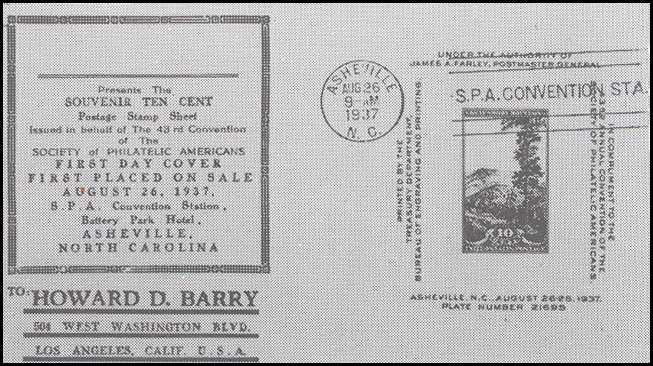 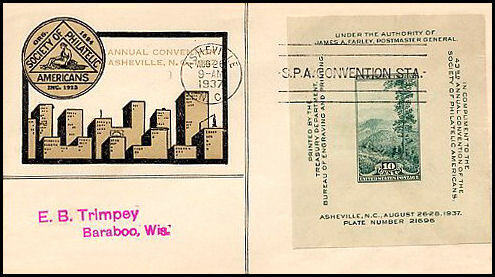 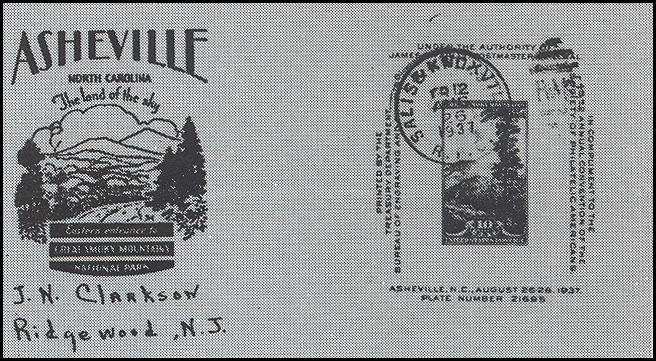 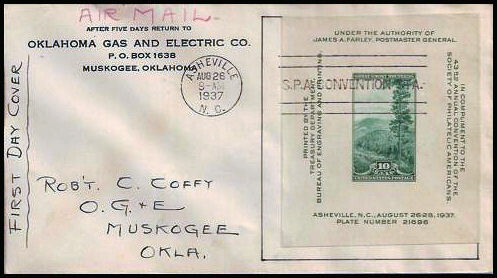 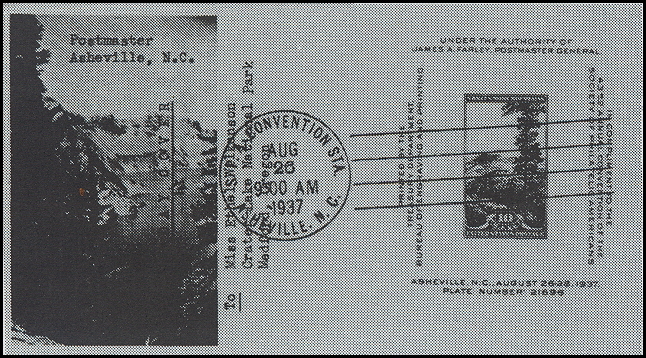 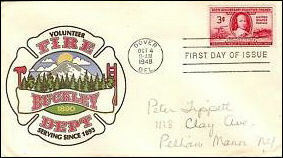 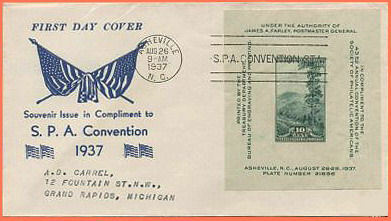 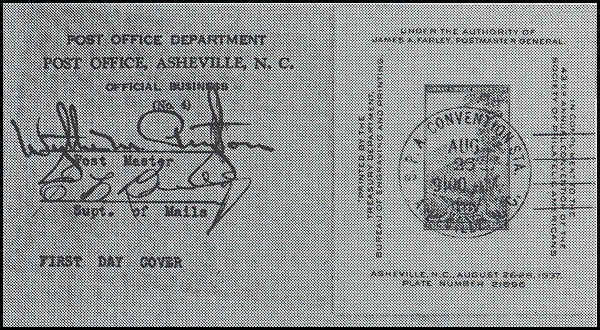 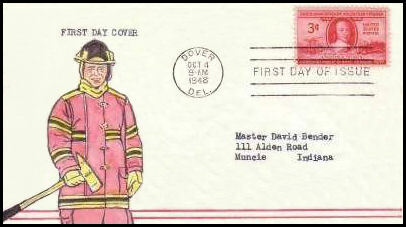 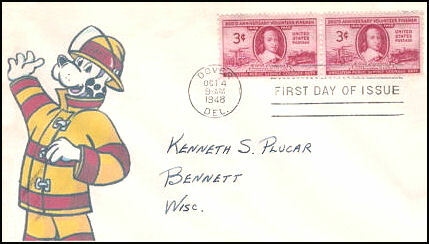 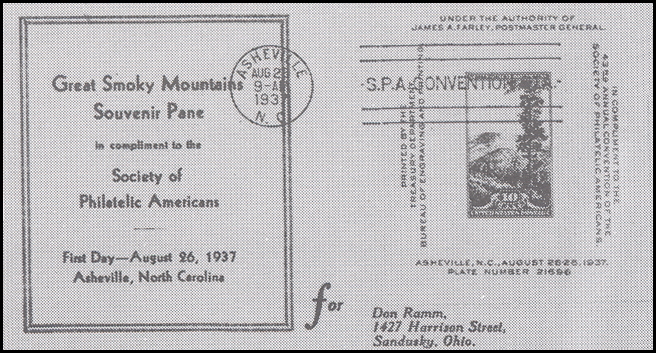 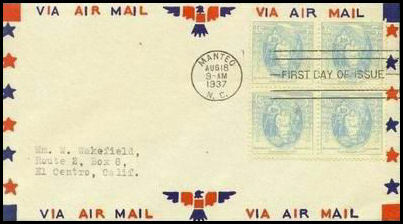 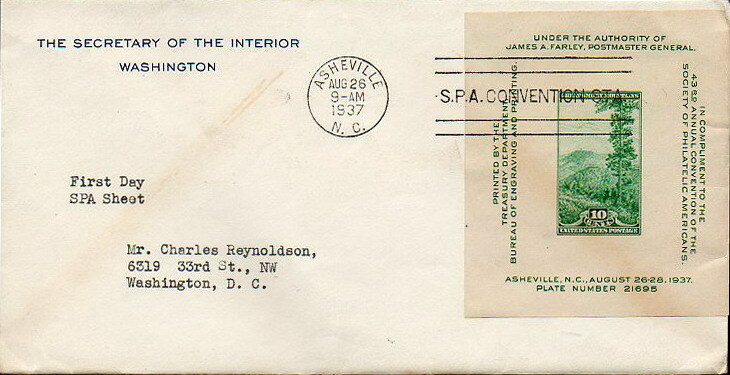 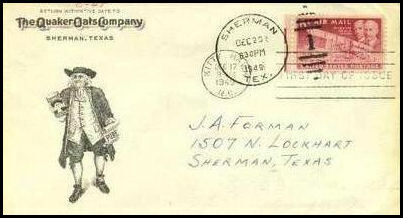 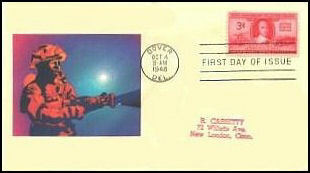 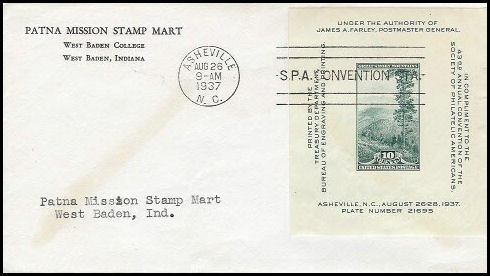 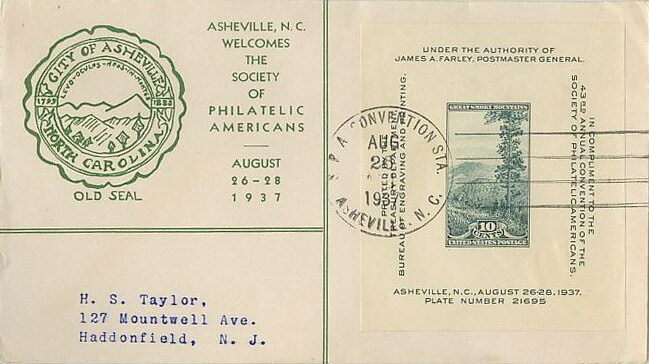 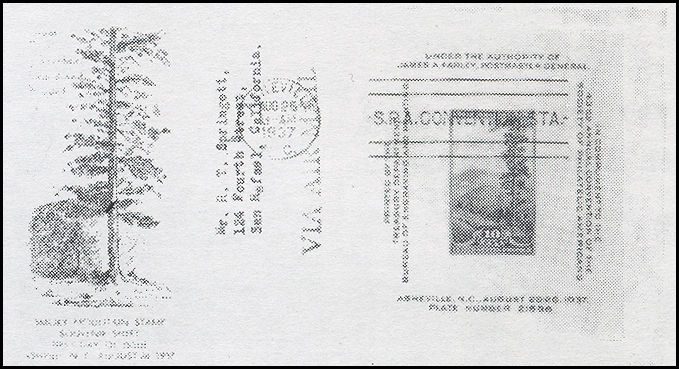 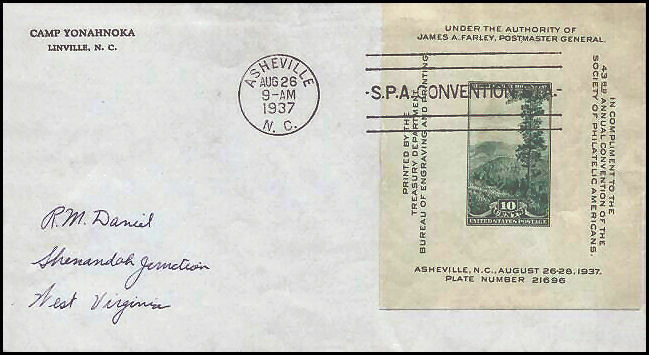 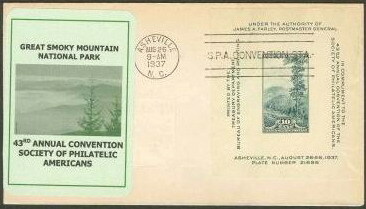 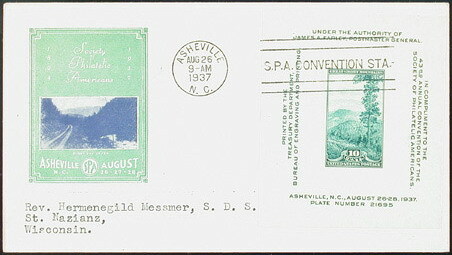 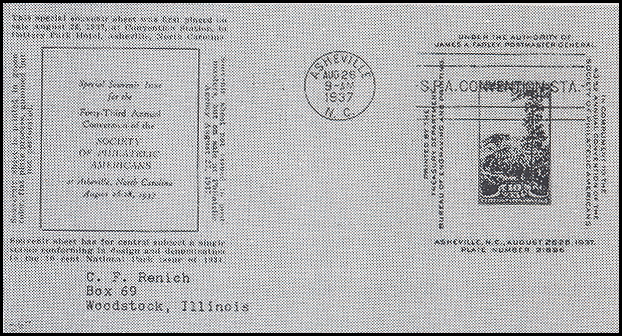 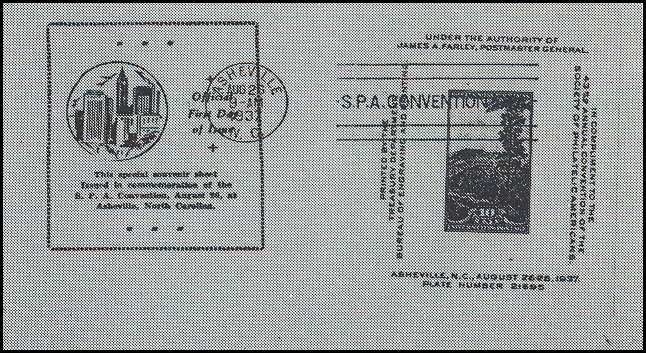 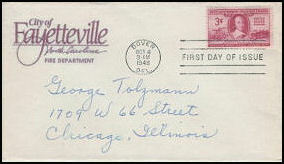 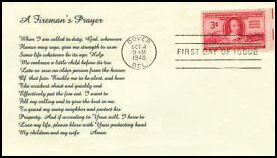 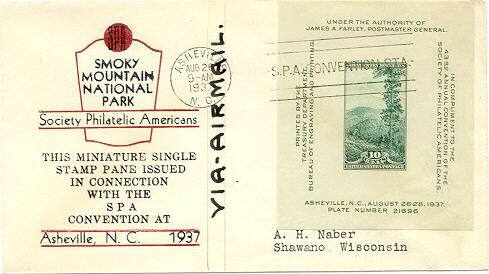 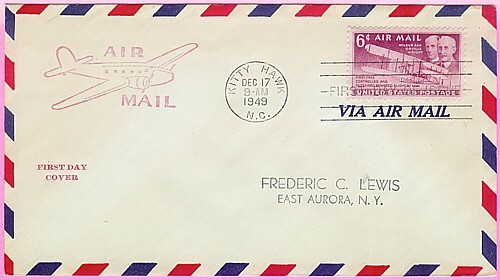 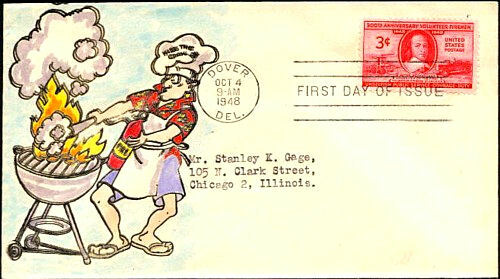 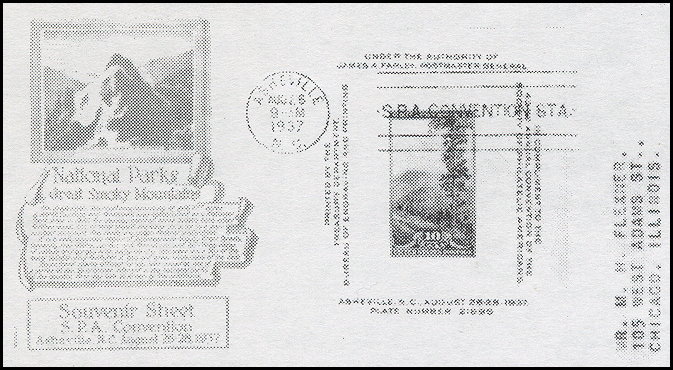 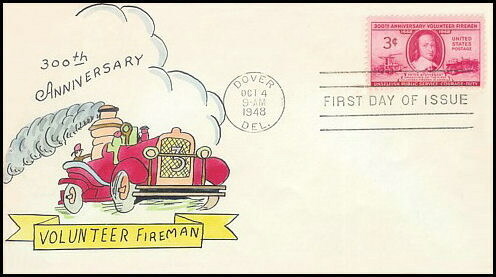 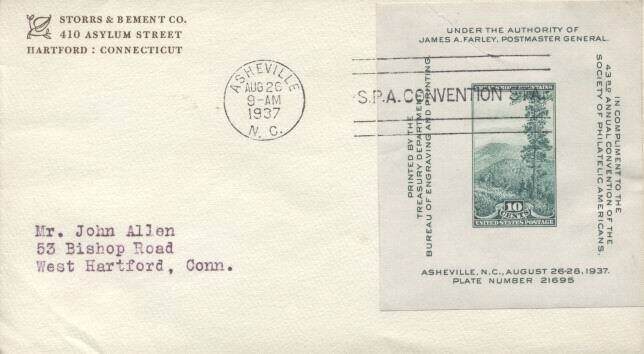 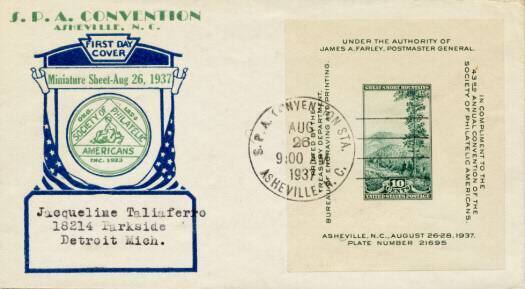 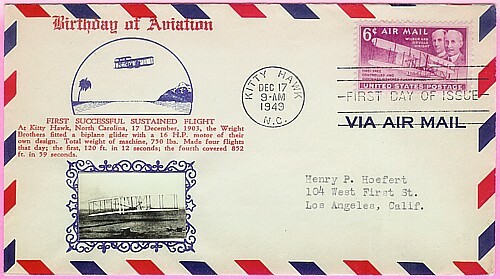 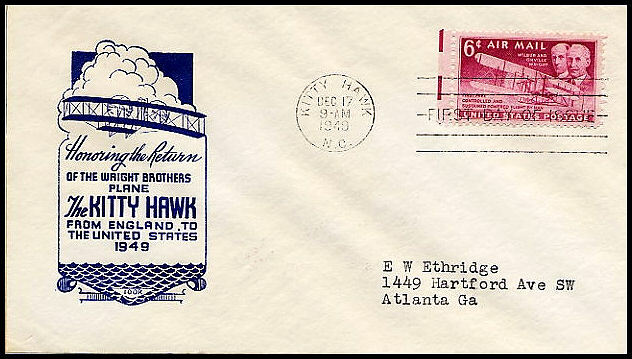 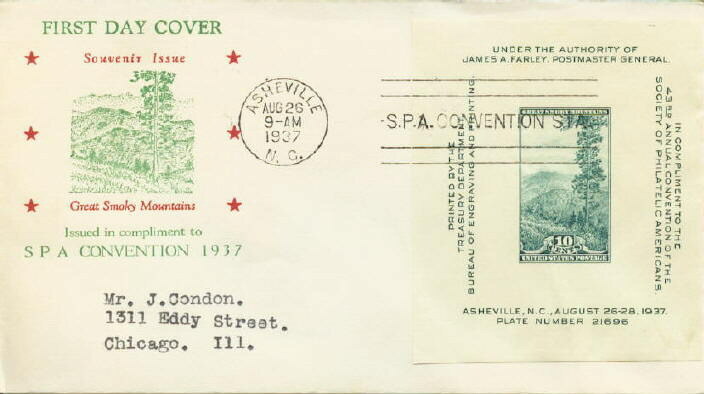 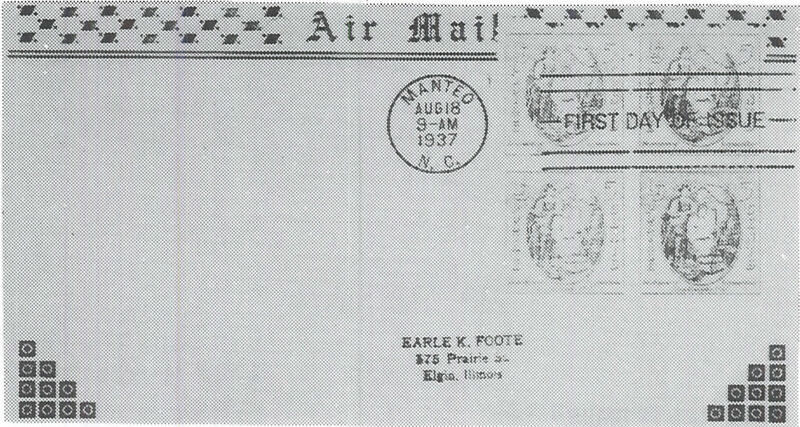 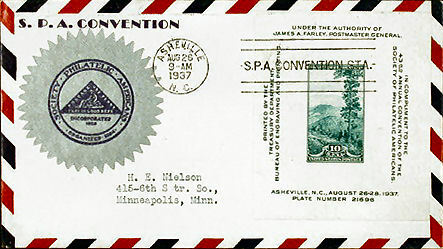 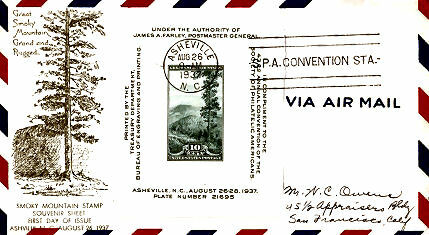 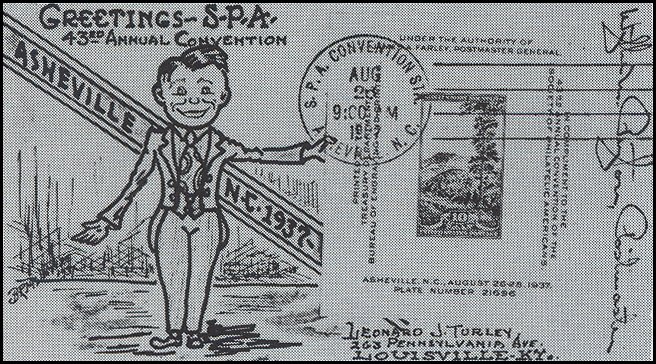 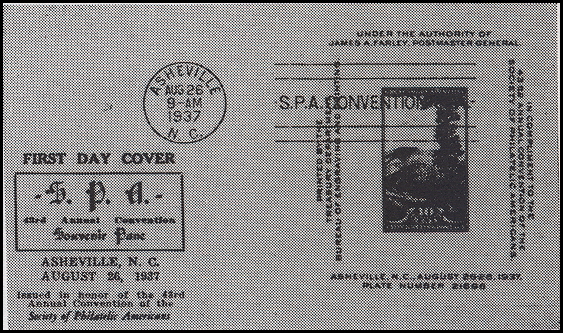 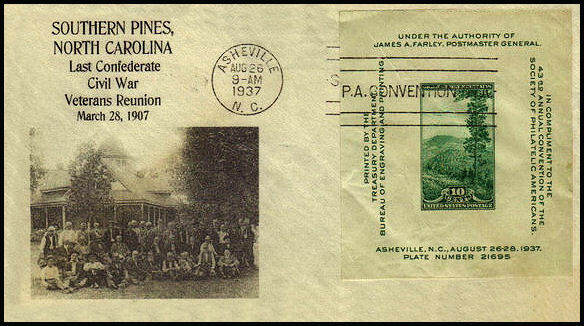 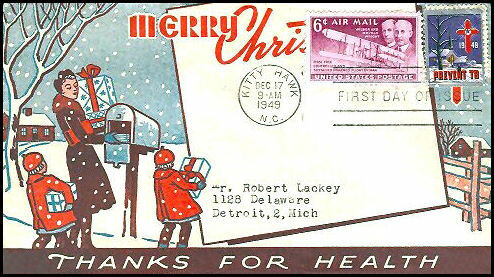 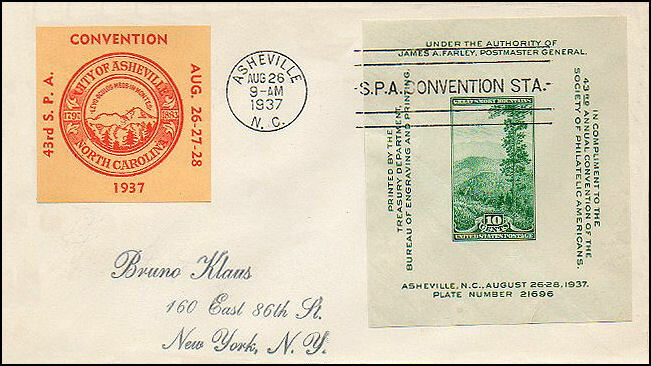 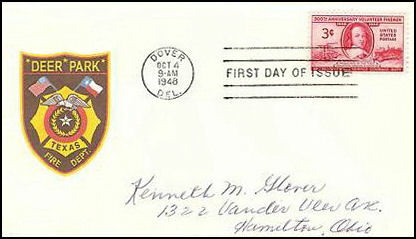 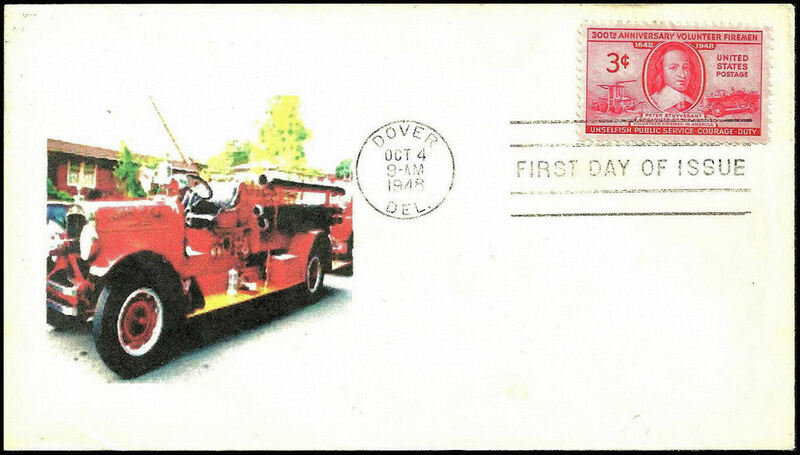 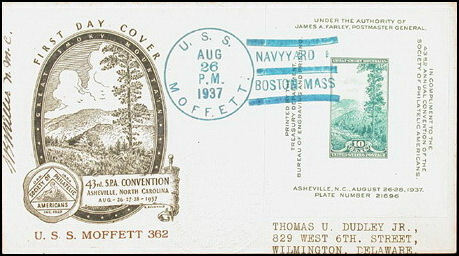 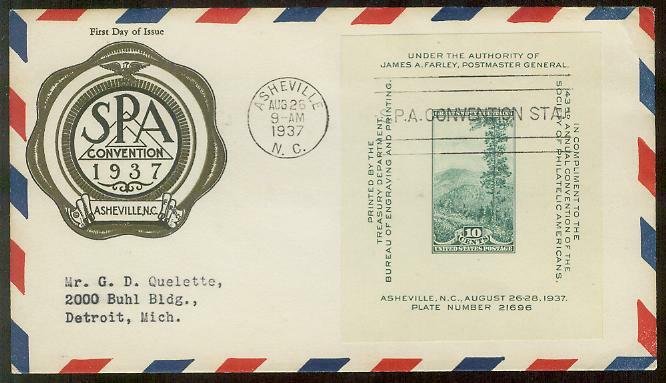 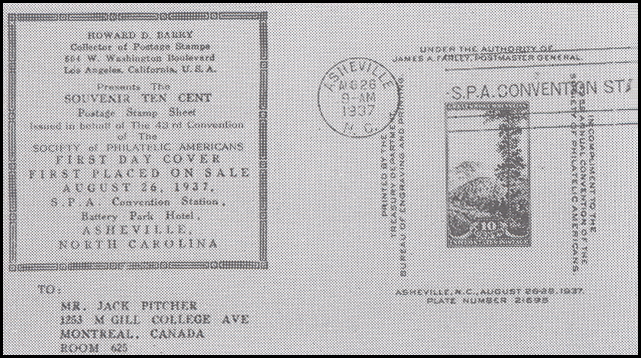 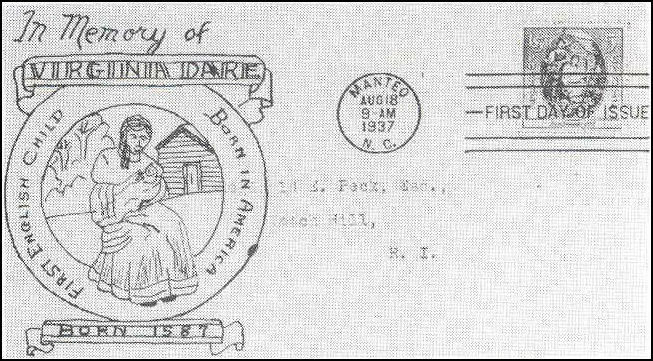 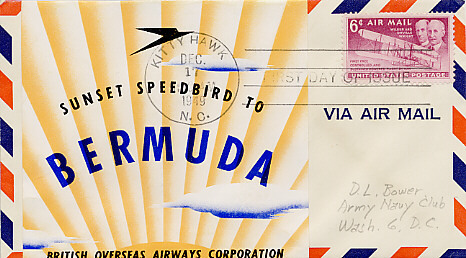 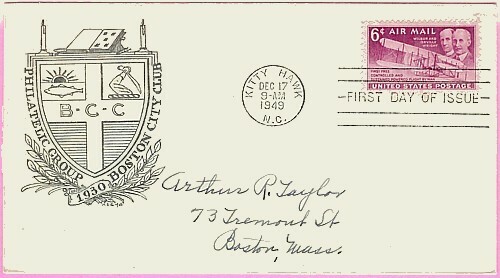 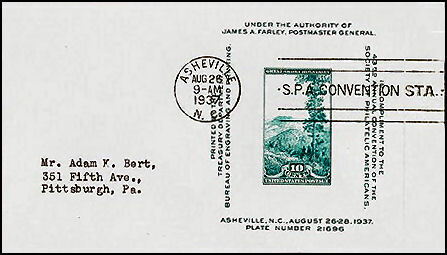 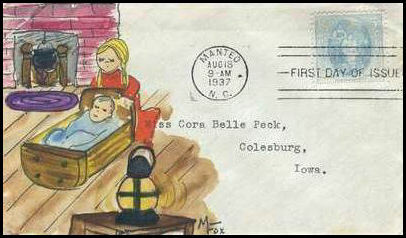 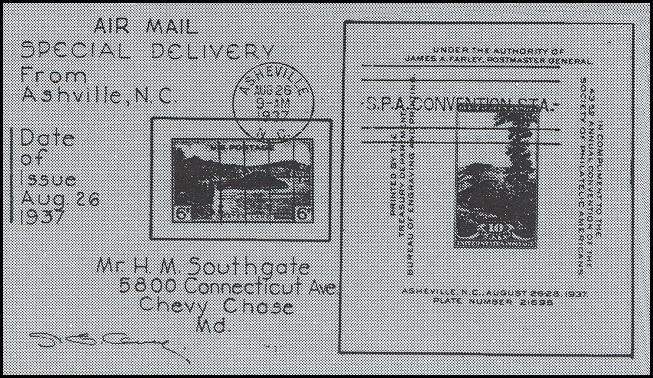 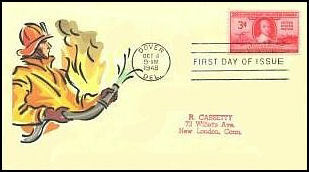 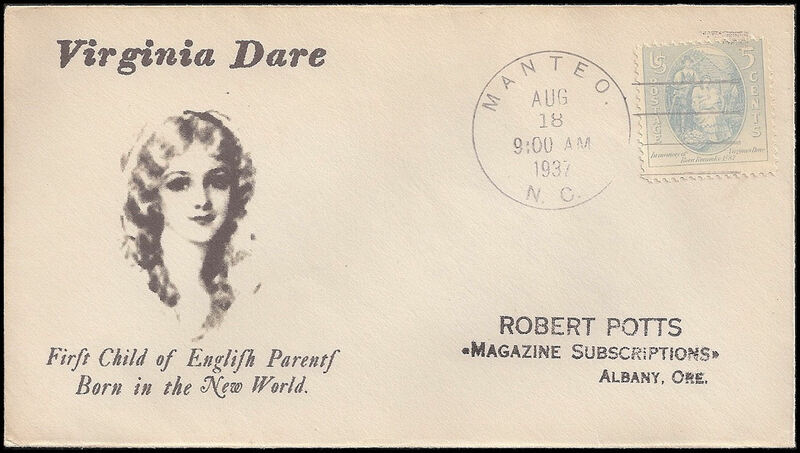 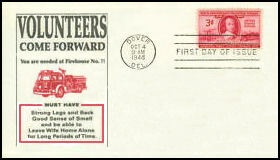 UNK15-02; Luggage label for BOAC pasted on with FDOI cancel tieing it to the envelope. 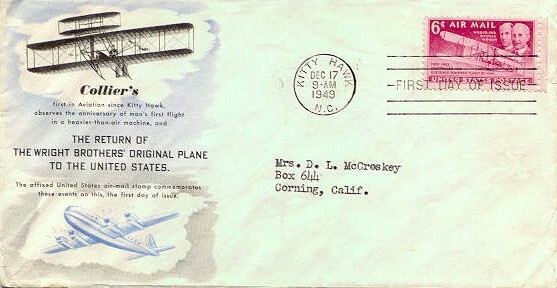 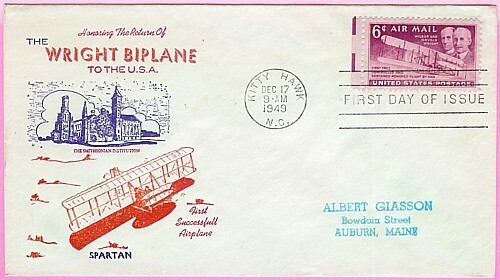 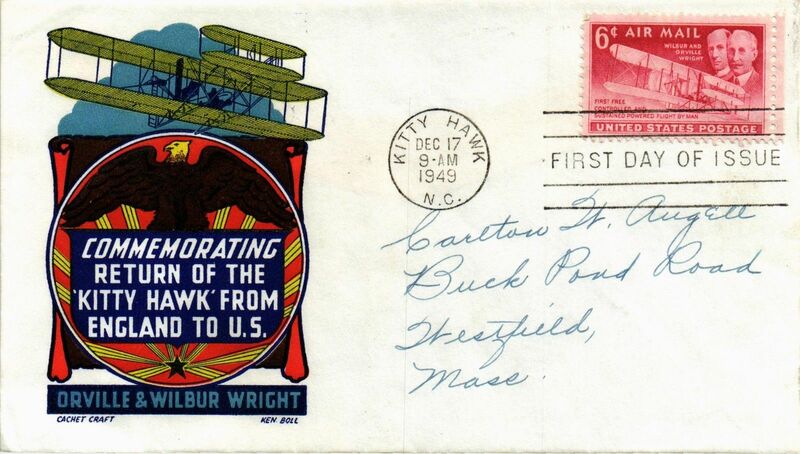 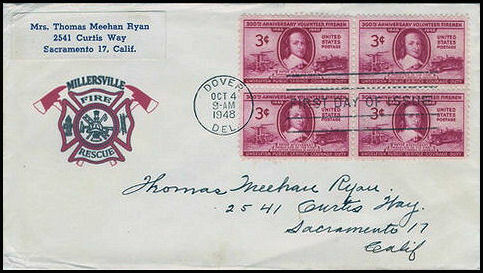 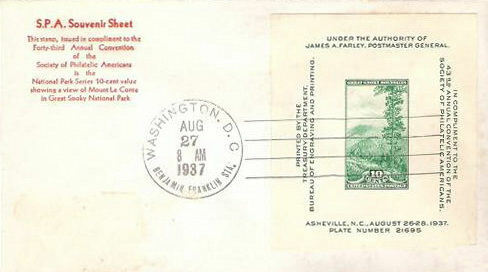 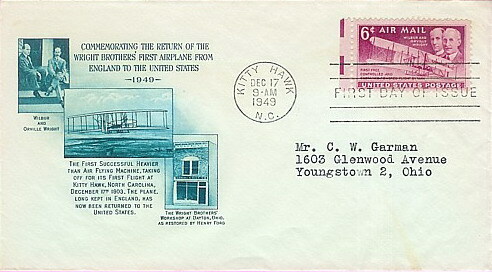 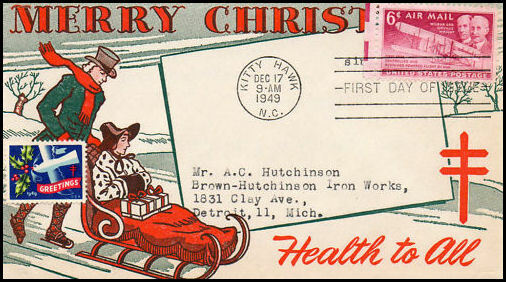 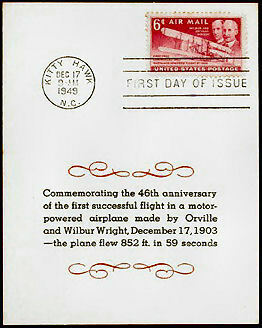 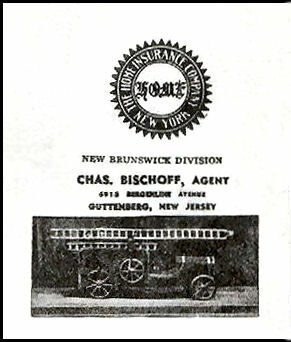 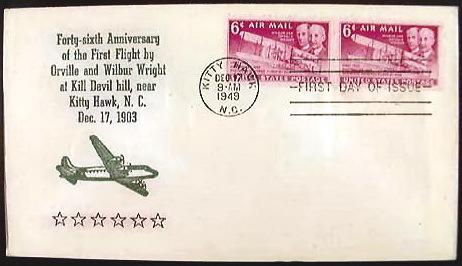 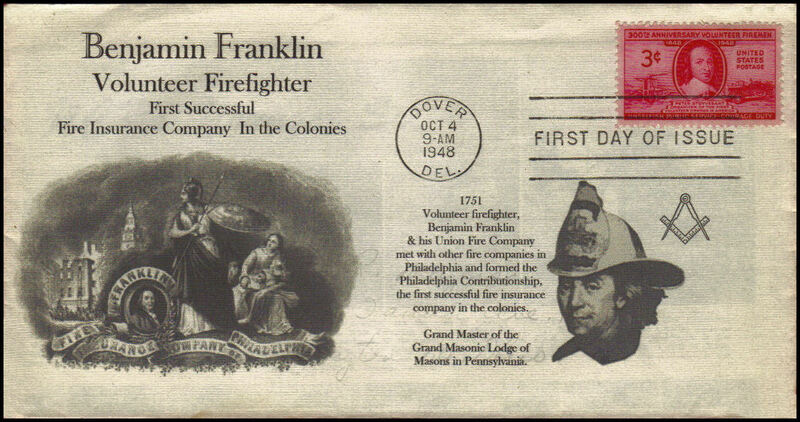 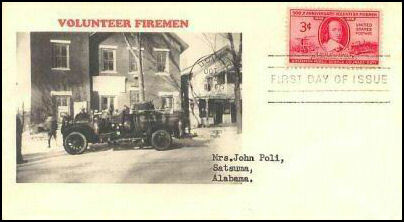 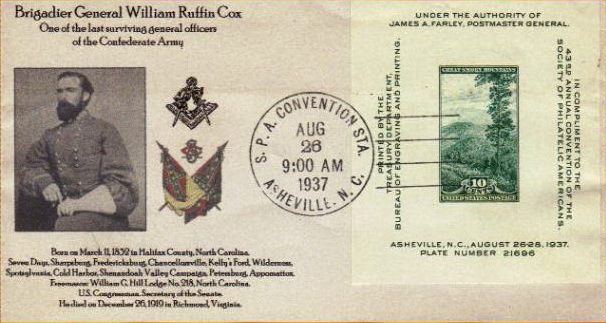 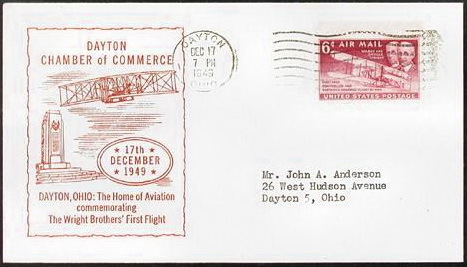 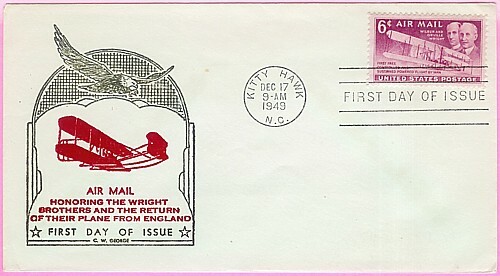 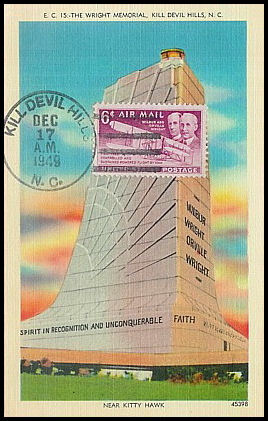 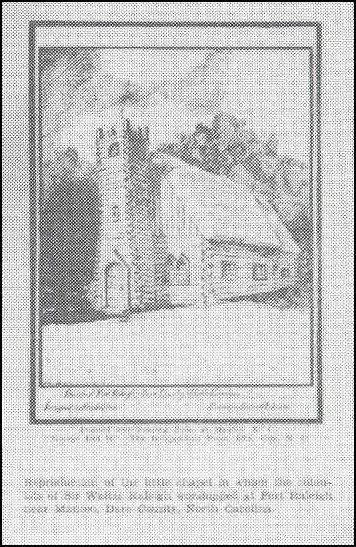 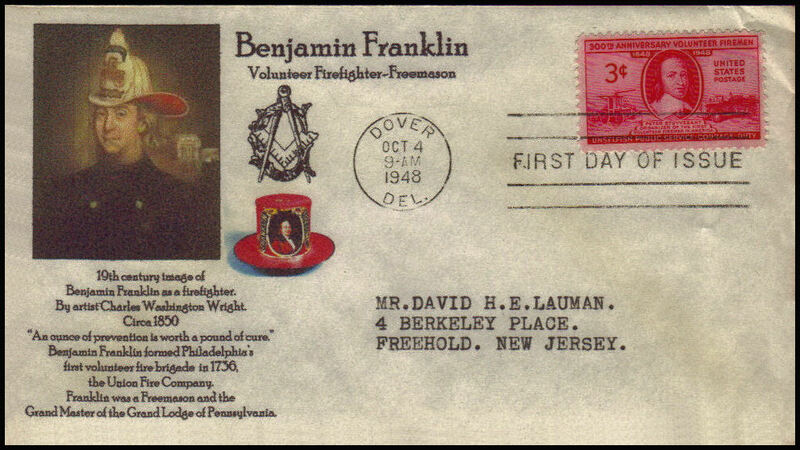 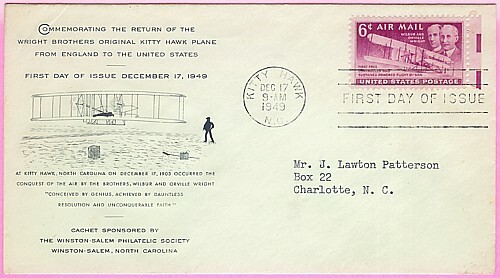 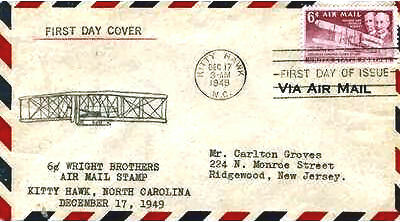 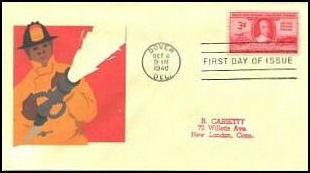 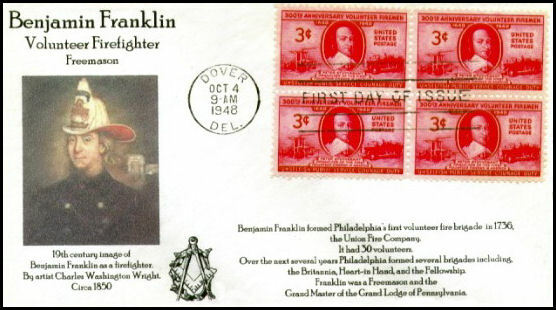 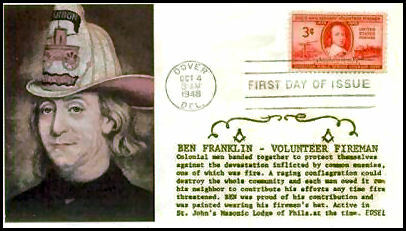 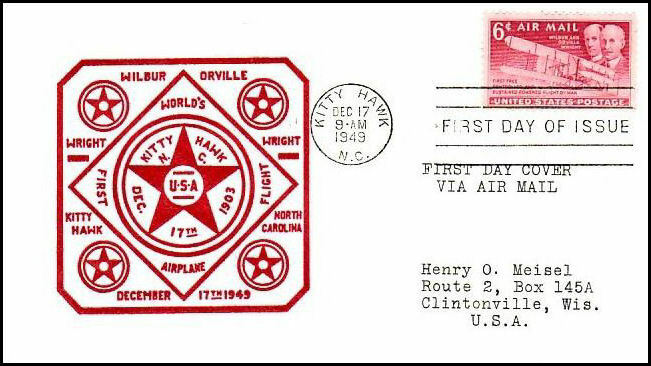 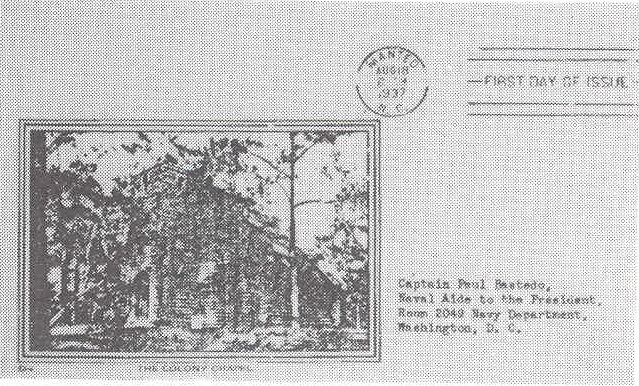 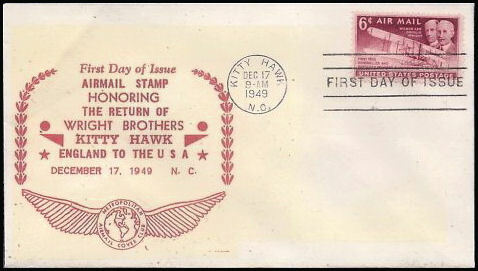 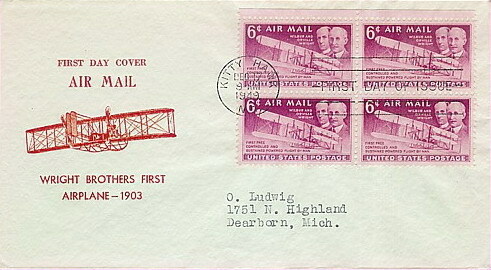 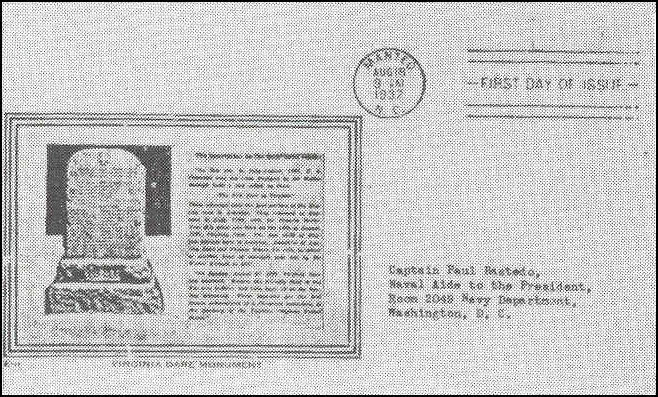 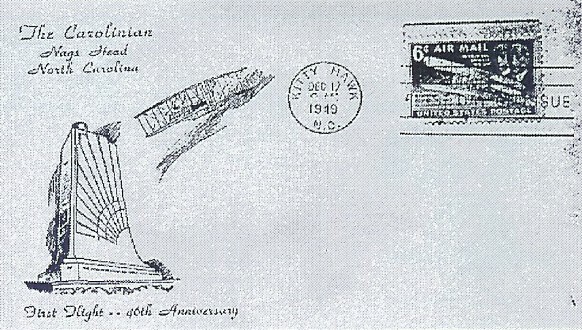 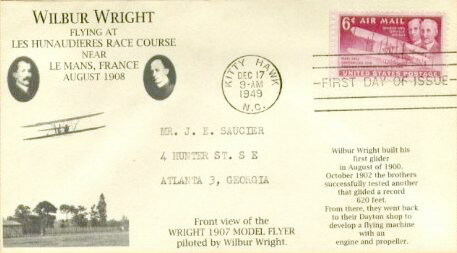 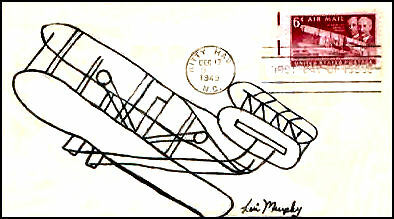 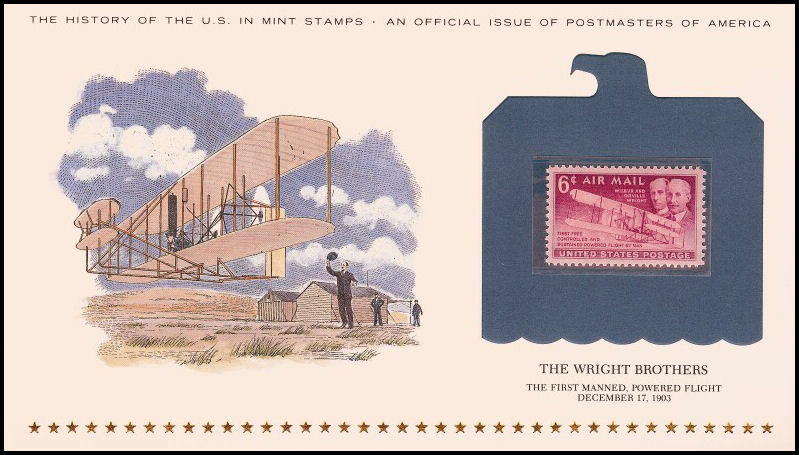 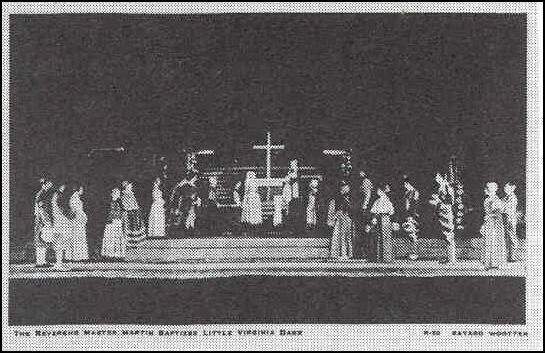 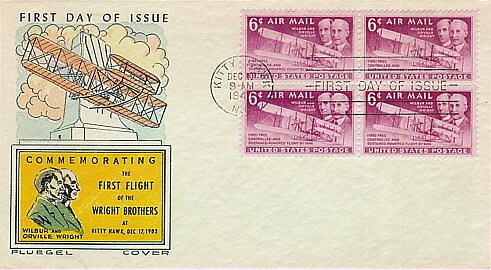 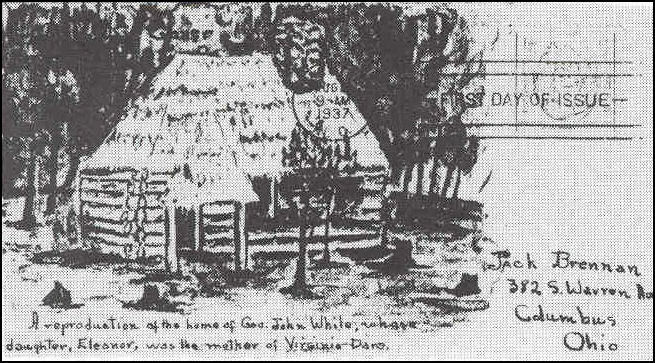 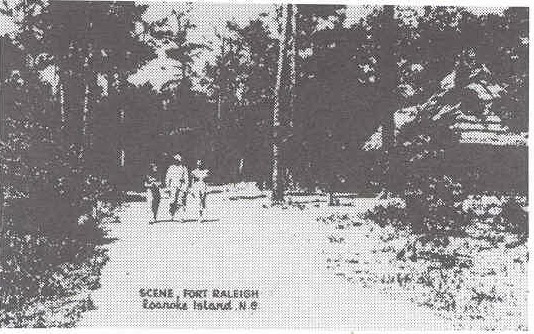 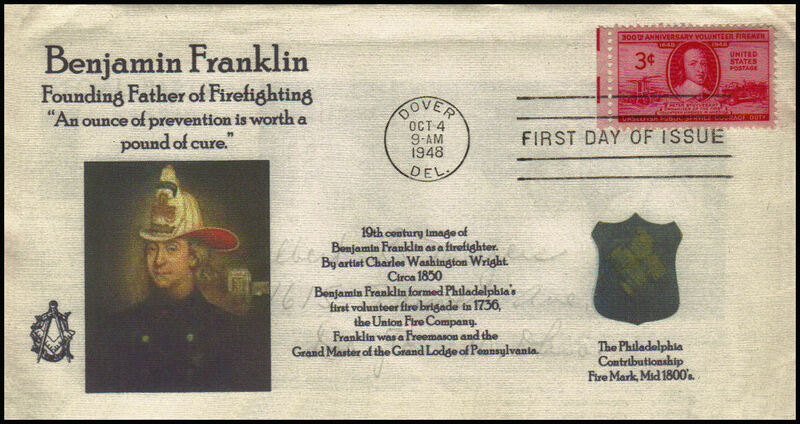 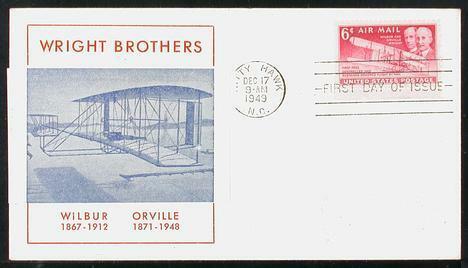 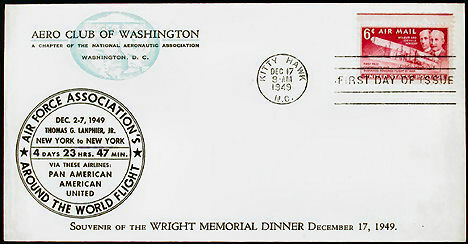 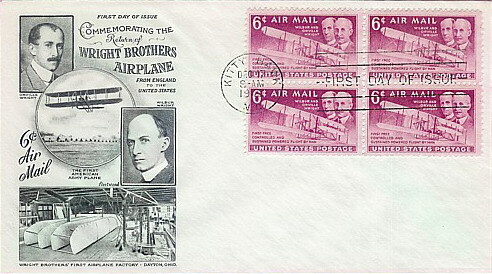 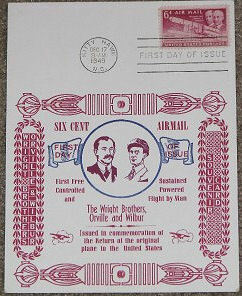 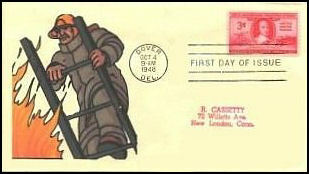 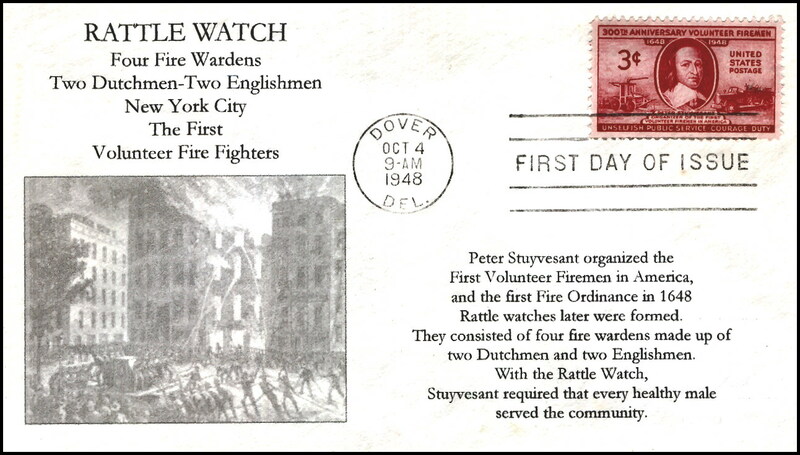 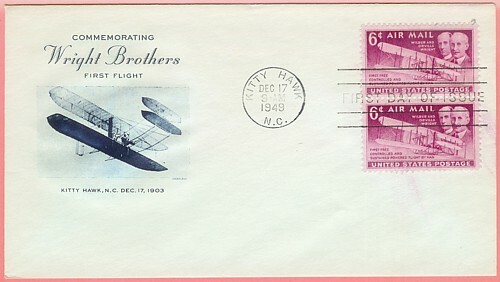 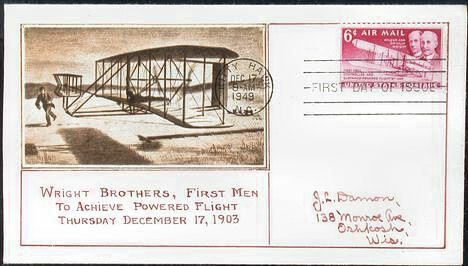 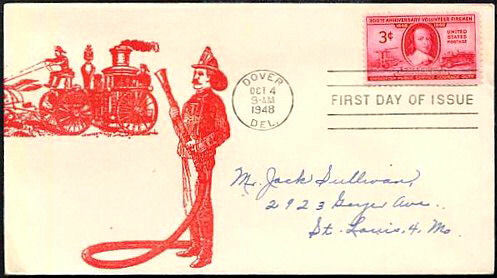 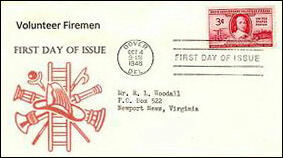 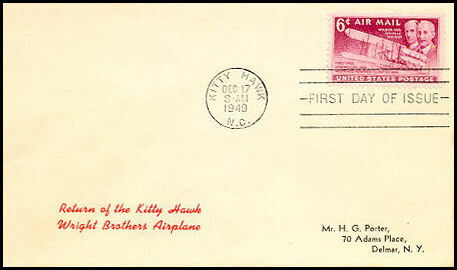 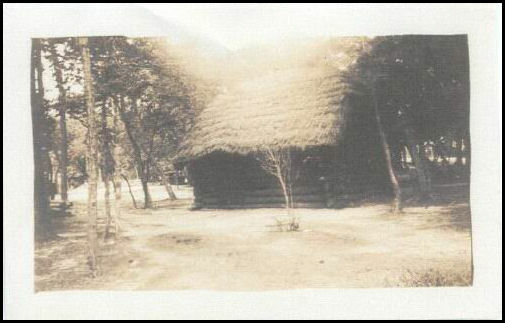 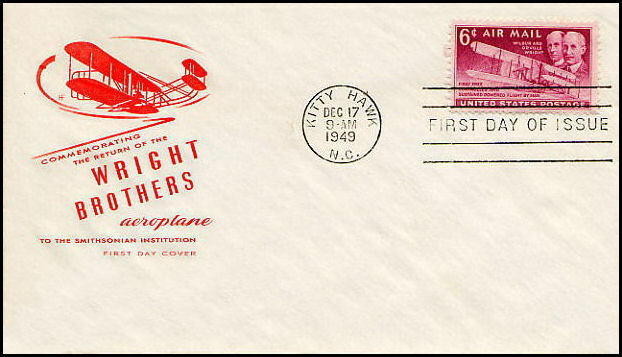 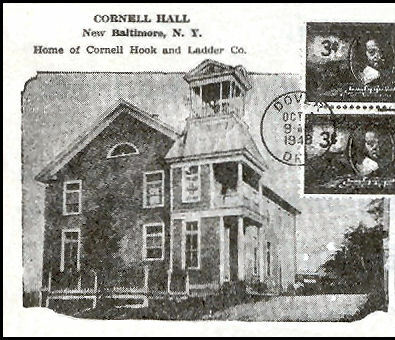 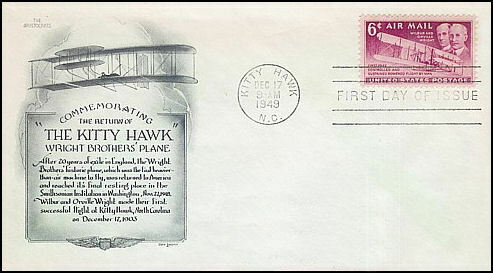 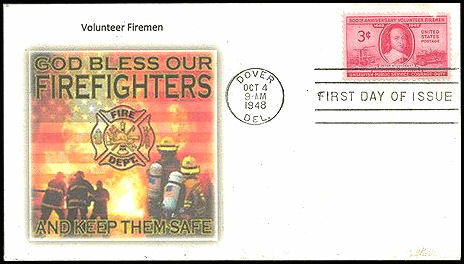 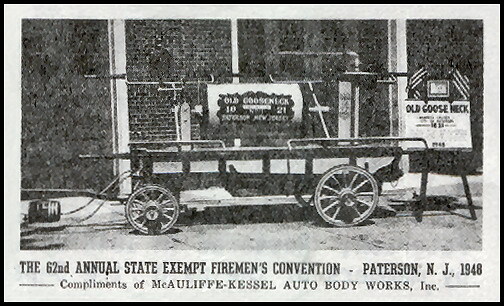 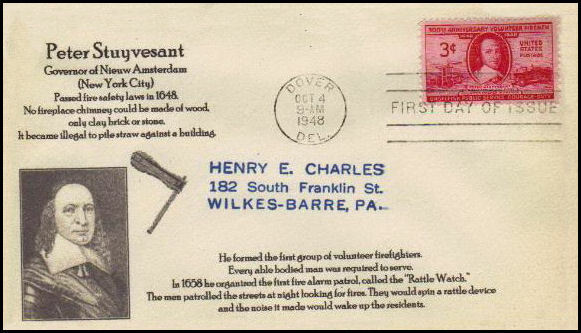 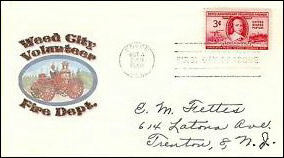 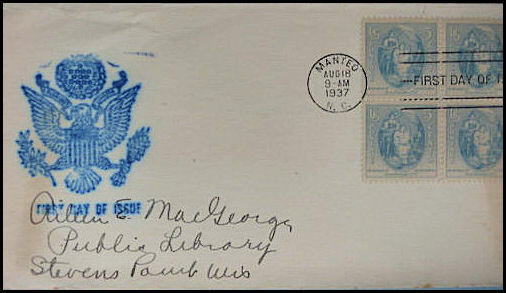 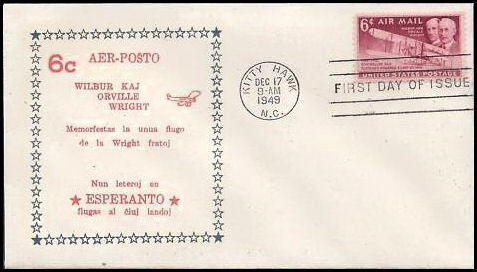 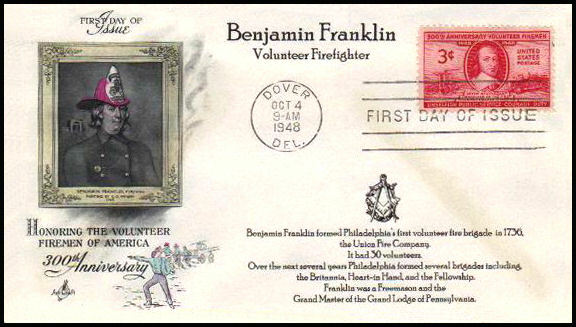 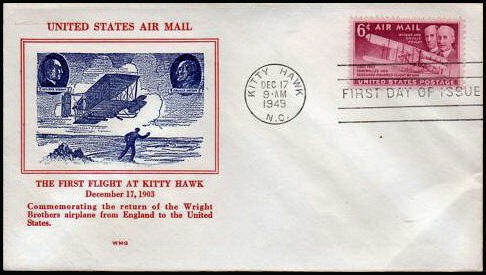 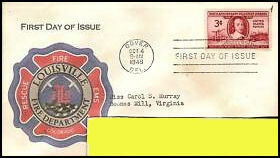 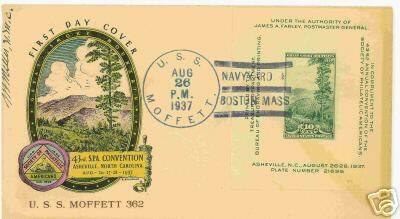 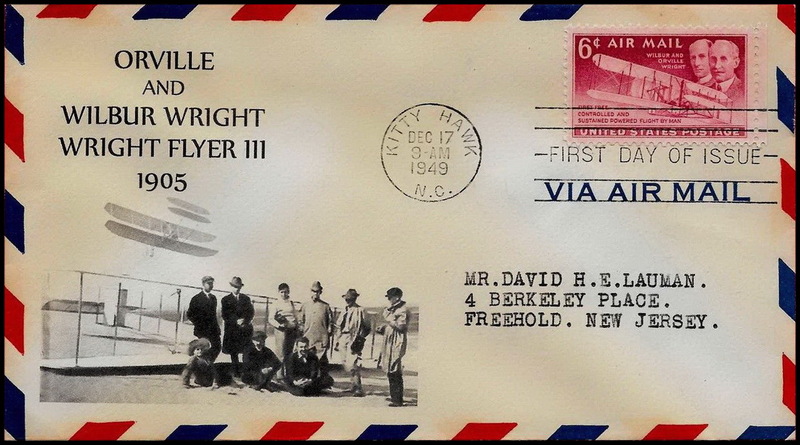 Image of plane is a sheetlet over the cachet hinged on back side.